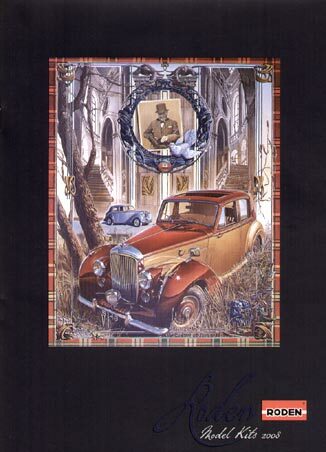 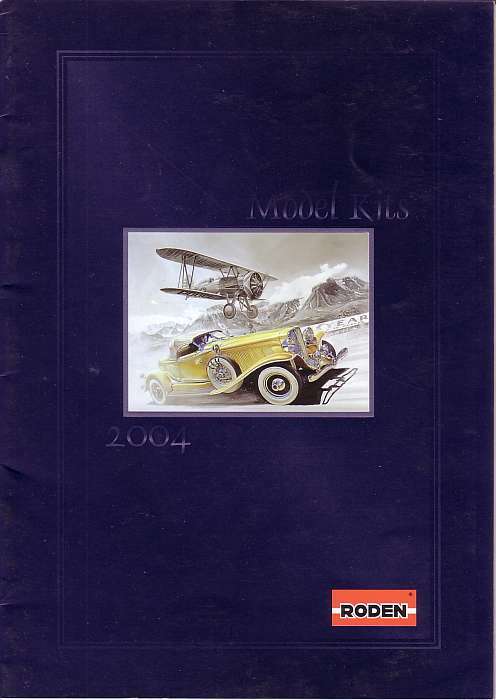 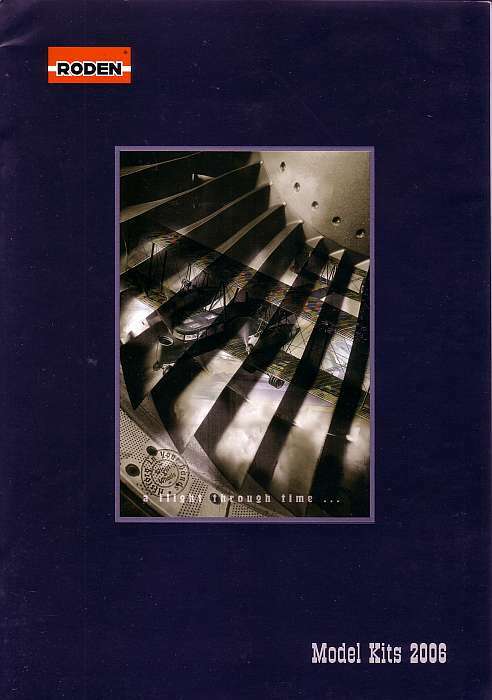 Who is so kind to help me with the other catalogues? 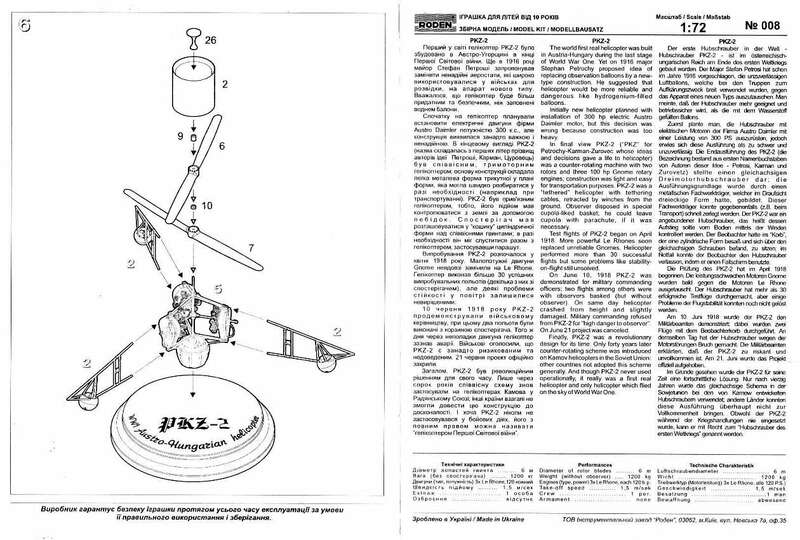 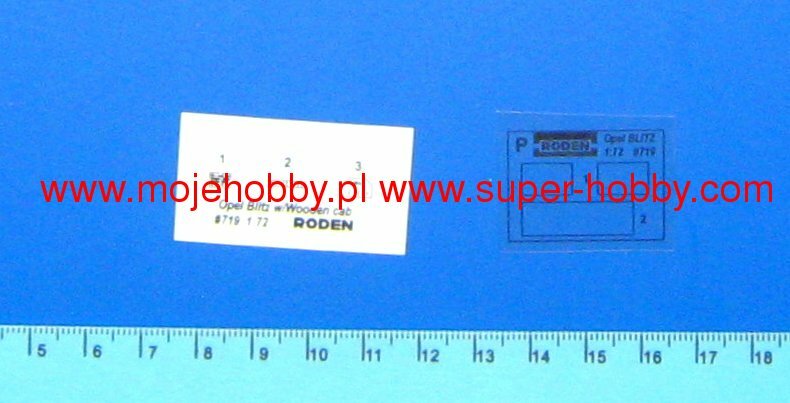 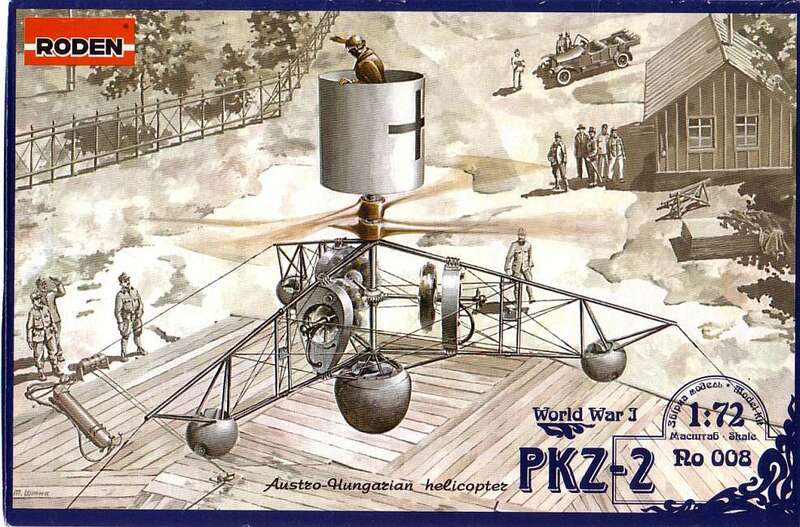 Kit RO-008 - PKZ-2 WWI Helicopter PKZ-2 "Petrochy-Karman-Zurovec"
This actually looks better than the 1/48 PKZ-2 Eduard did several years ago! 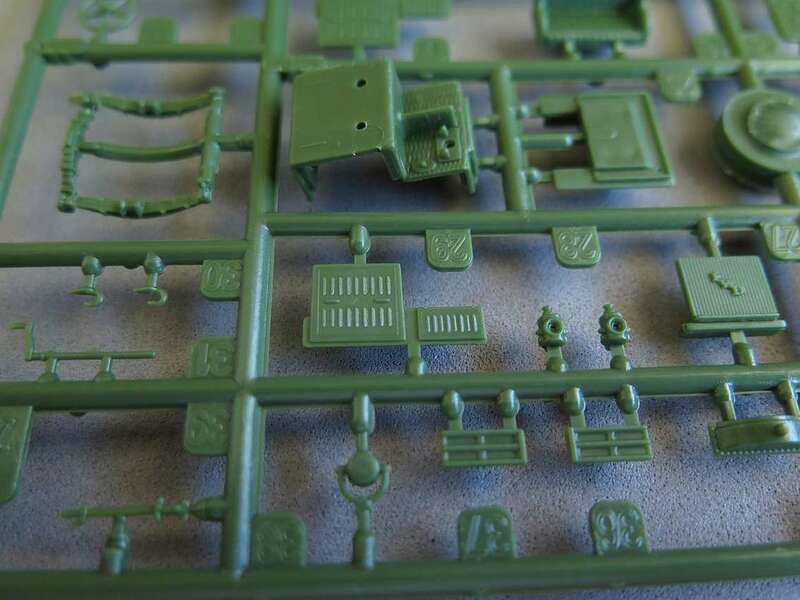 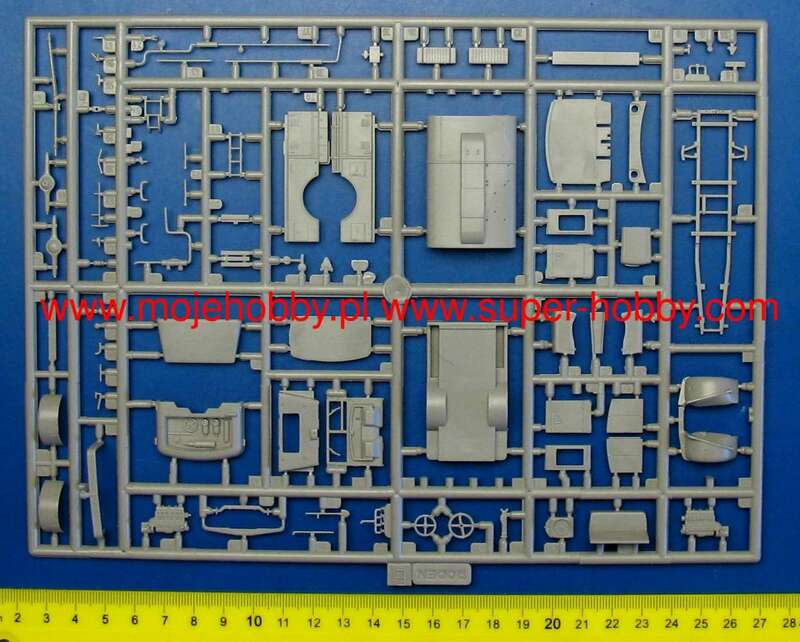 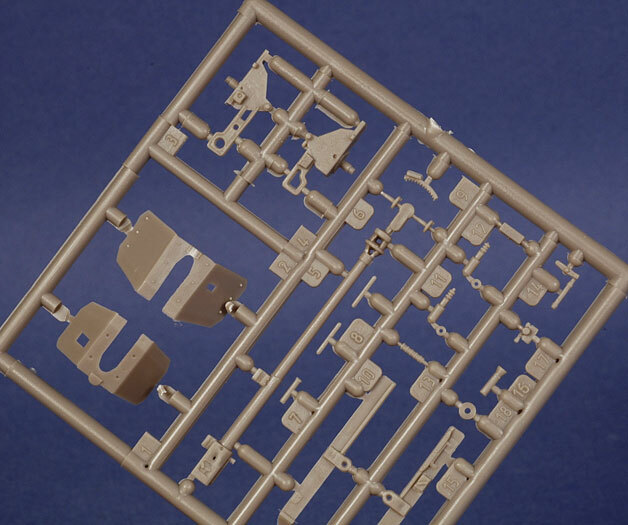 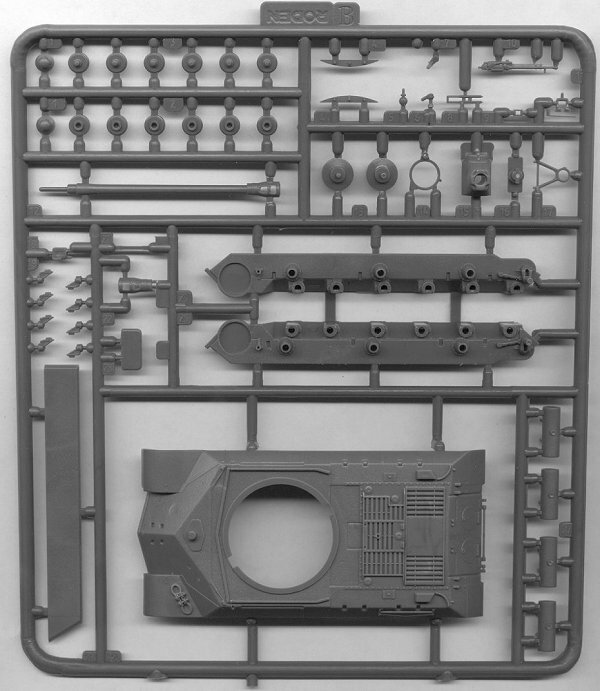 There's just one sprue of 50 very finely moulded parts, a base on which to mount the finished model and a small decal sheet. 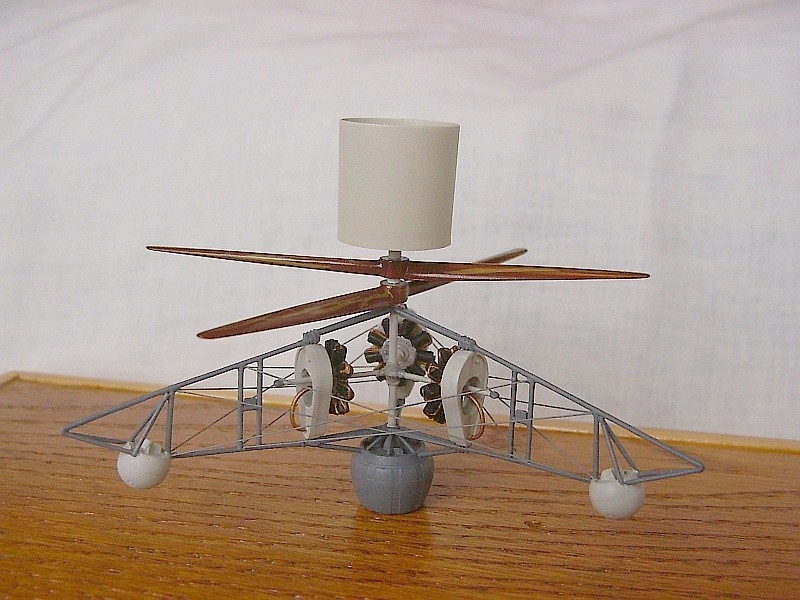 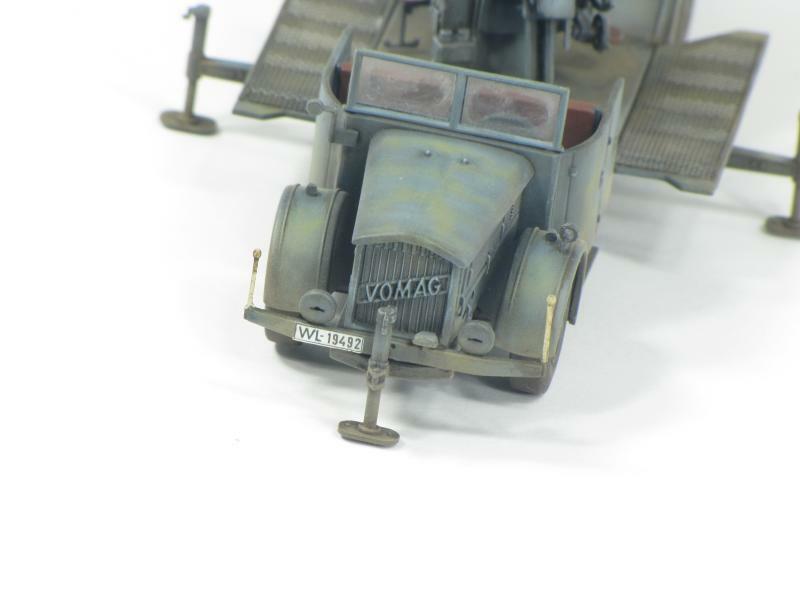 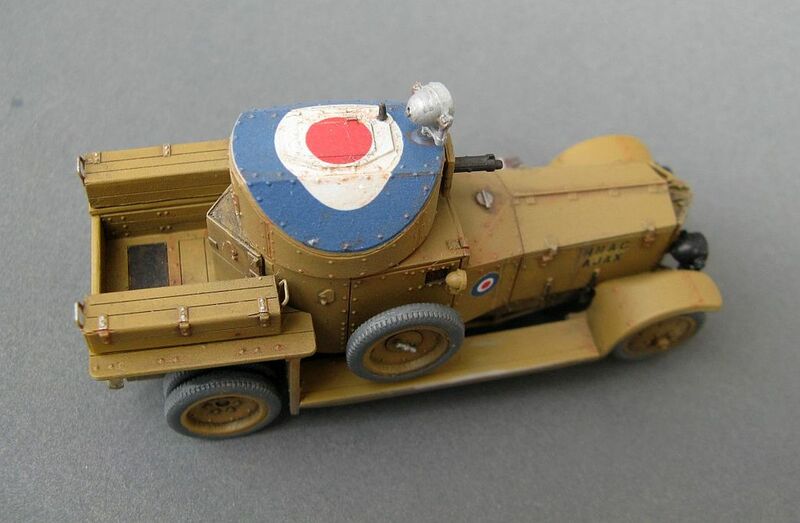 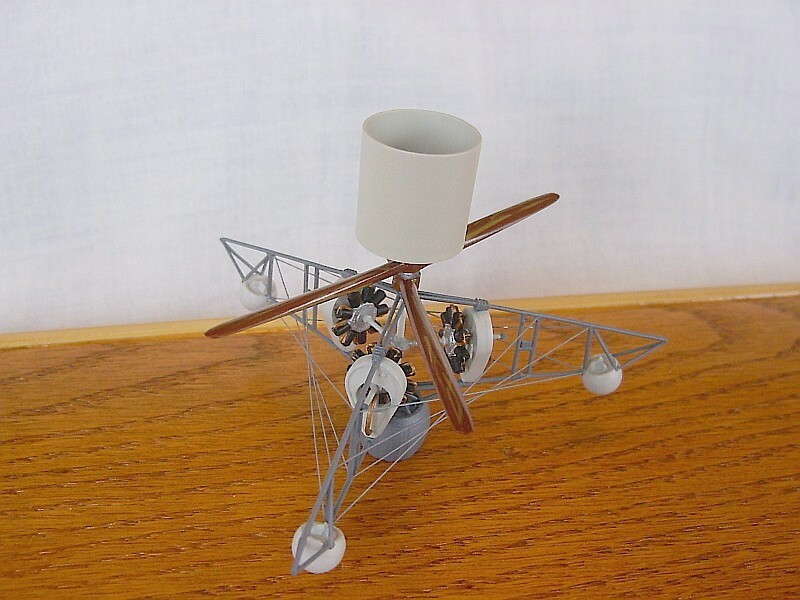 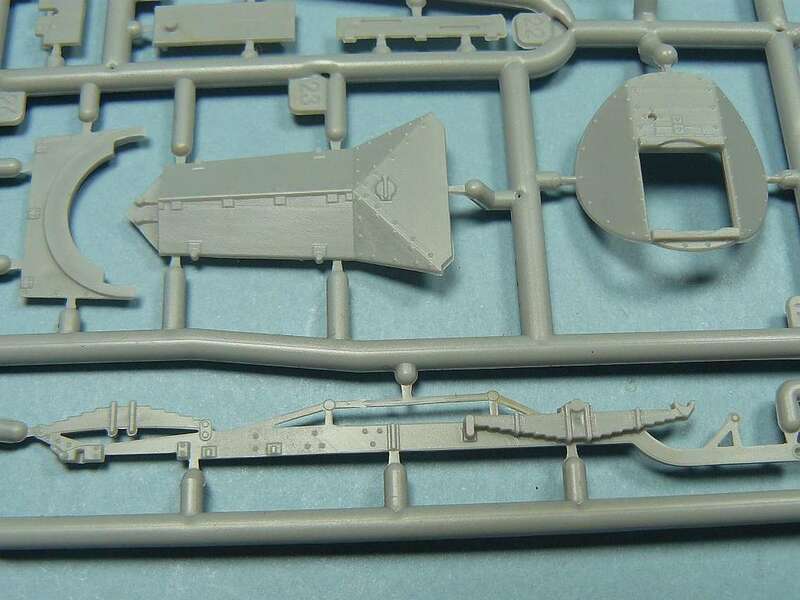 Although there's not all that much to this trimotor WW1 helicopter (or 'flying garbage bin'), the detail is excellent, with the parts so fine they are probably to scale. 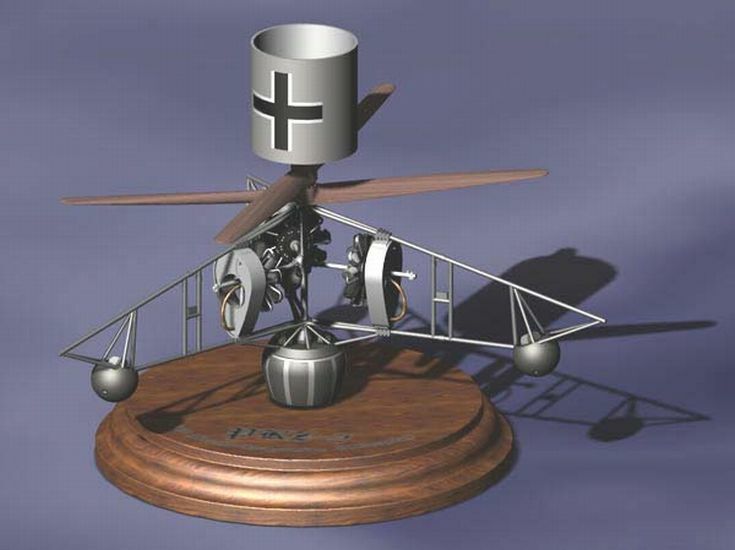 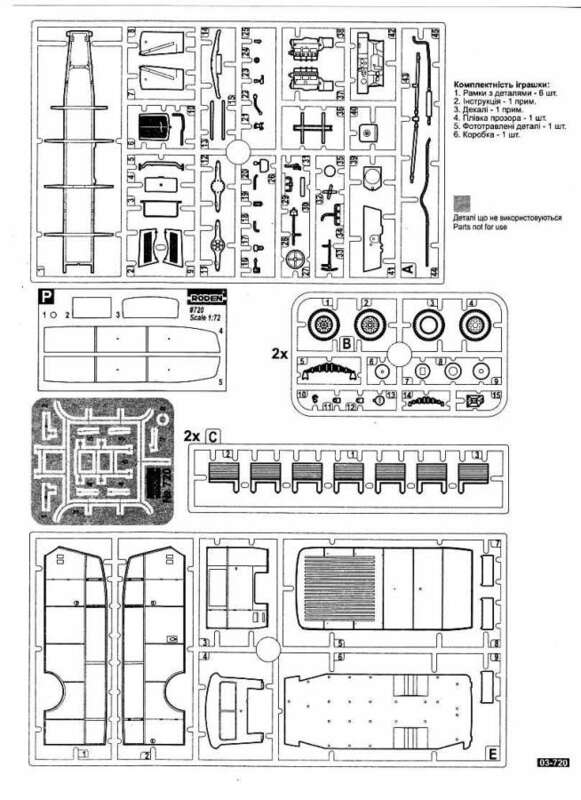 Three rotary engines are included and the twin propellers are designed to turn but there's no 'pilot' ... a seat is supplied though. 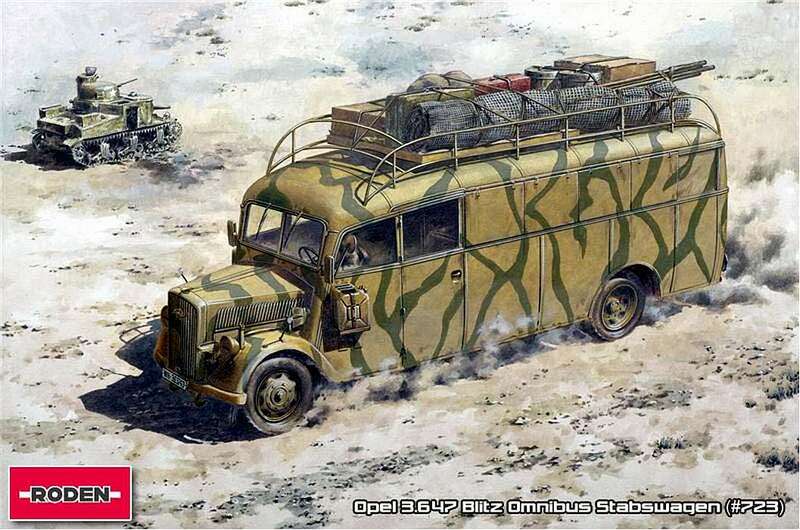 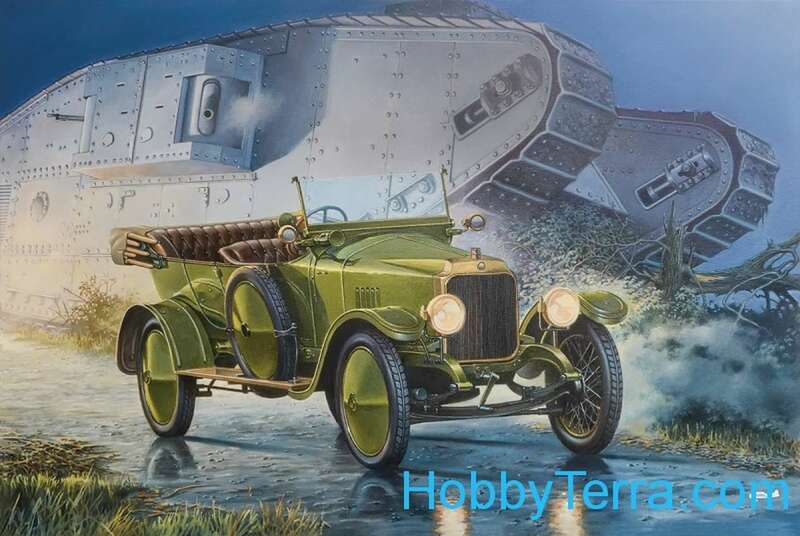 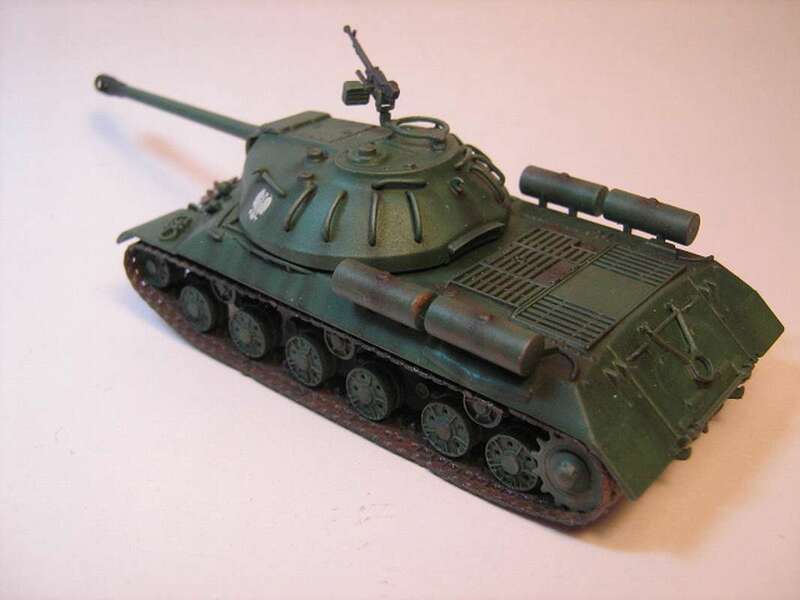 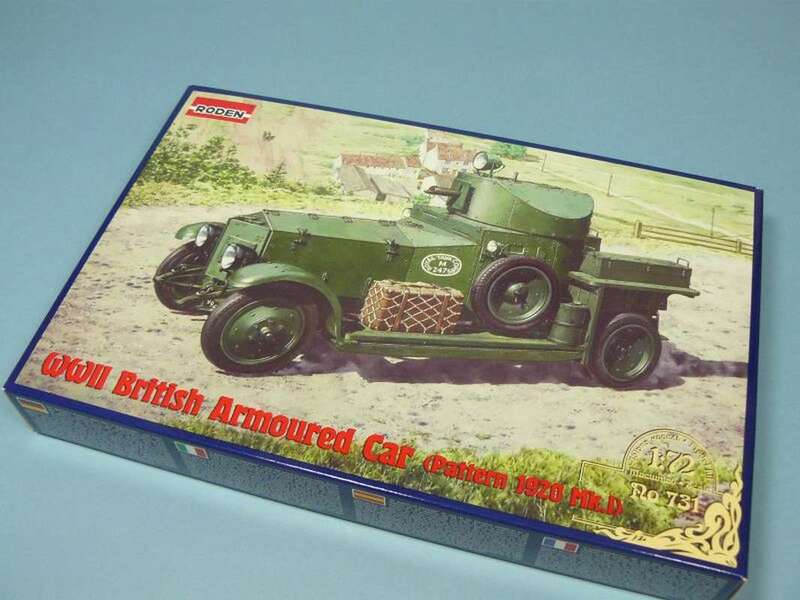 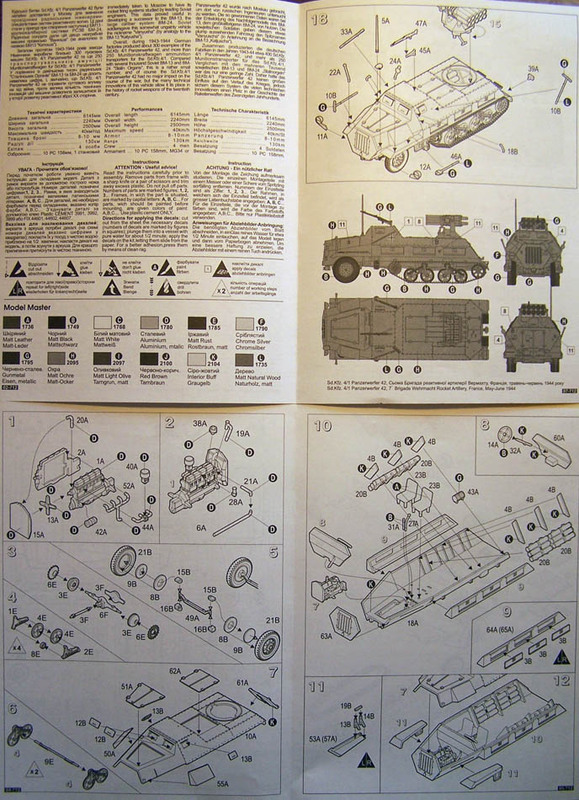 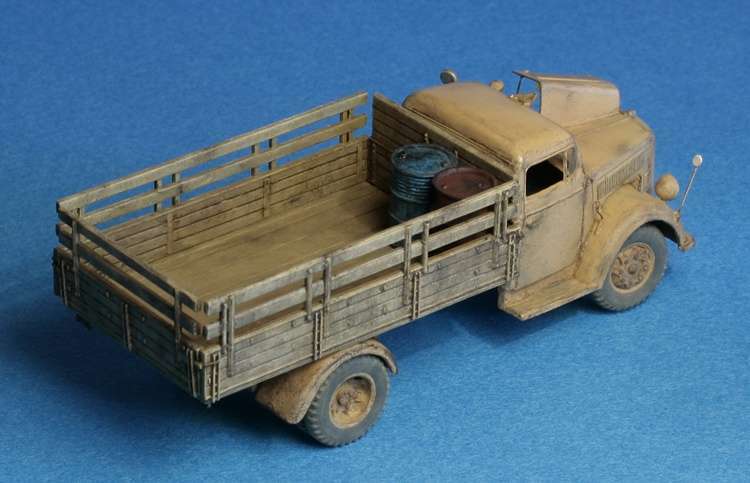 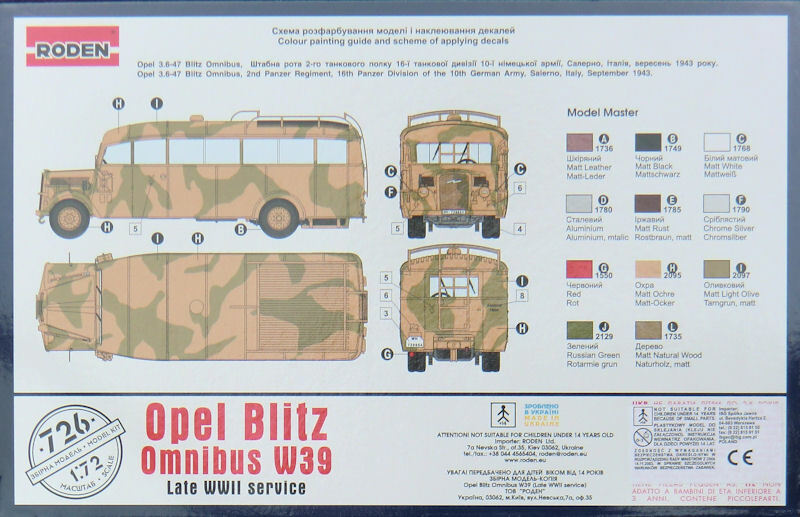 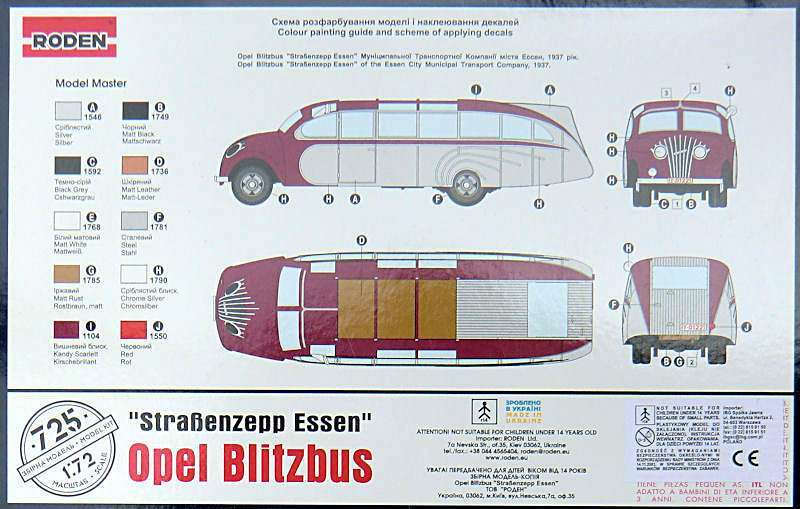 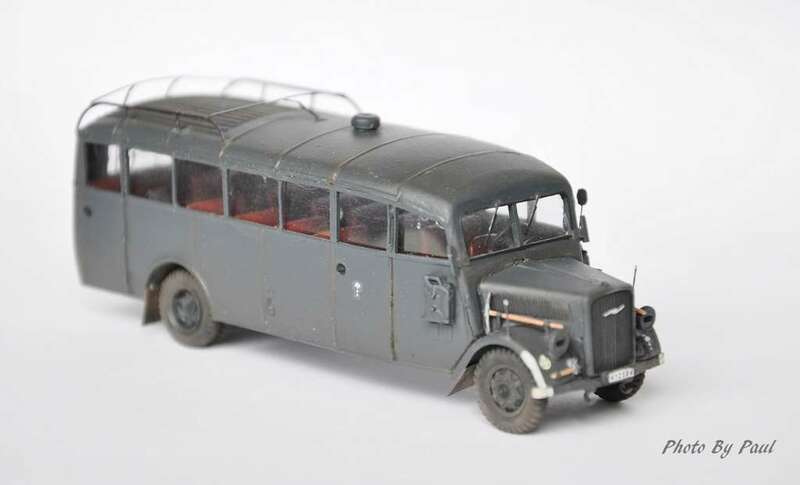 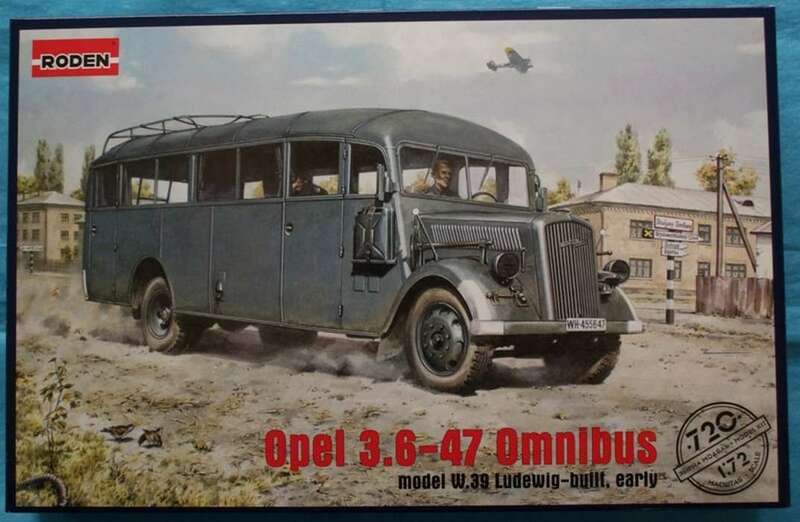 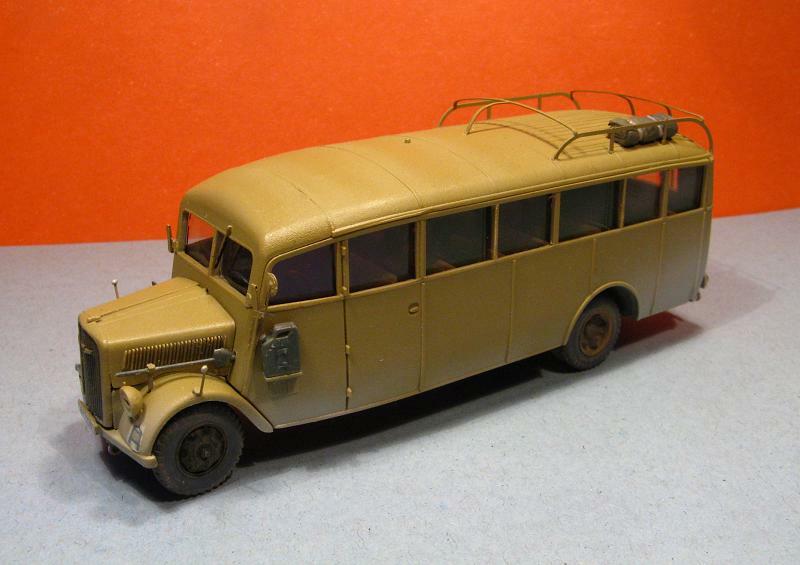 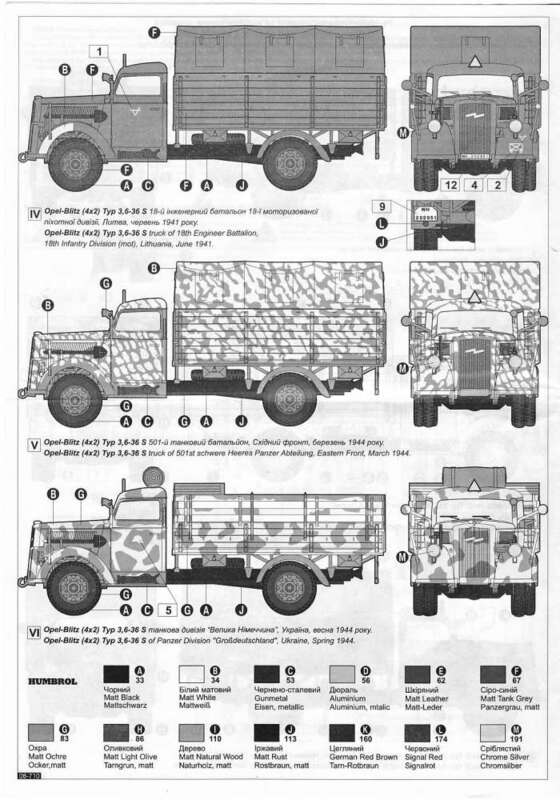 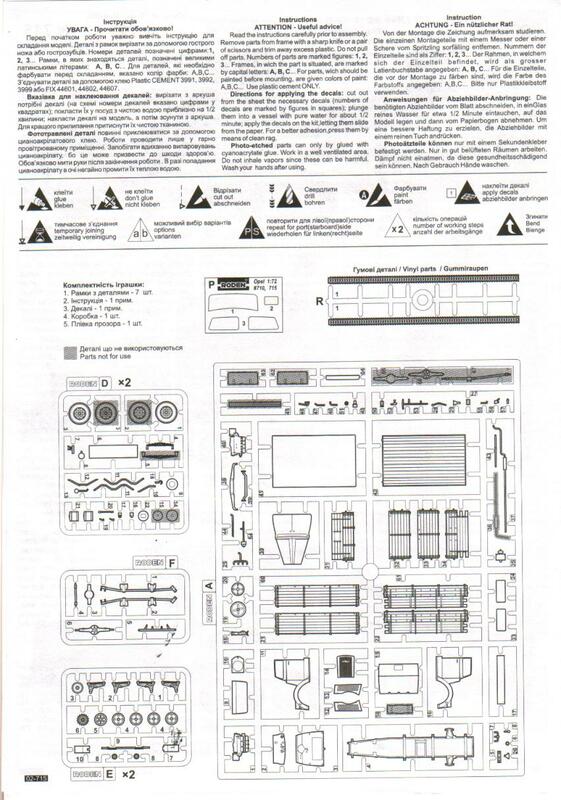 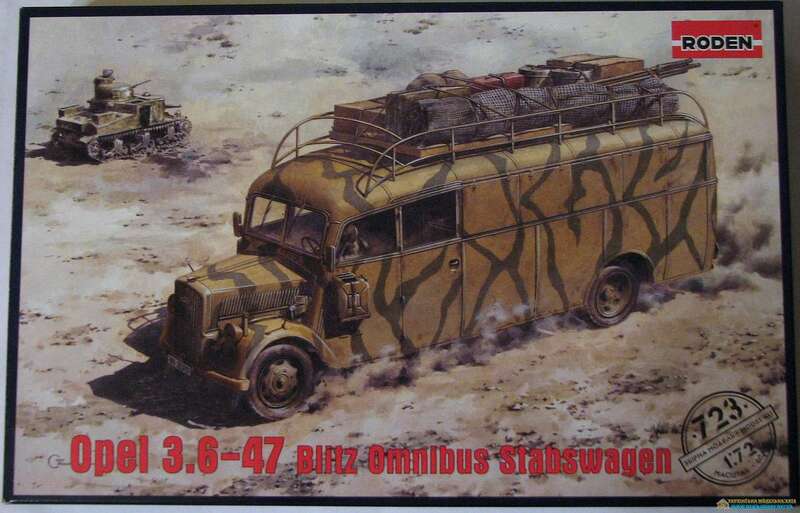 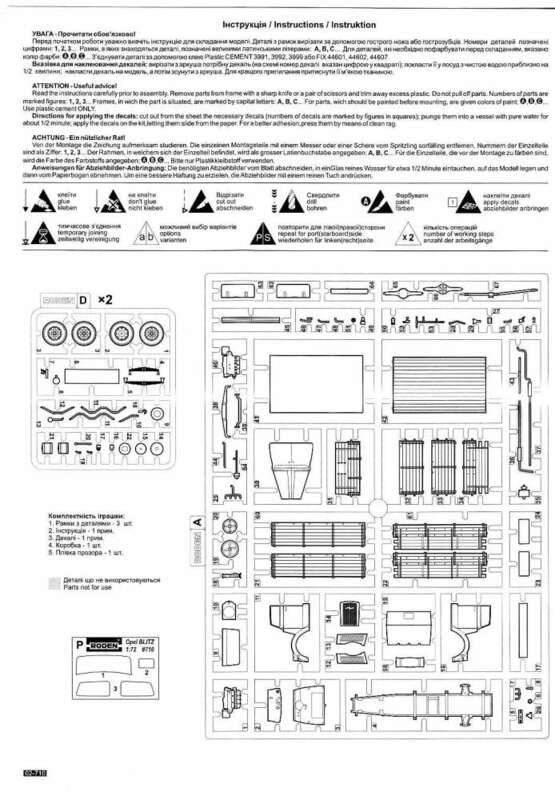 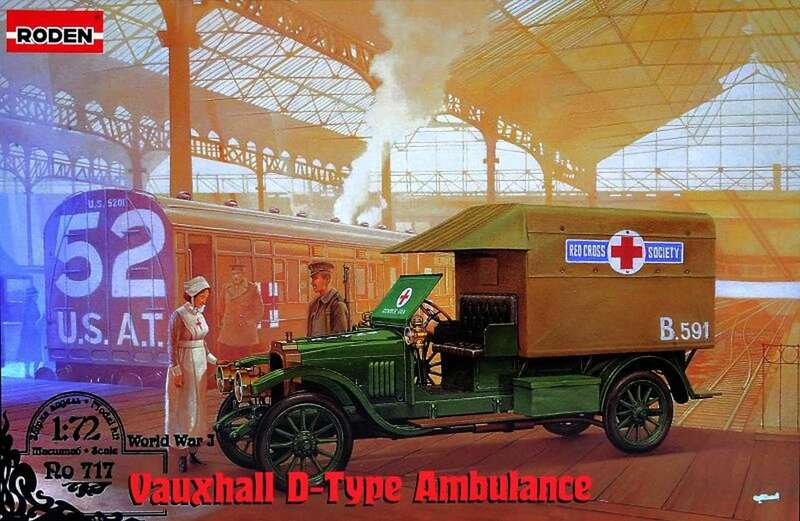 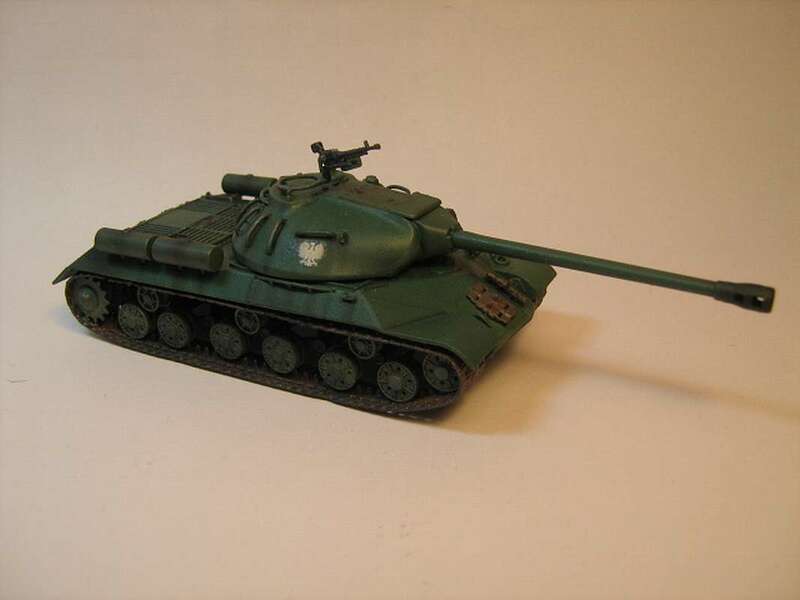 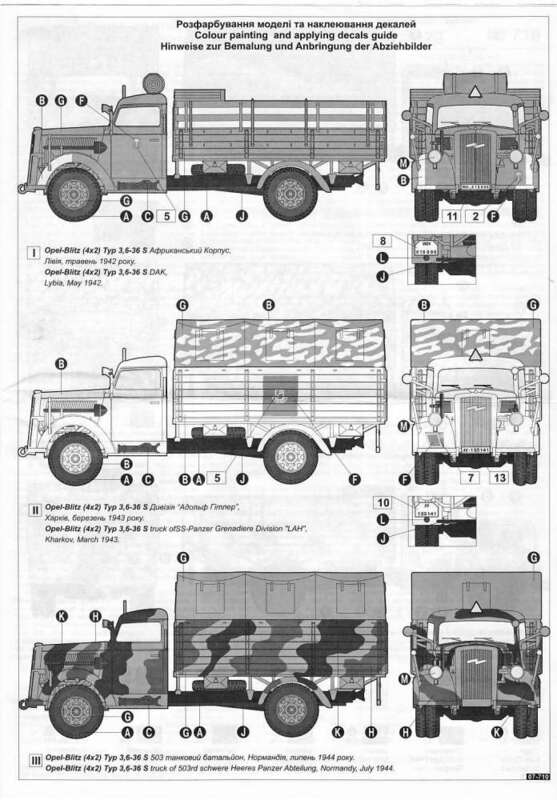 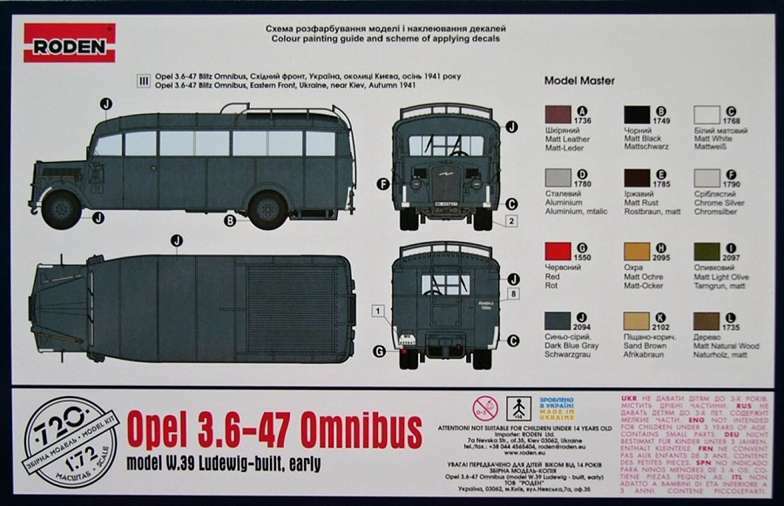 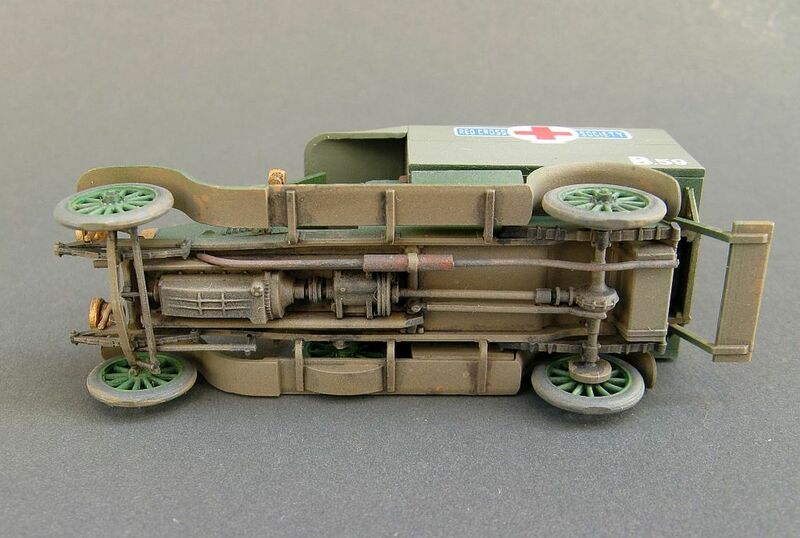 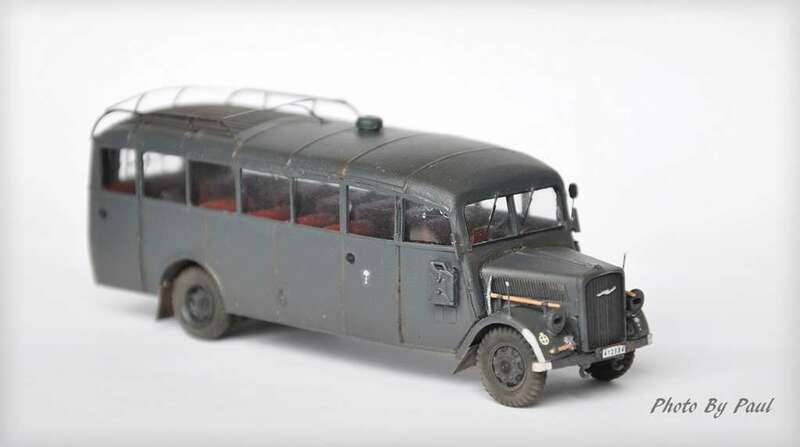 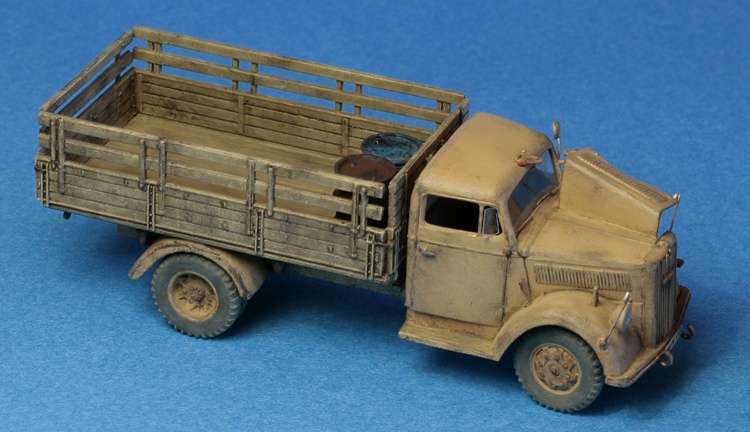 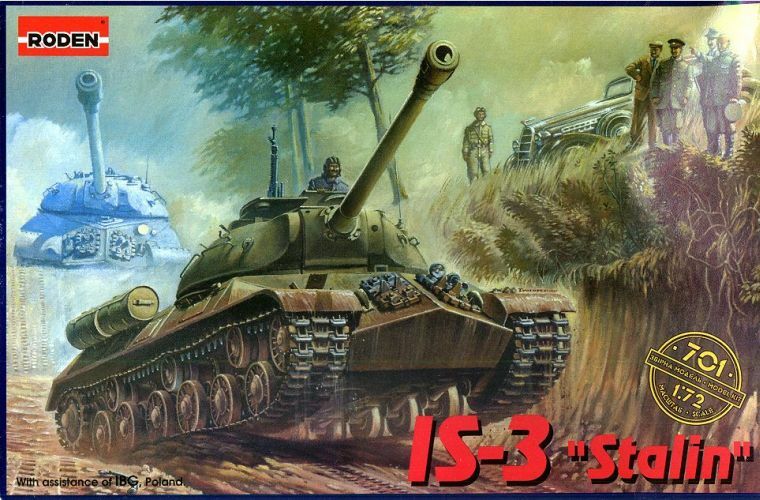 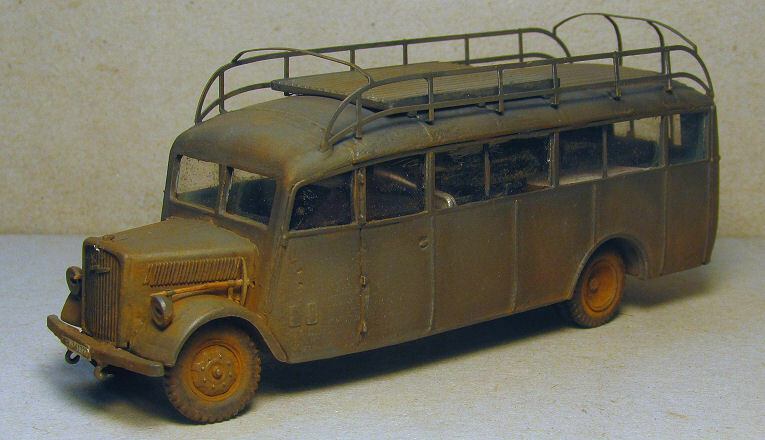 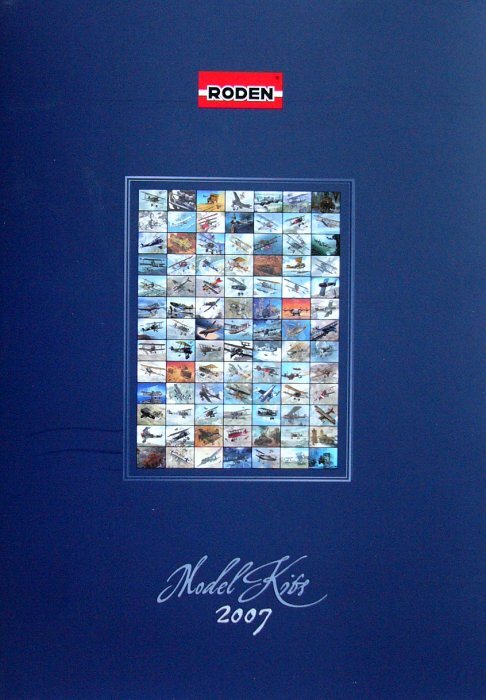 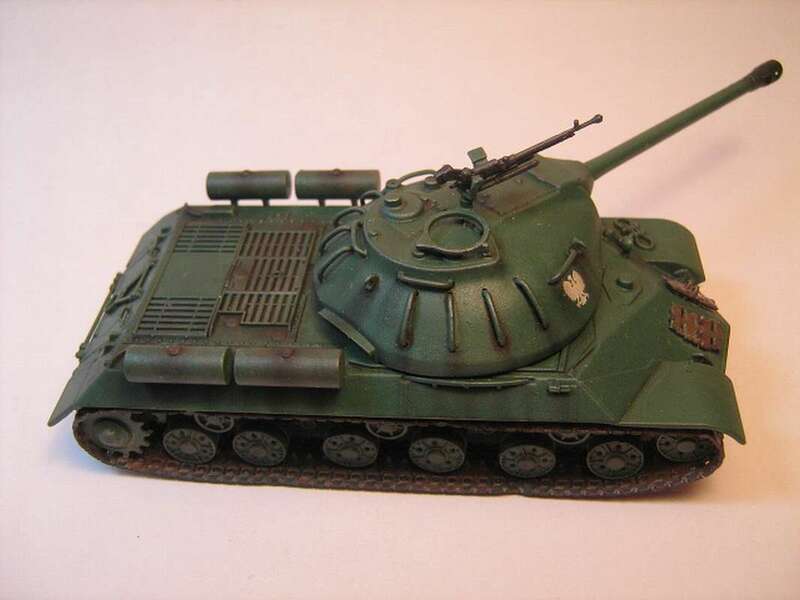 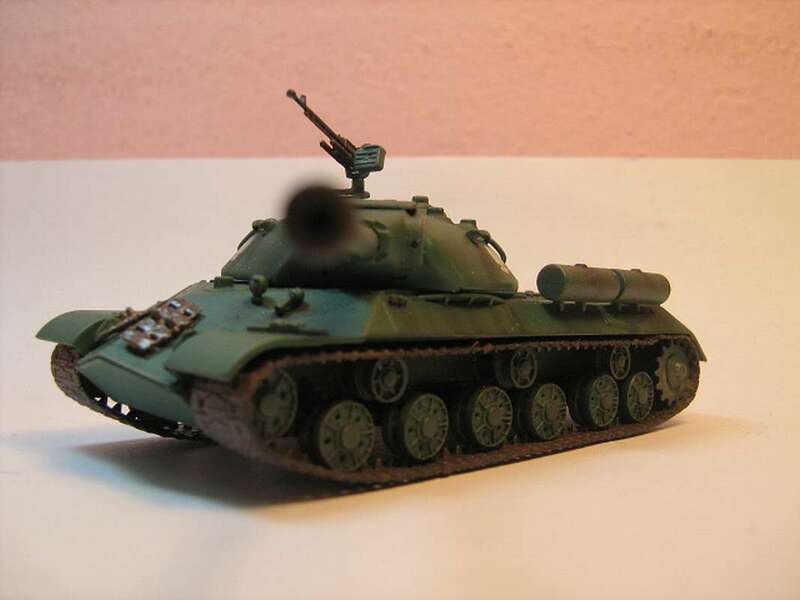 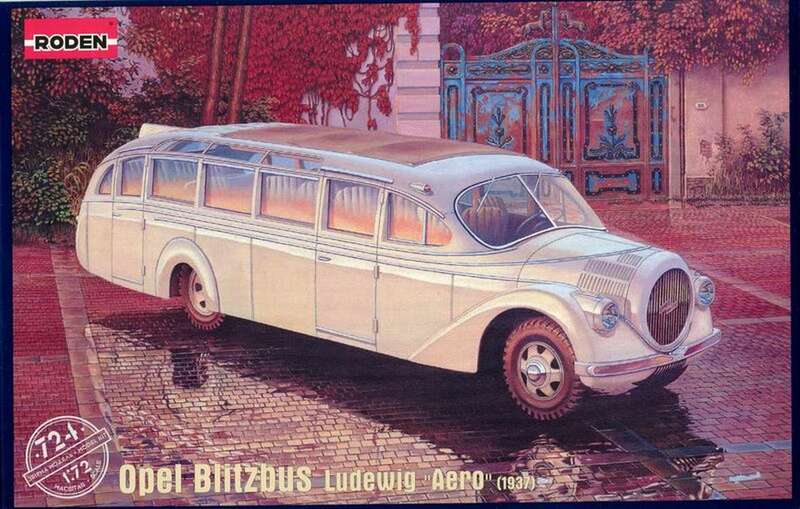 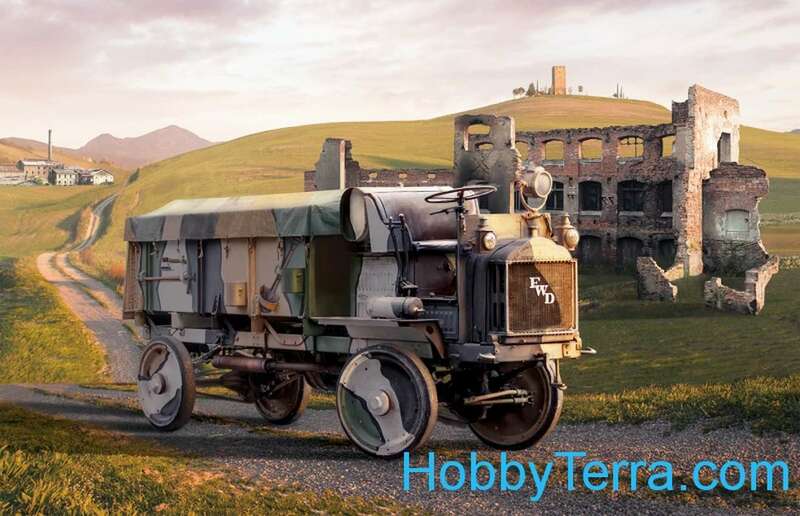 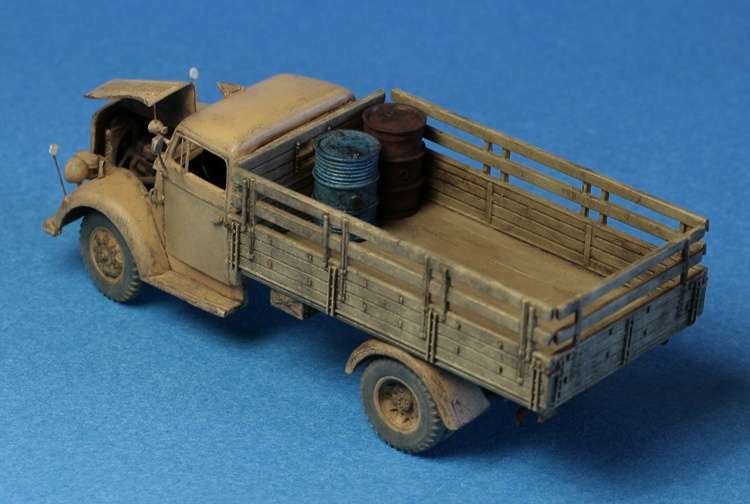 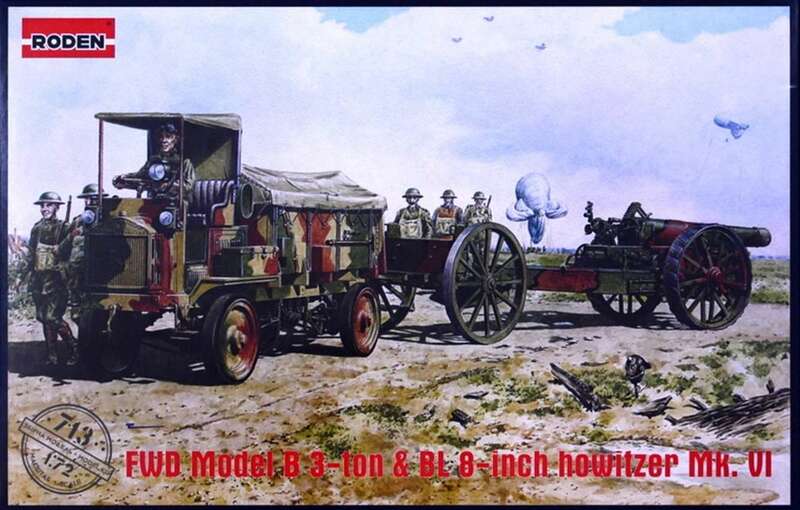 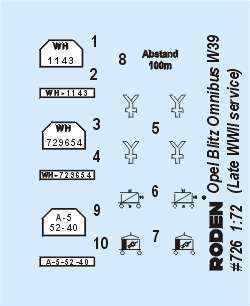 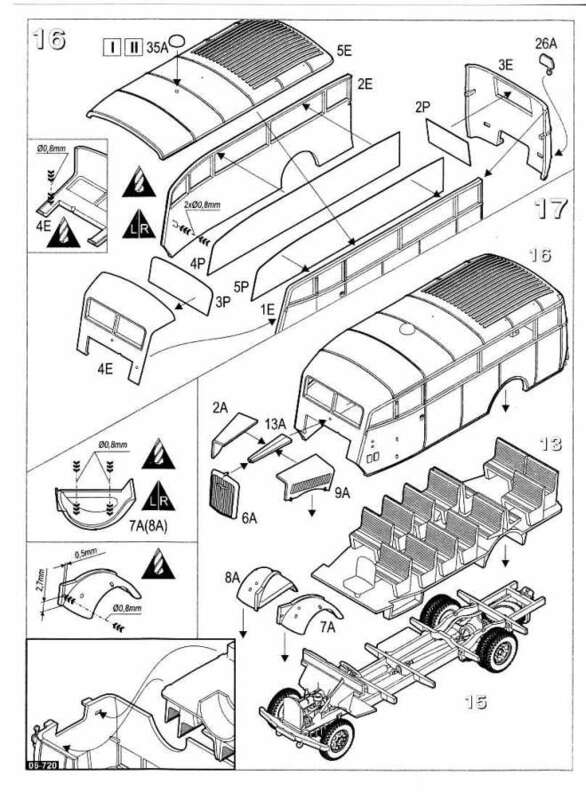 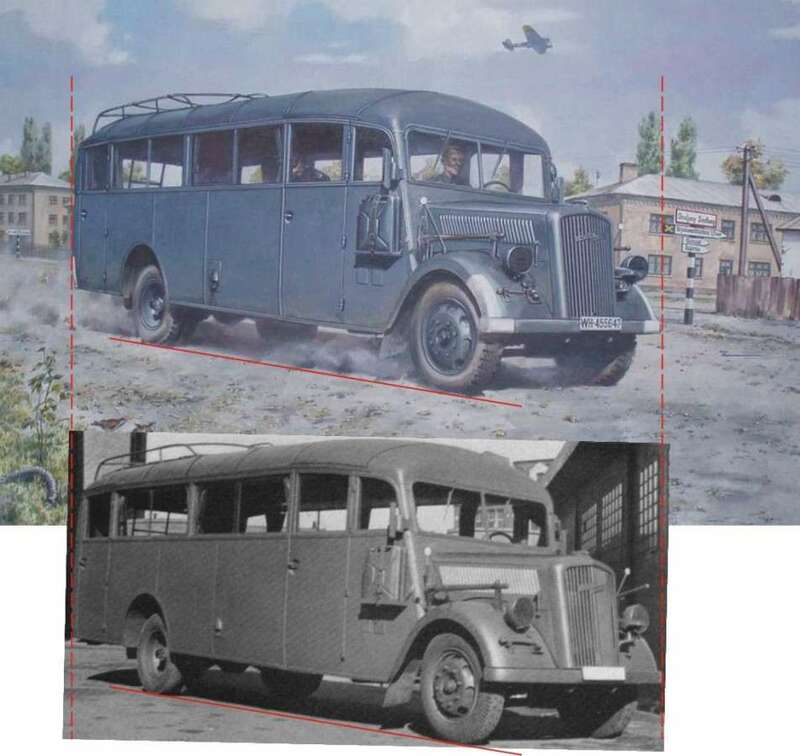 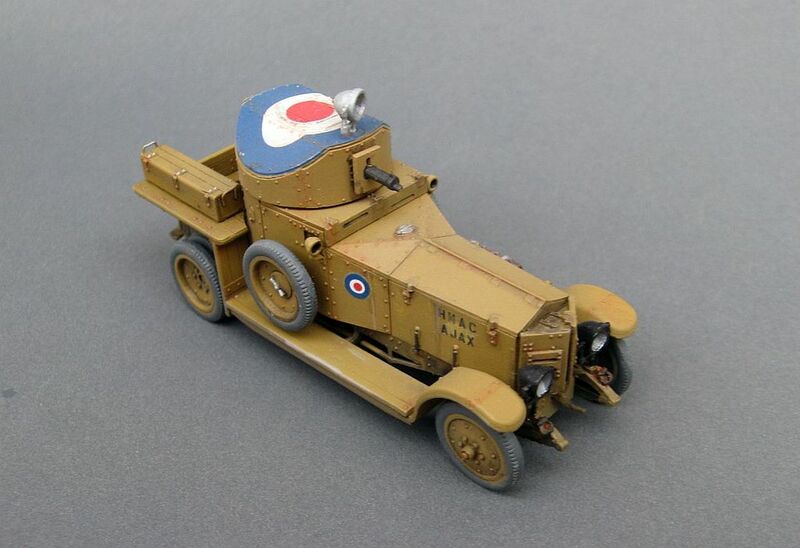 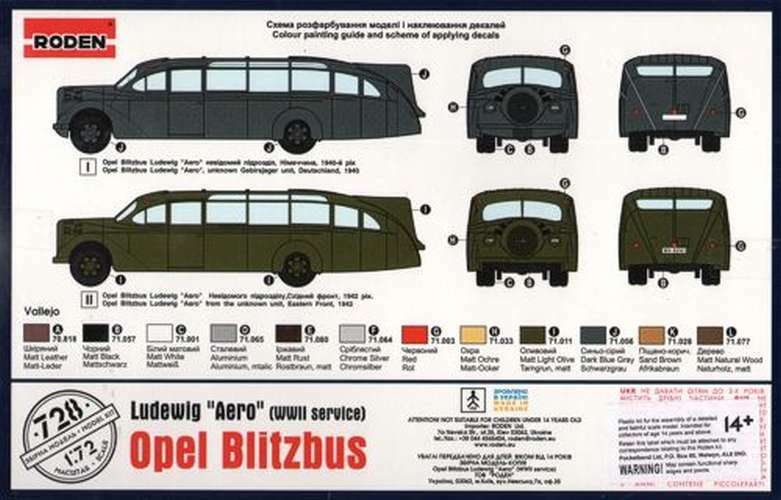 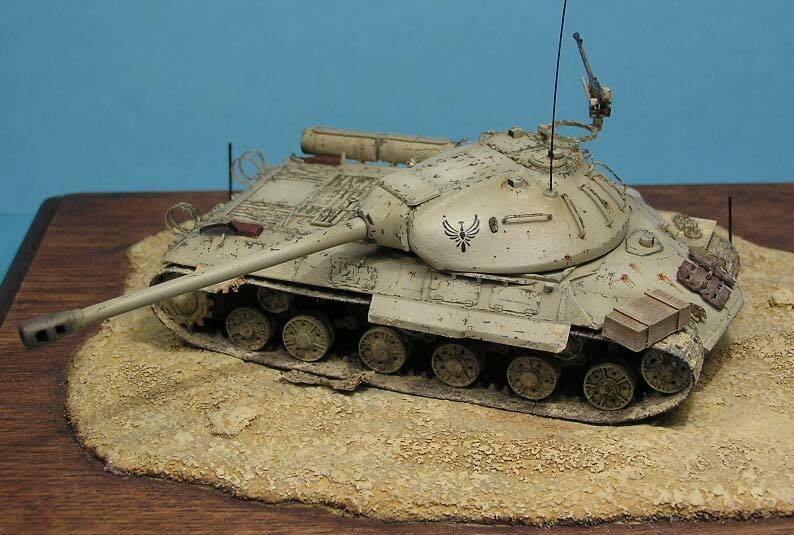 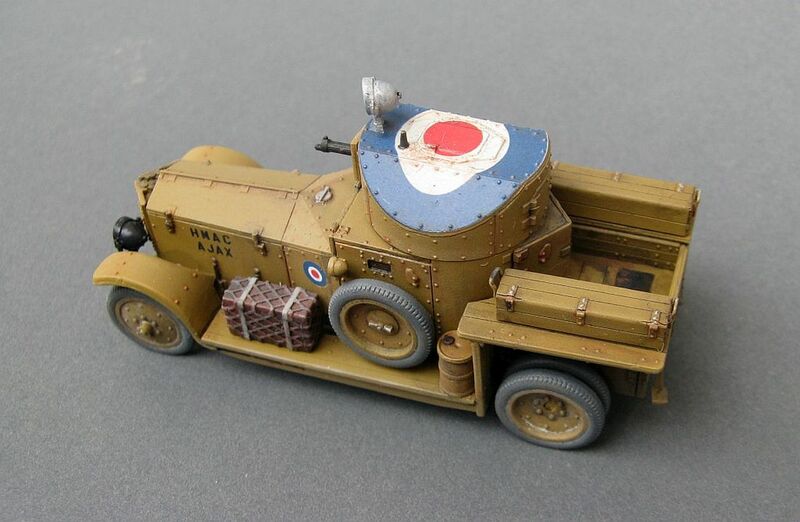 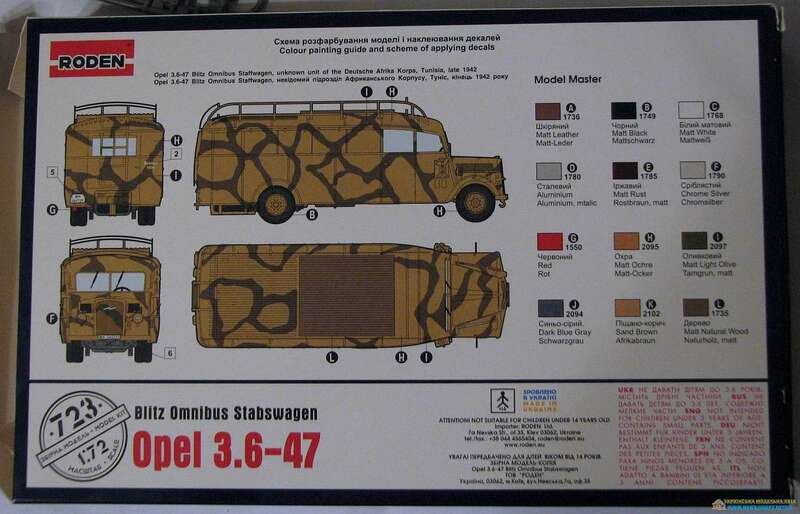 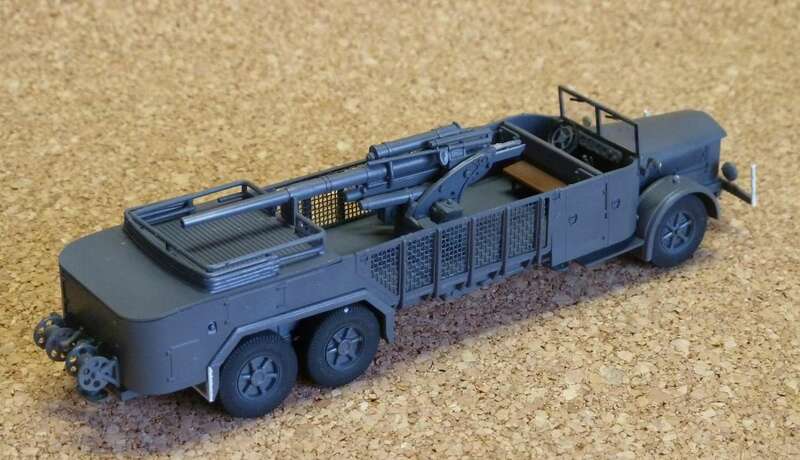 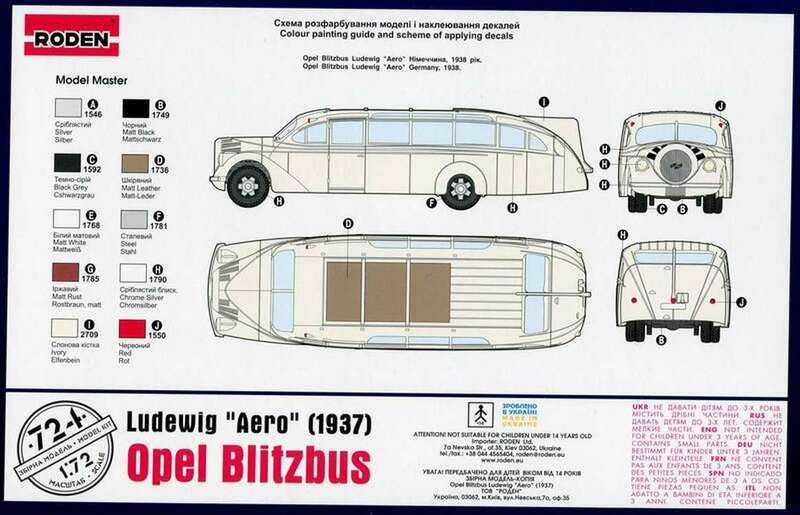 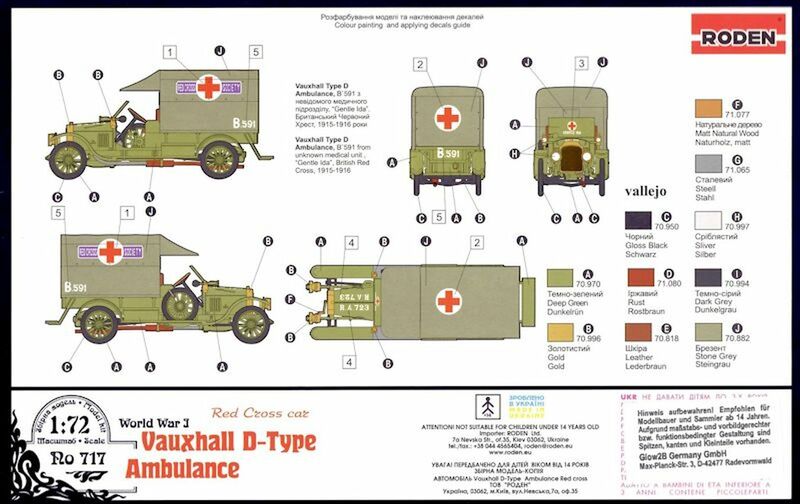 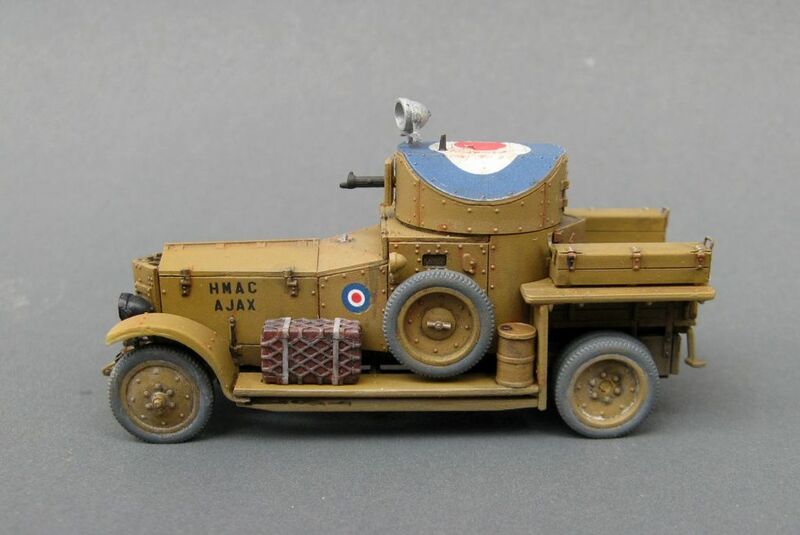 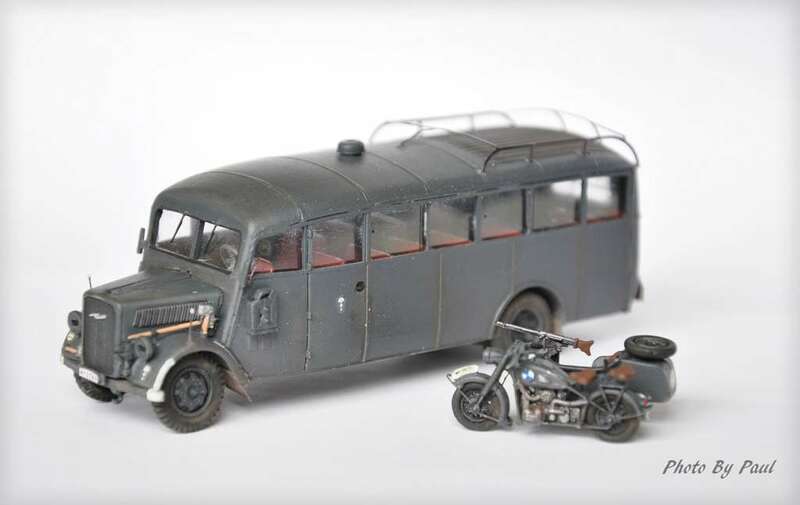 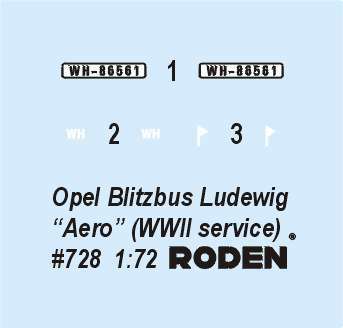 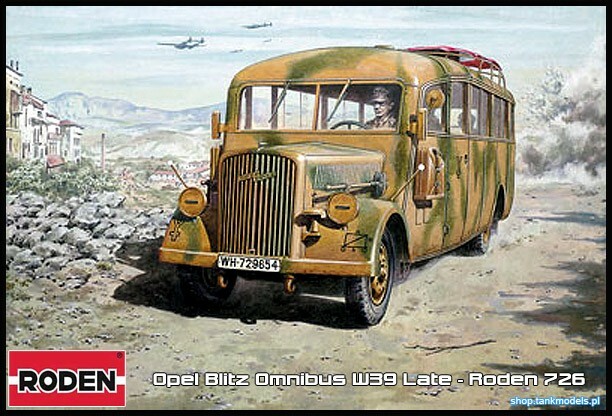 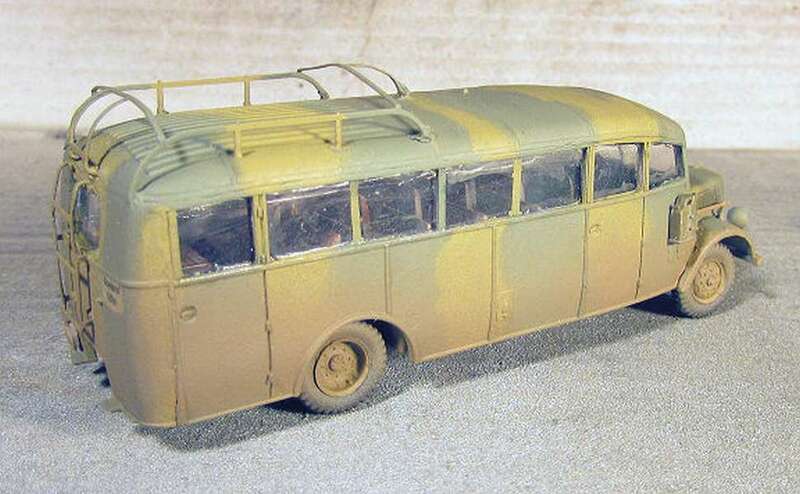 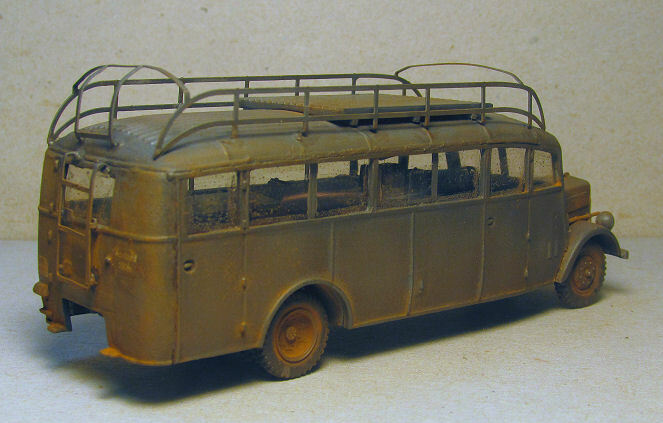 Promised by Toko several years ago, this long awaited 'replacement' for the decidedly old Airfix kit, has finally been released...and for the price, it's very good (as good, if not better than PST 1/72 AFV kits)! 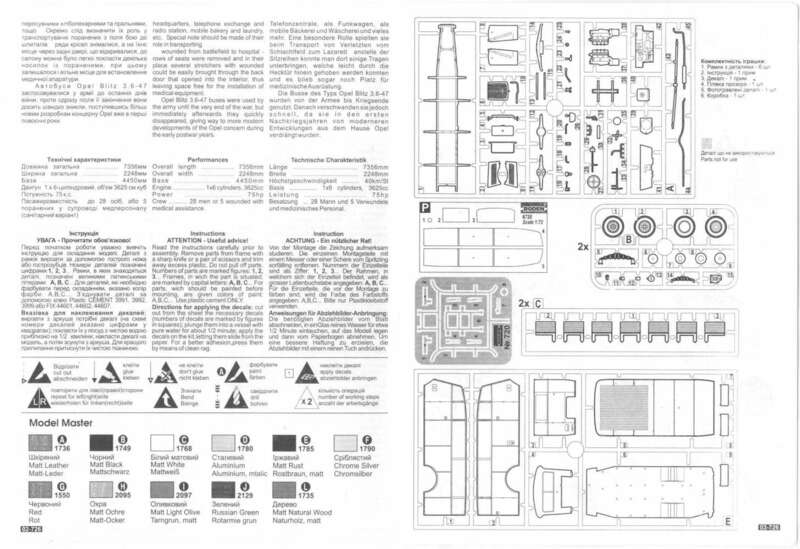 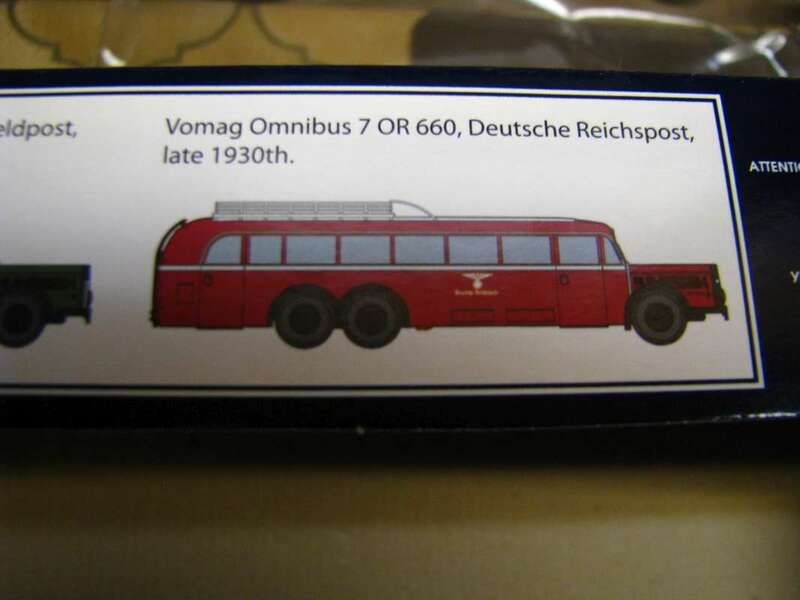 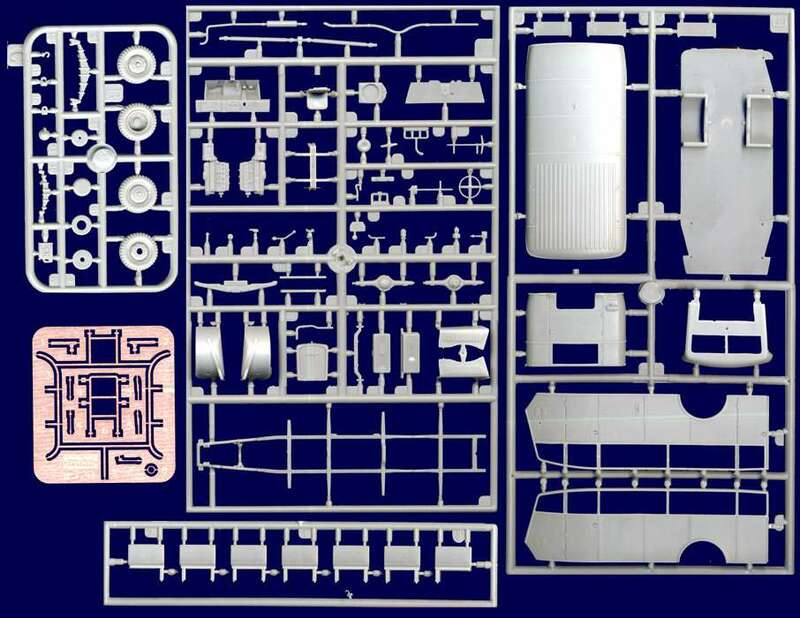 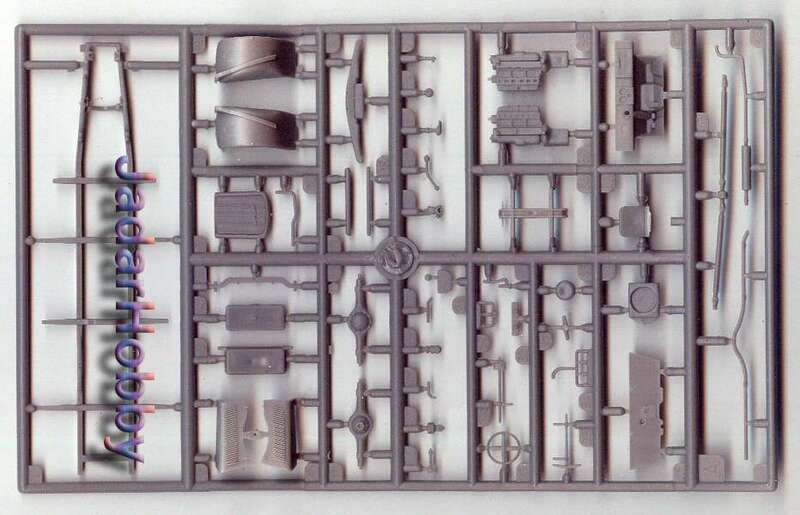 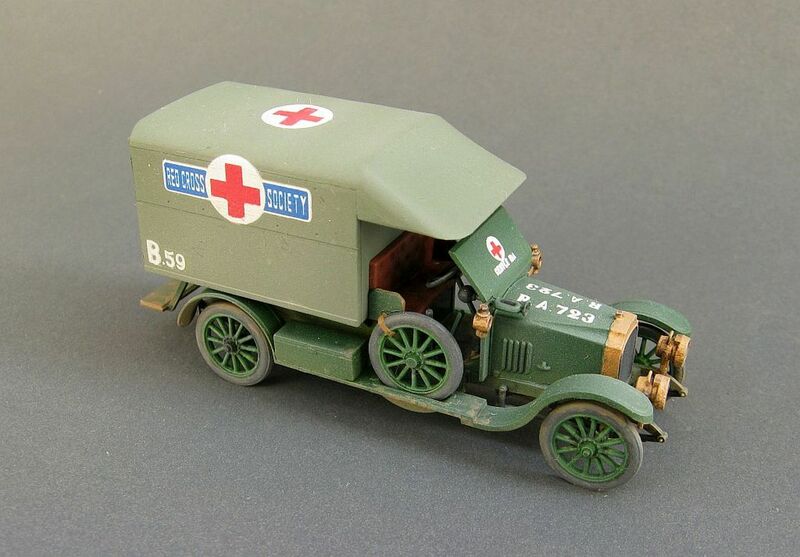 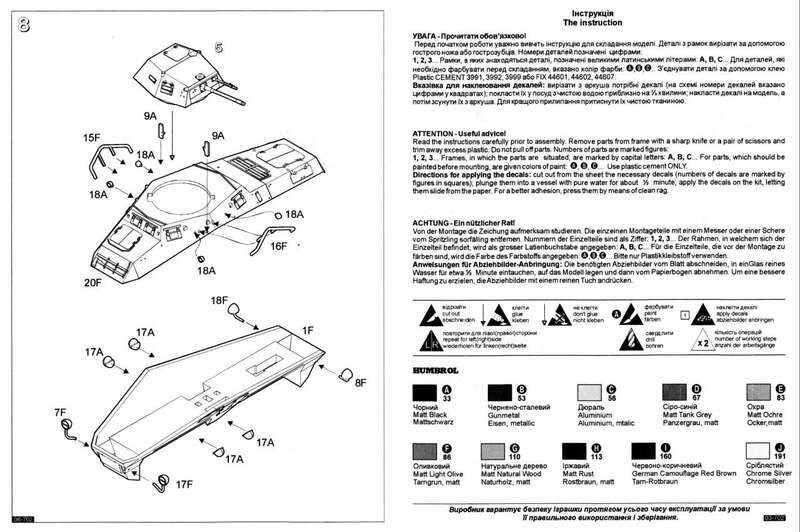 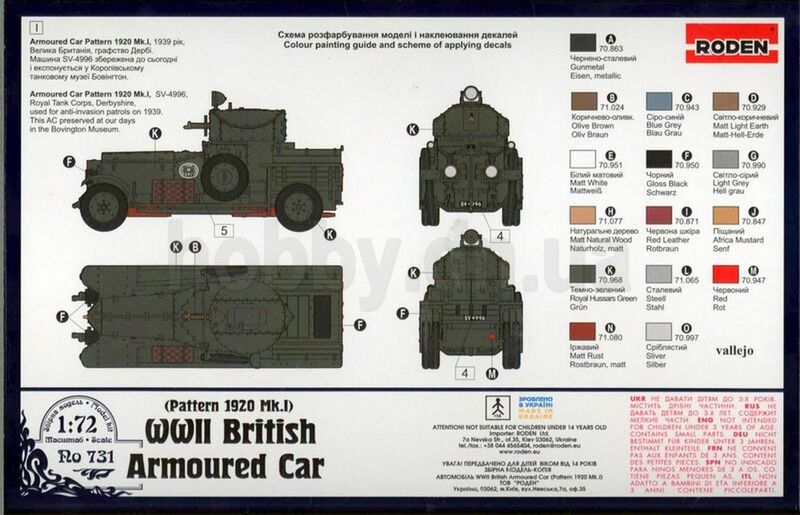 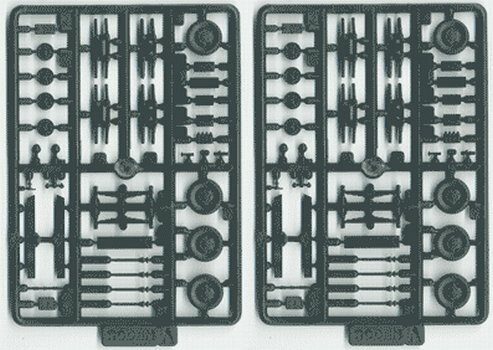 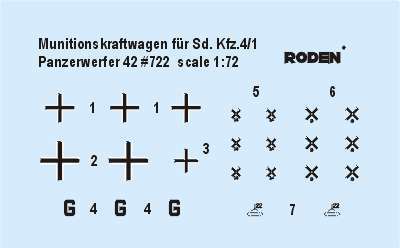 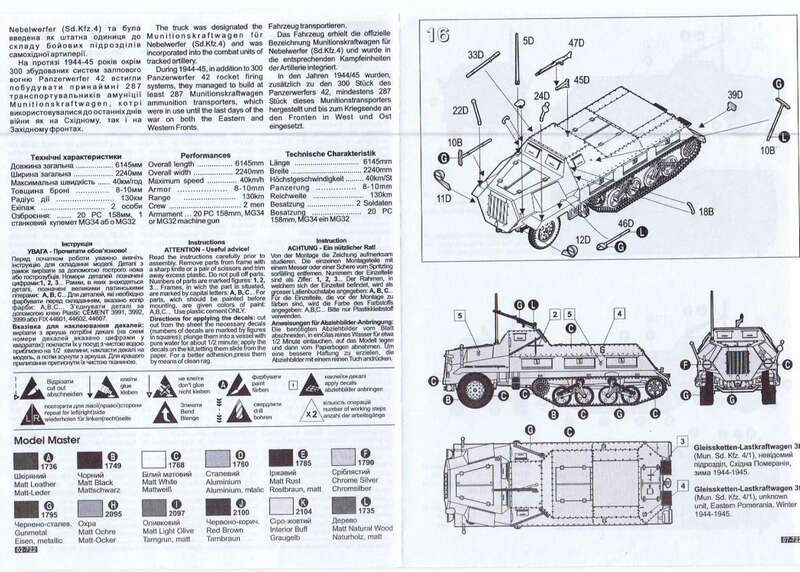 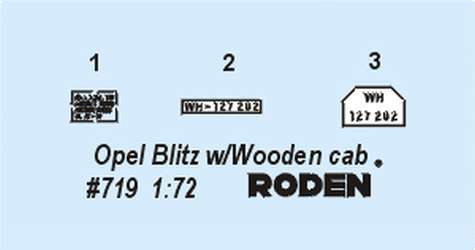 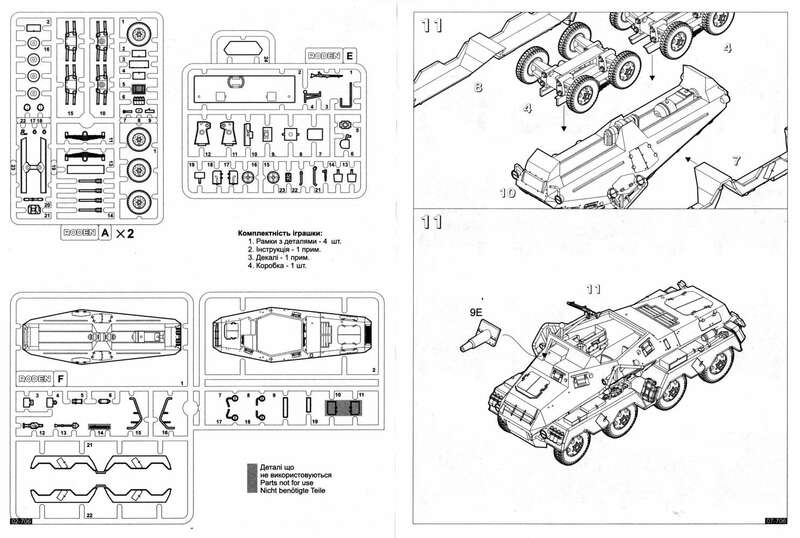 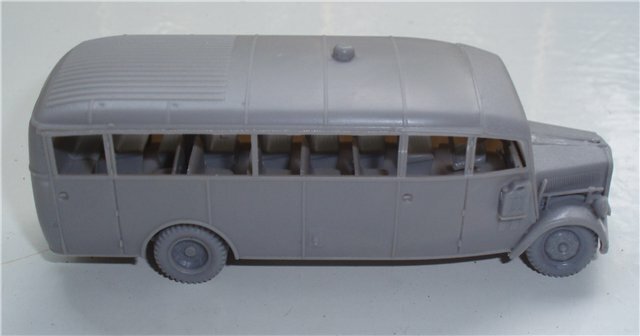 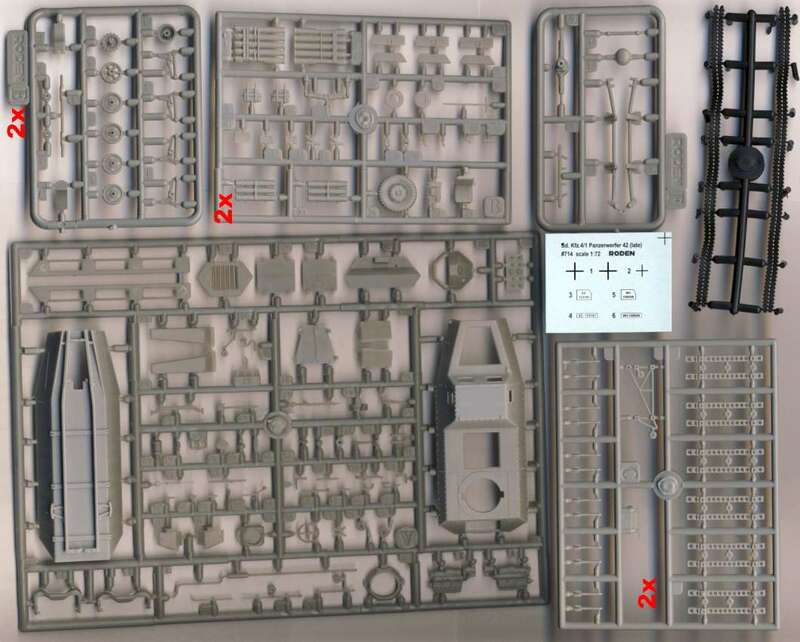 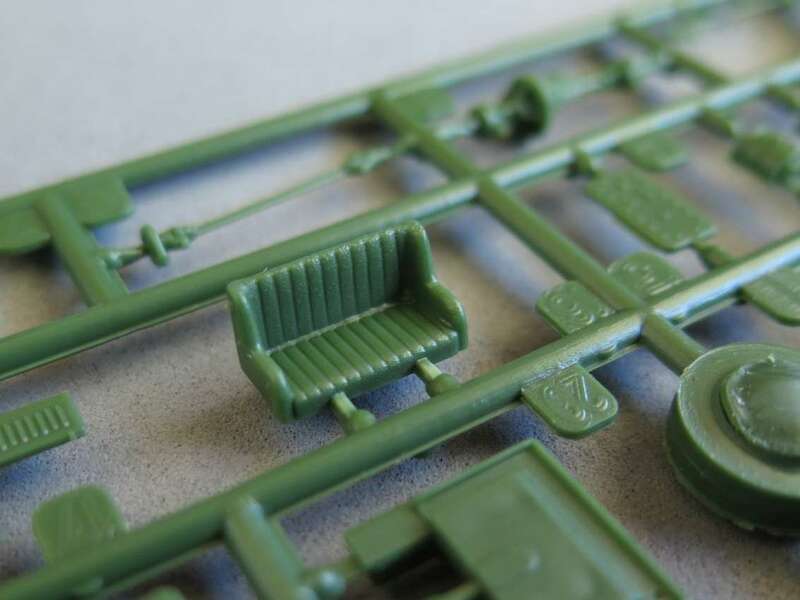 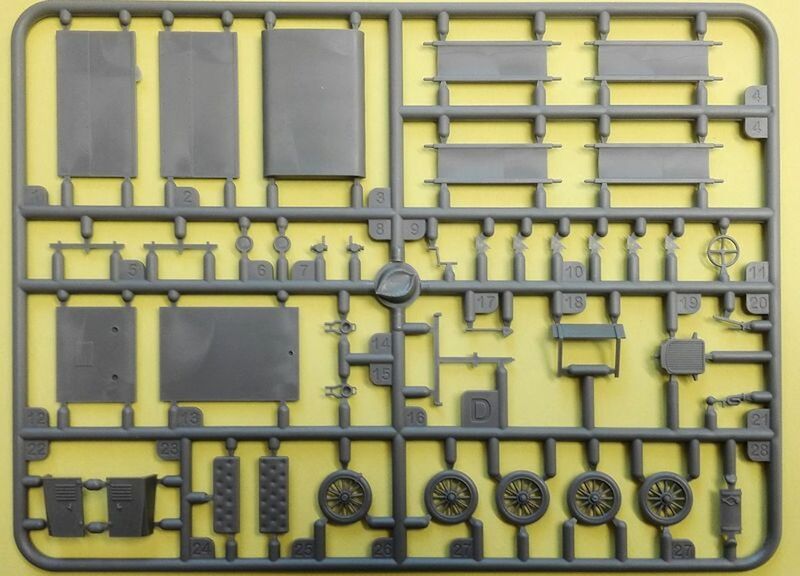 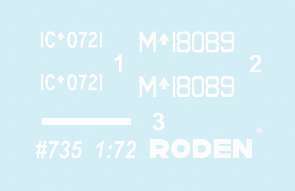 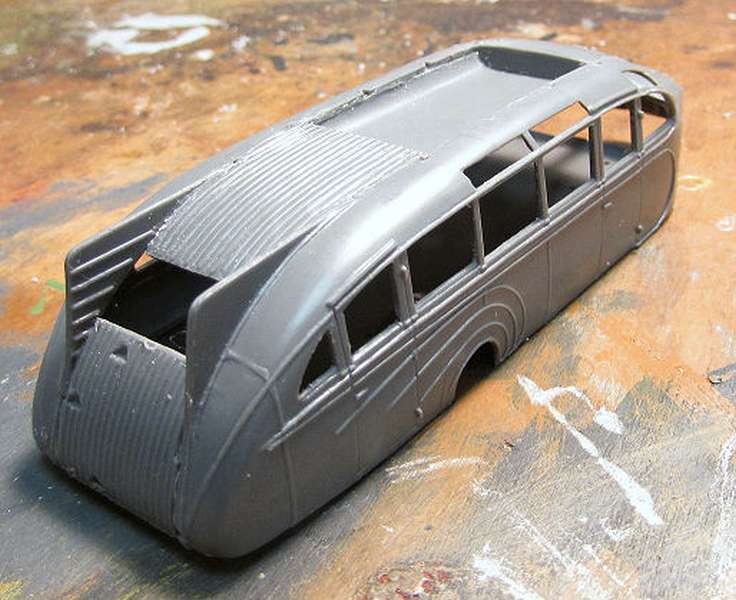 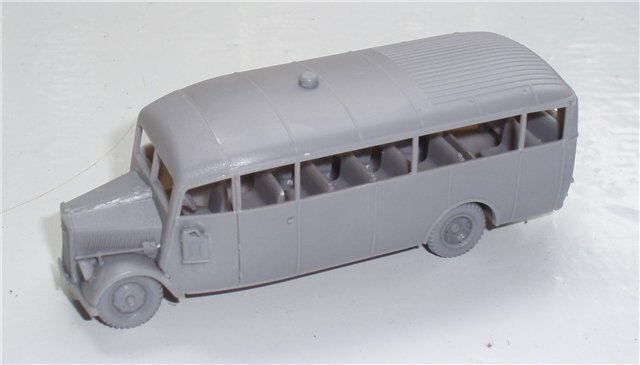 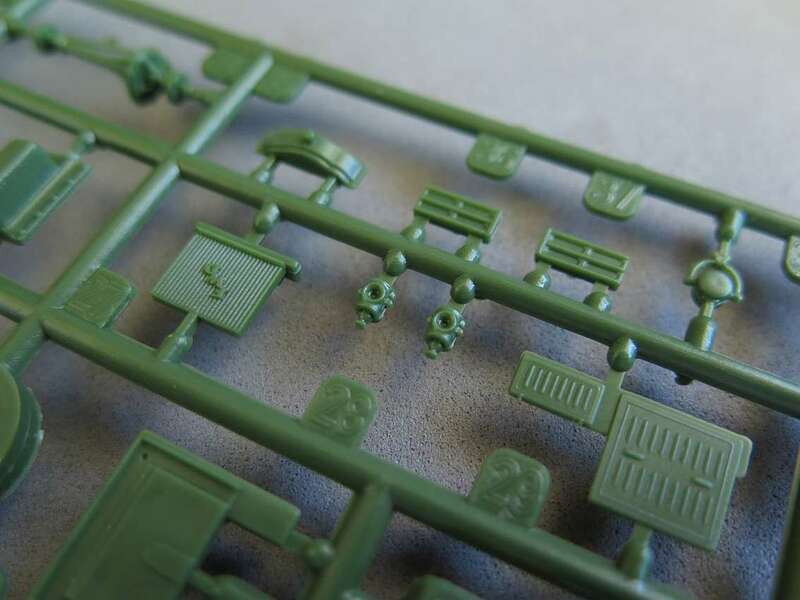 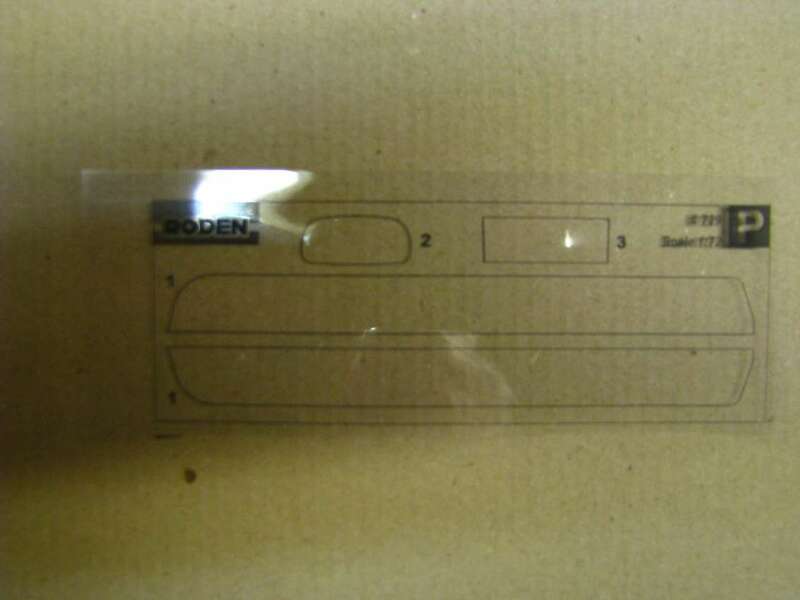 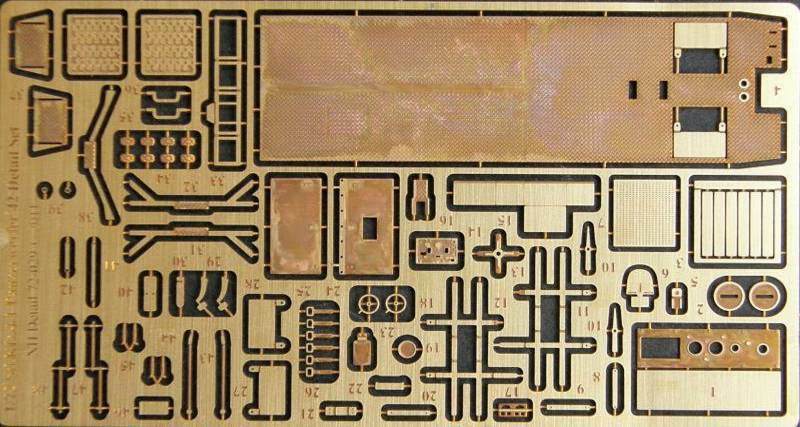 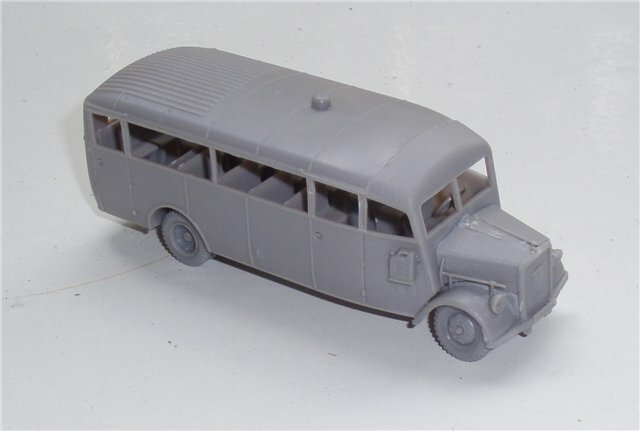 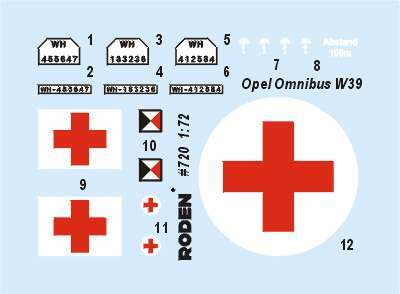 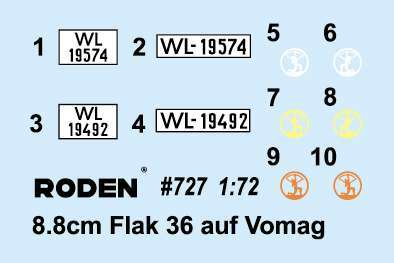 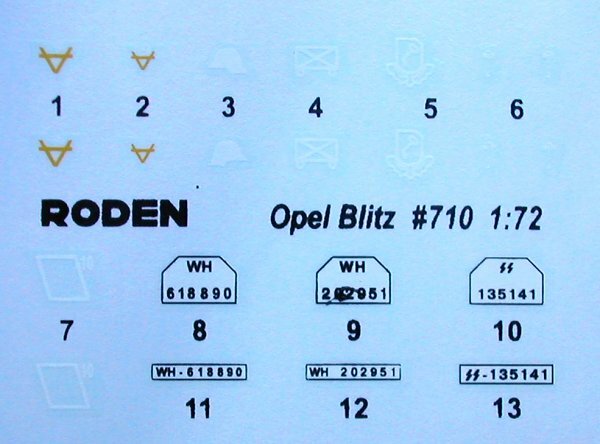 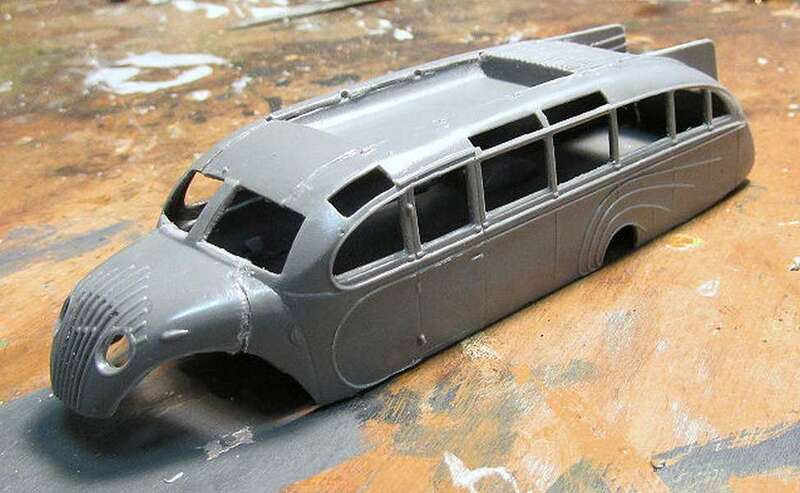 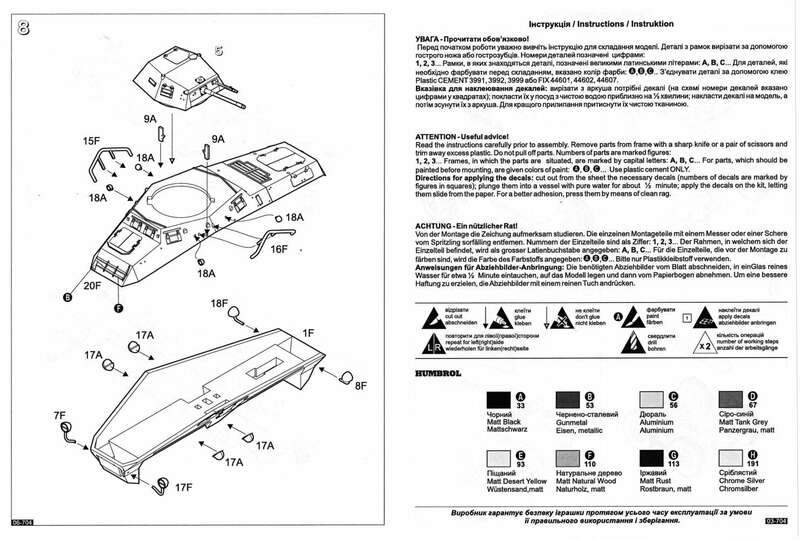 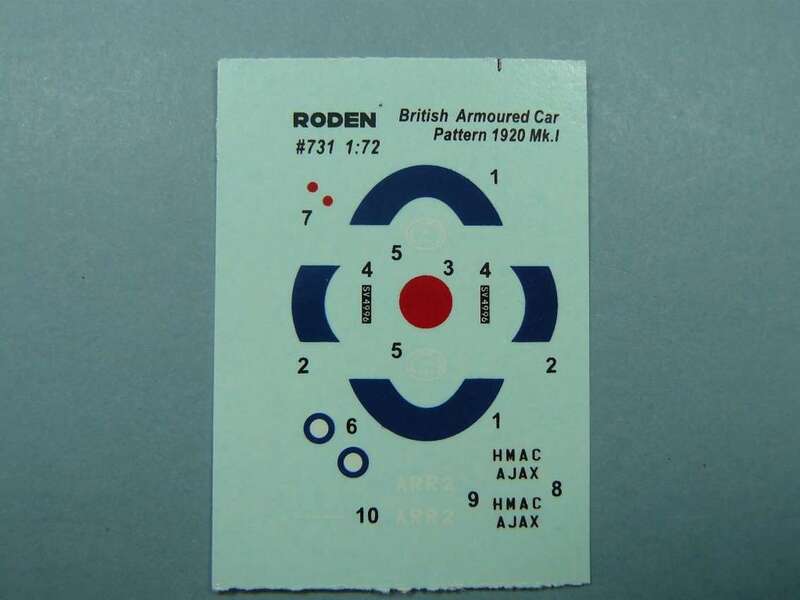 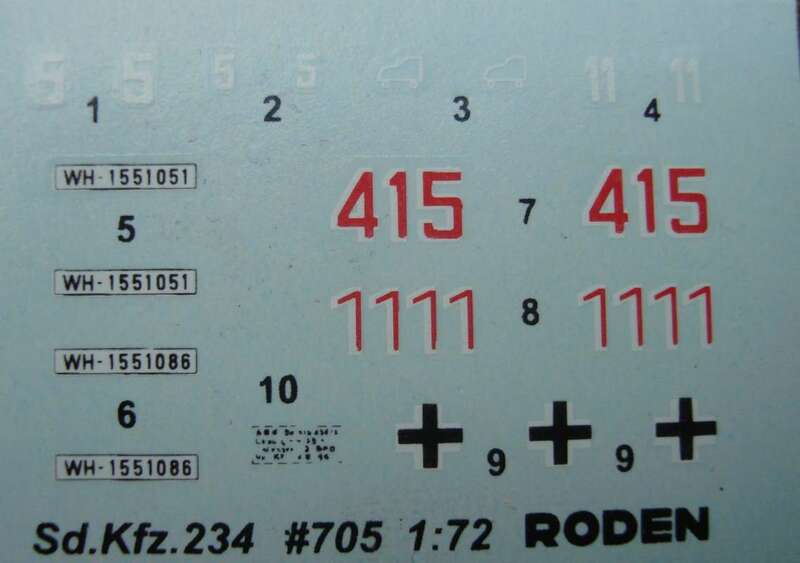 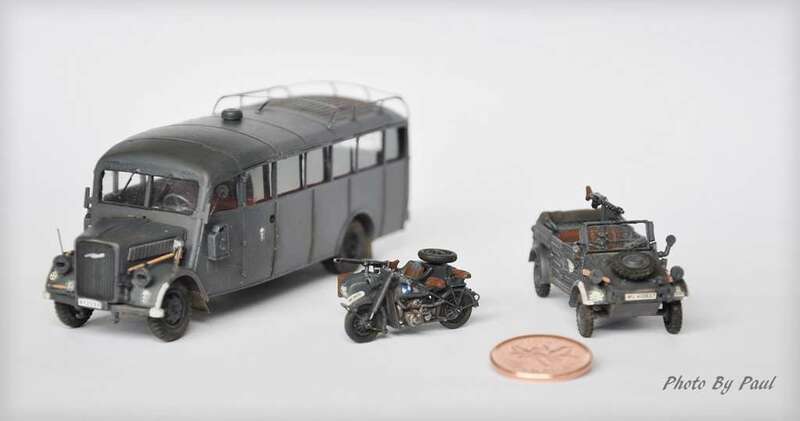 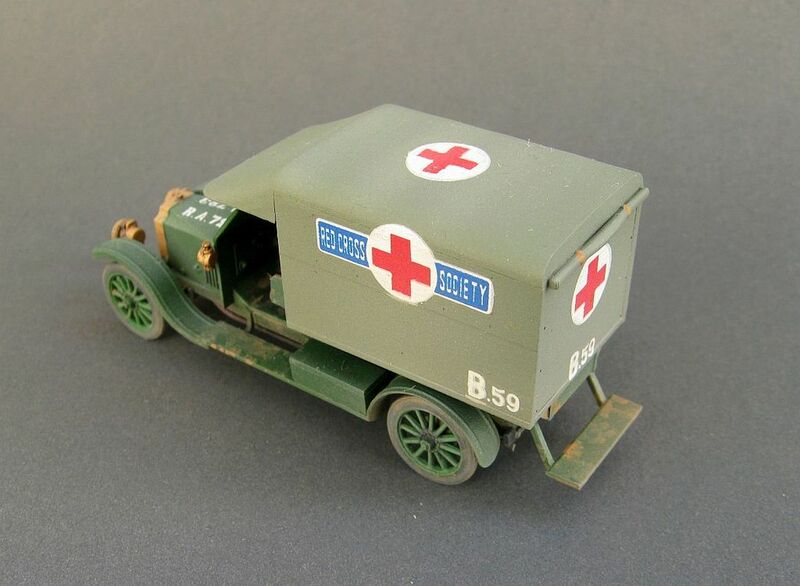 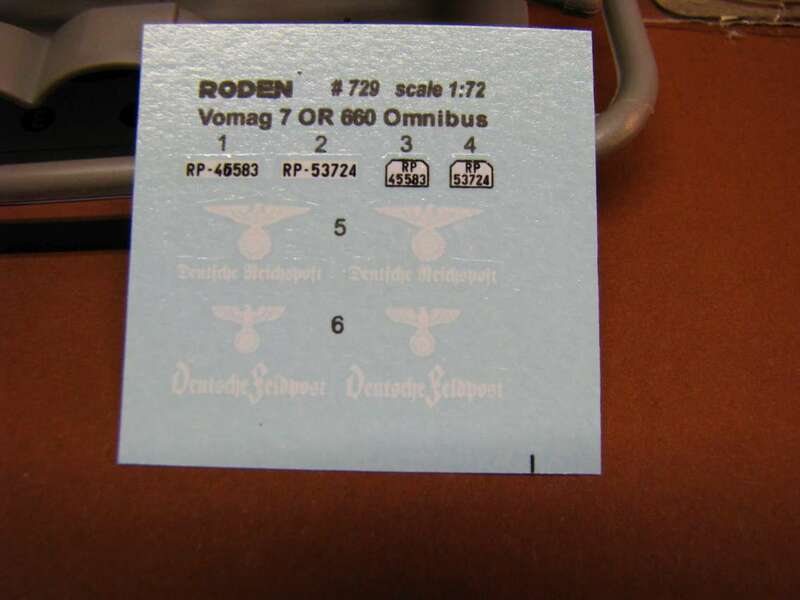 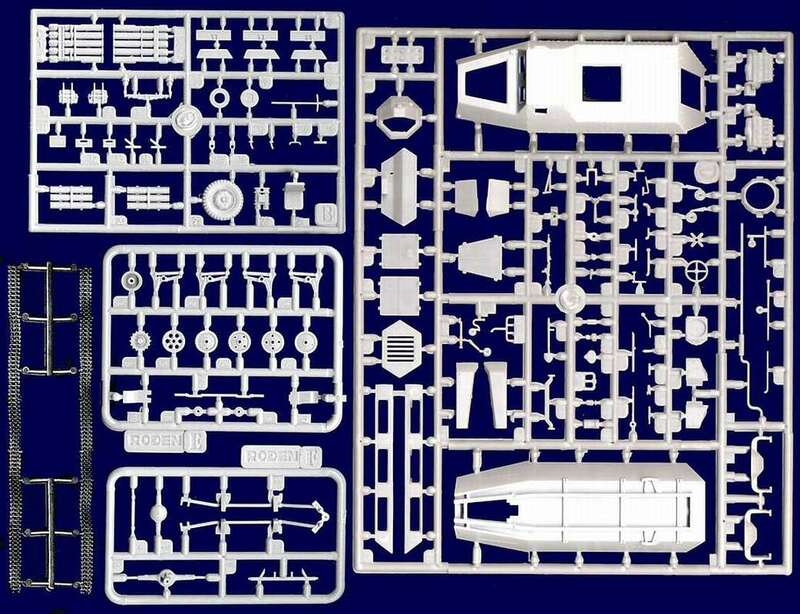 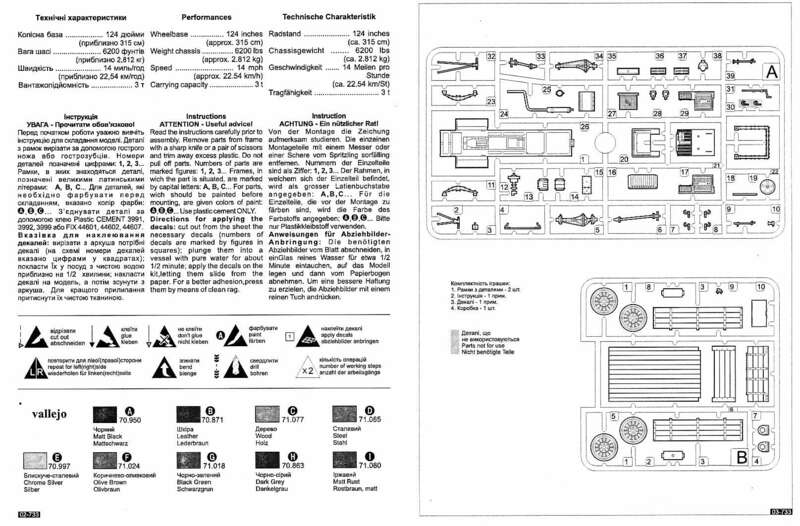 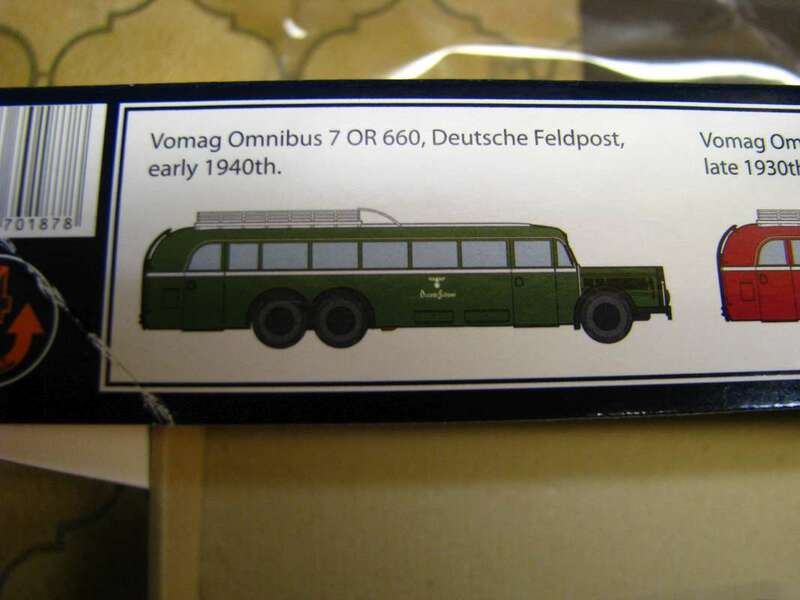 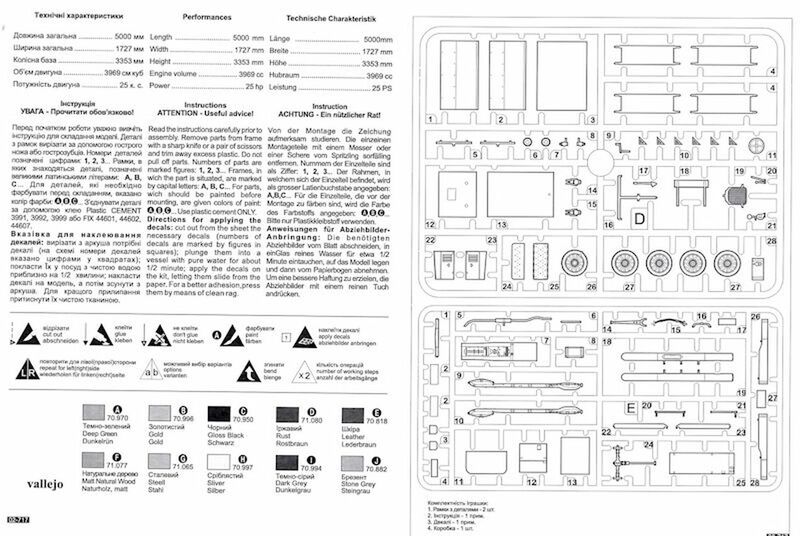 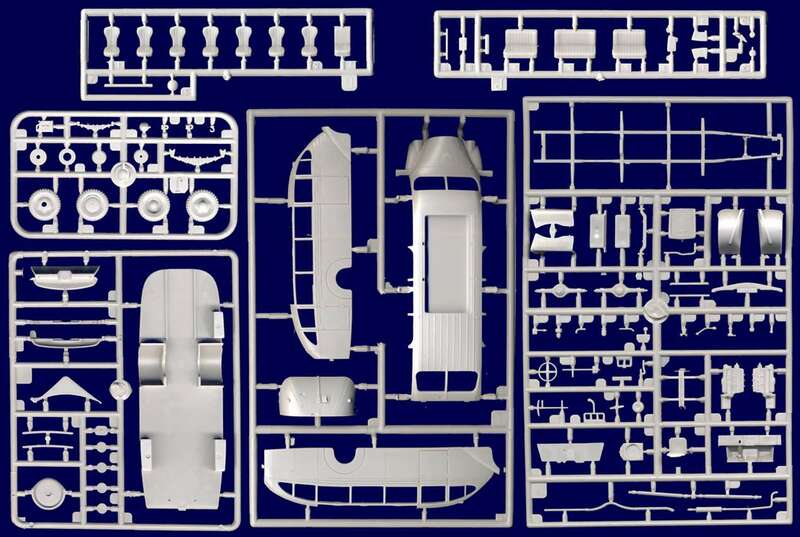 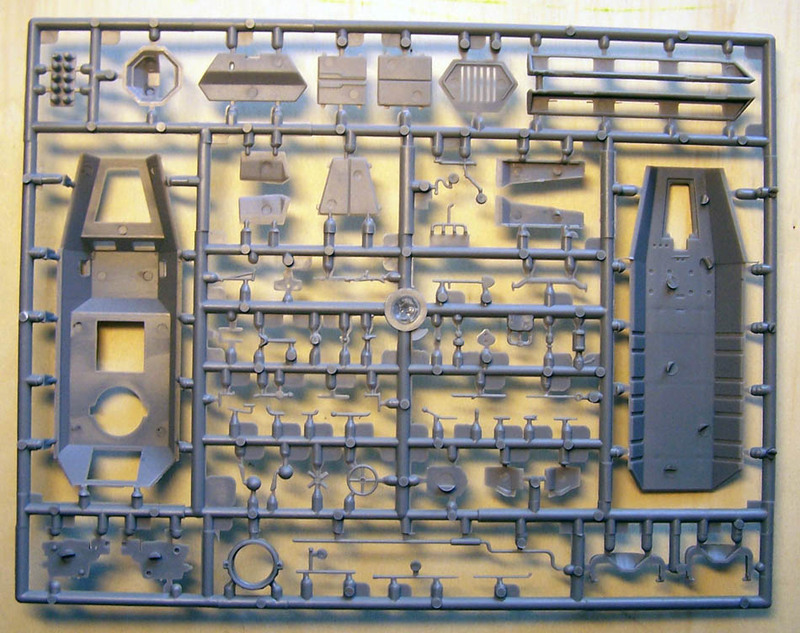 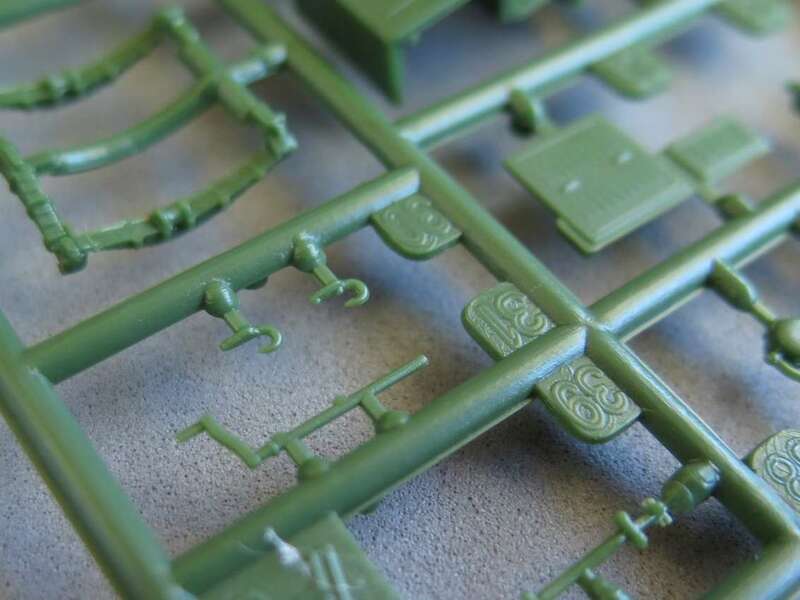 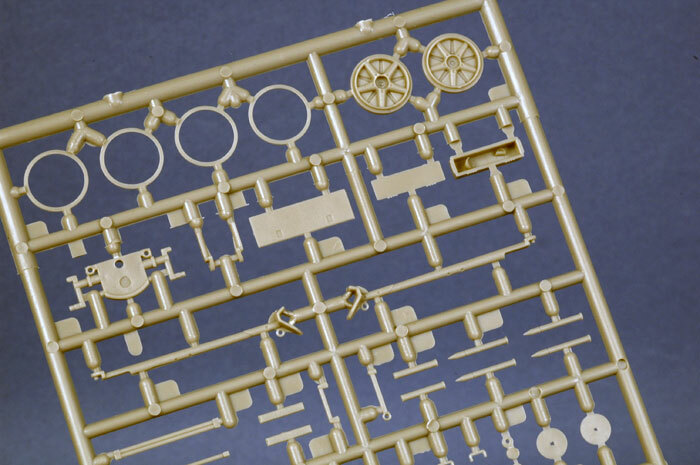 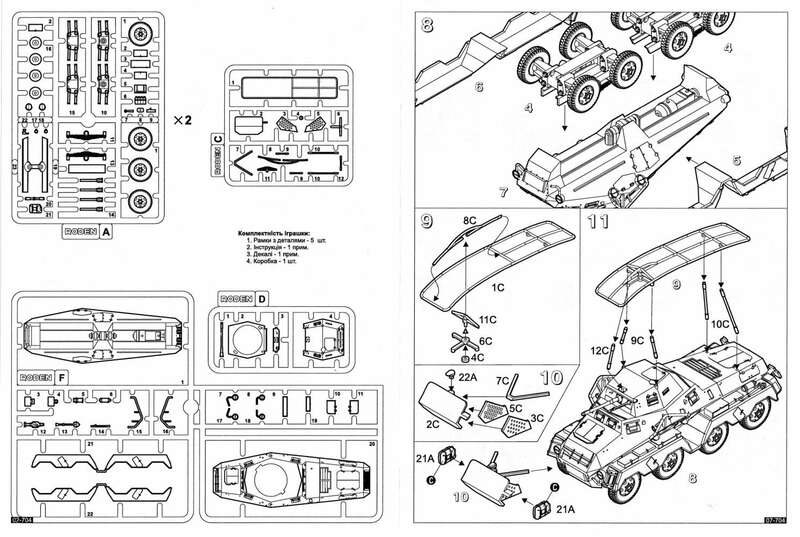 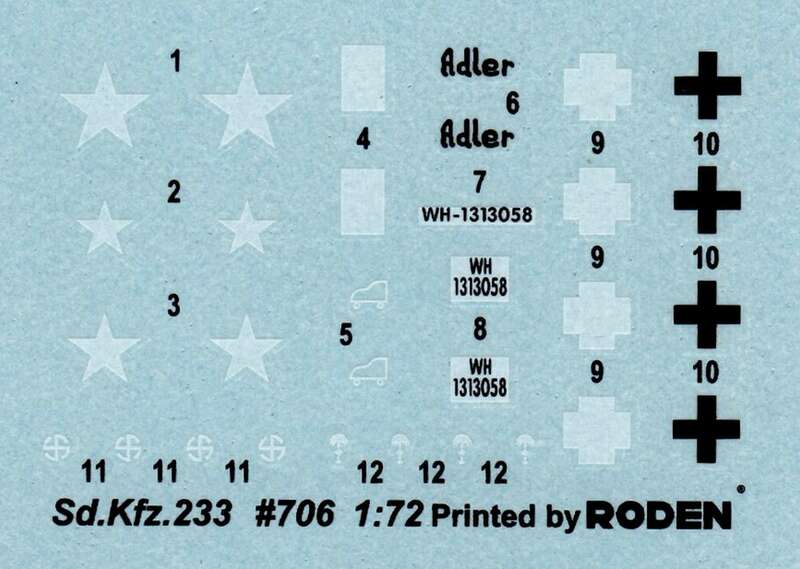 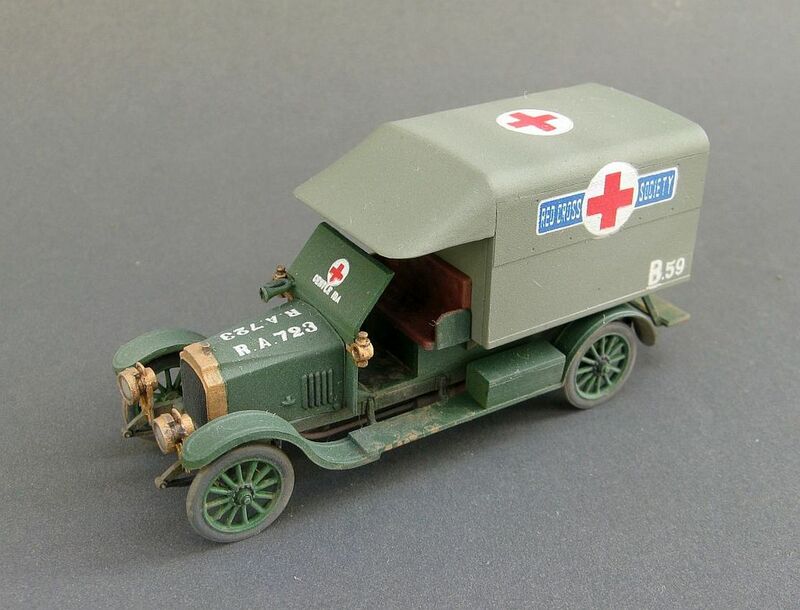 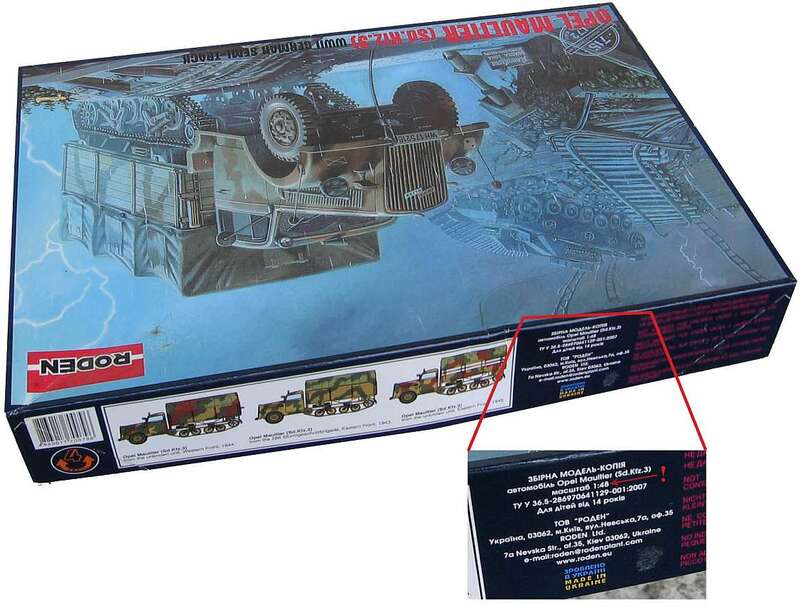 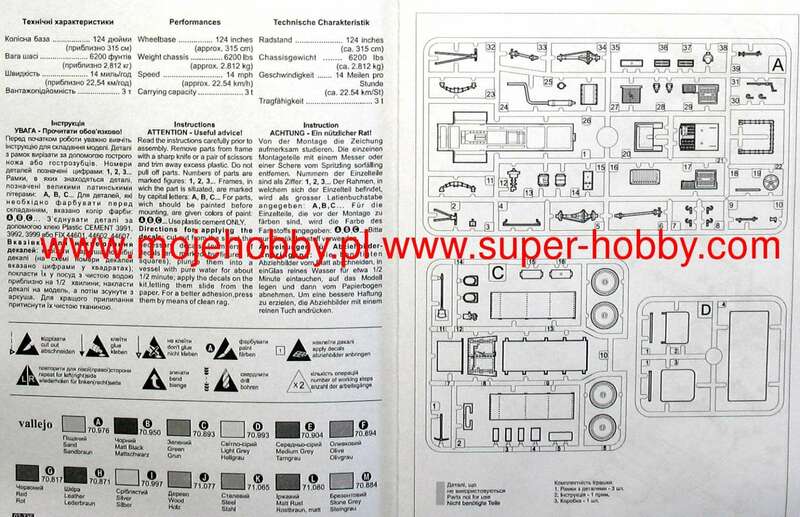 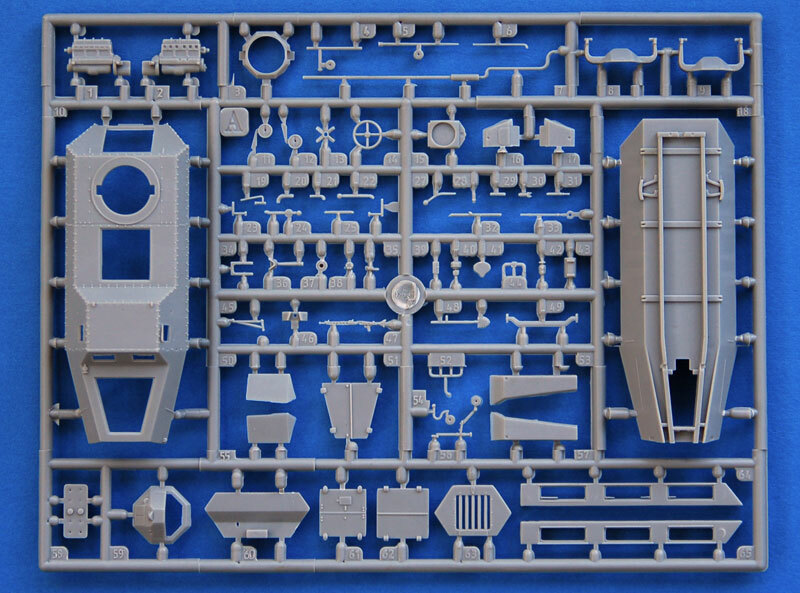 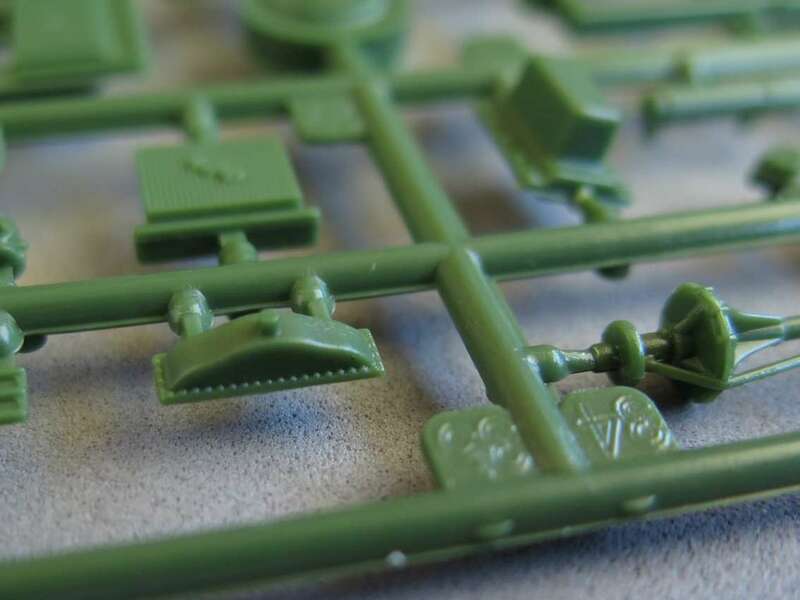 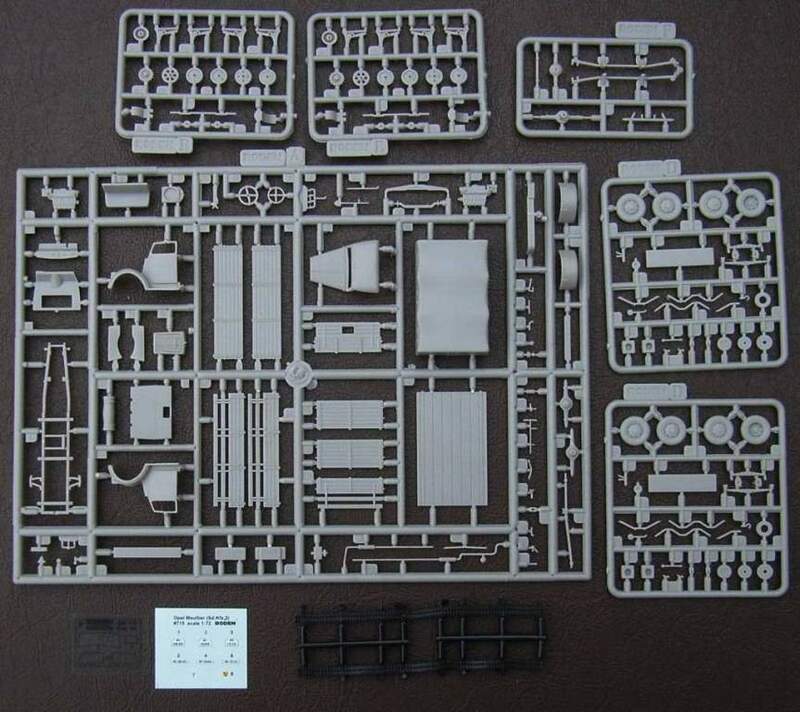 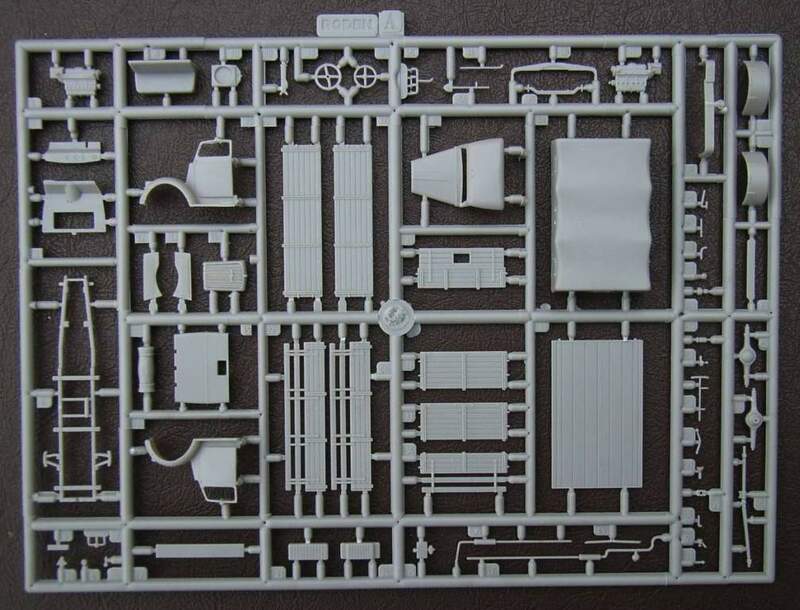 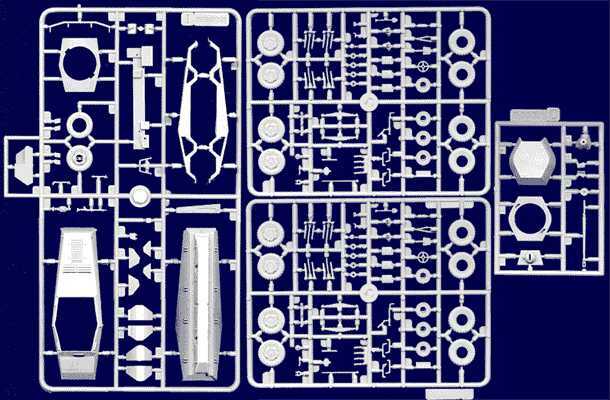 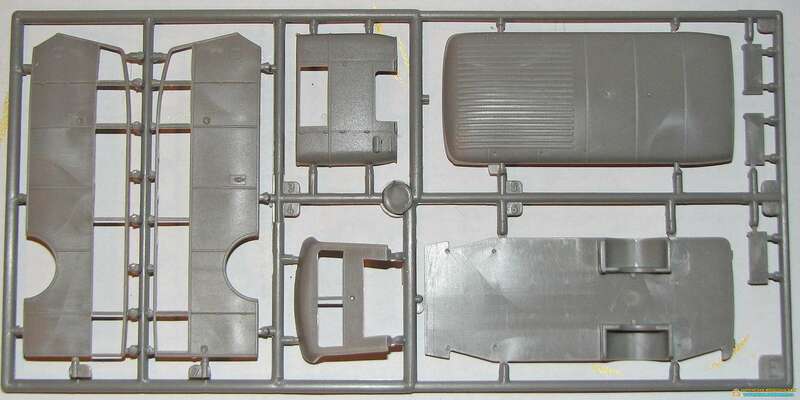 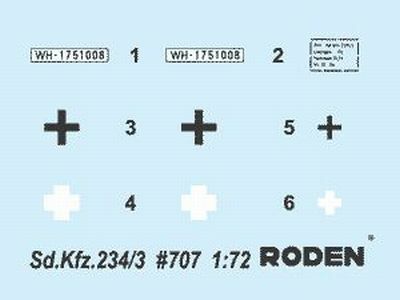 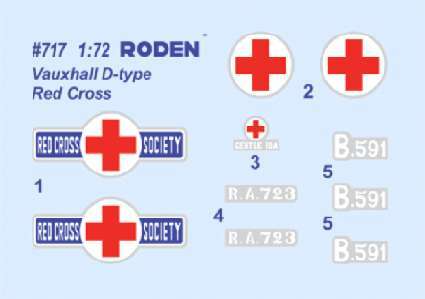 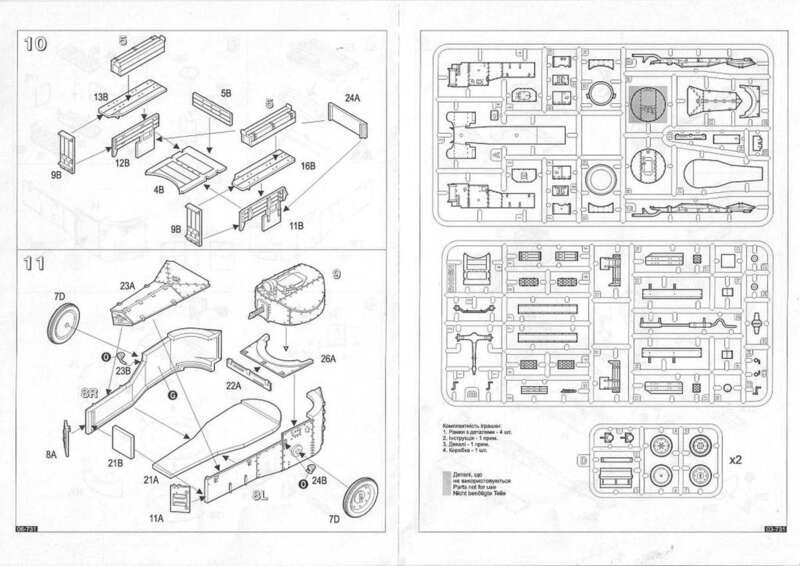 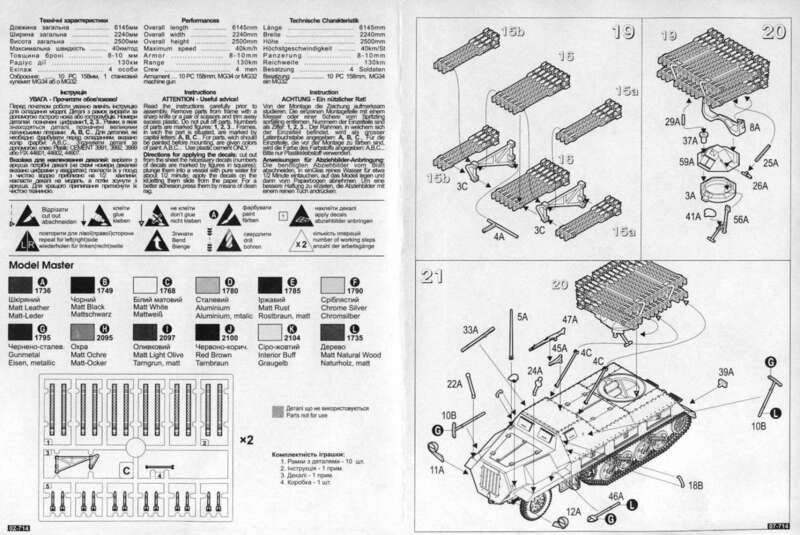 There are two sprues of 127 crisp, flash free injection moulded parts, plus vinyl tracks and a small decal sheet (markings for two vehicles). 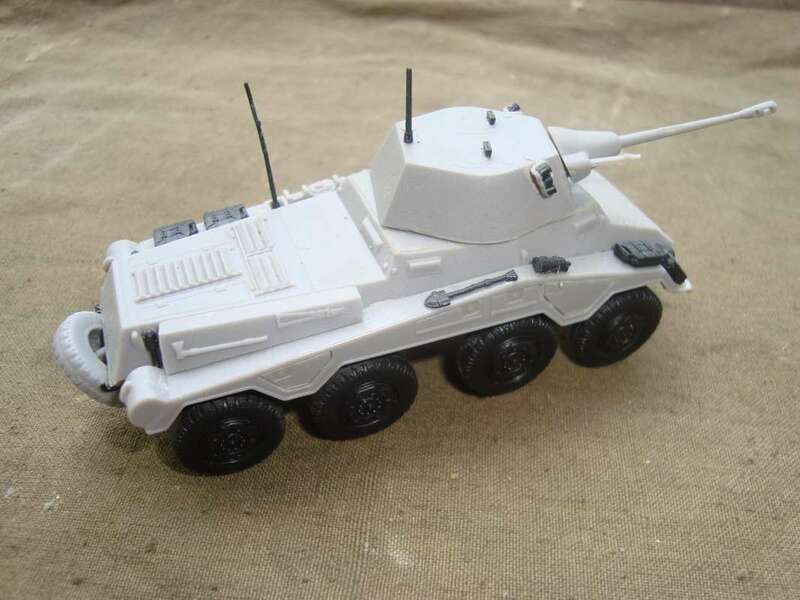 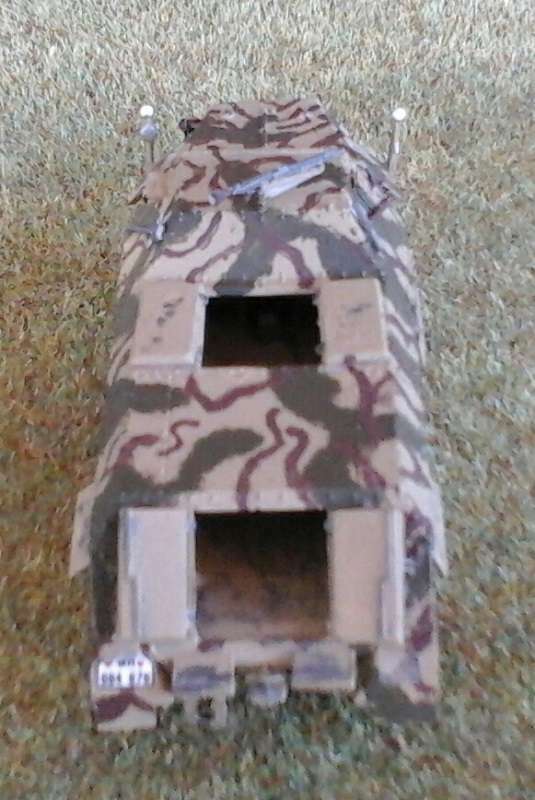 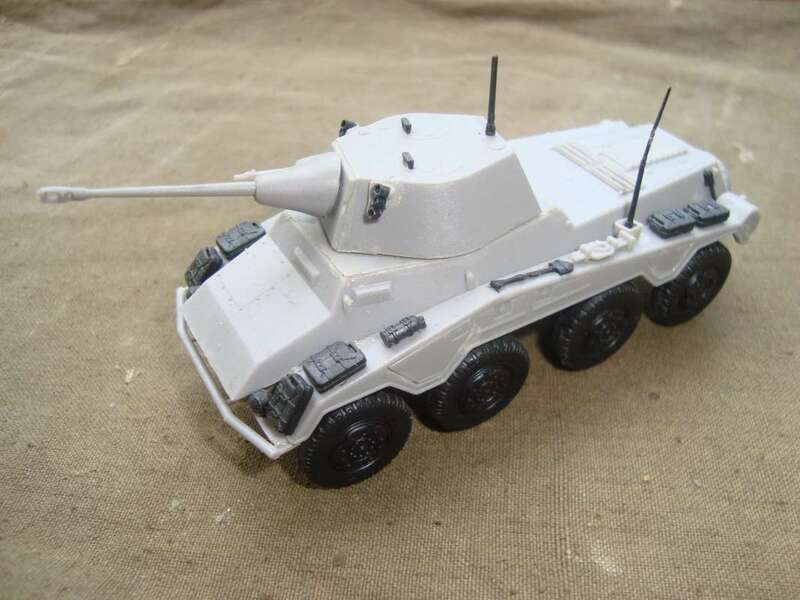 Detail is good...all road wheels and suspension arms are separately moulded...the turret and main gun are moveable (there is also a turret mounted machine gun, supplied)...upper hull accessories include fuel tanks and spare tracks while each of the turret 'handles' is moulded separately (and very finely too). 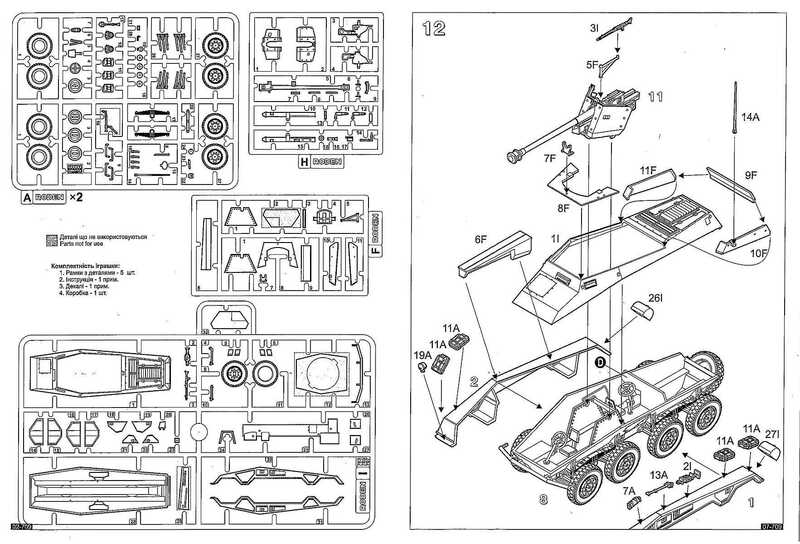 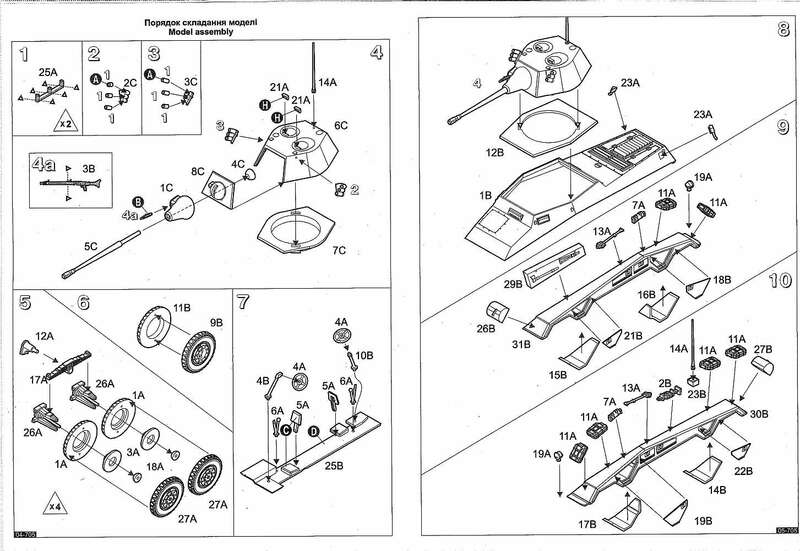 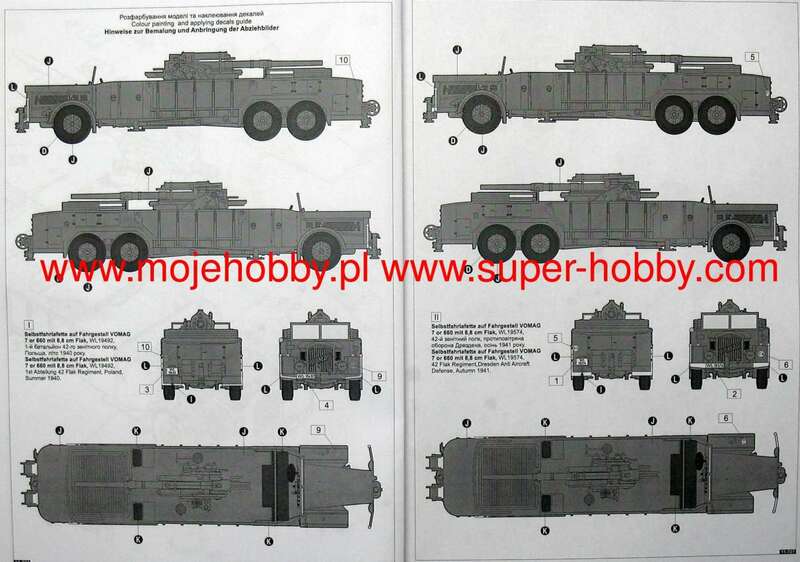 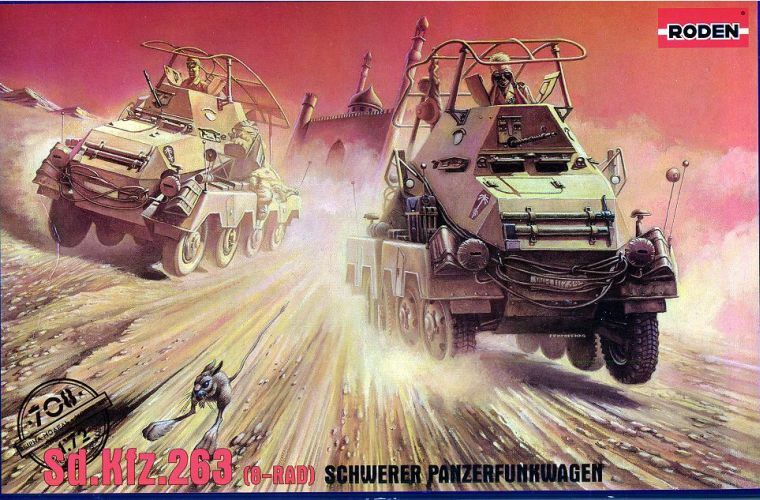 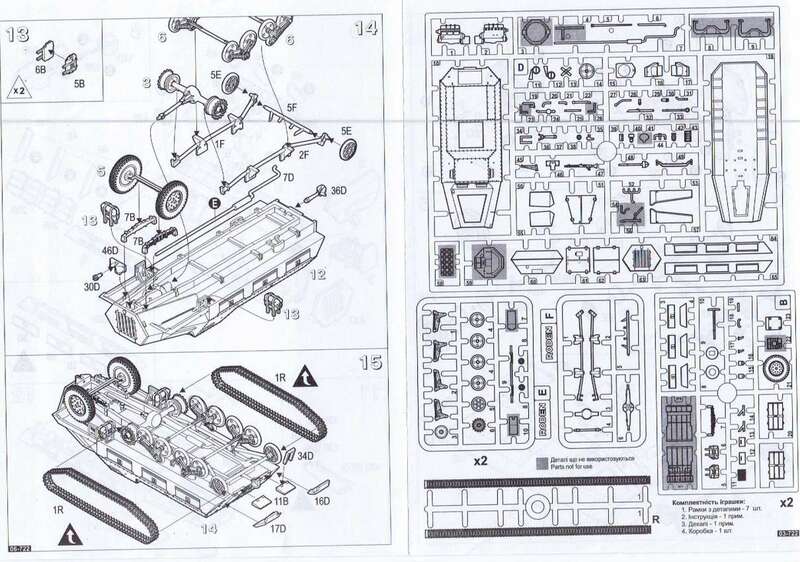 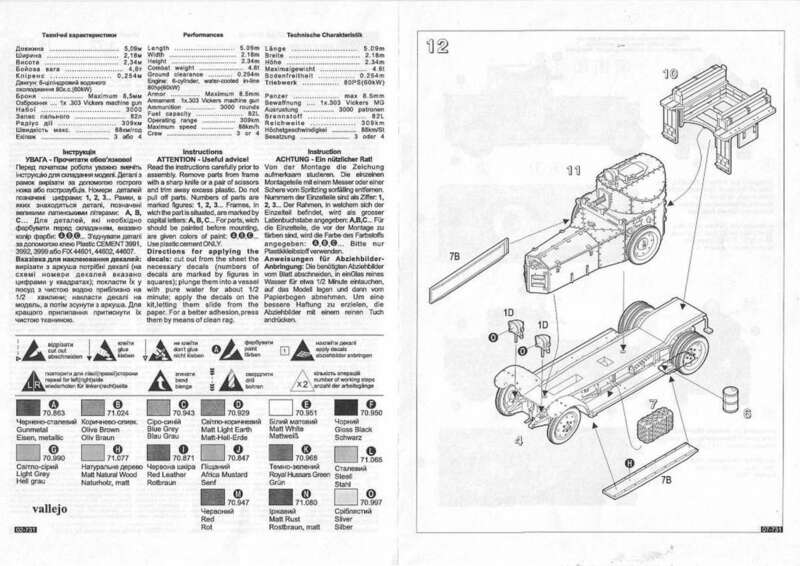 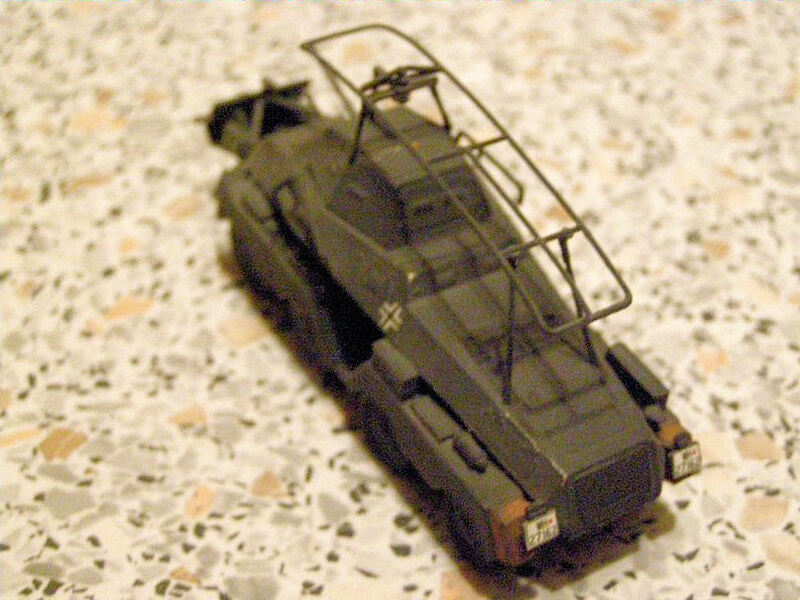 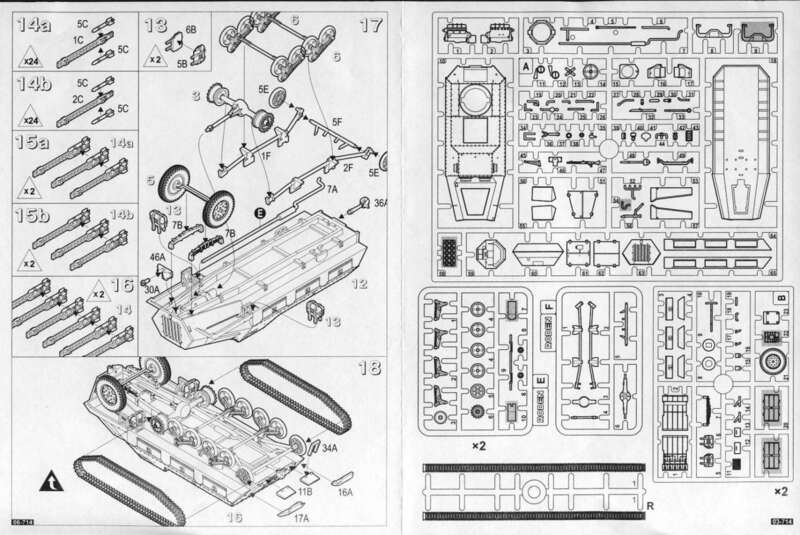 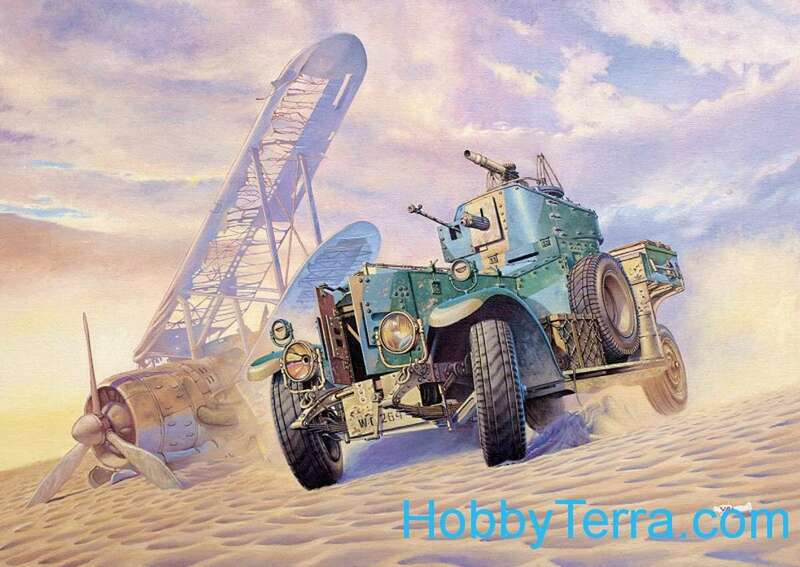 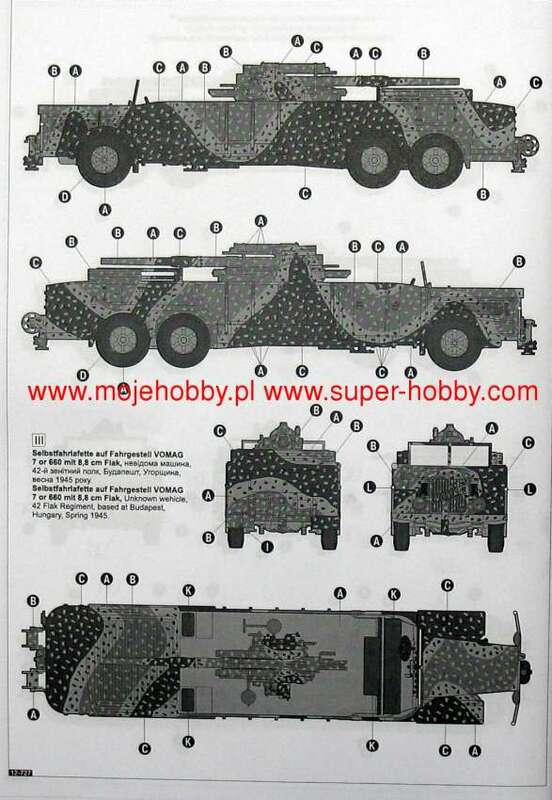 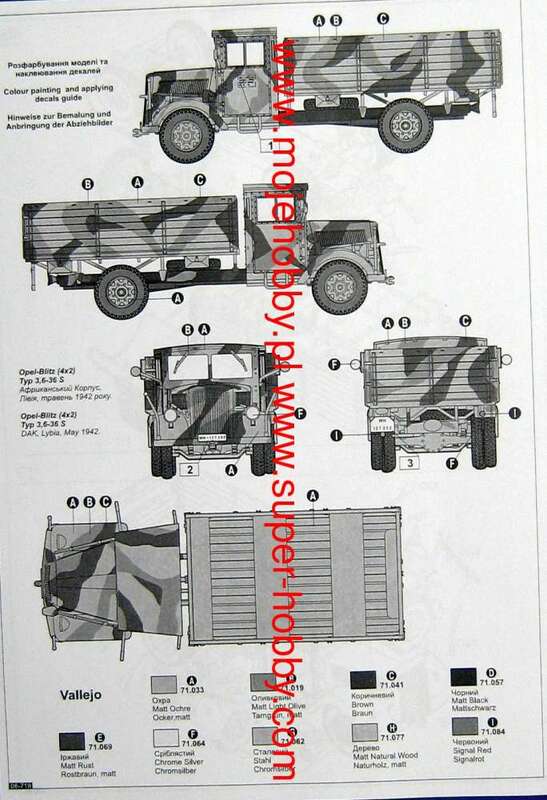 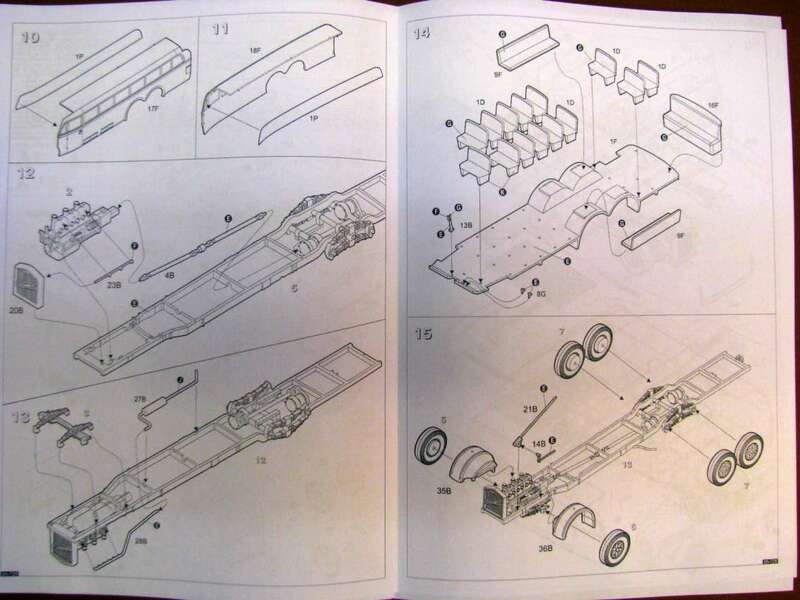 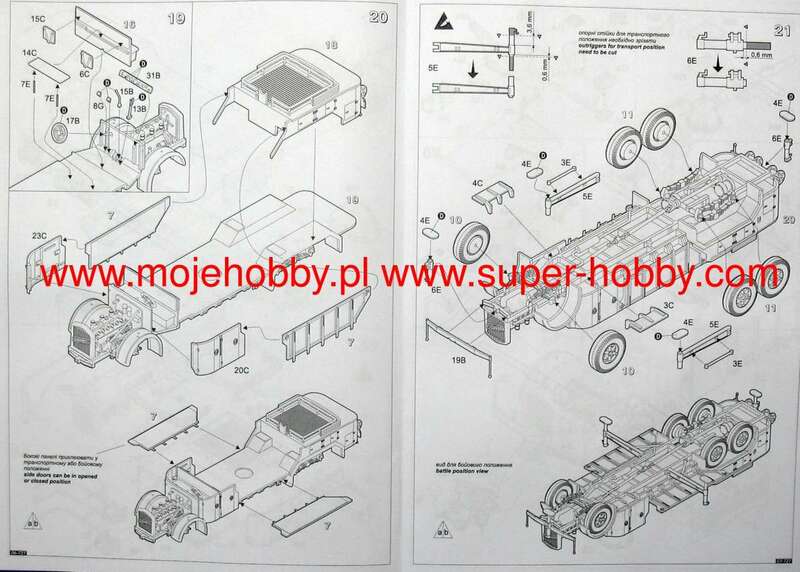 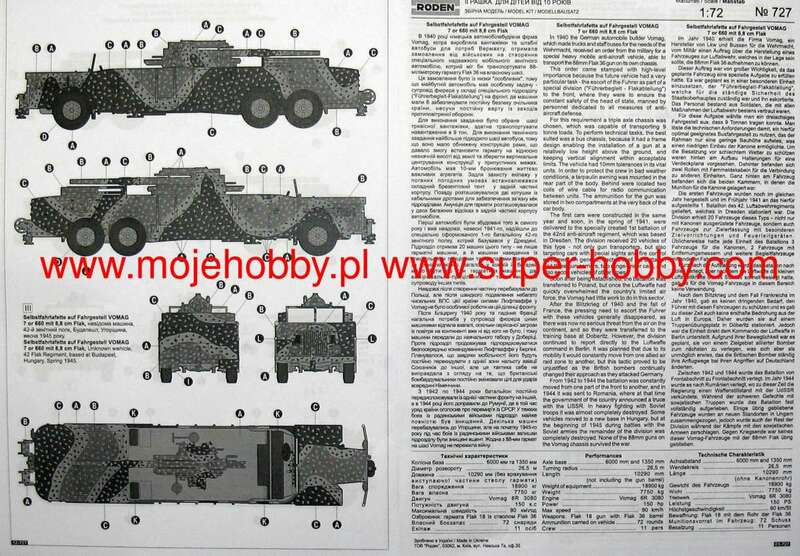 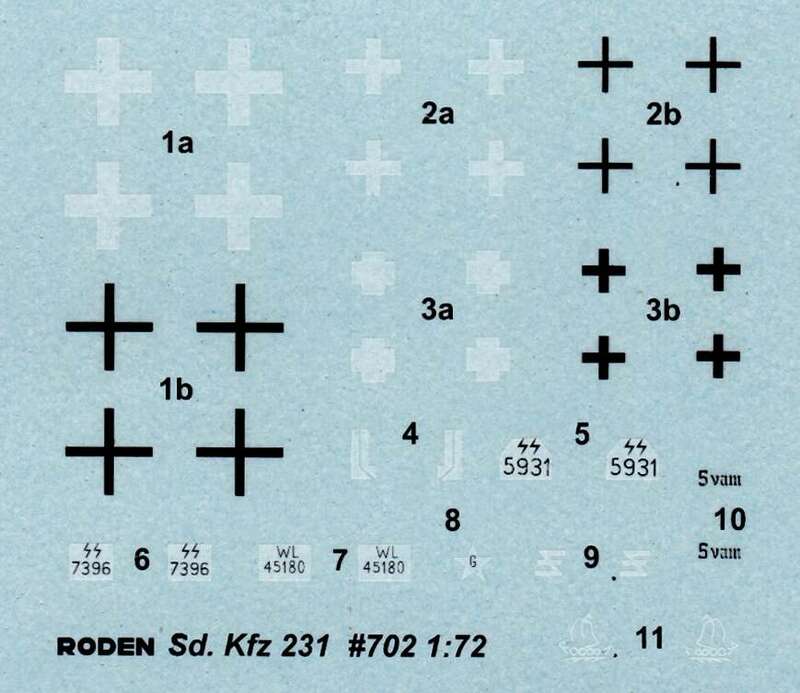 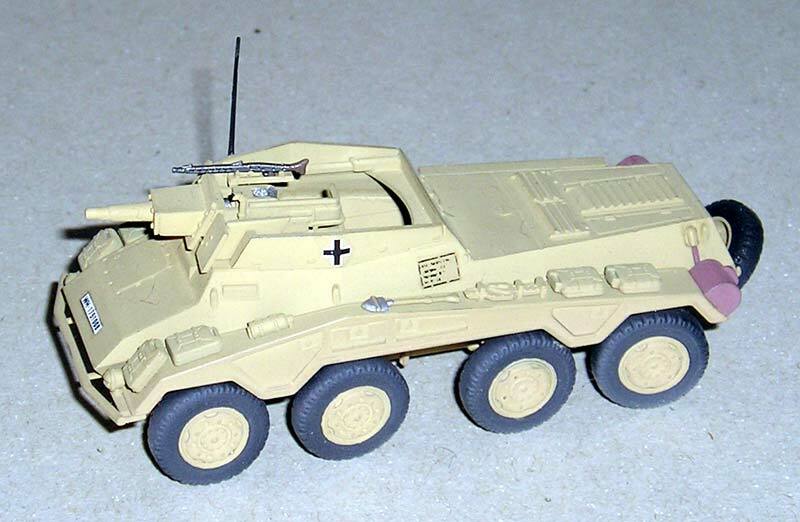 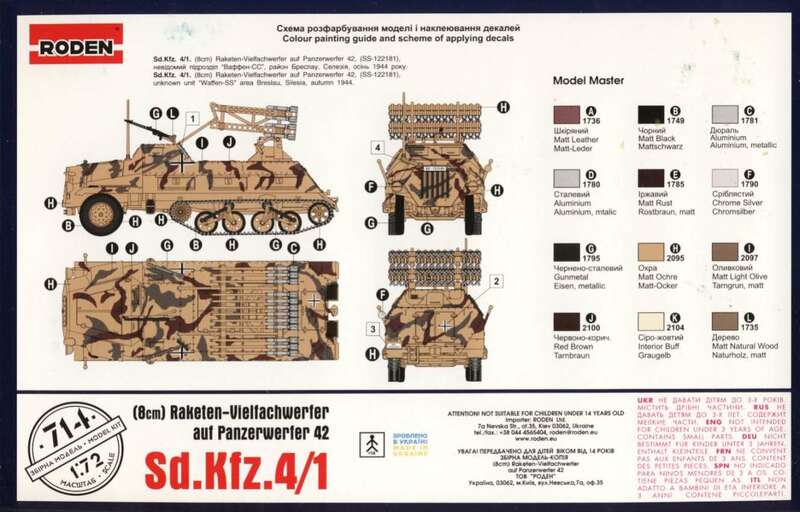 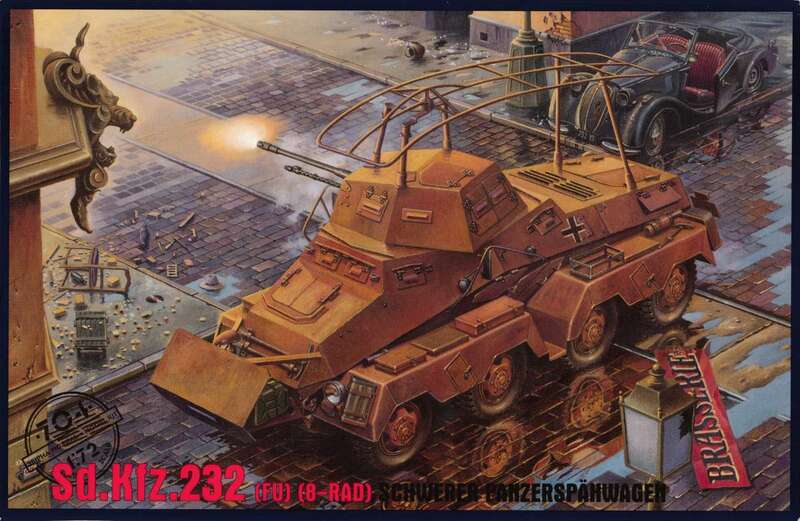 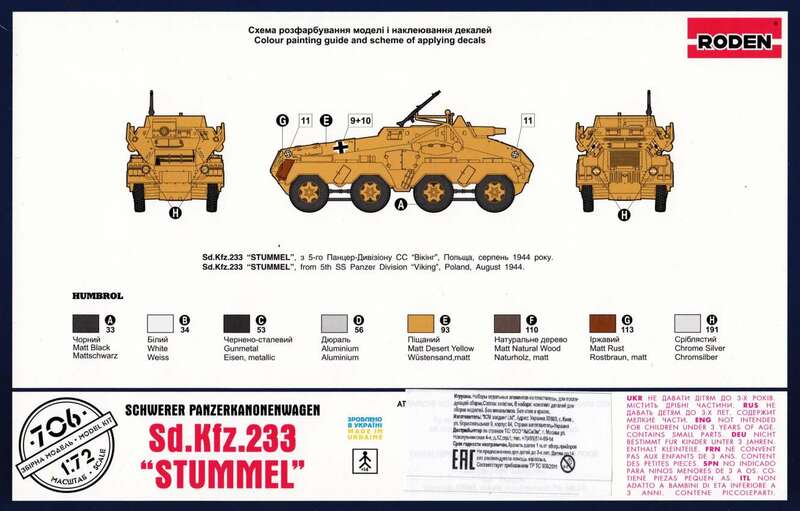 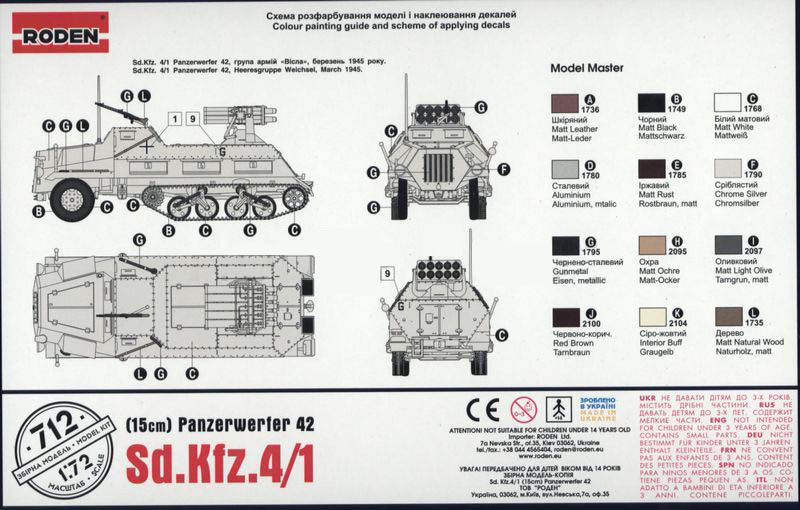 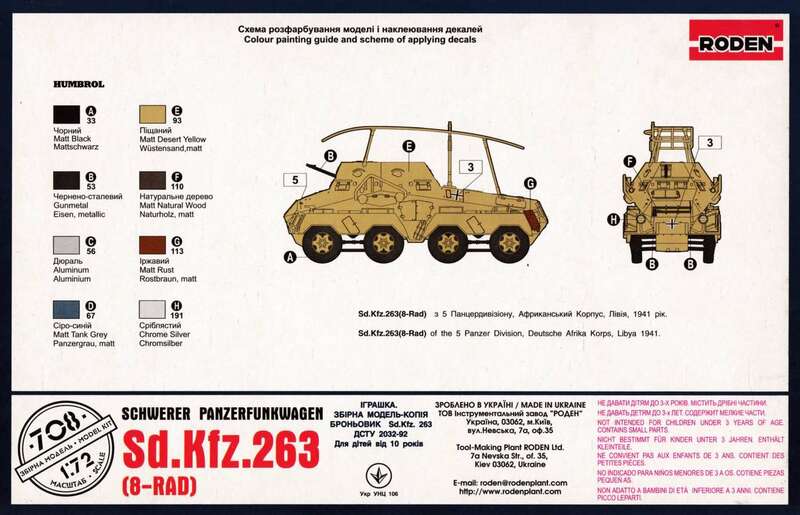 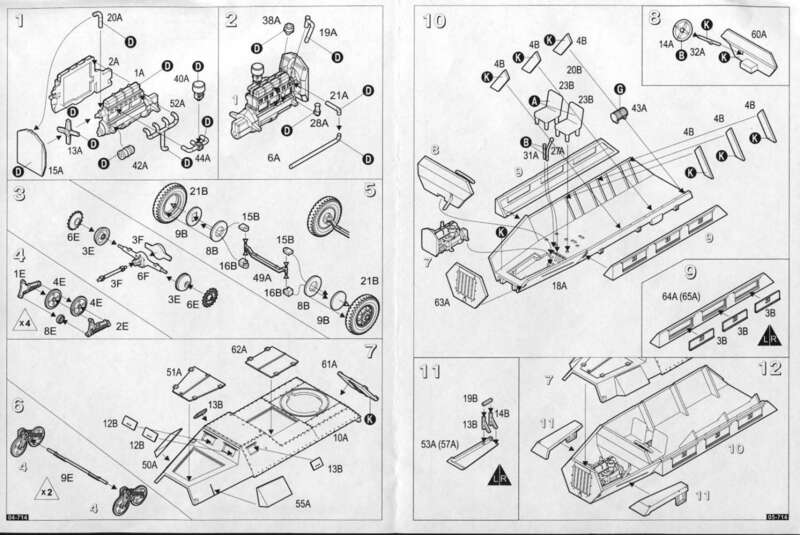 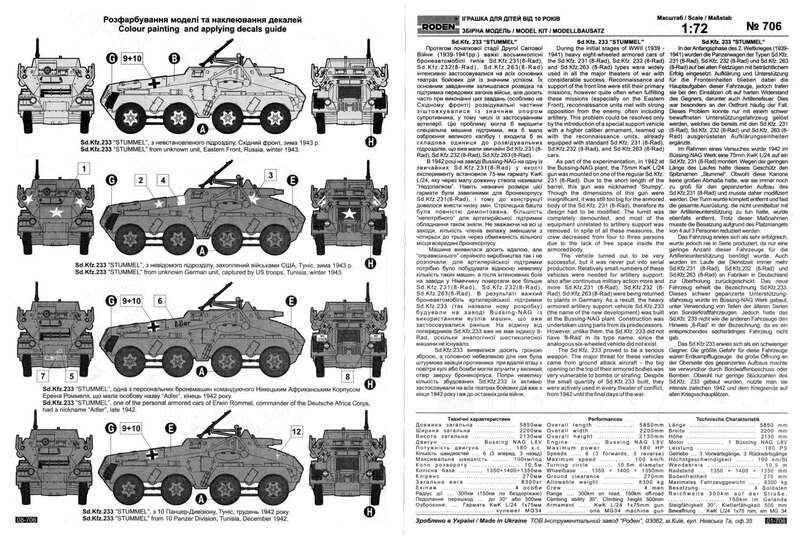 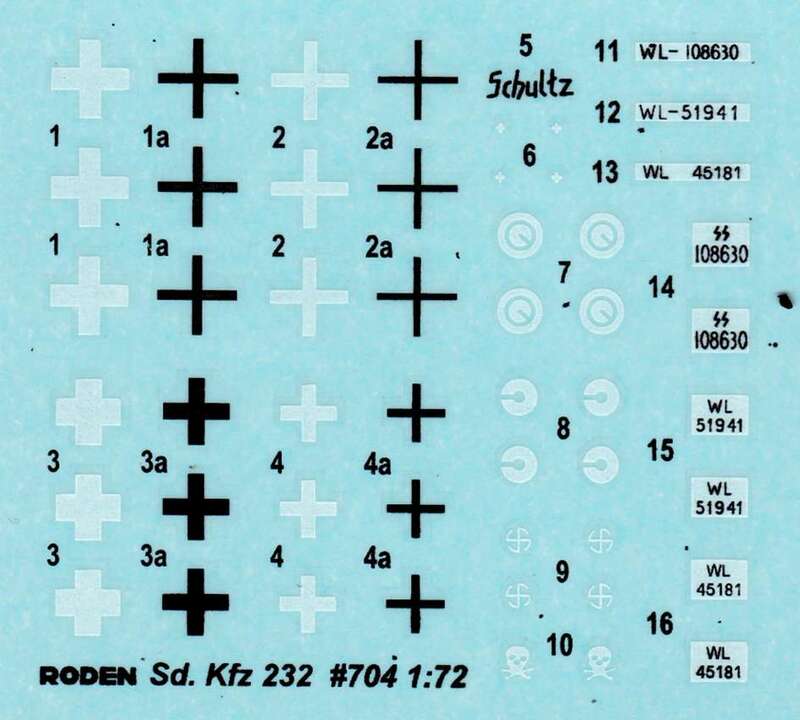 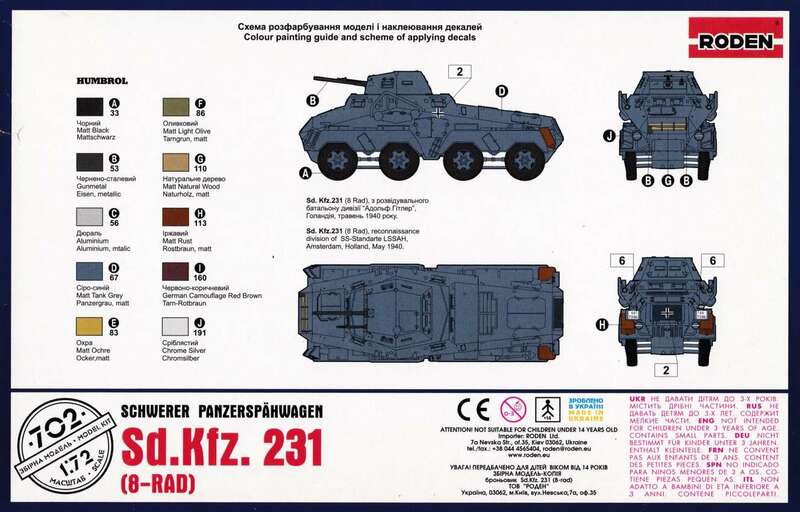 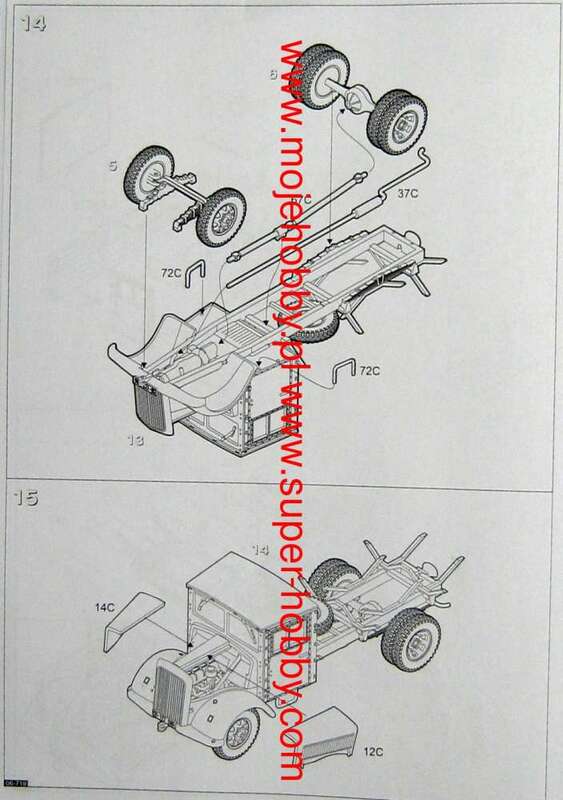 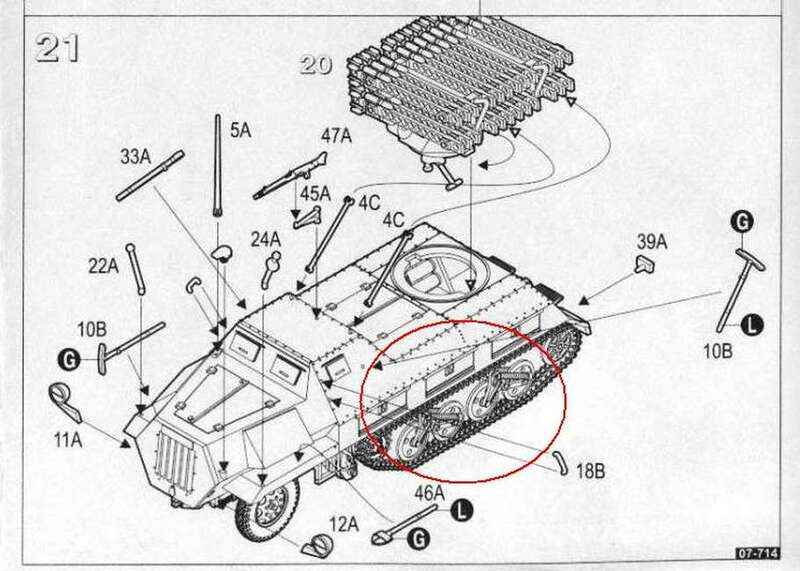 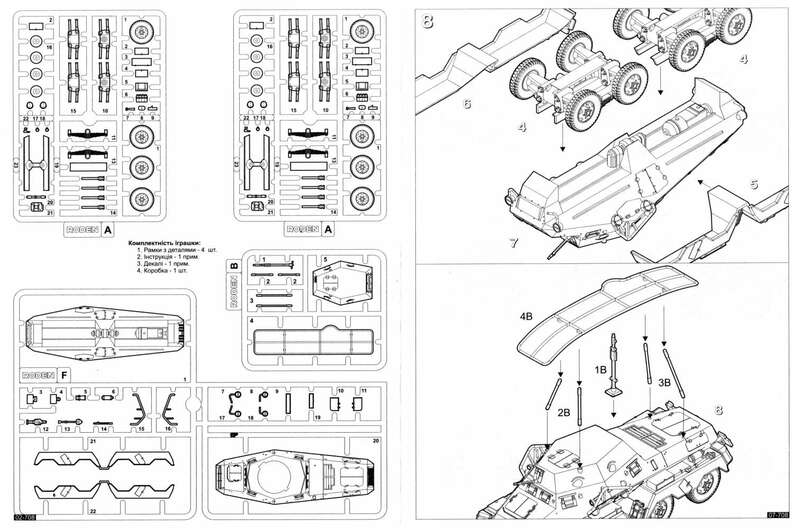 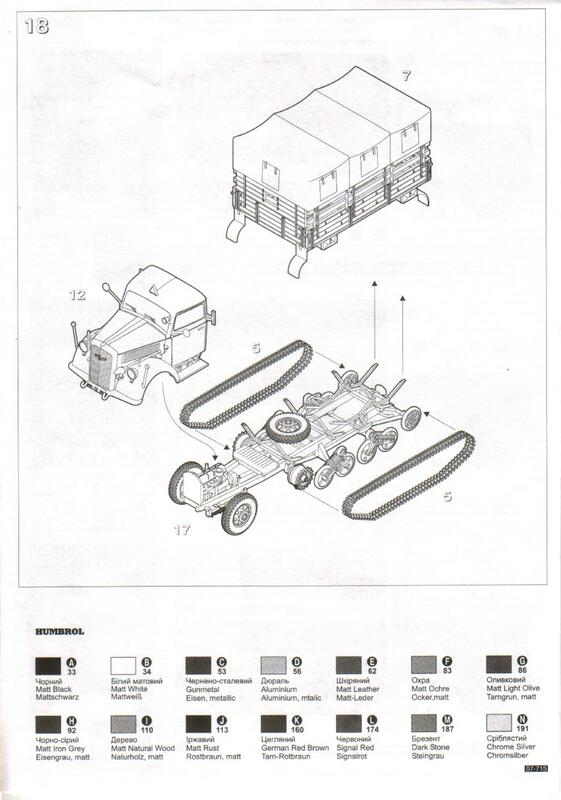 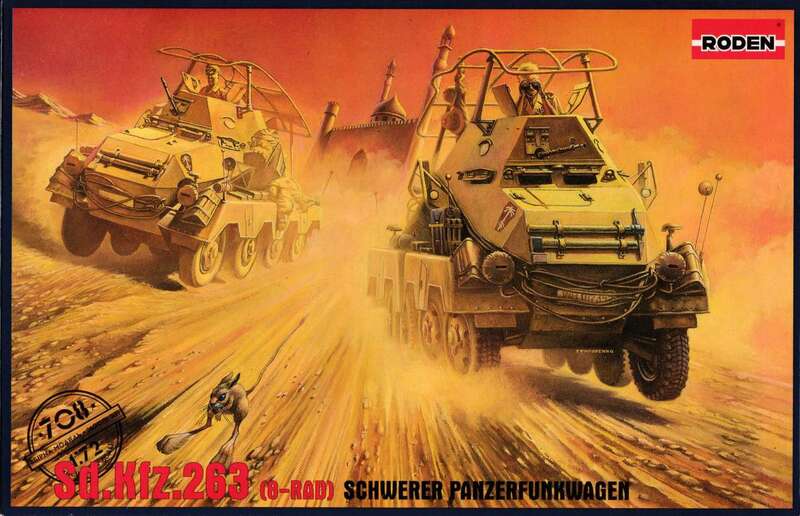 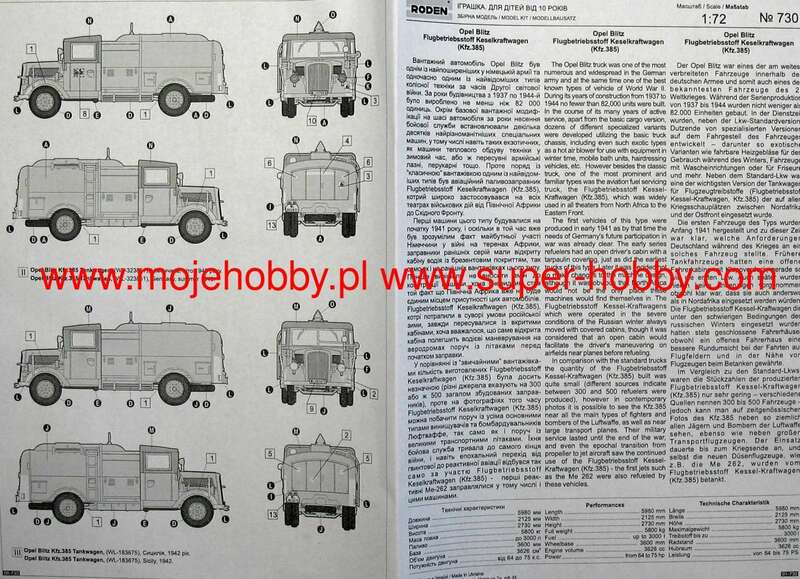 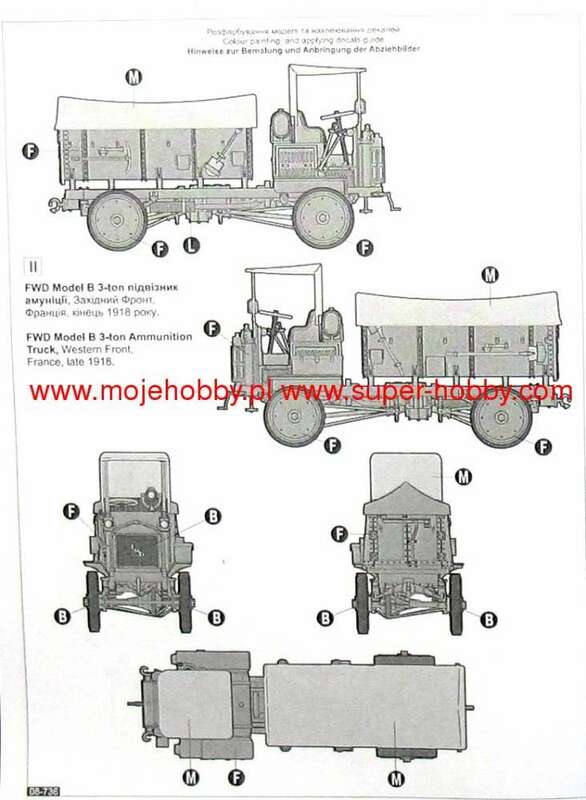 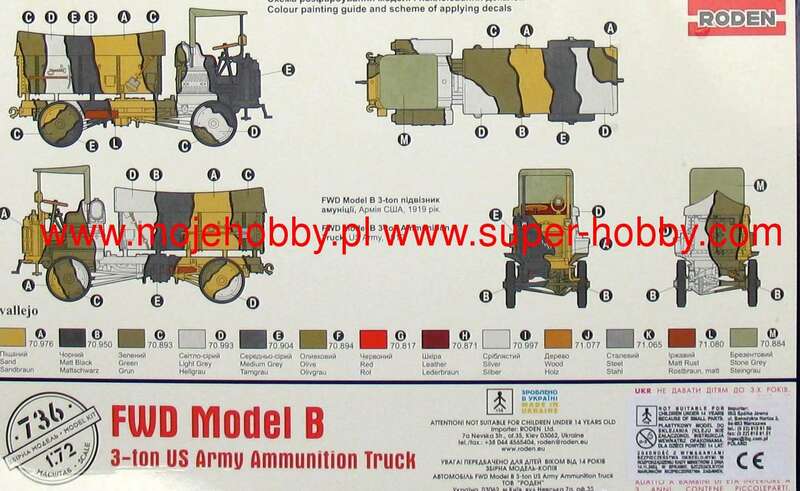 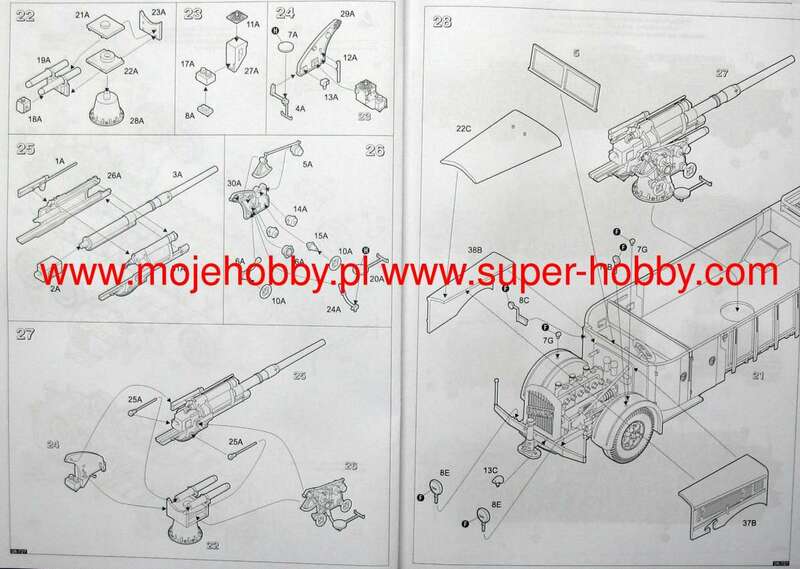 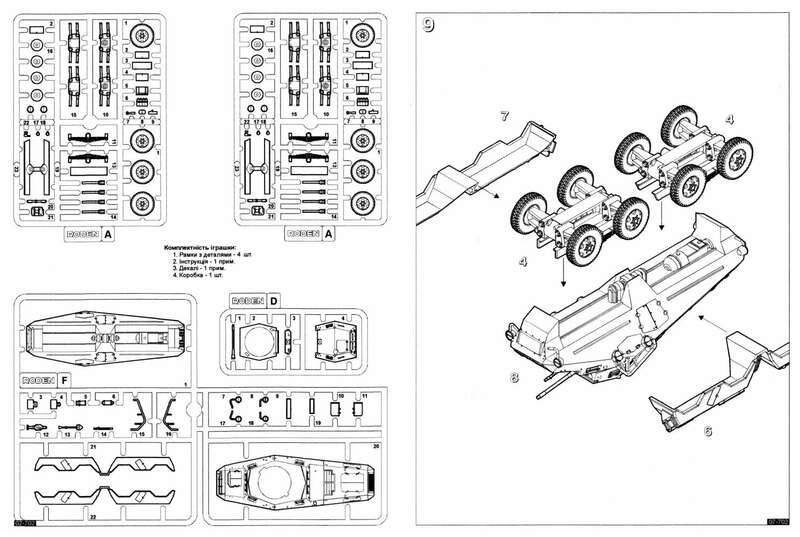 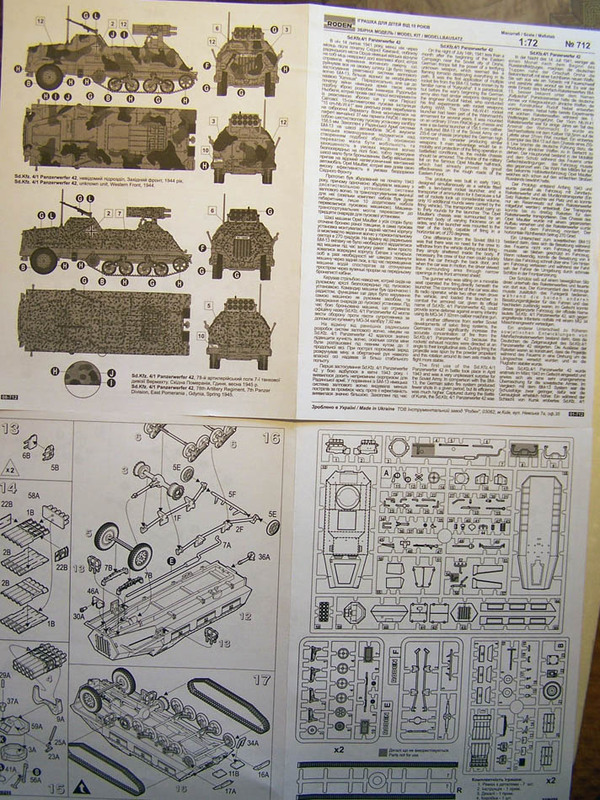 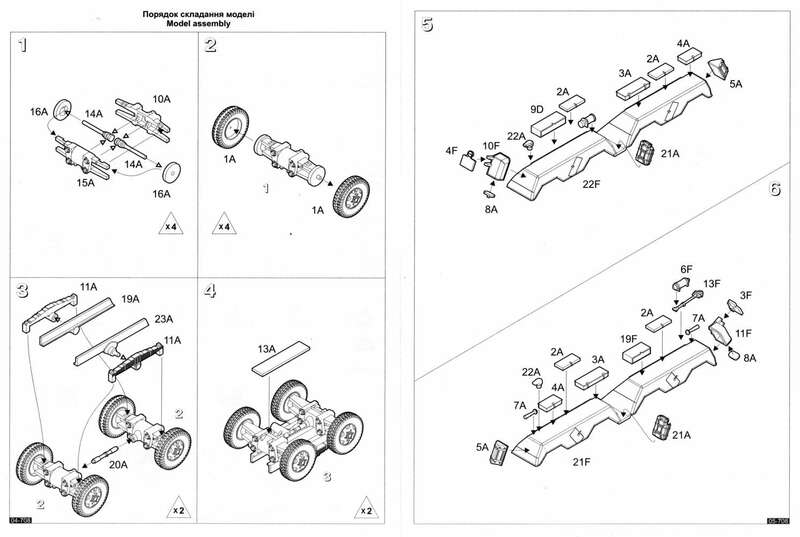 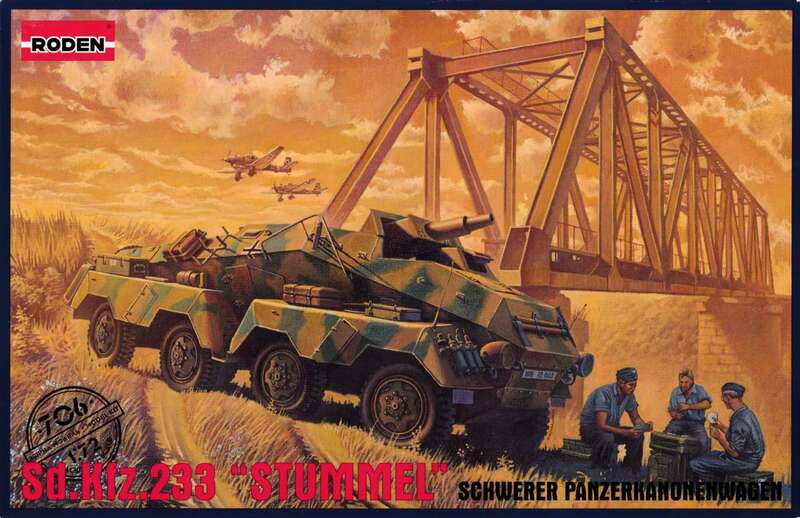 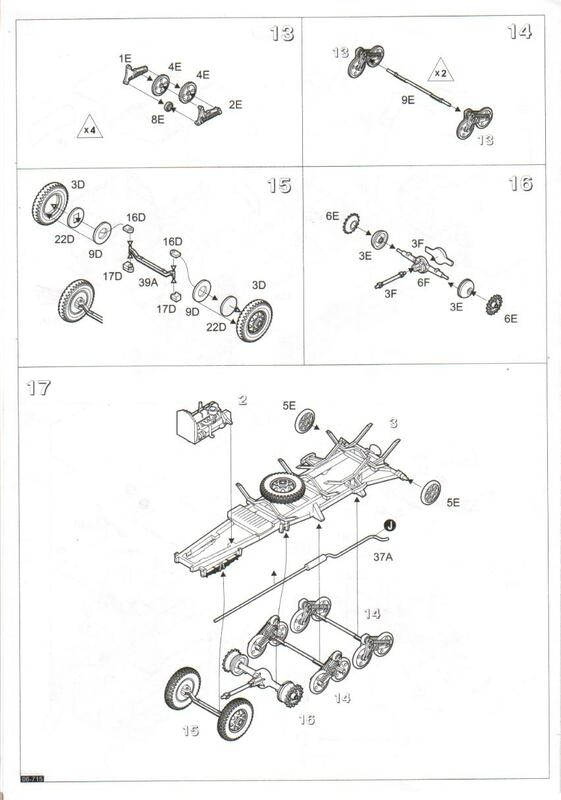 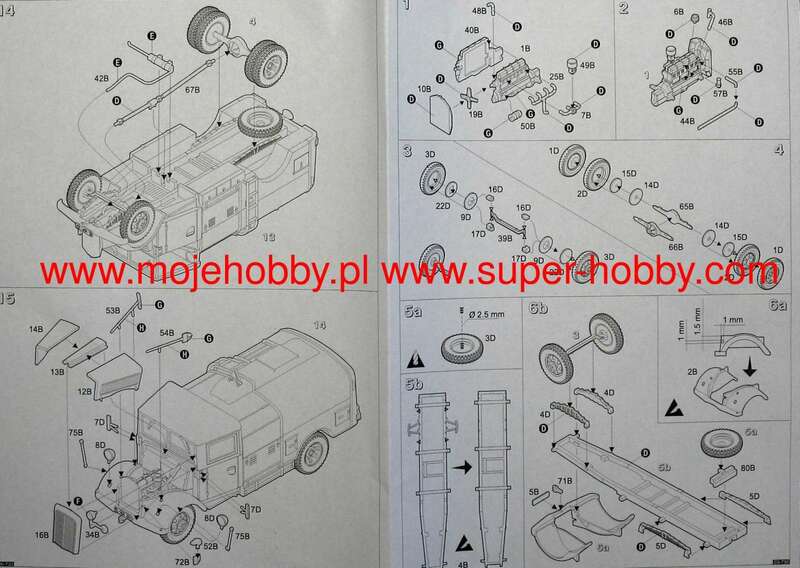 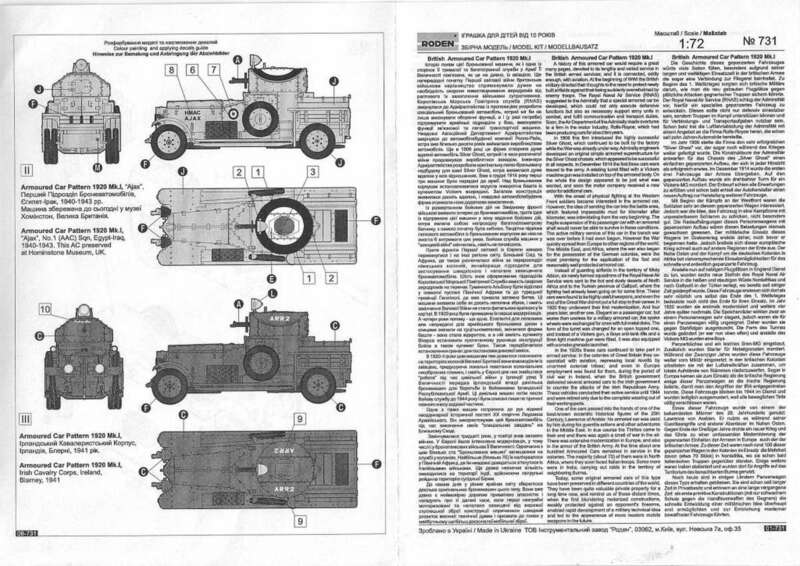 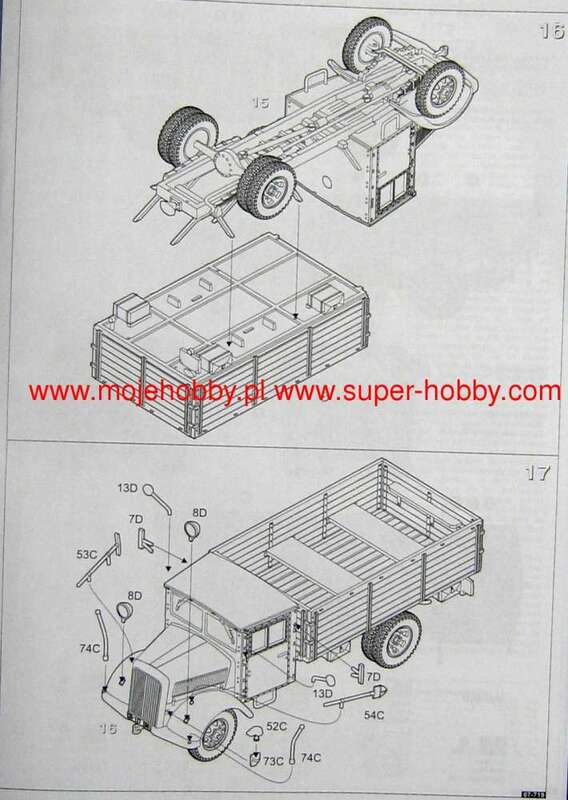 Kit 705 - SdKfz.234/2 - "Puma"
Kit 706 - SdKfz.233 "Stummel"
Most of the parts from all 8-wheelers are the same as from the 231 or 234. 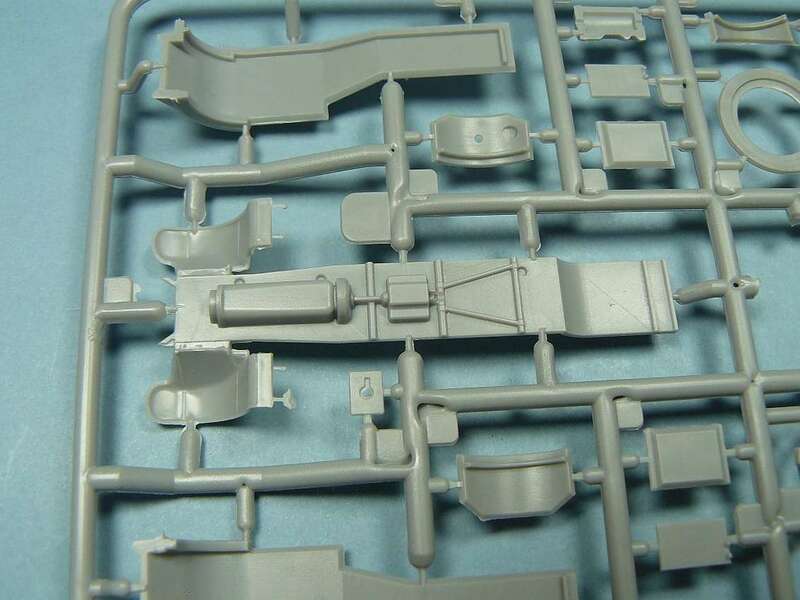 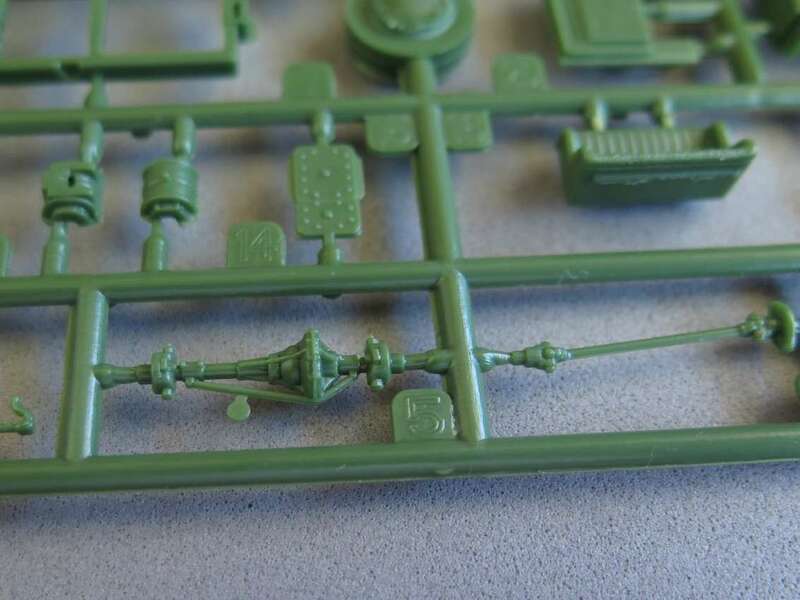 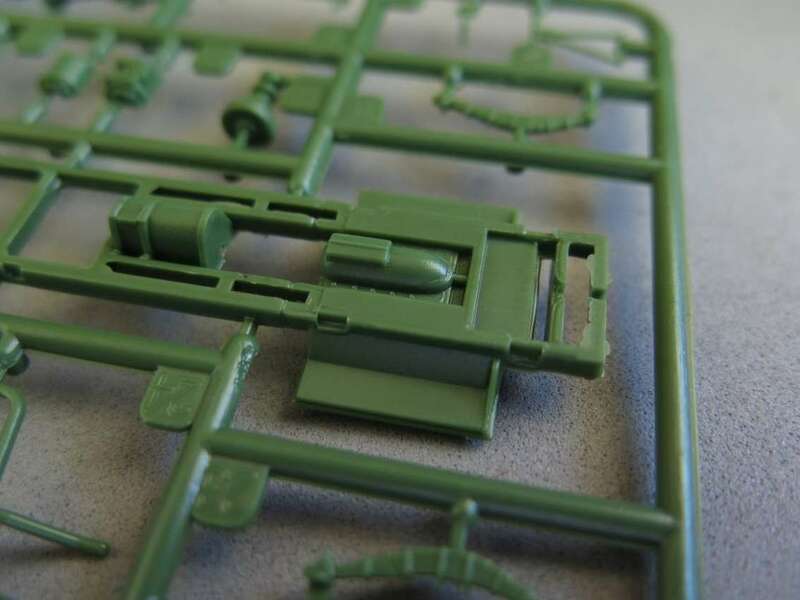 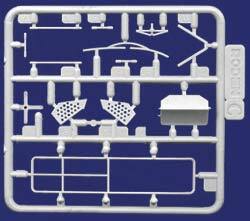 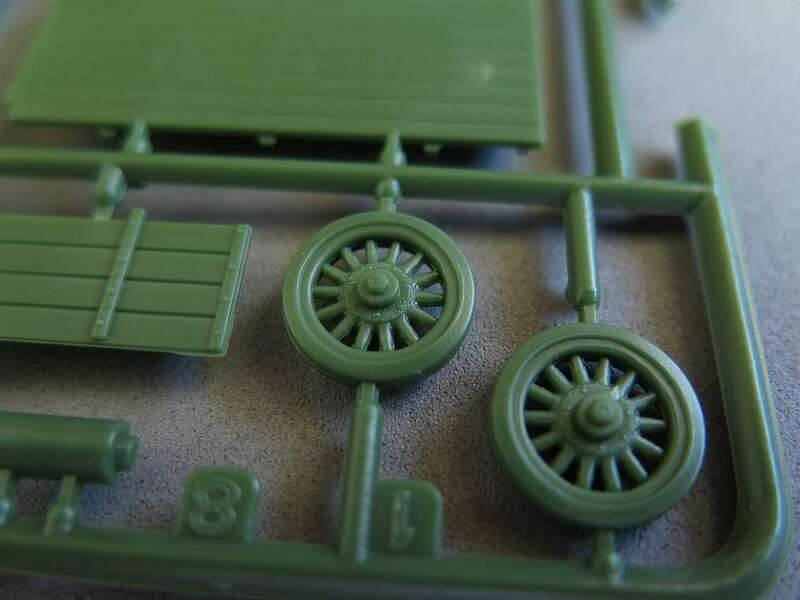 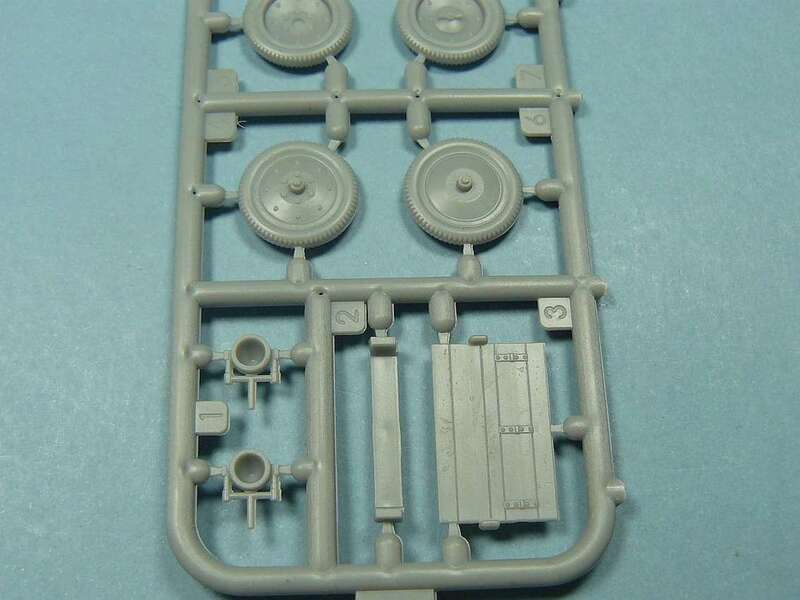 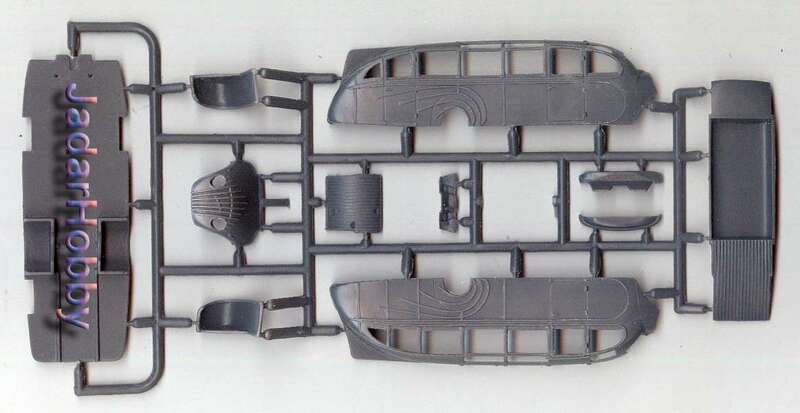 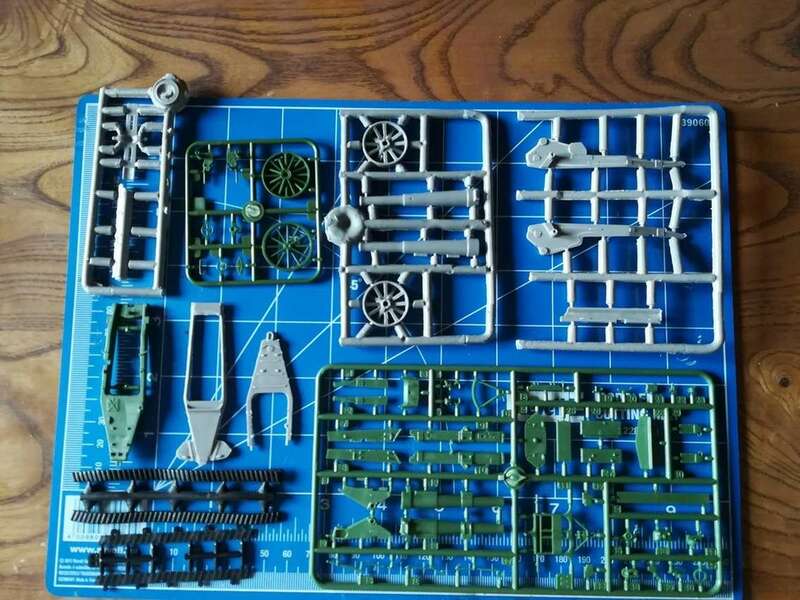 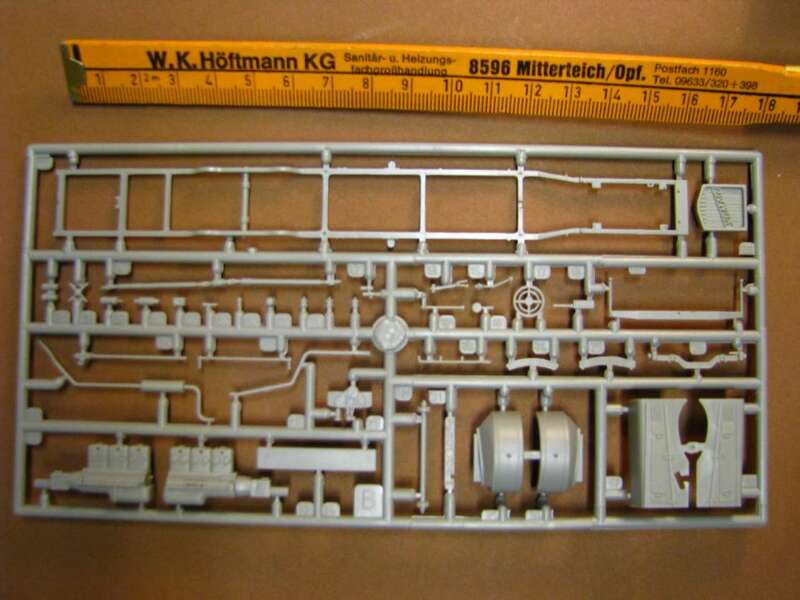 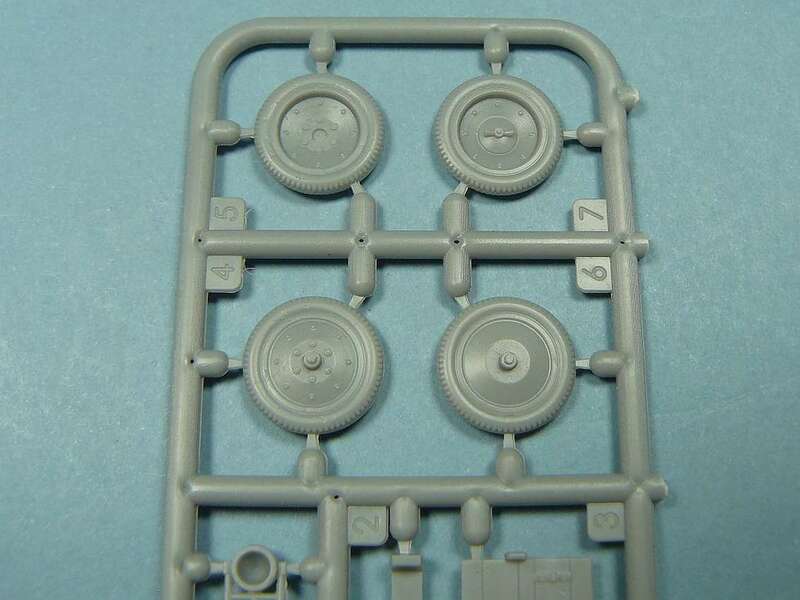 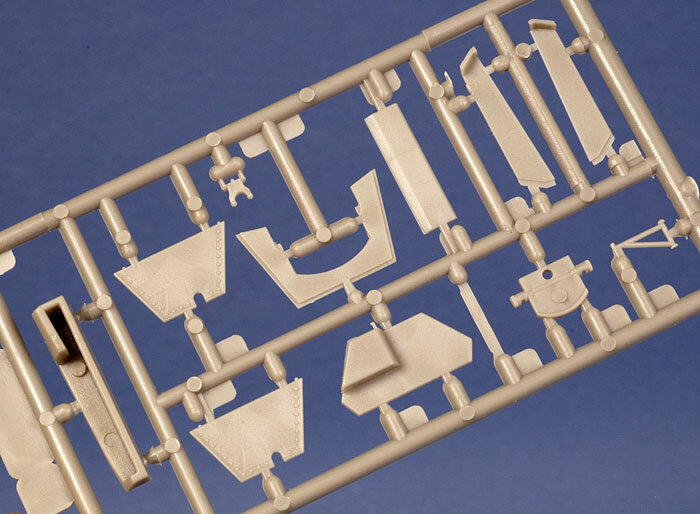 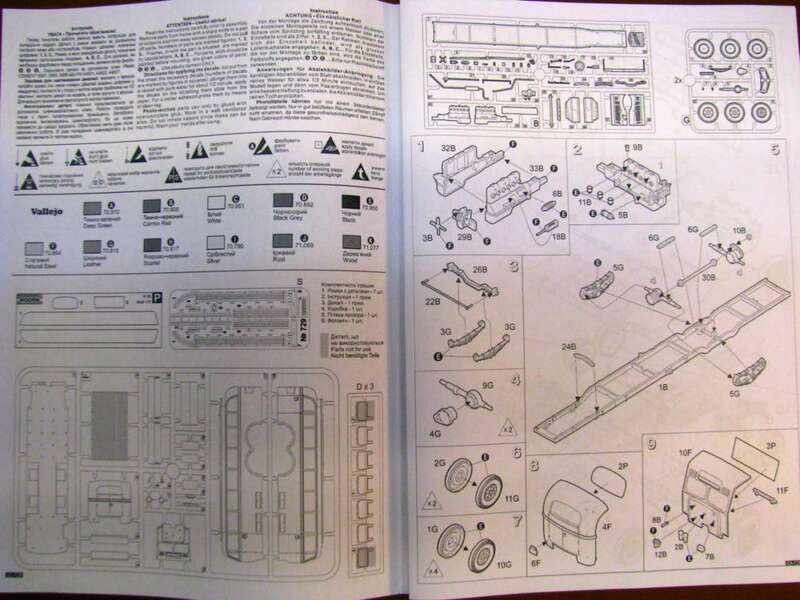 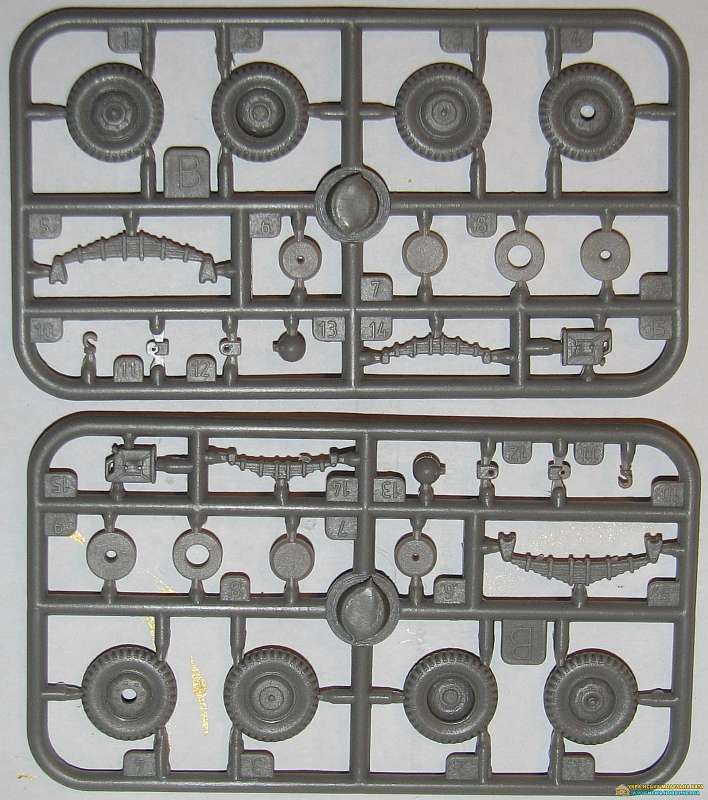 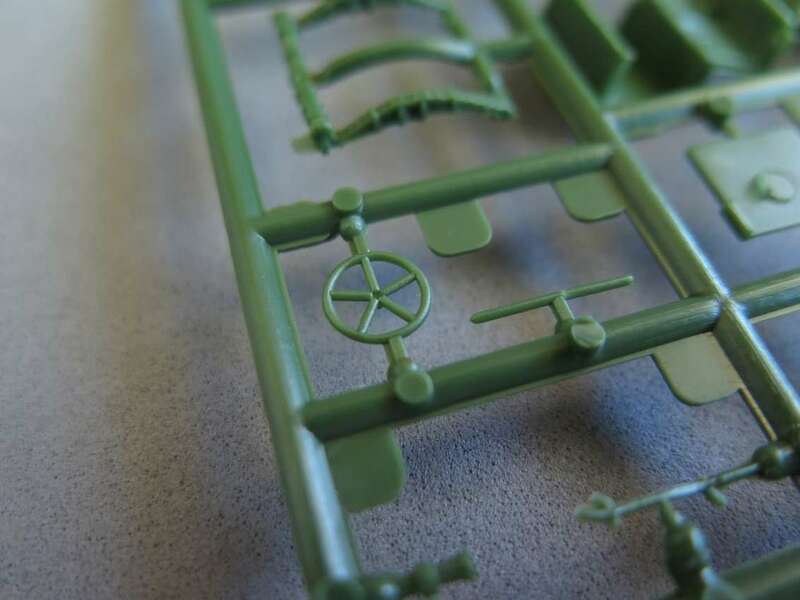 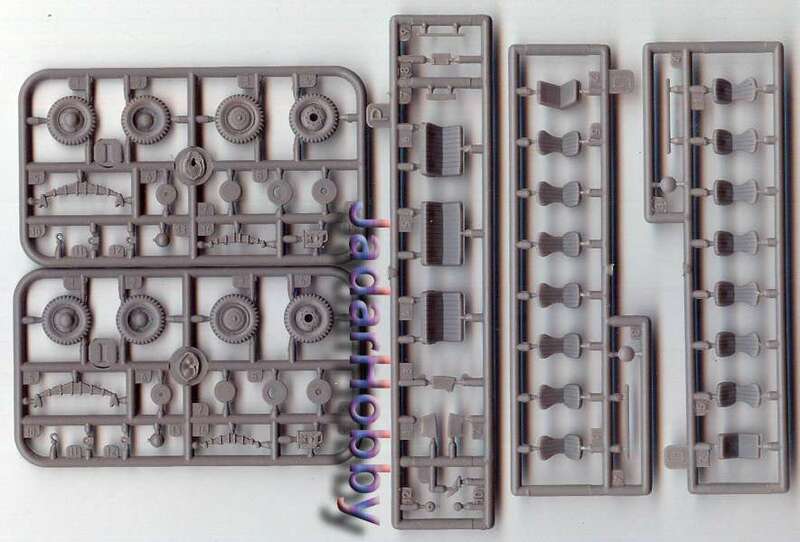 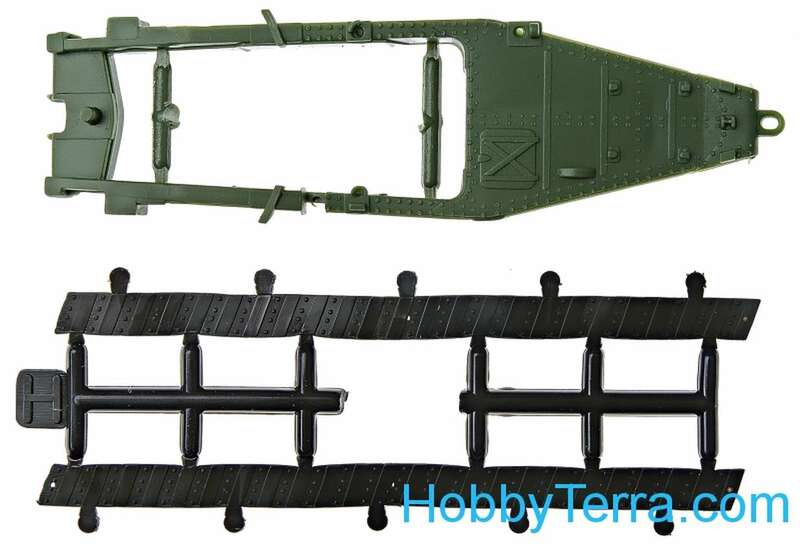 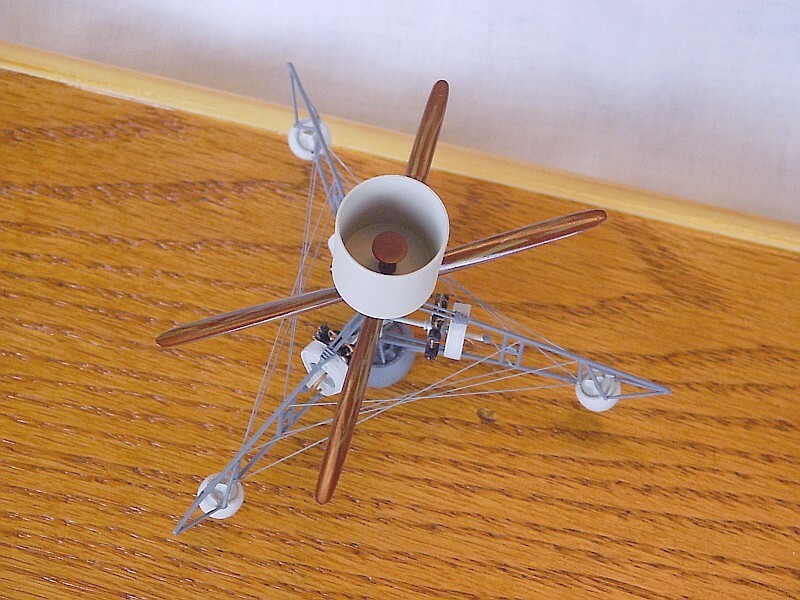 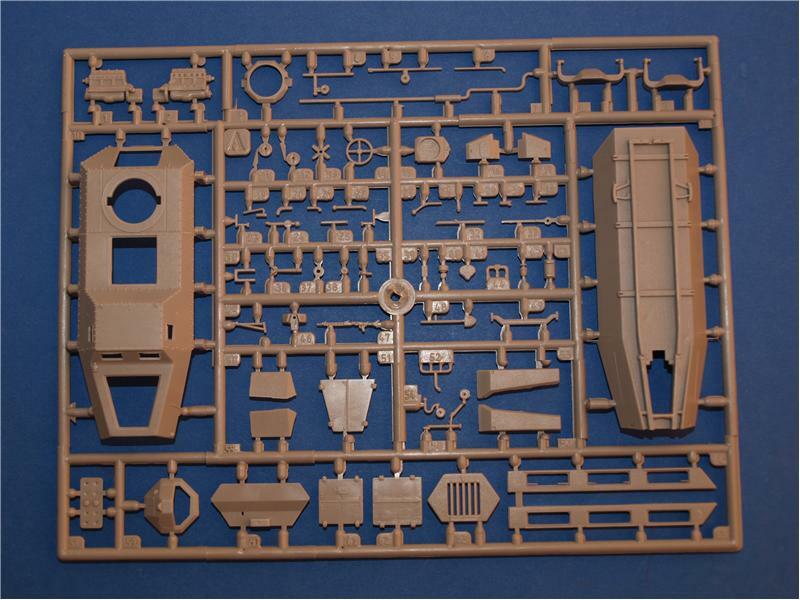 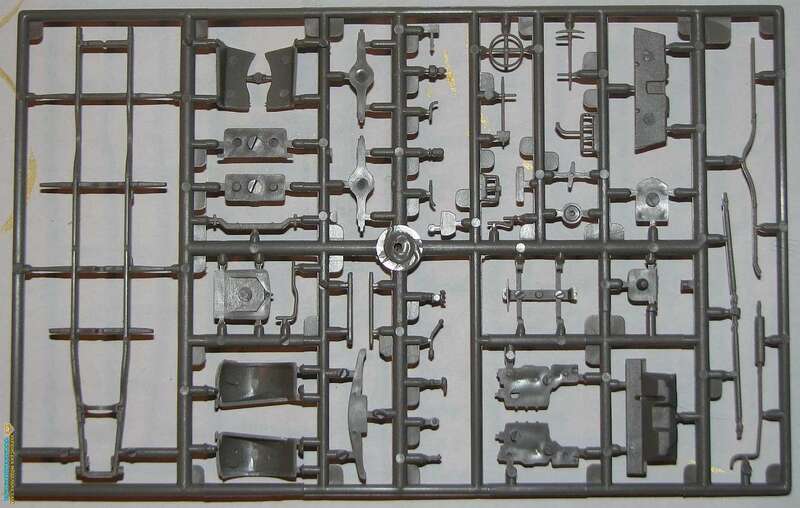 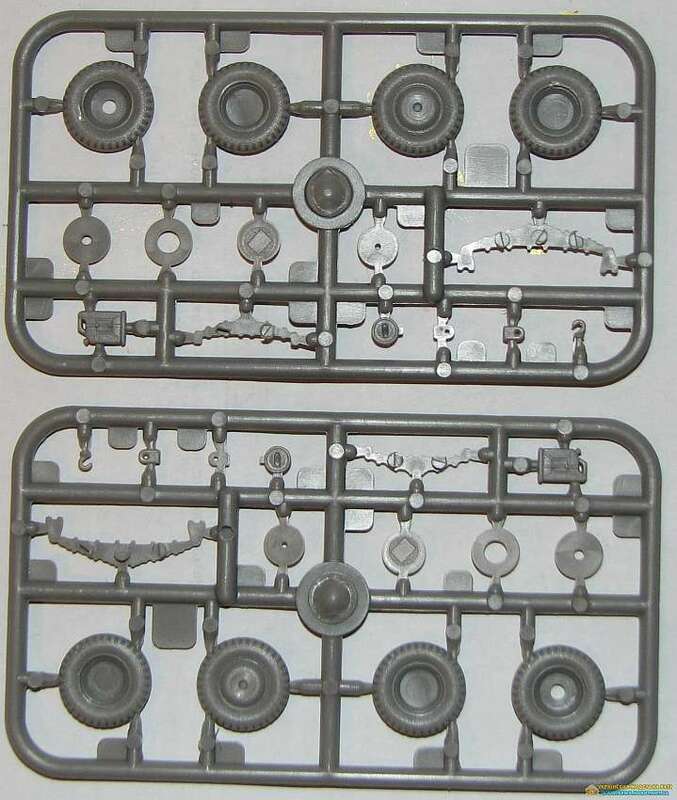 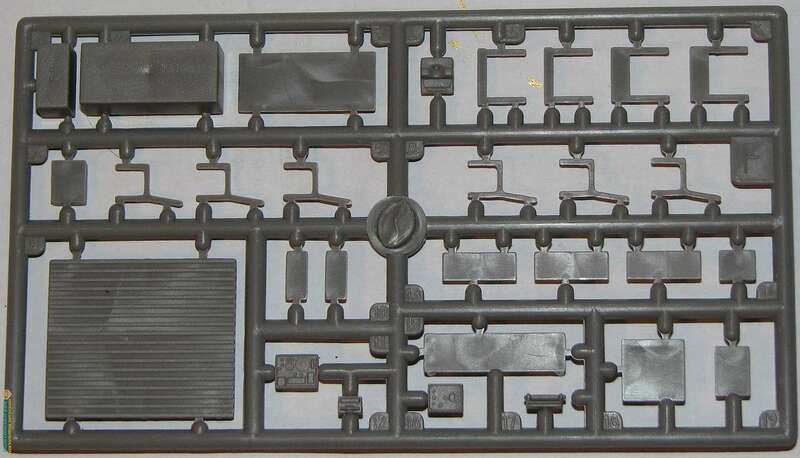 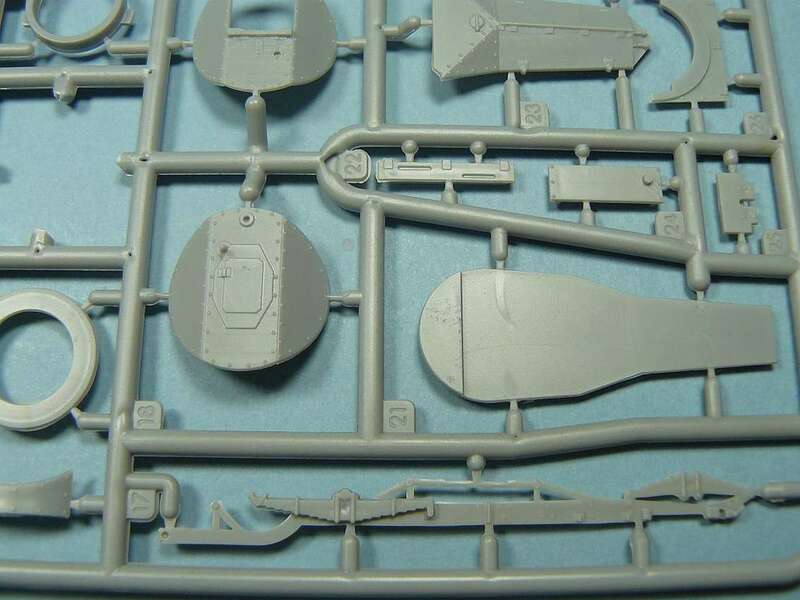 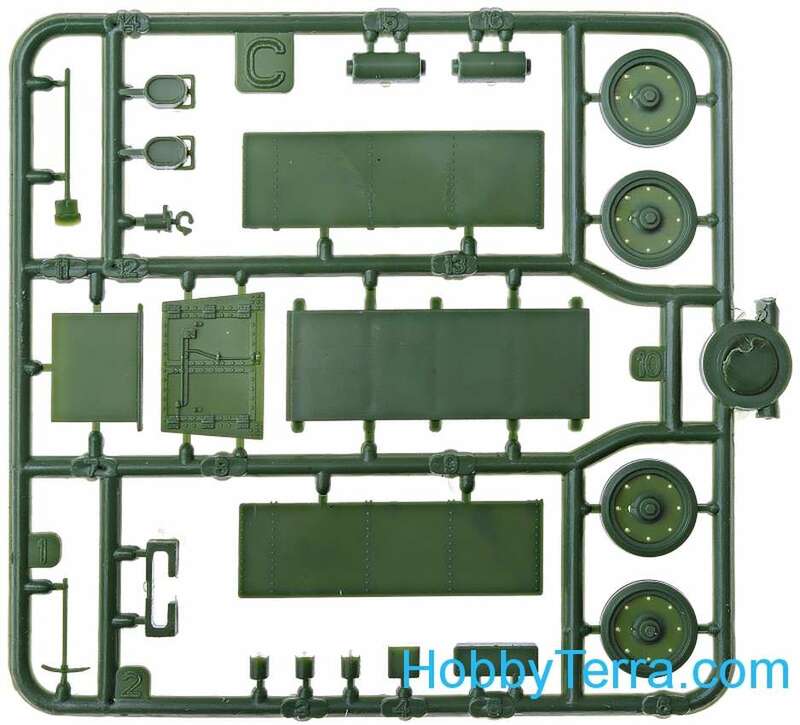 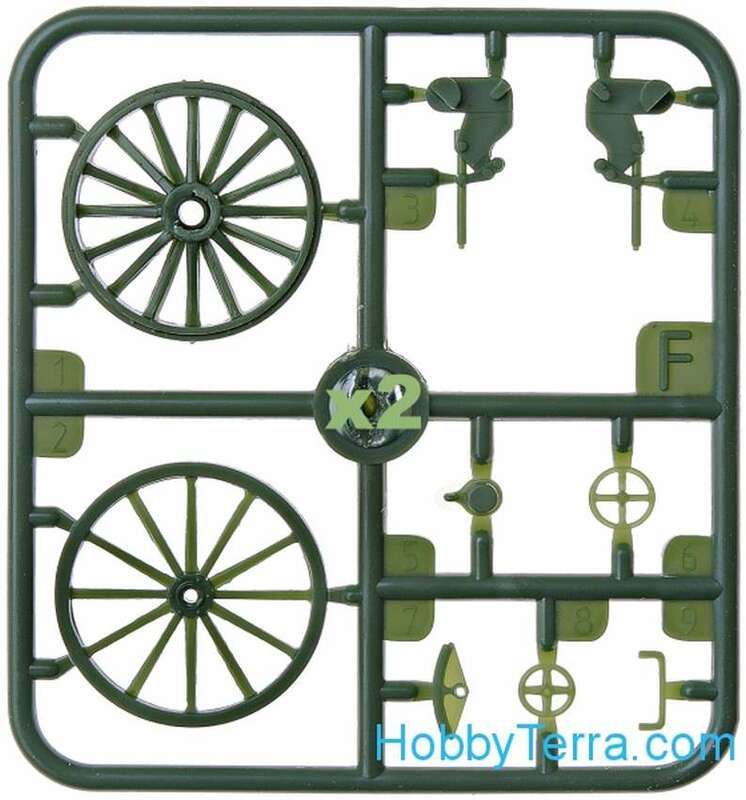 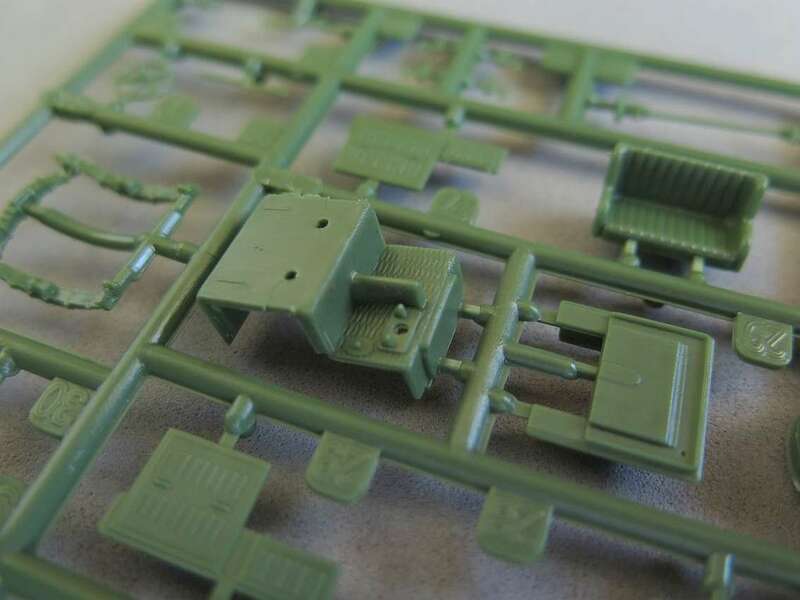 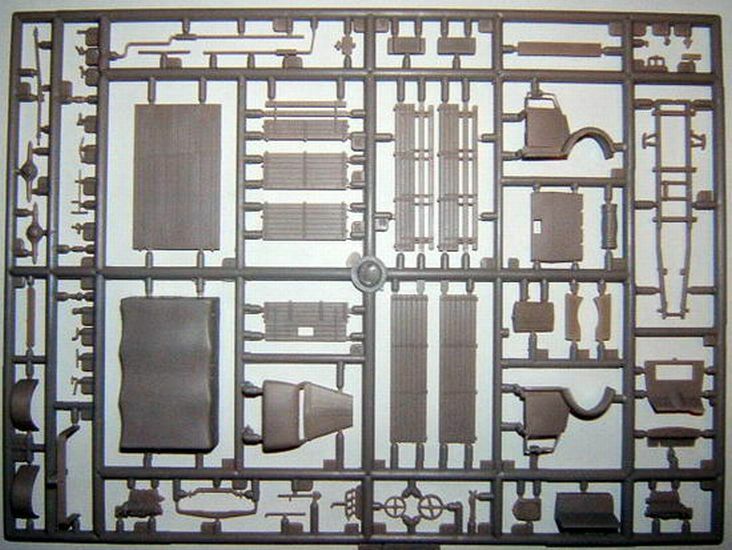 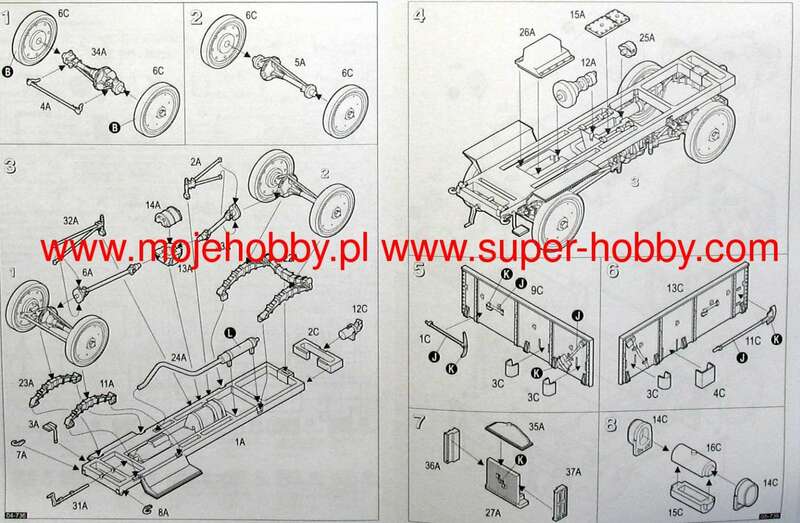 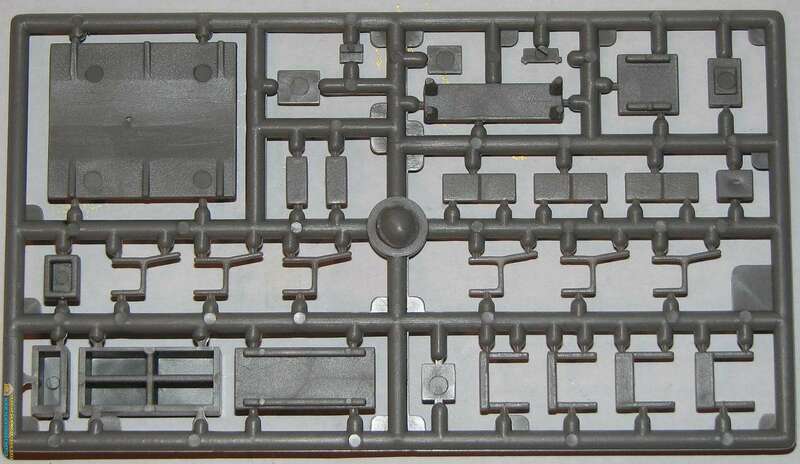 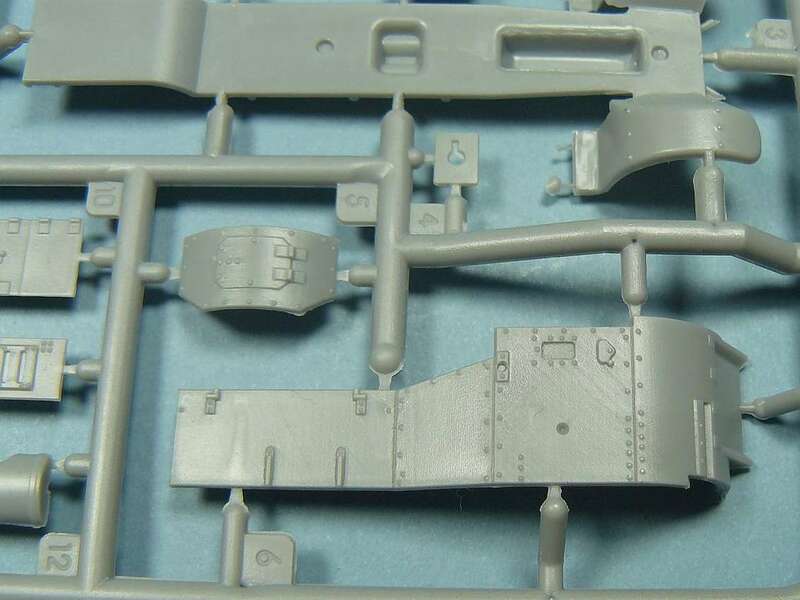 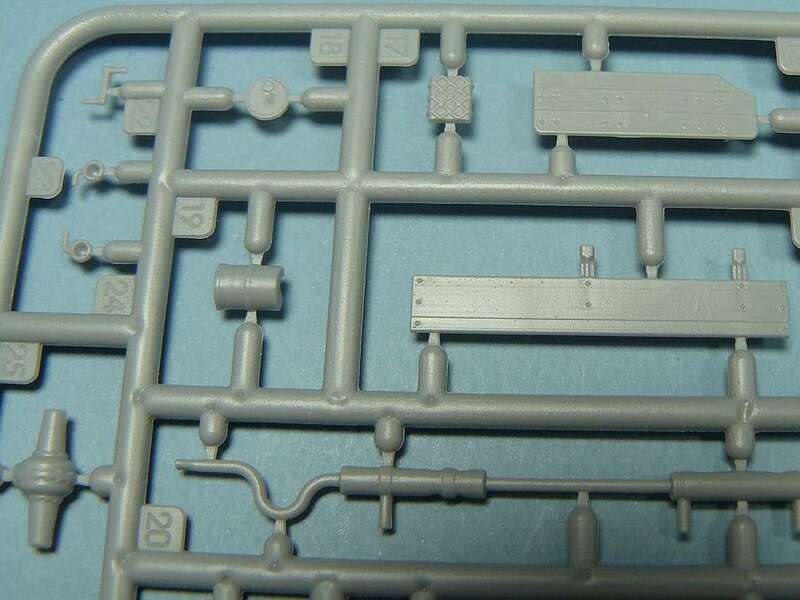 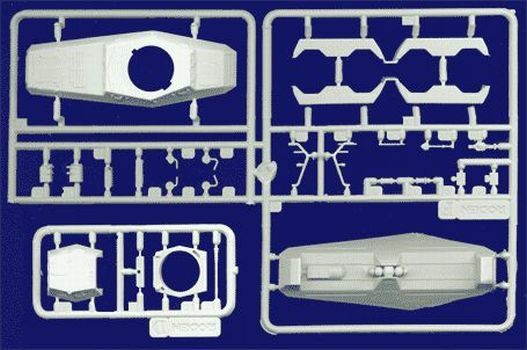 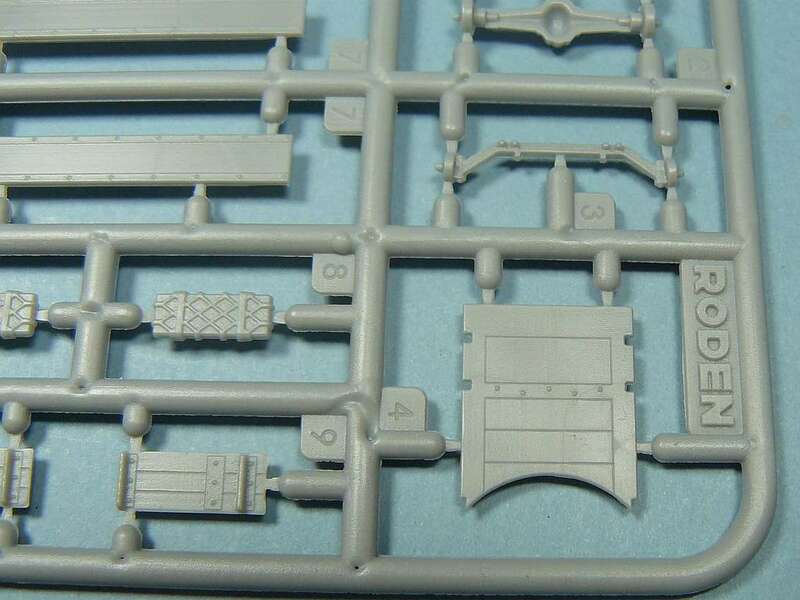 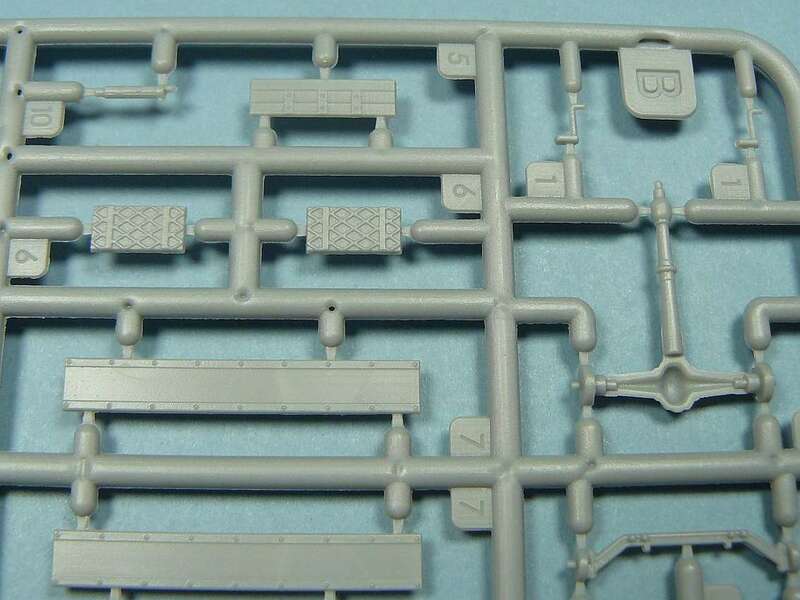 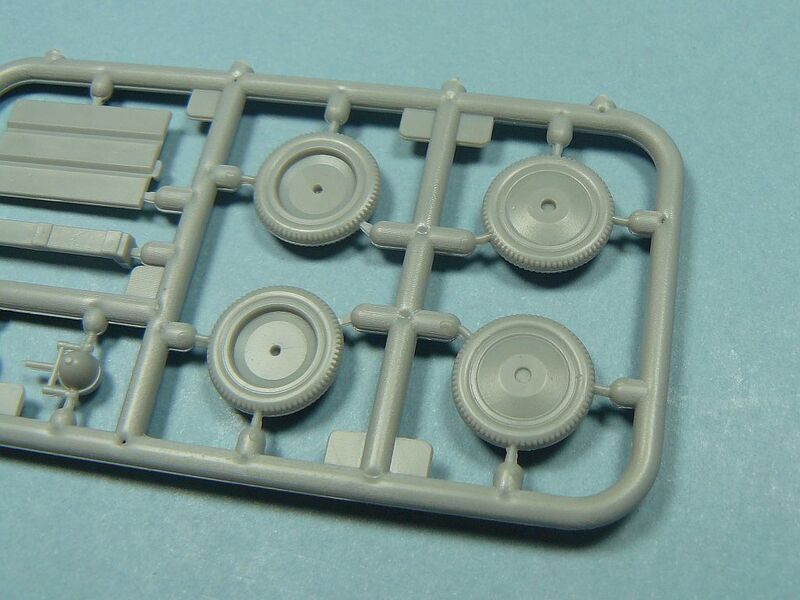 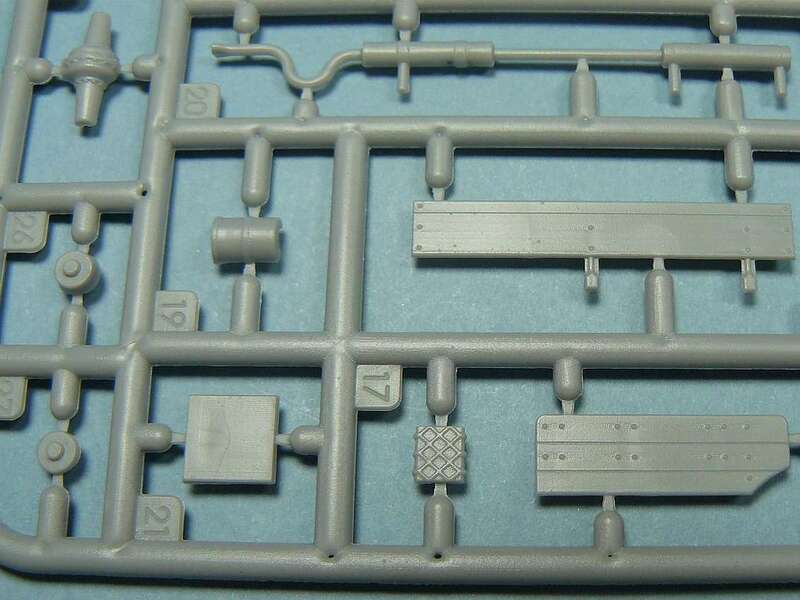 The main hull sprue, as well as the wheel sprues are the same. 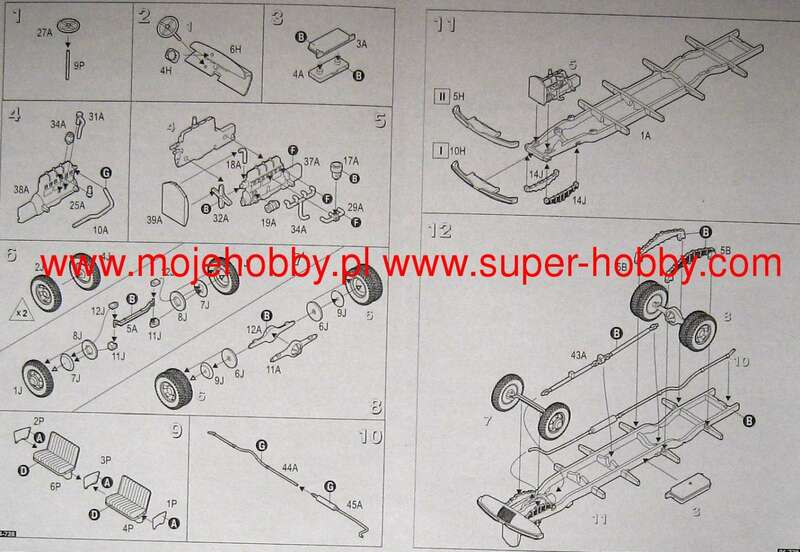 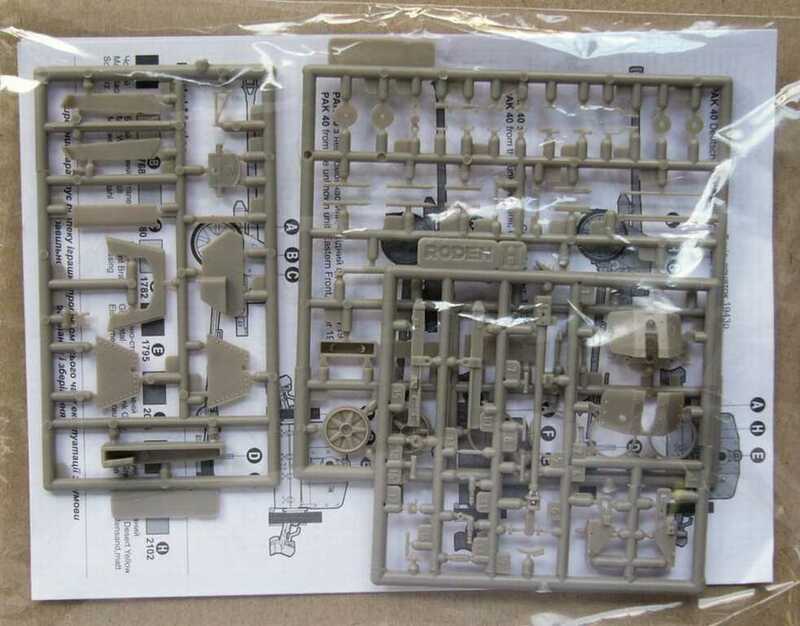 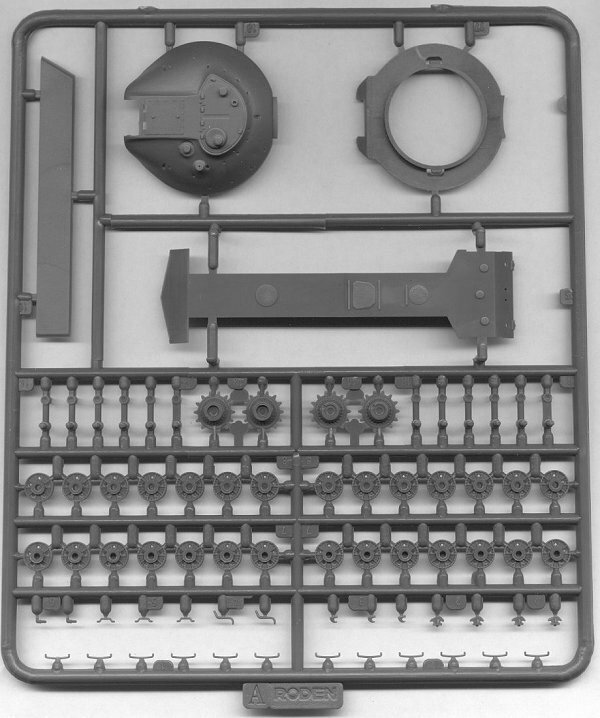 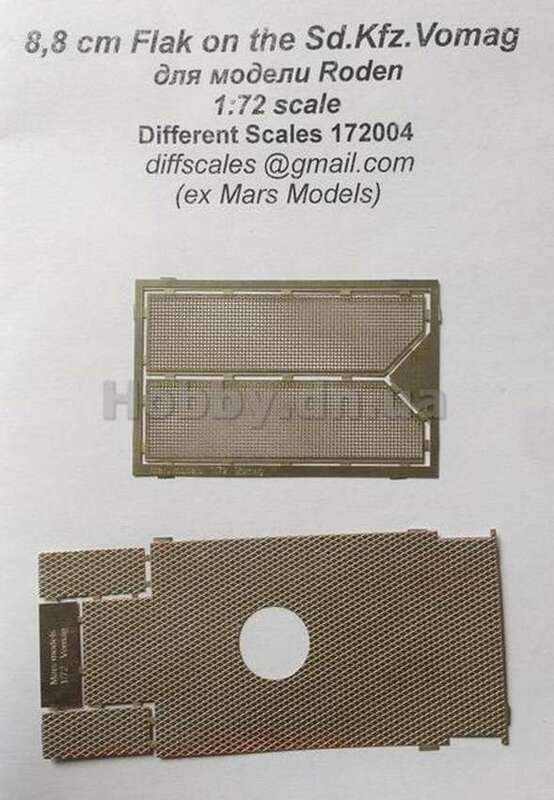 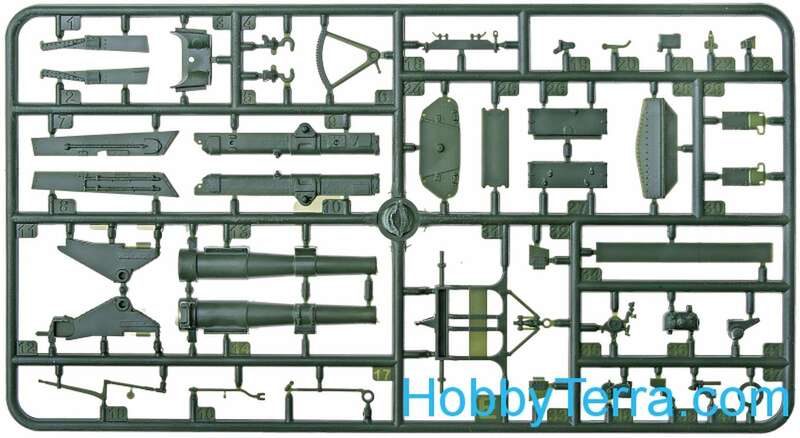 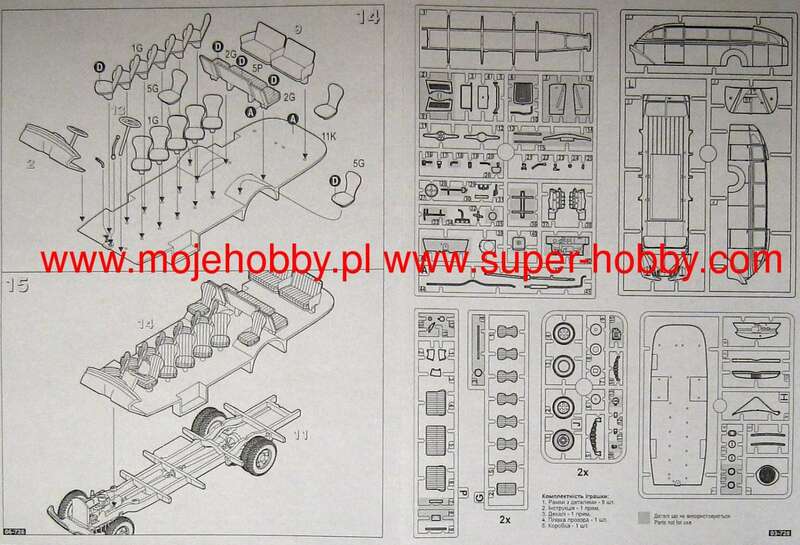 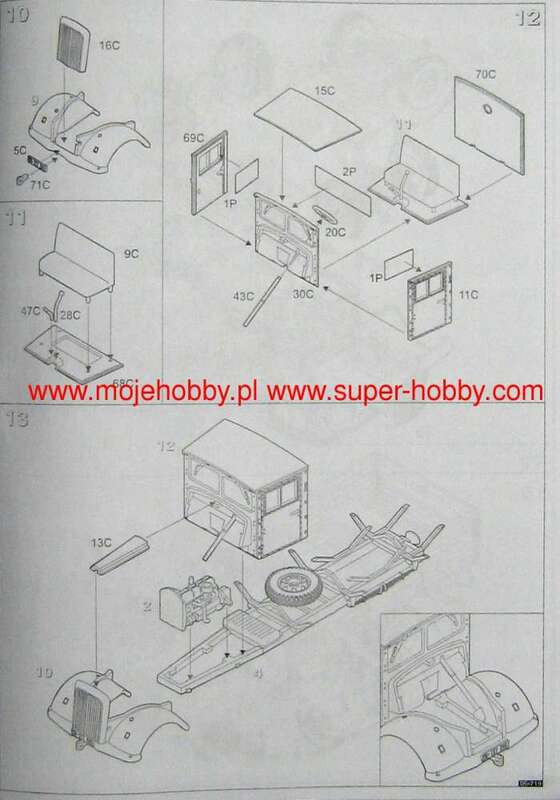 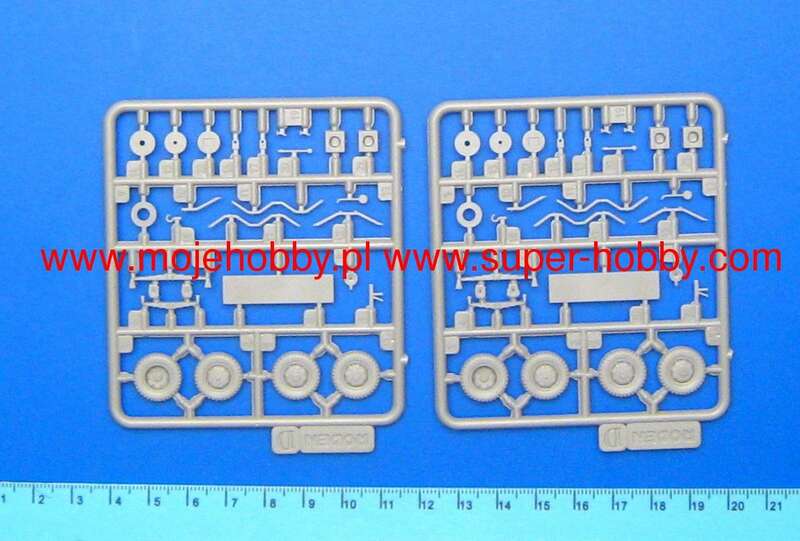 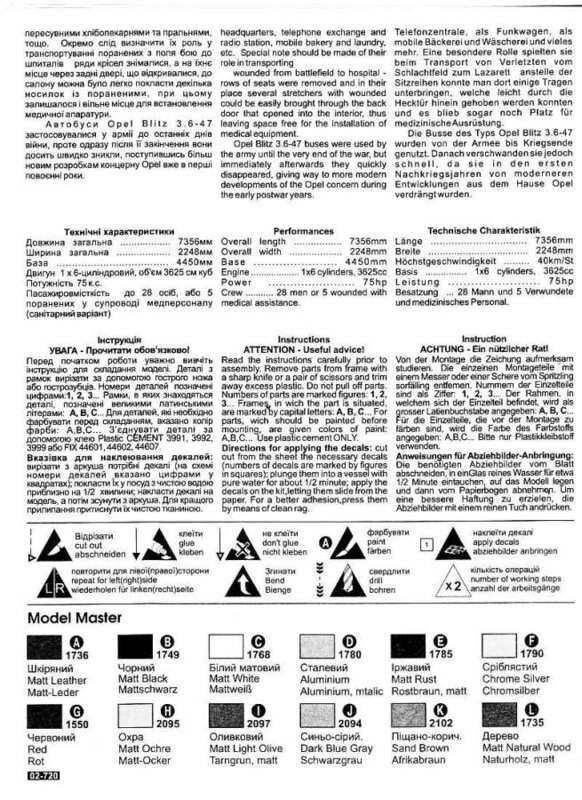 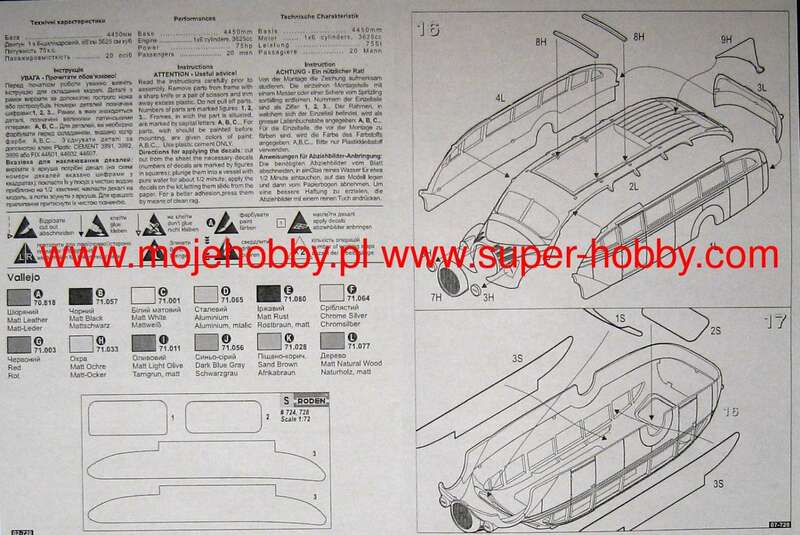 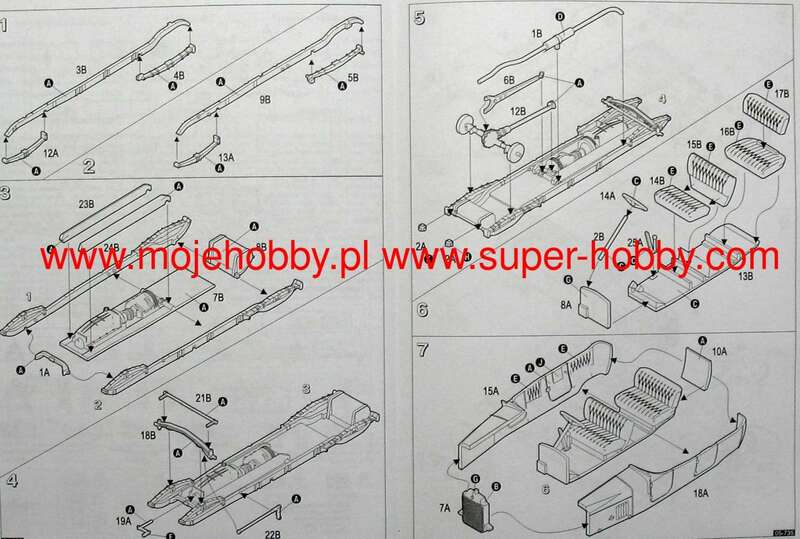 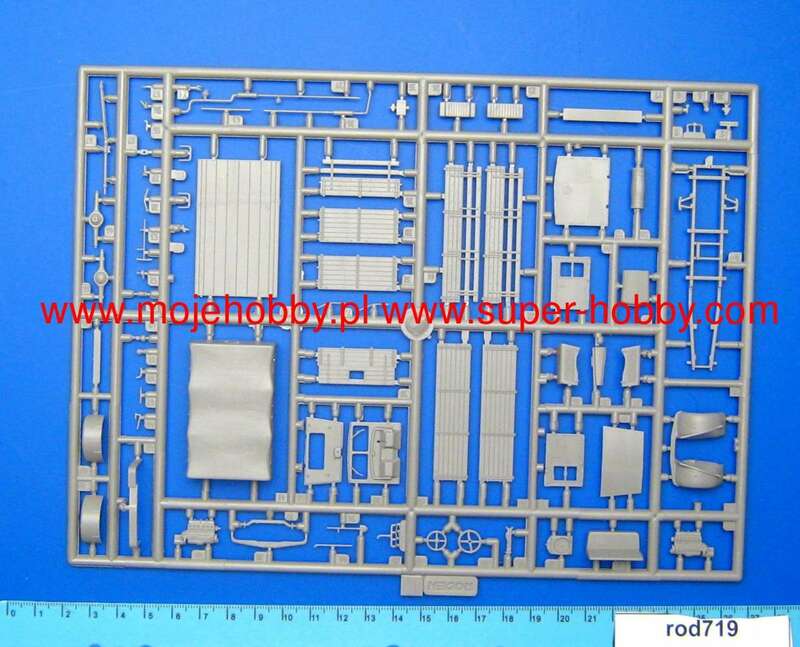 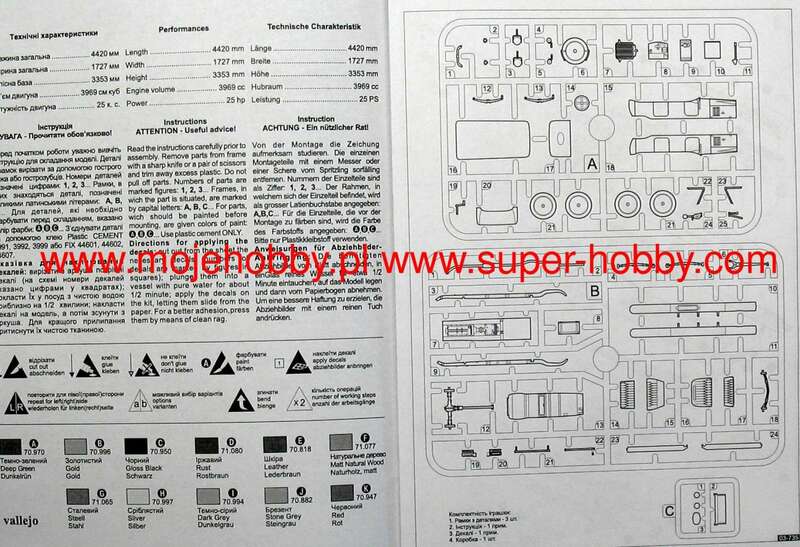 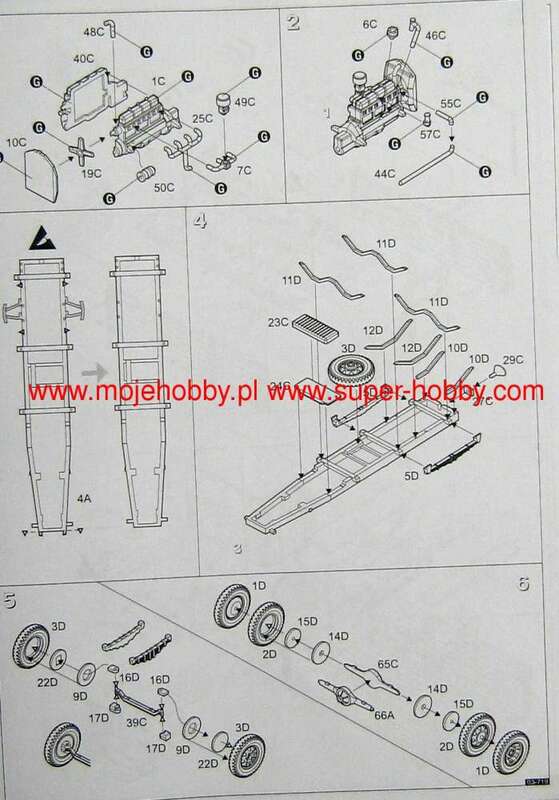 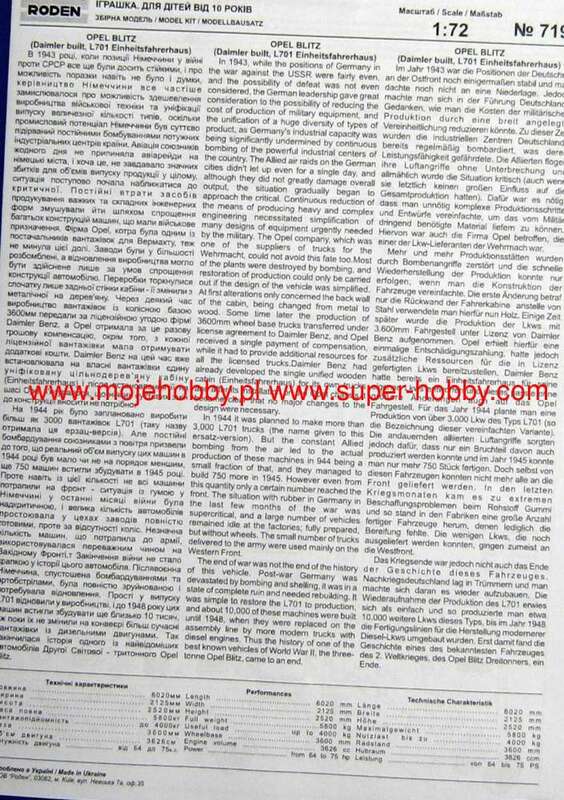 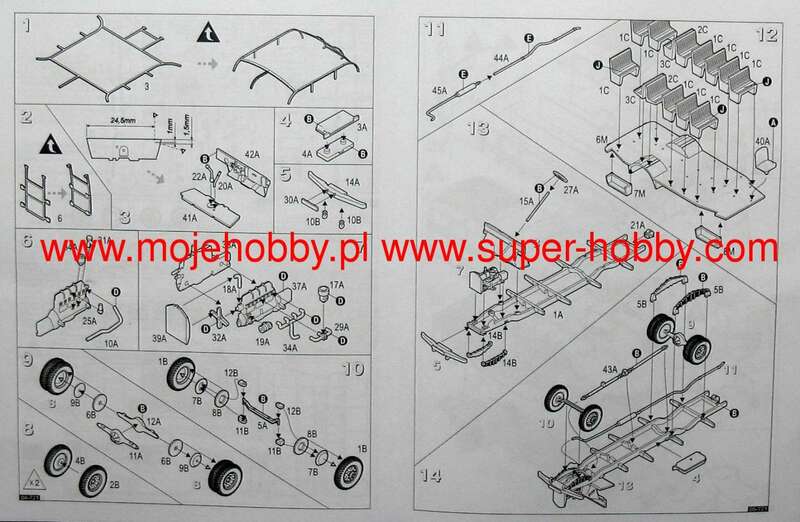 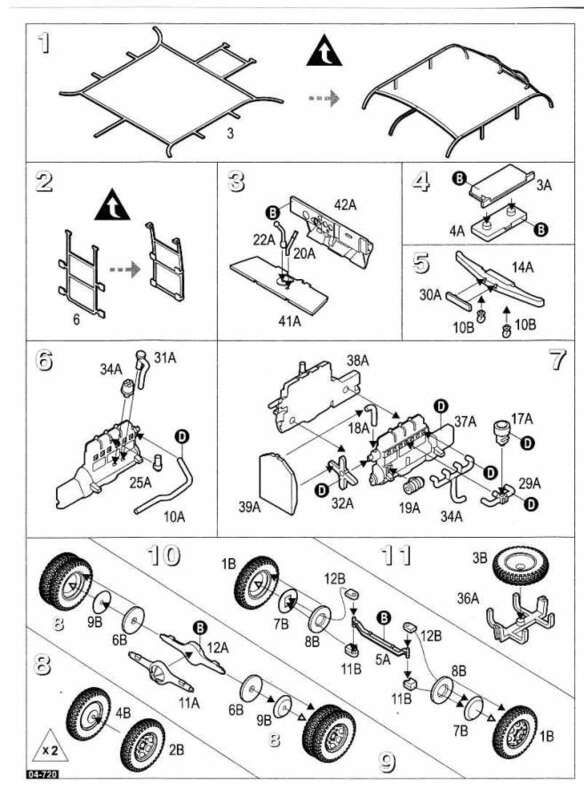 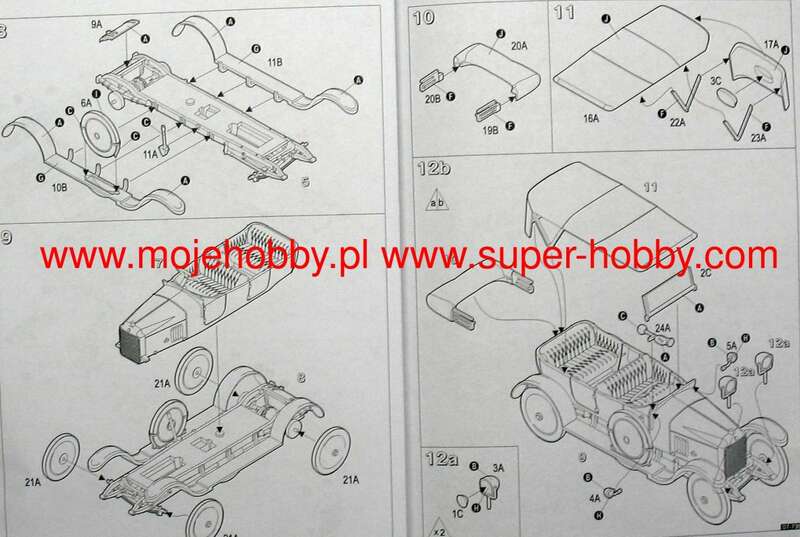 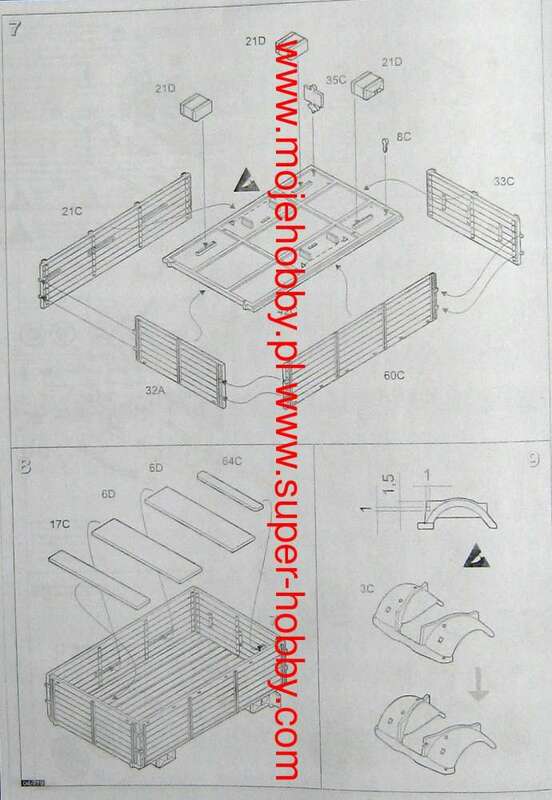 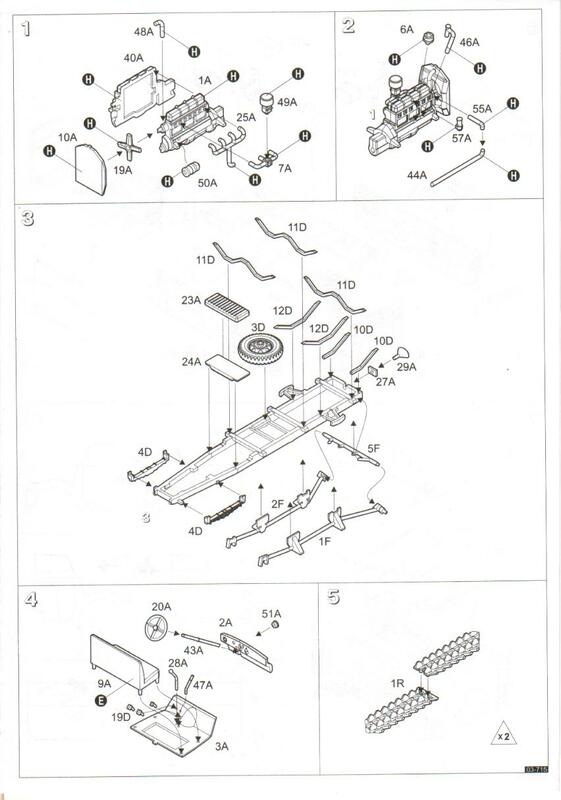 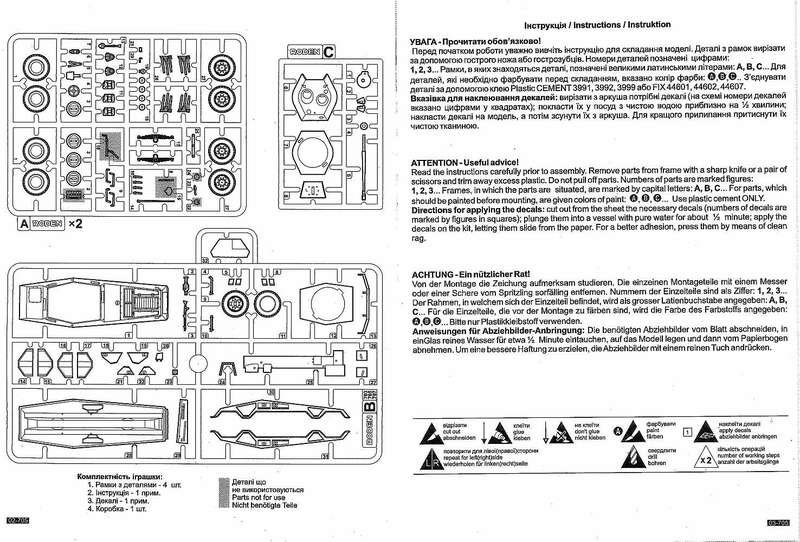 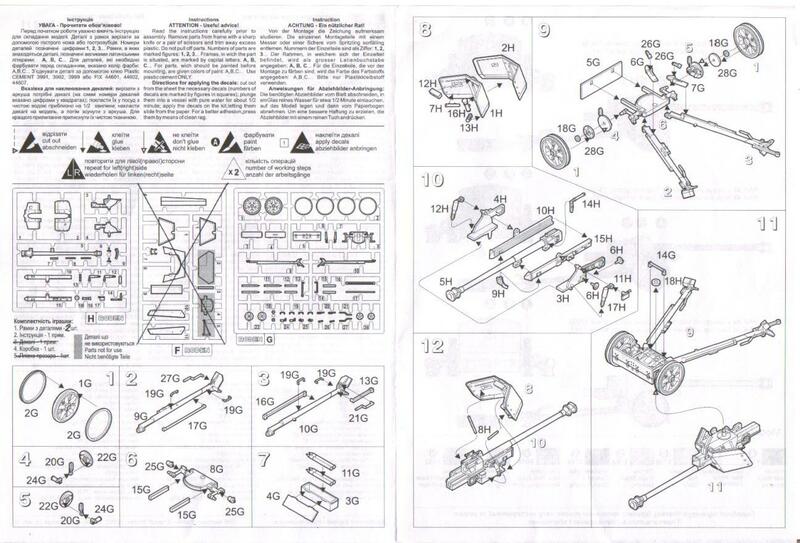 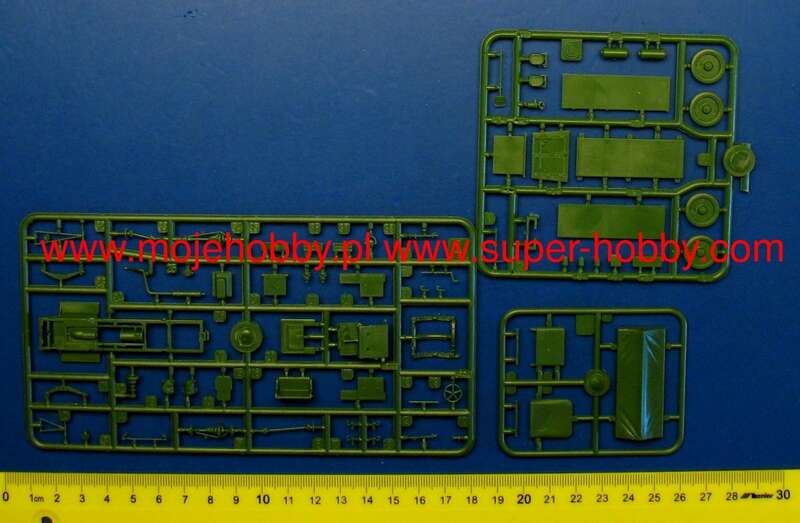 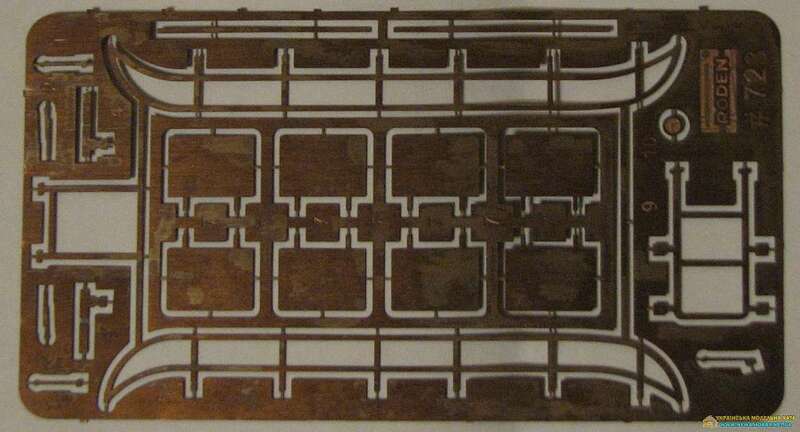 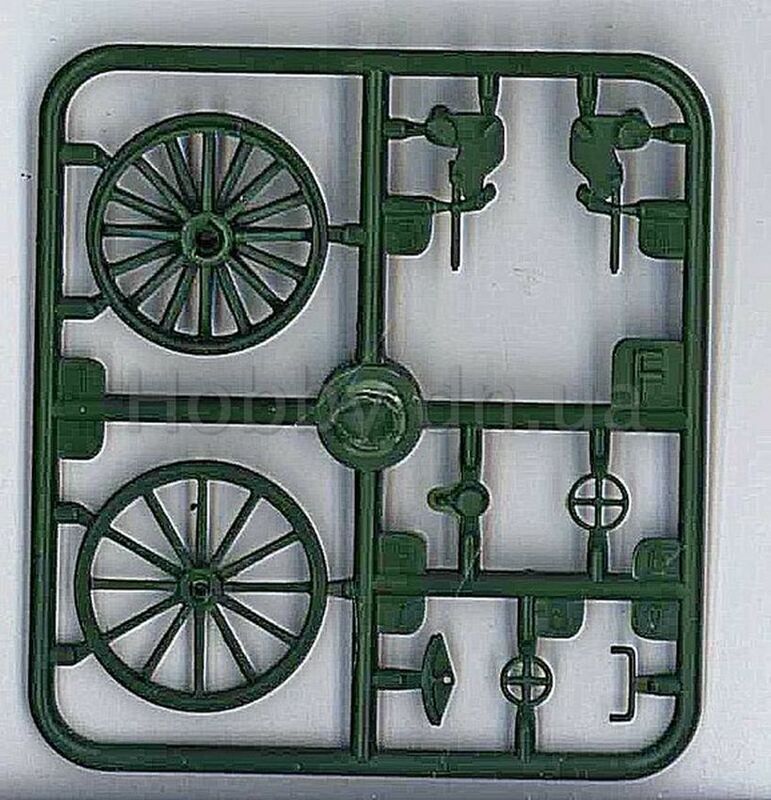 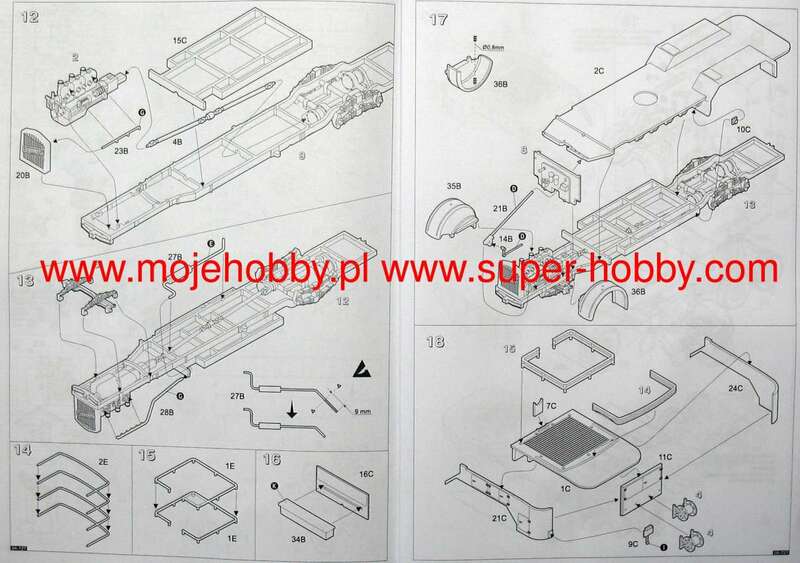 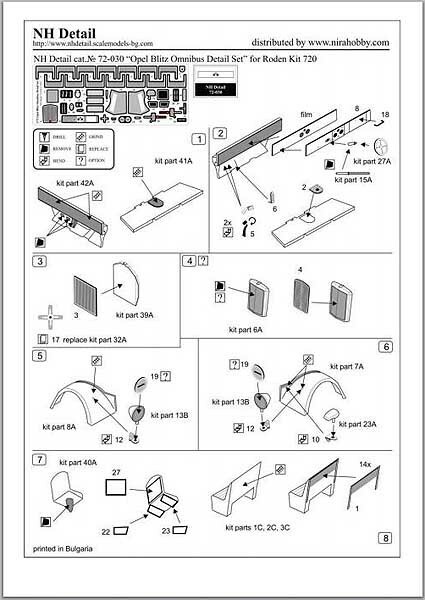 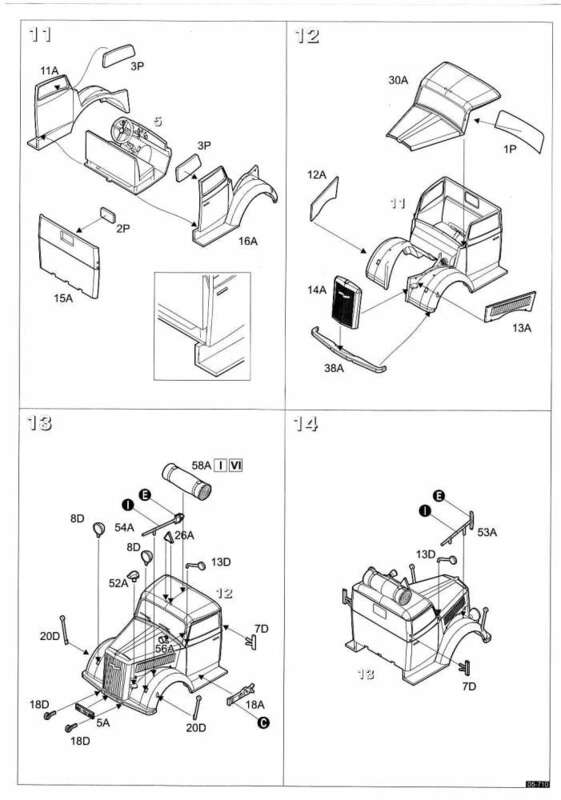 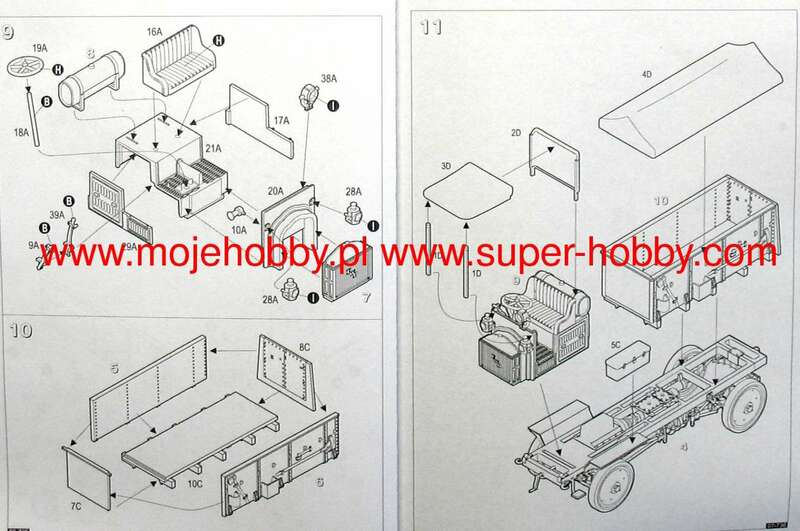 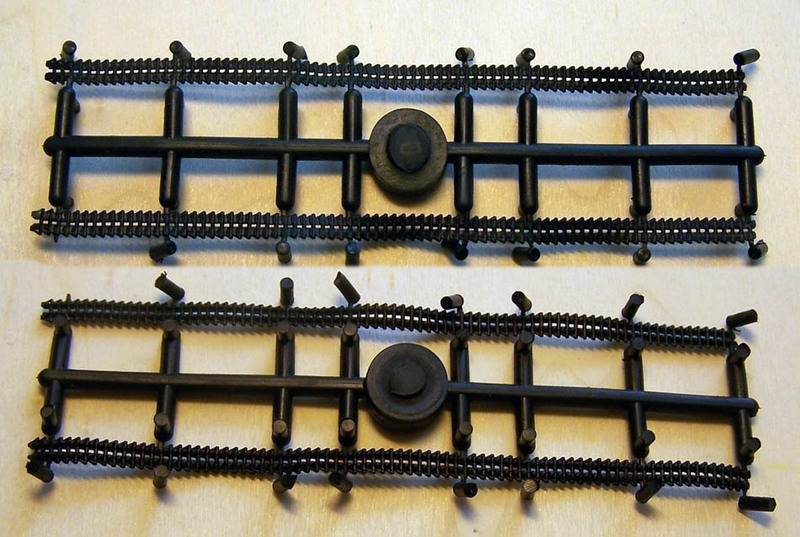 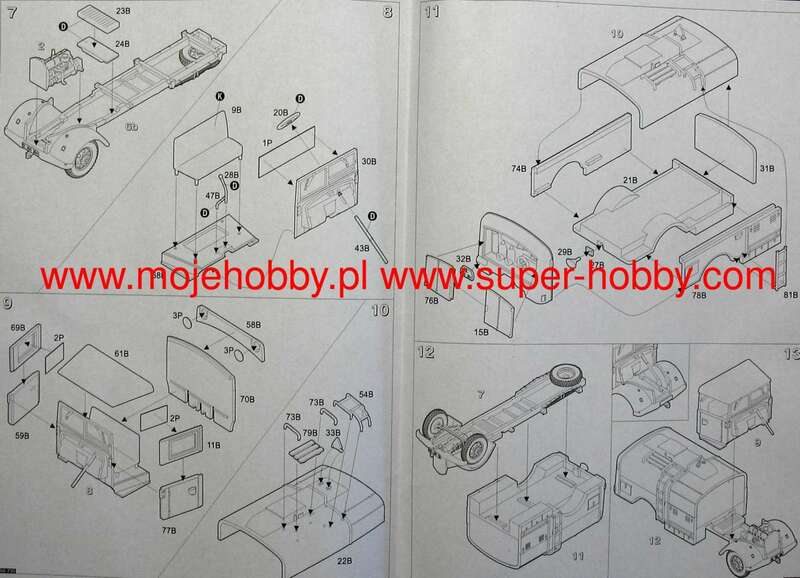 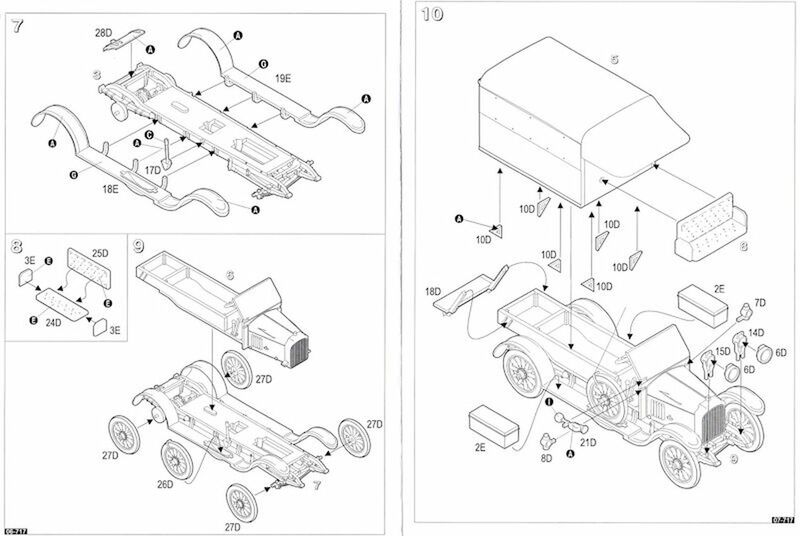 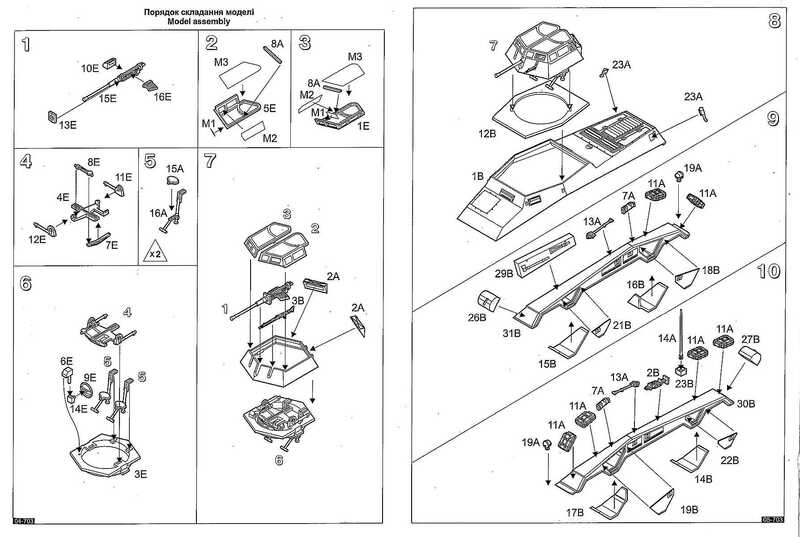 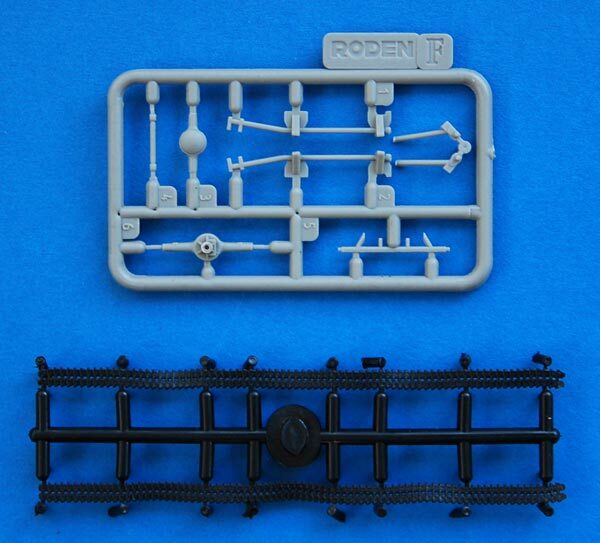 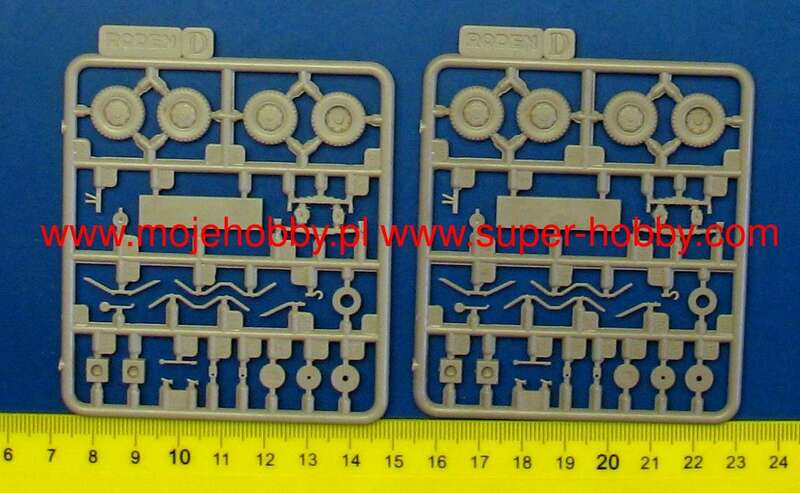 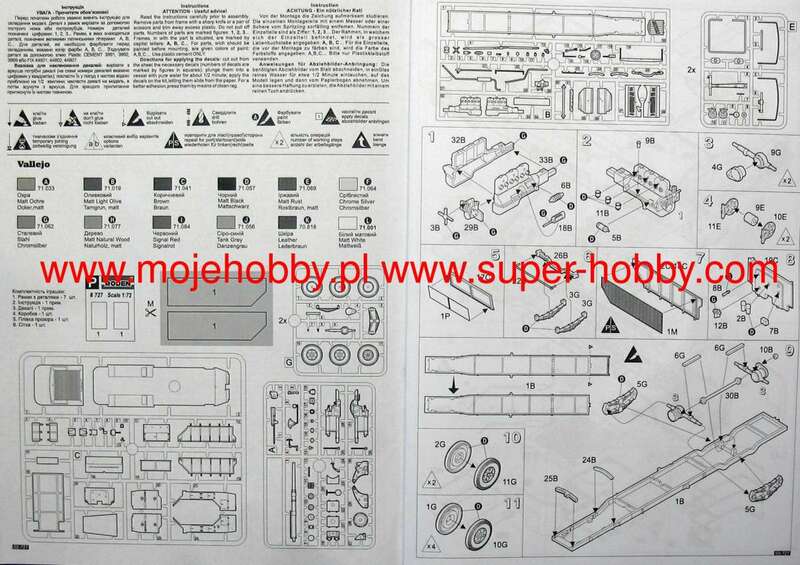 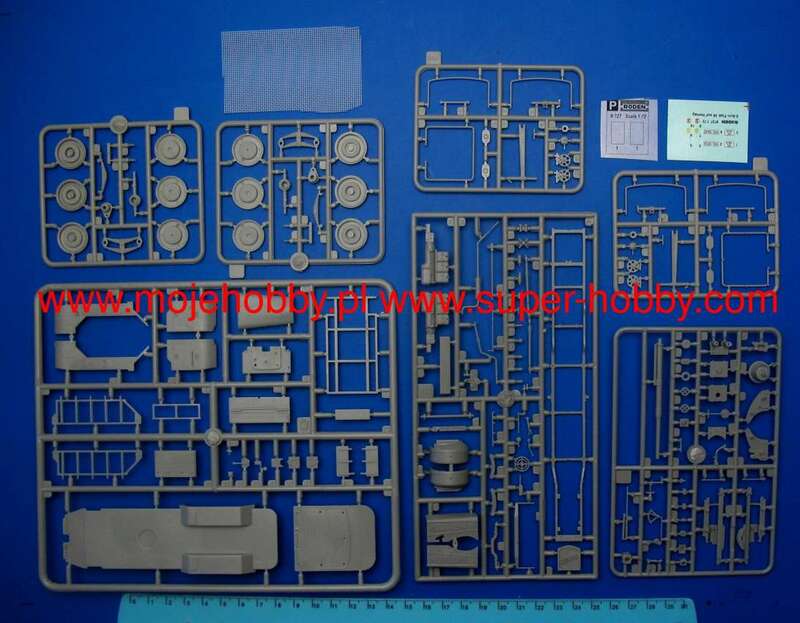 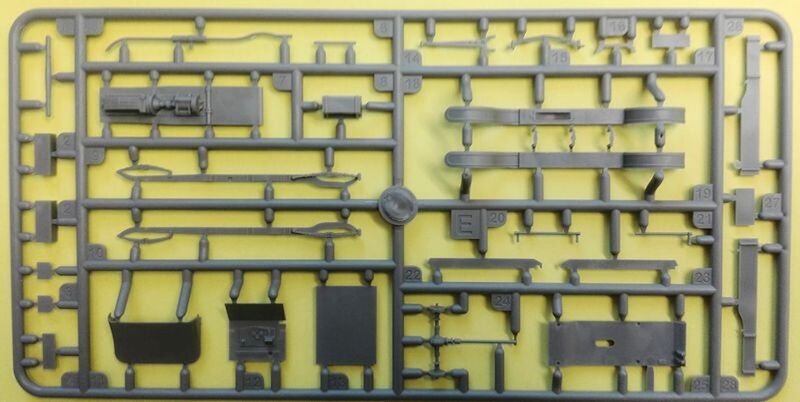 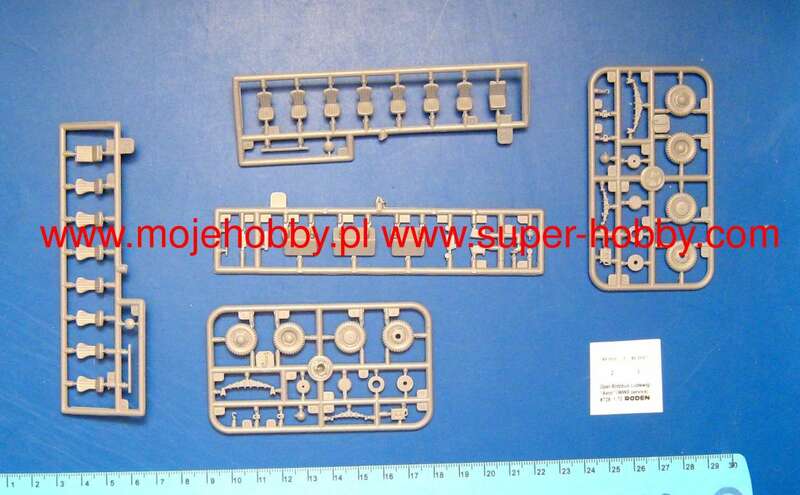 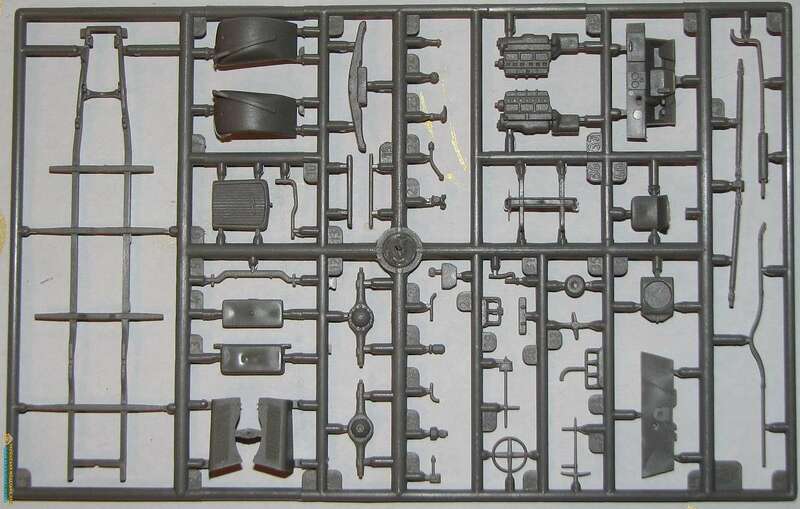 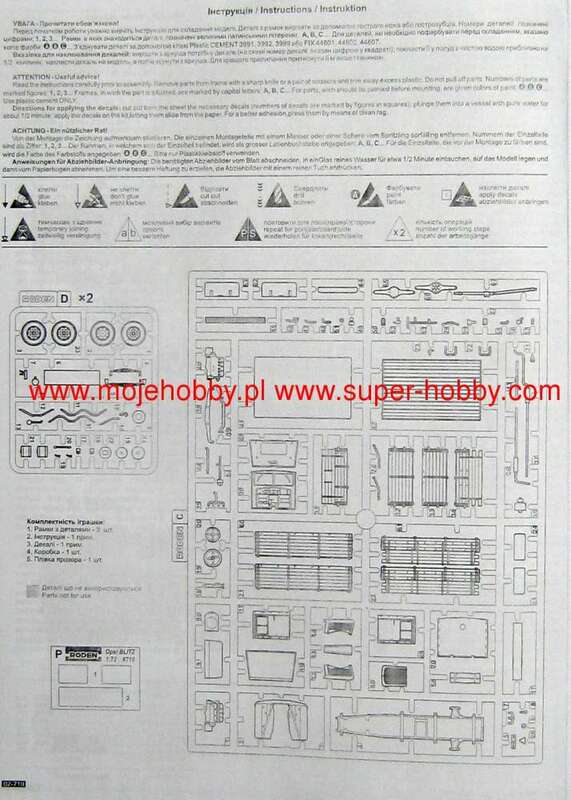 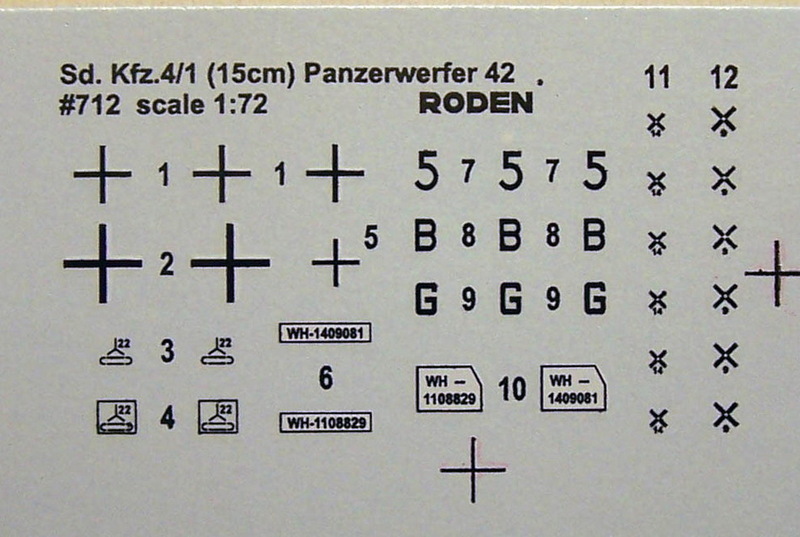 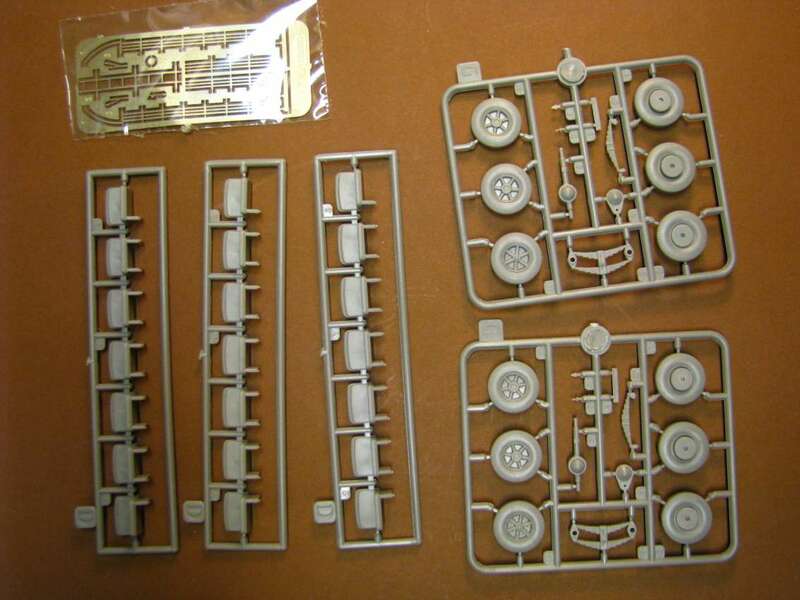 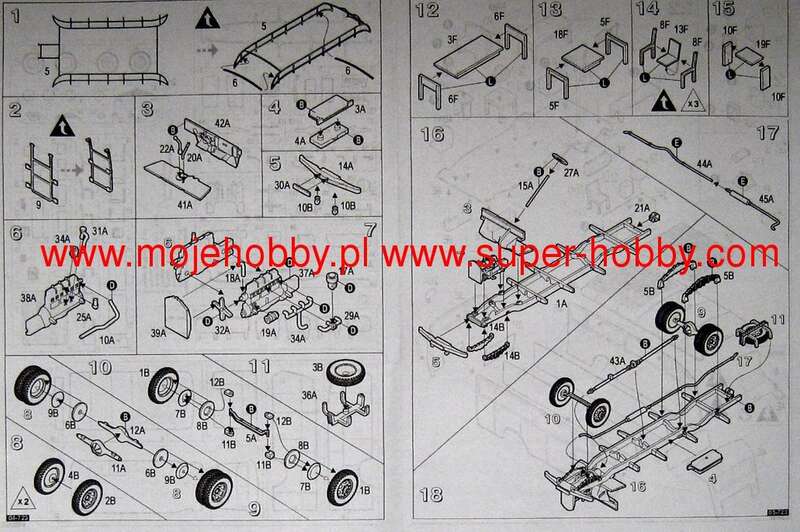 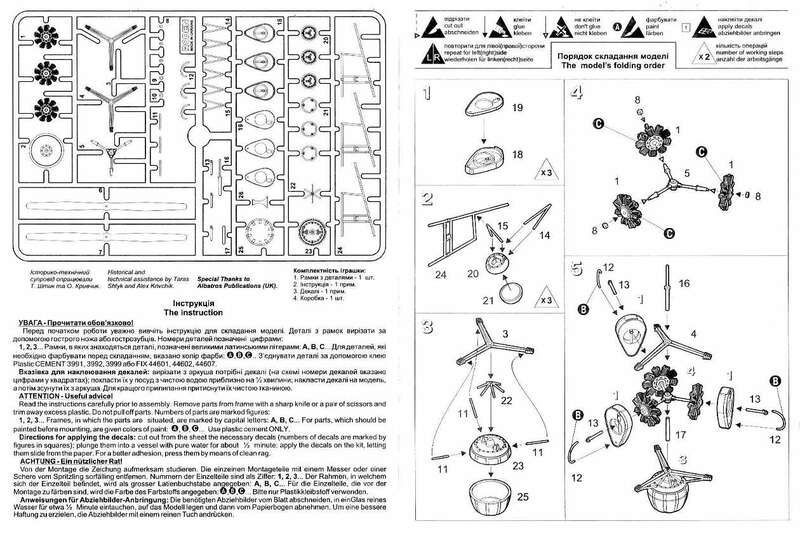 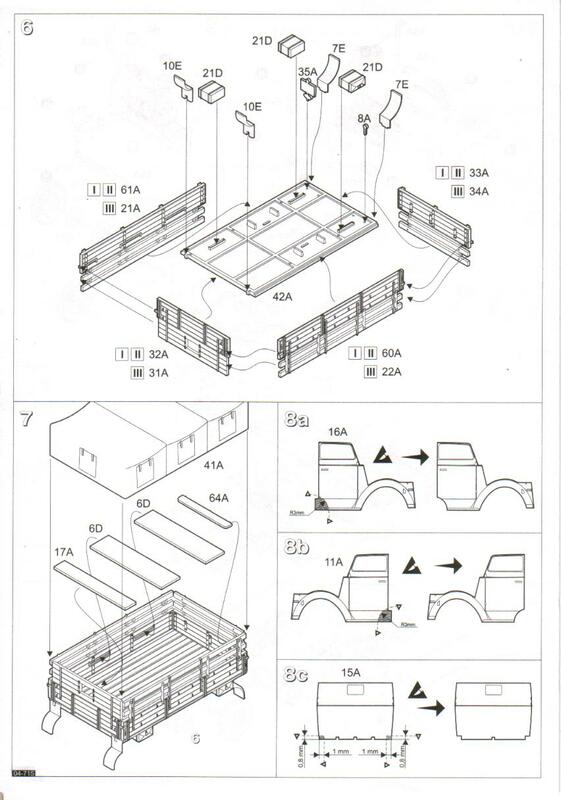 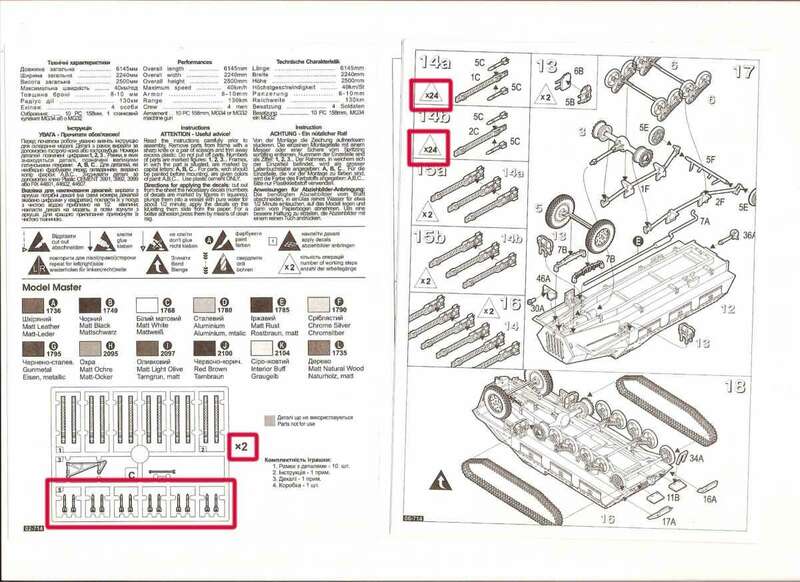 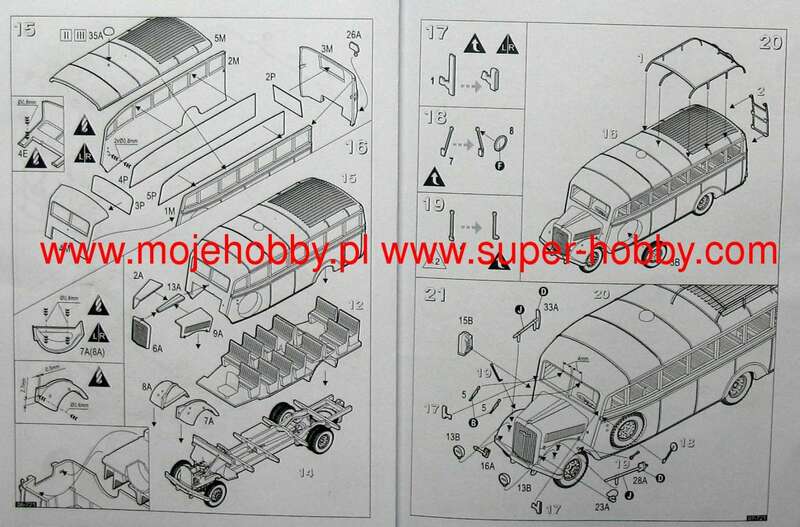 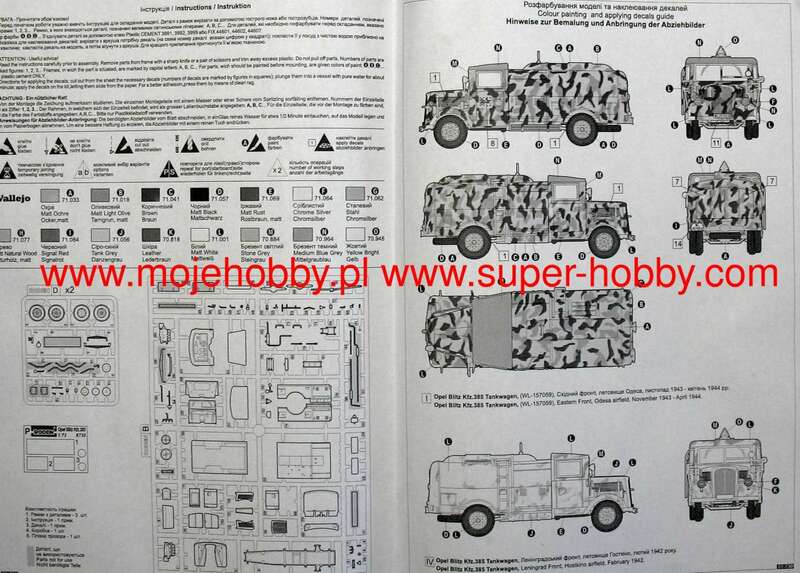 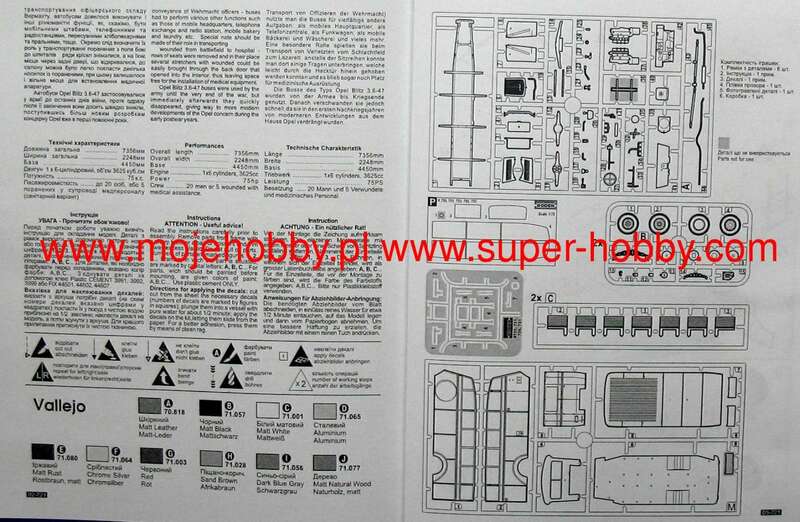 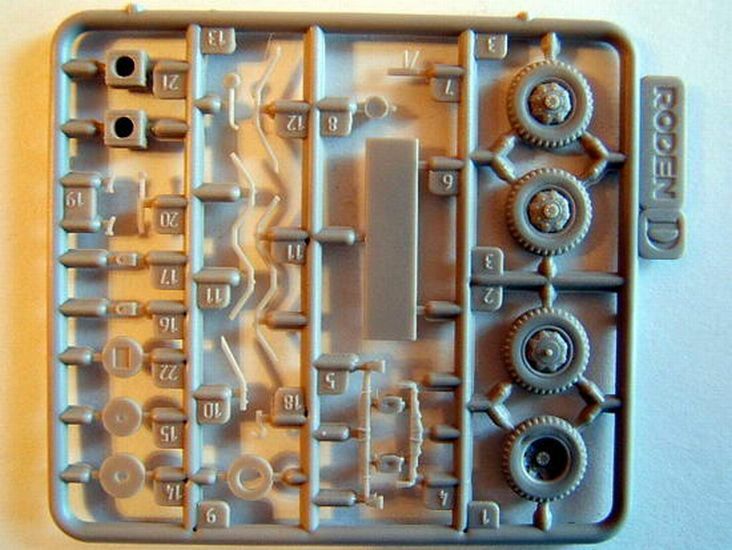 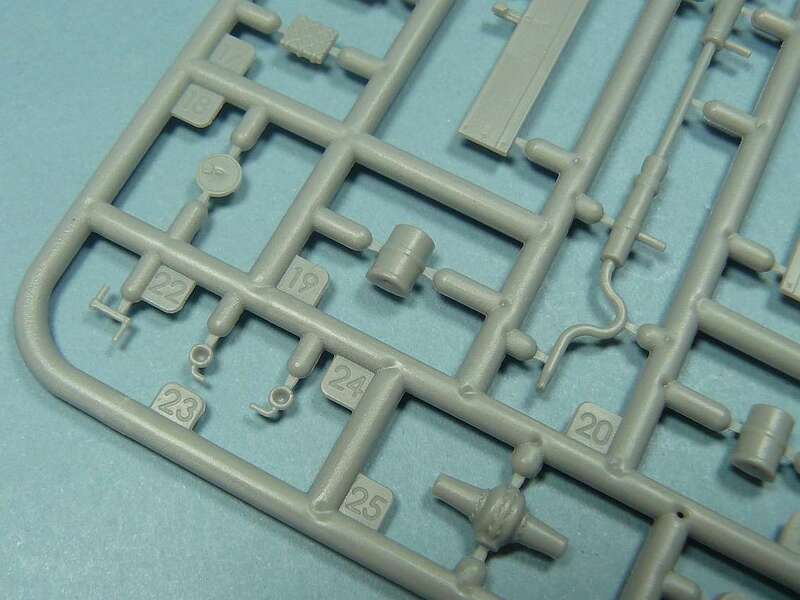 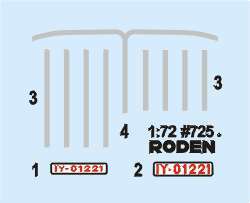 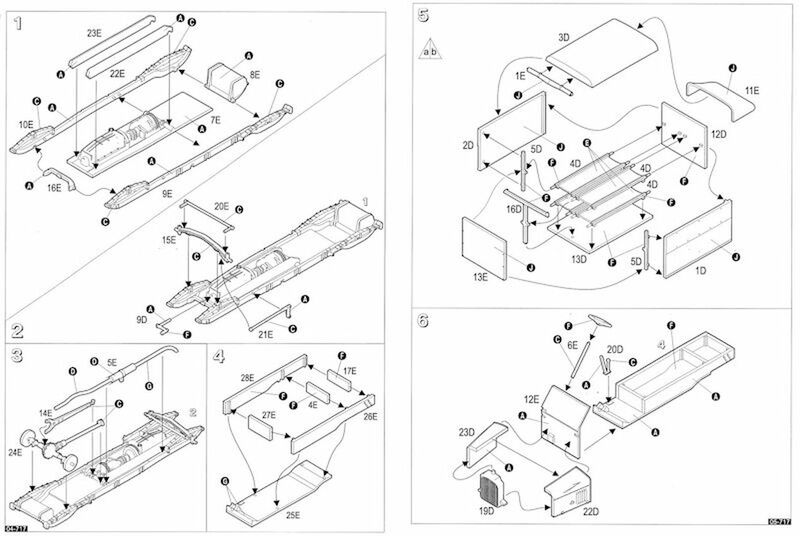 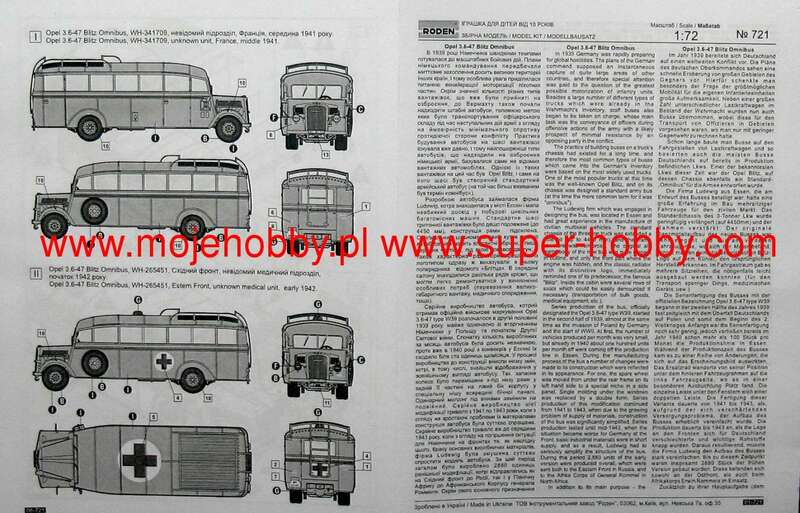 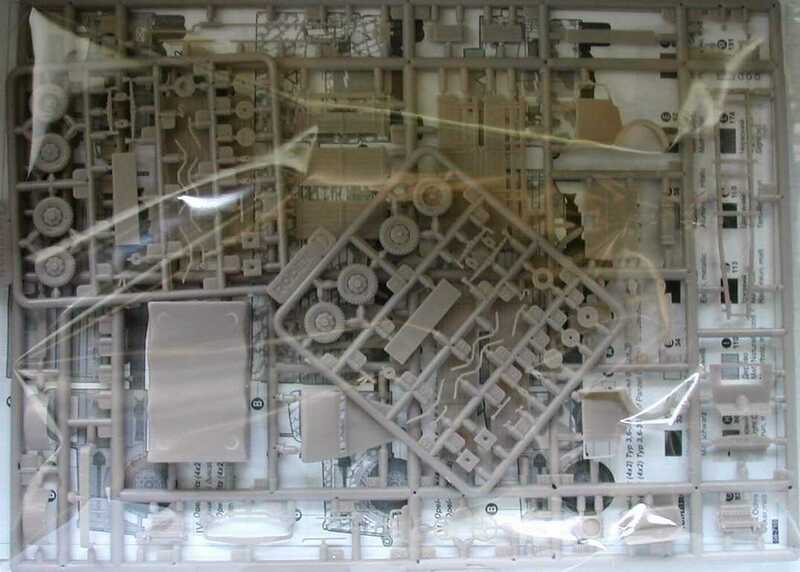 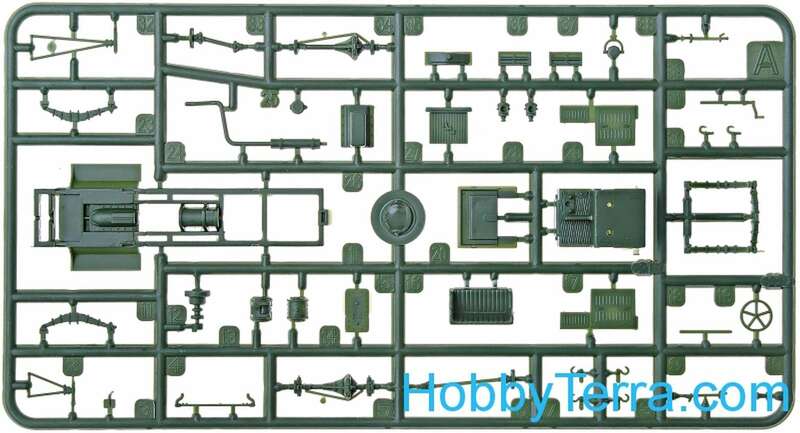 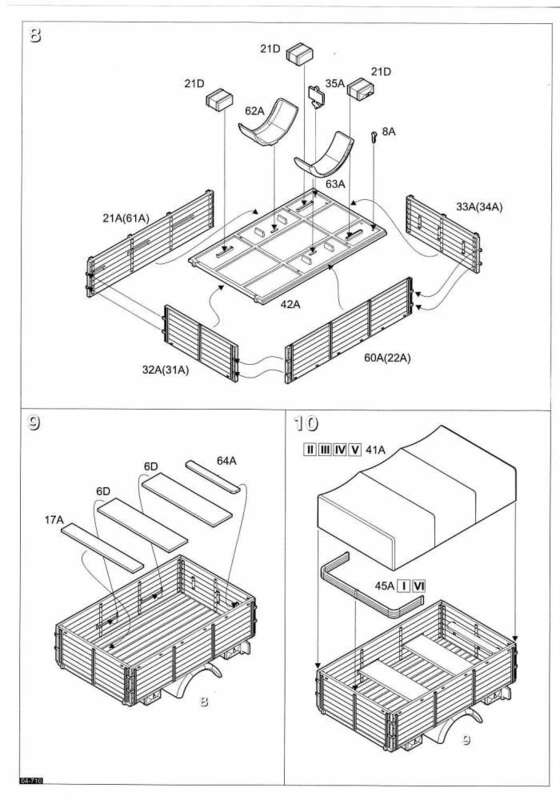 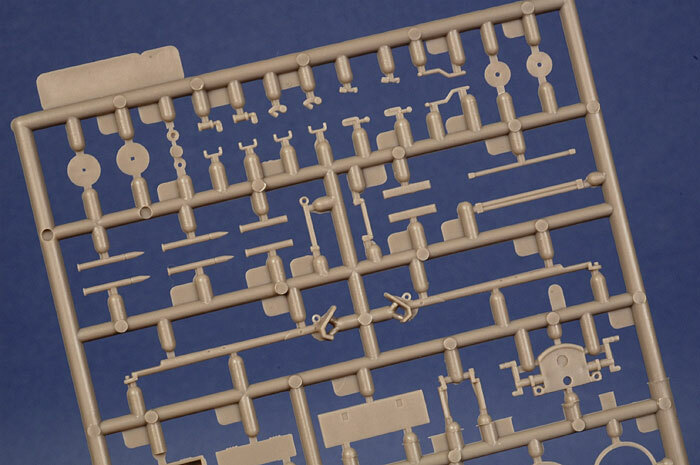 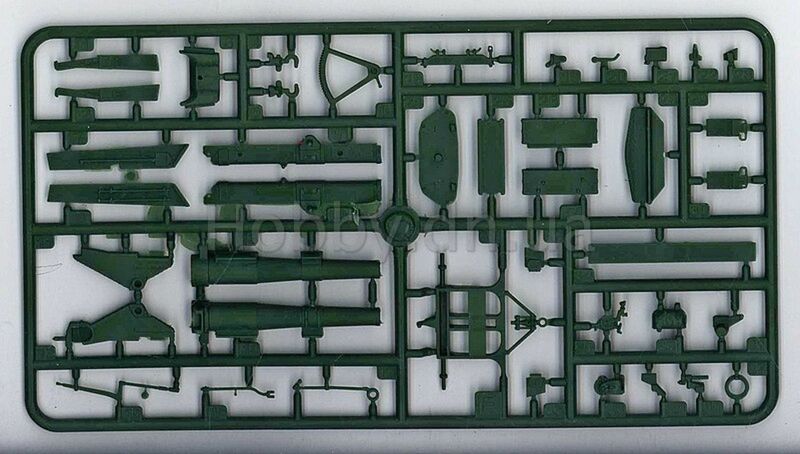 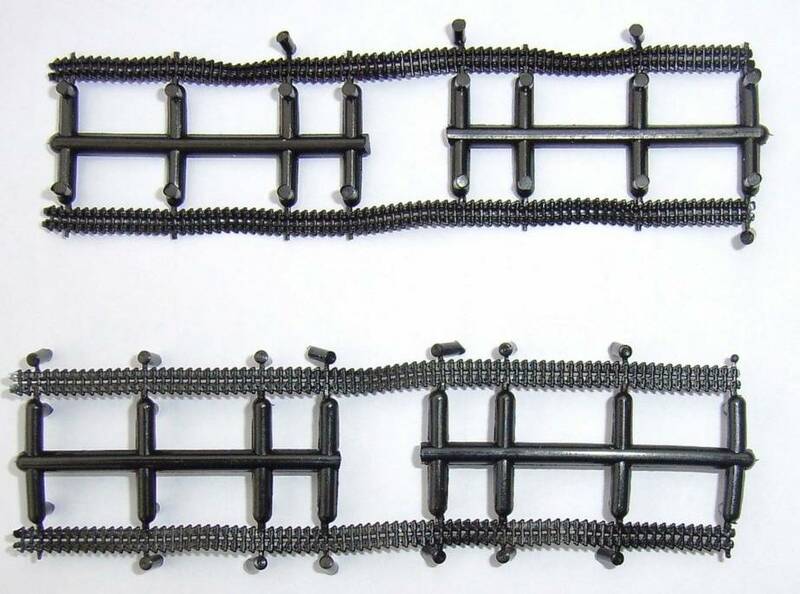 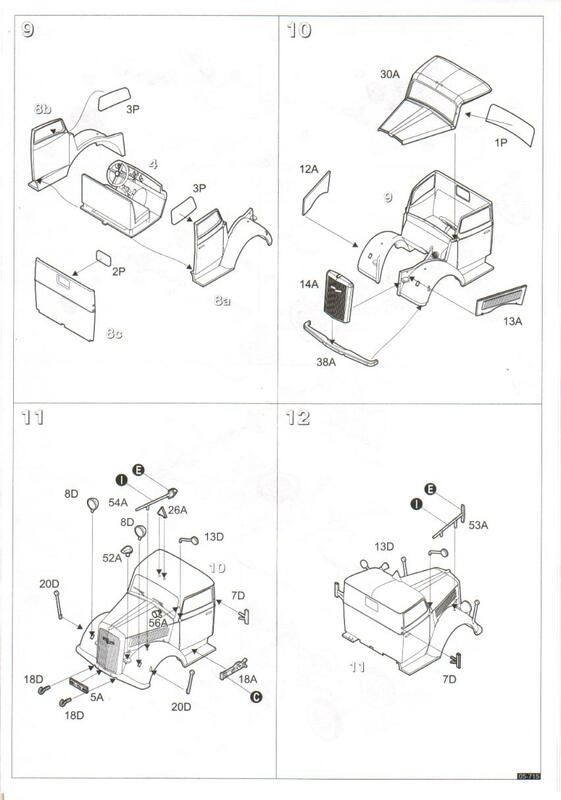 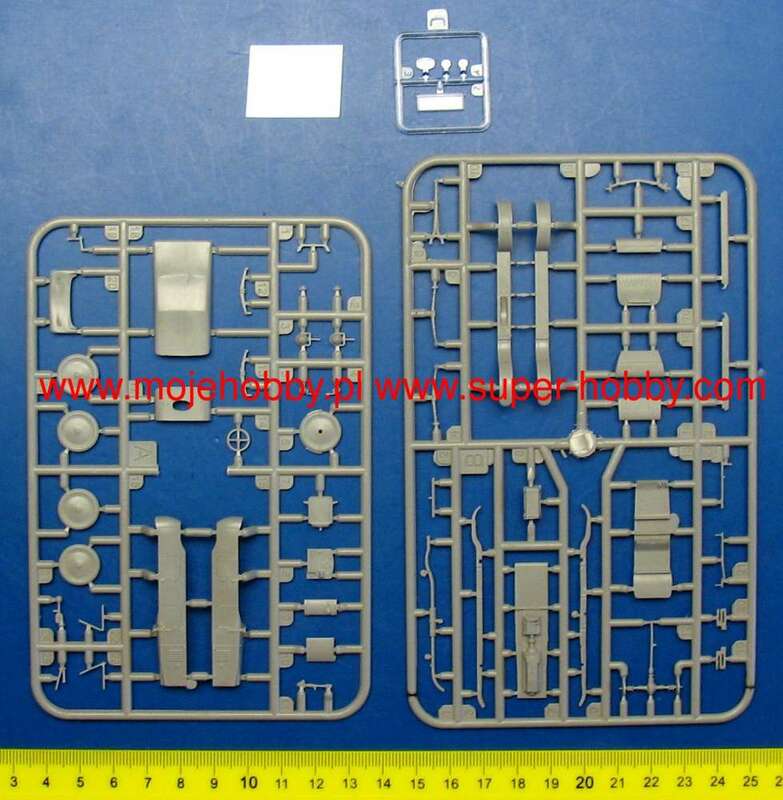 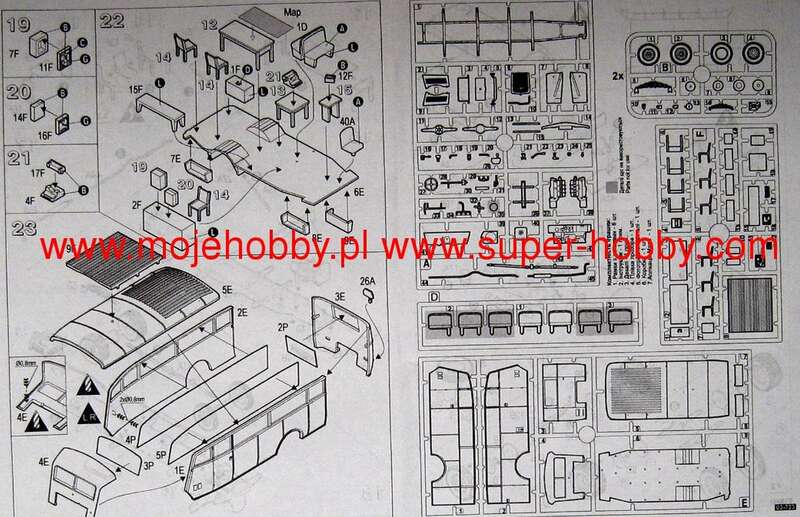 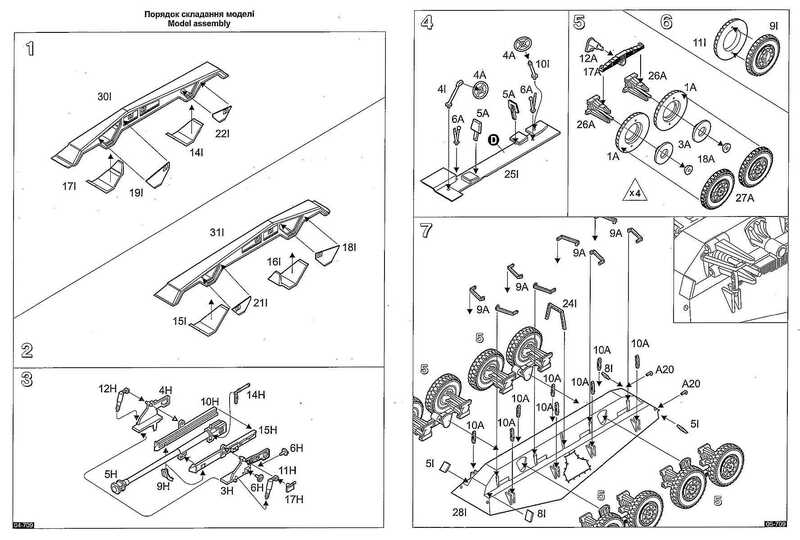 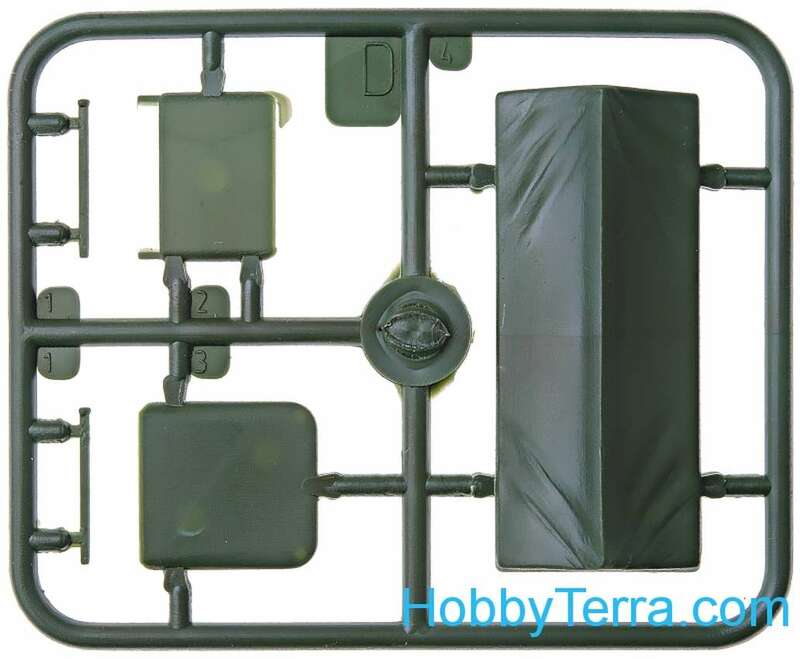 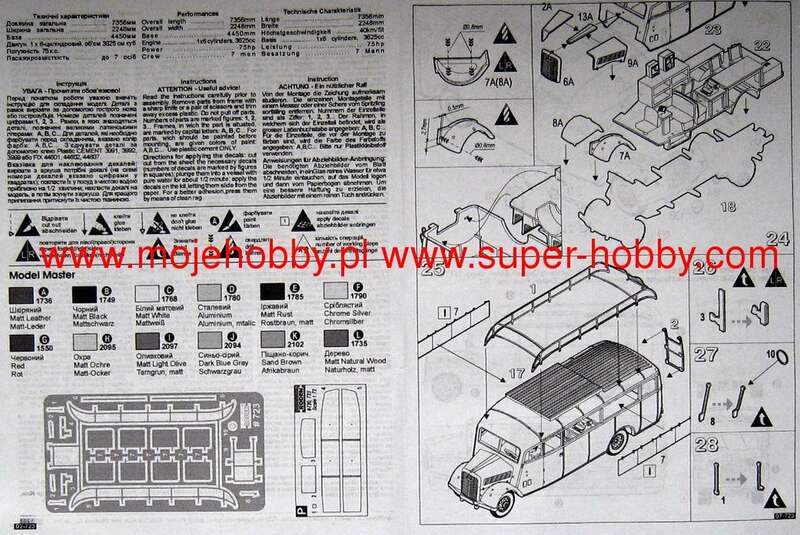 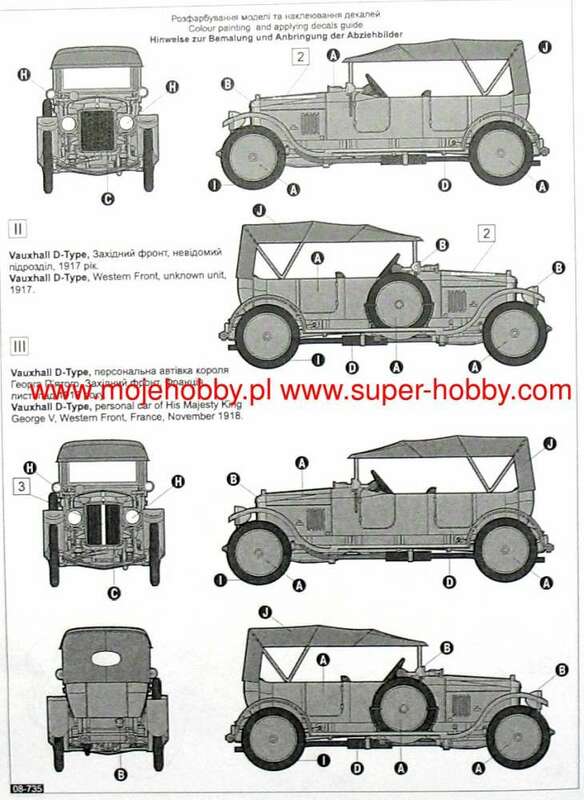 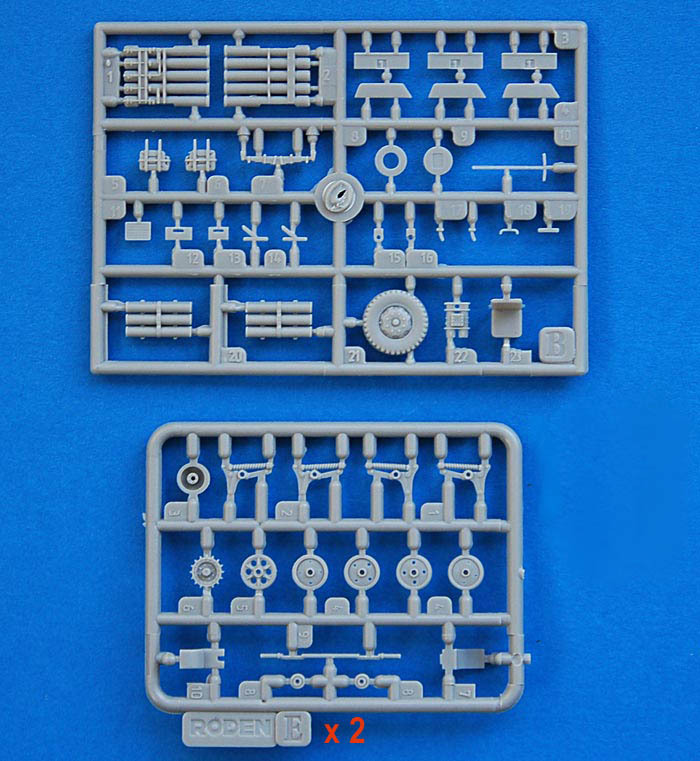 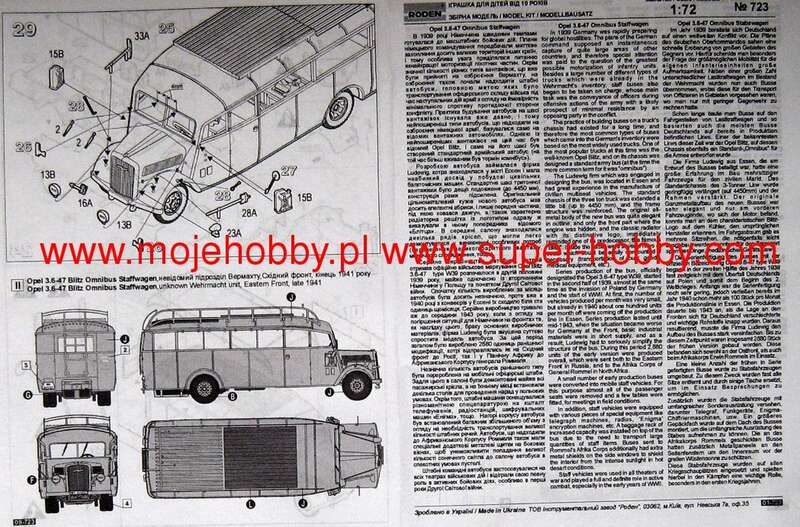 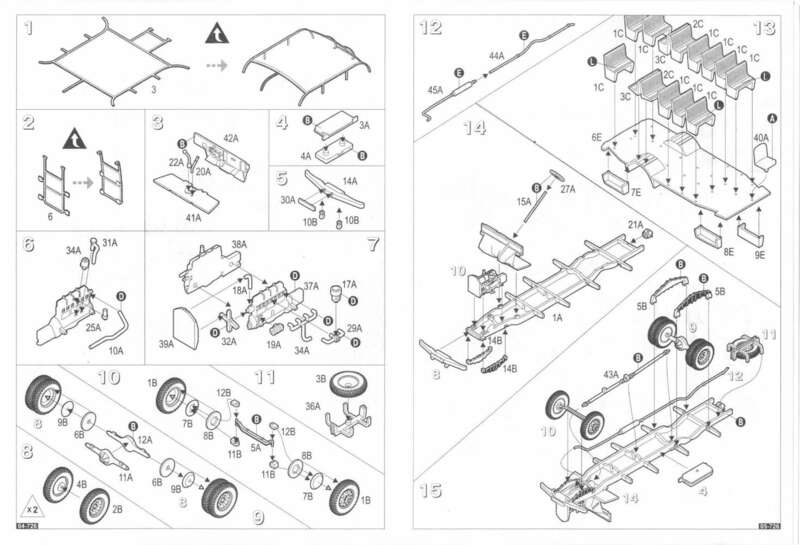 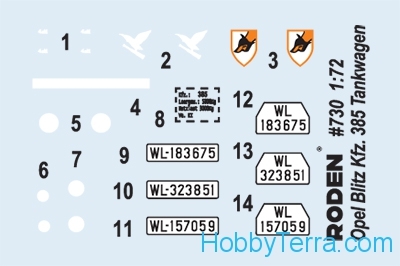 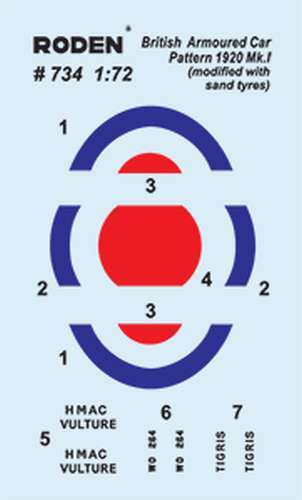 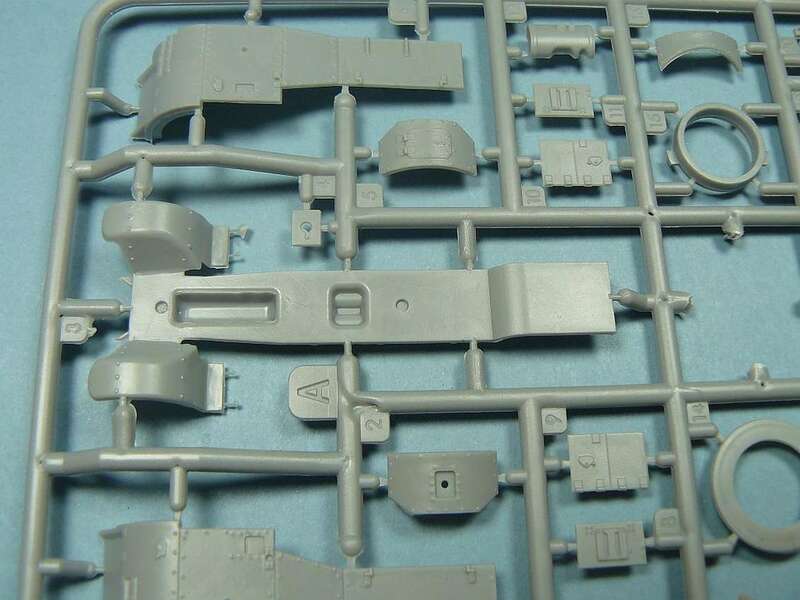 For the different variants there are a new sprue. 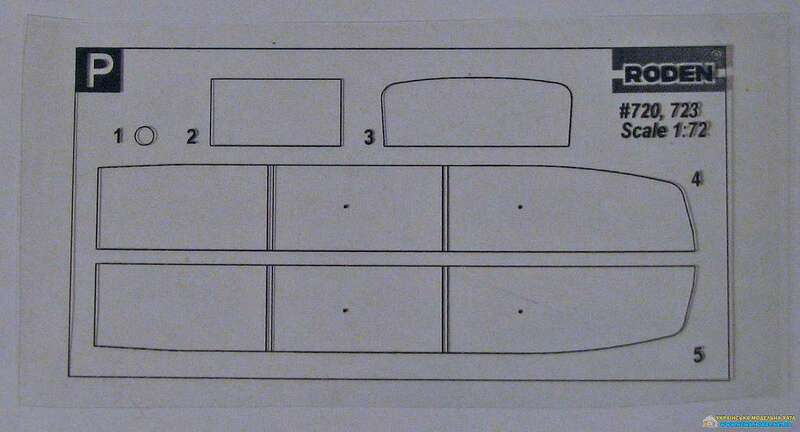 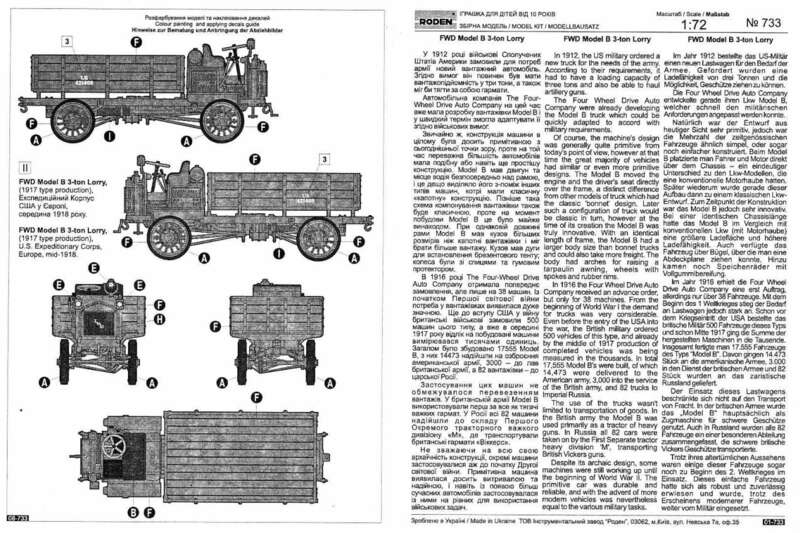 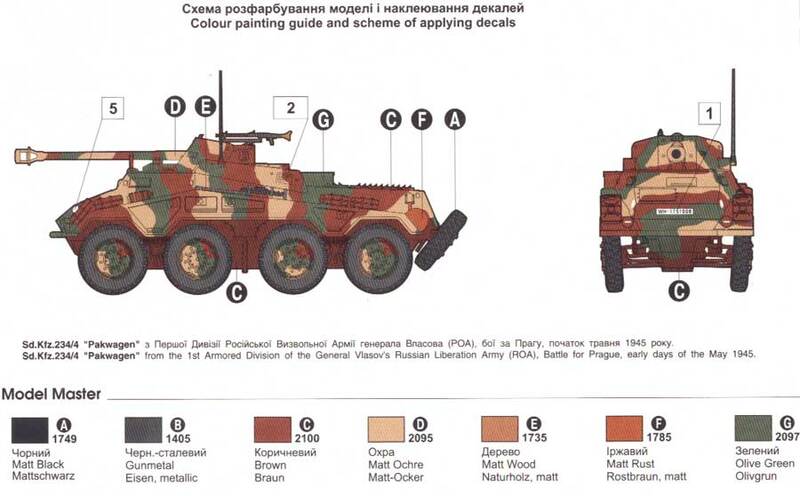 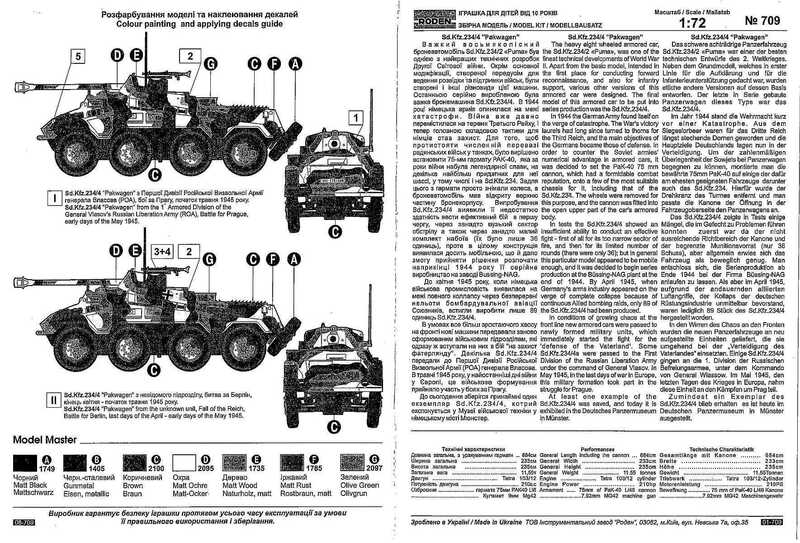 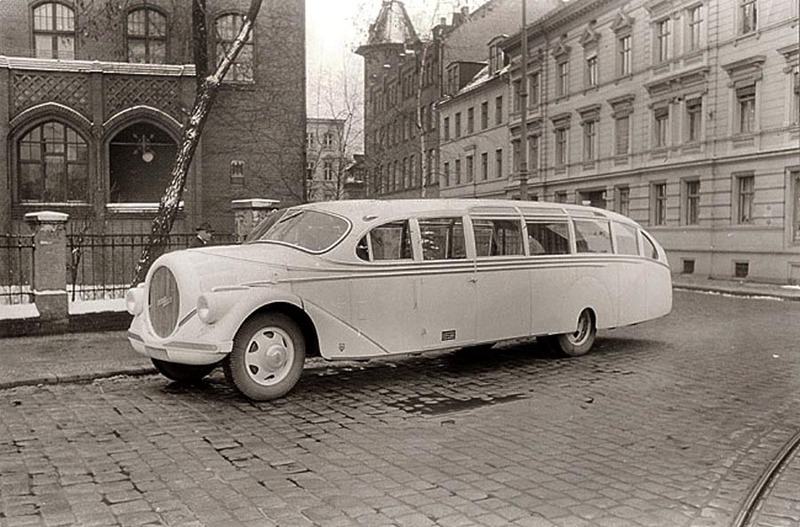 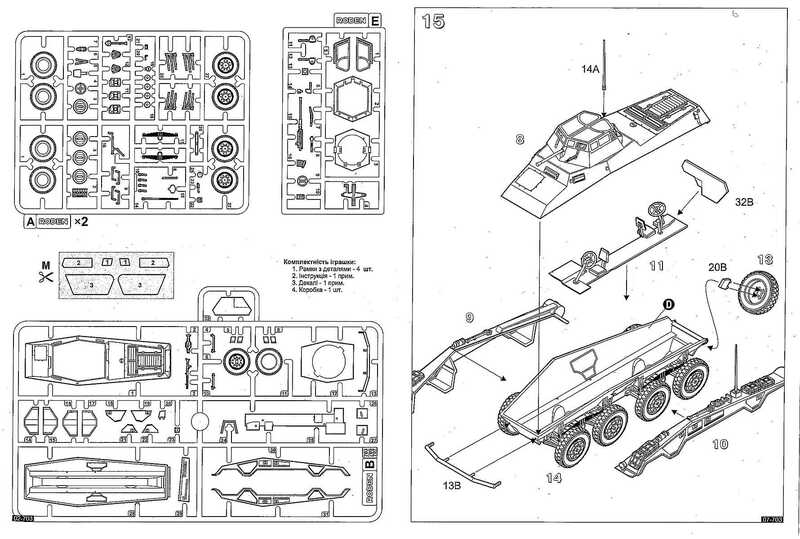 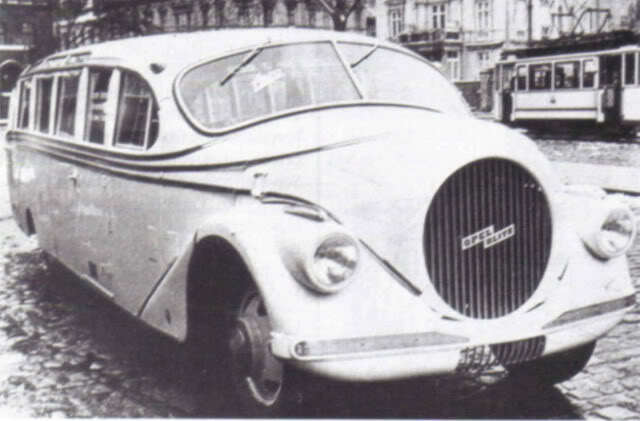 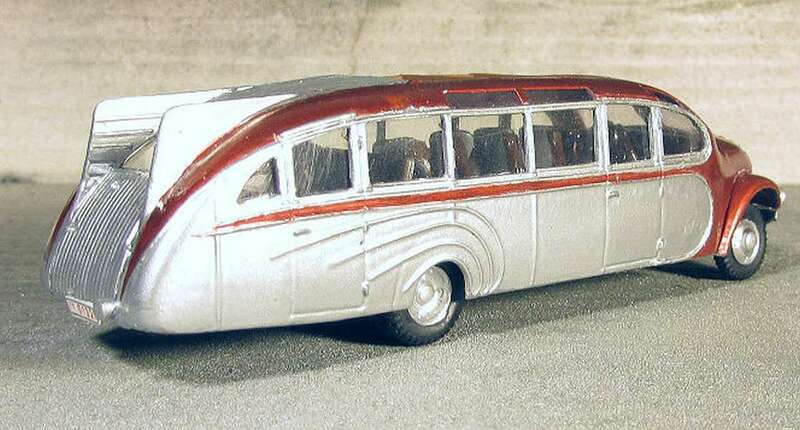 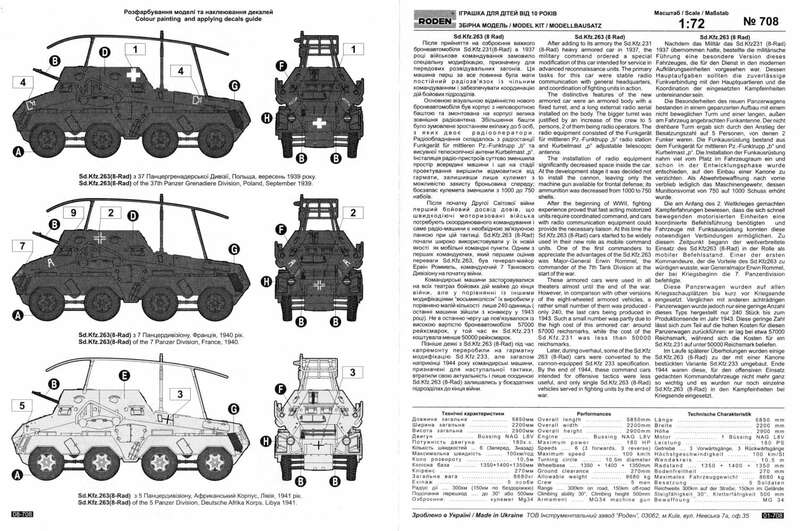 The lower hull is obviously designed to provide for many versions of this vehicle. 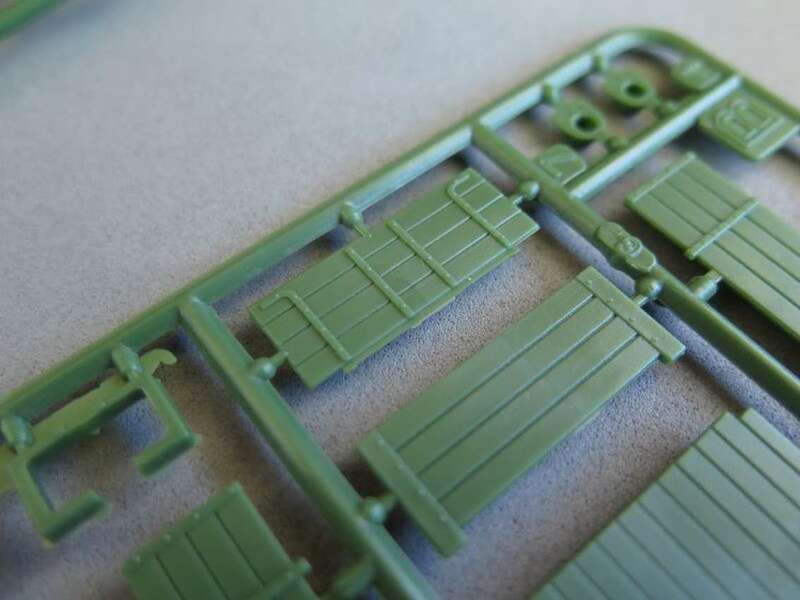 The molding quality is excellent. 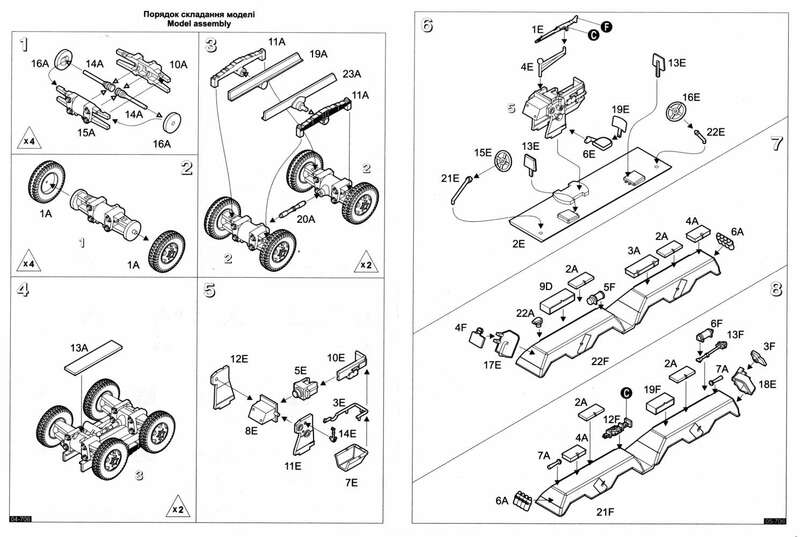 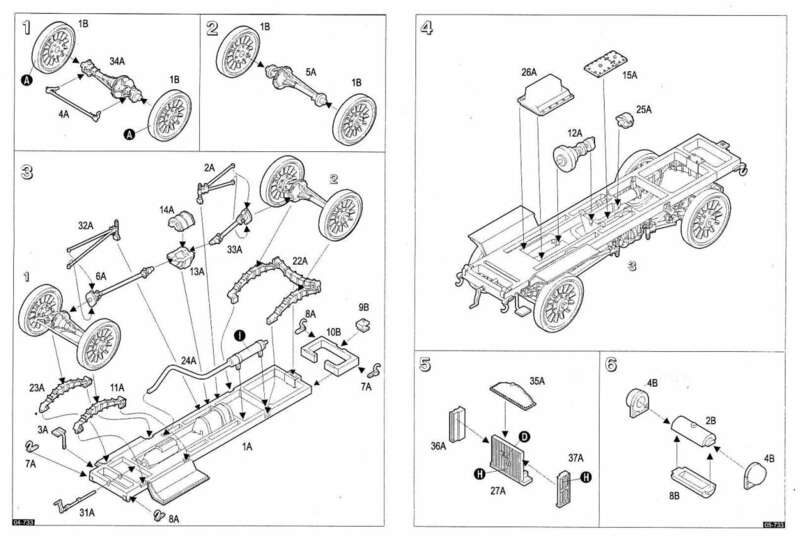 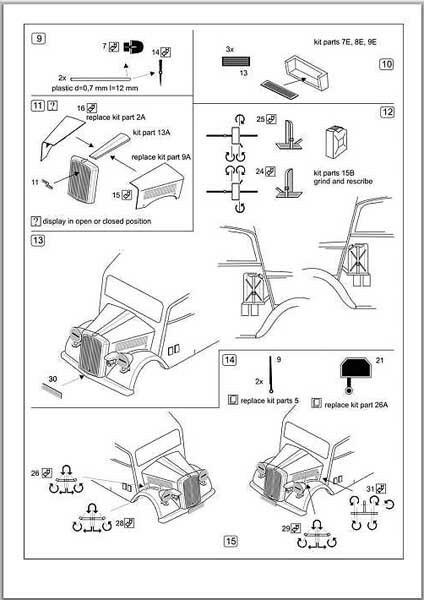 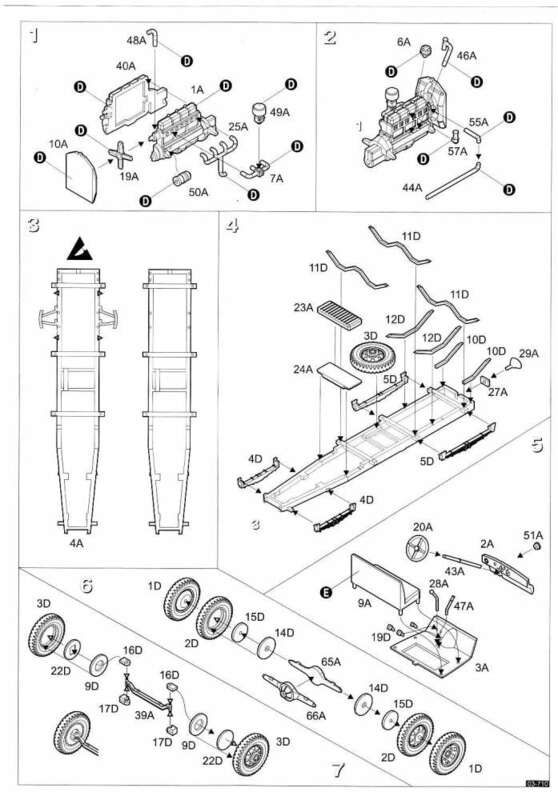 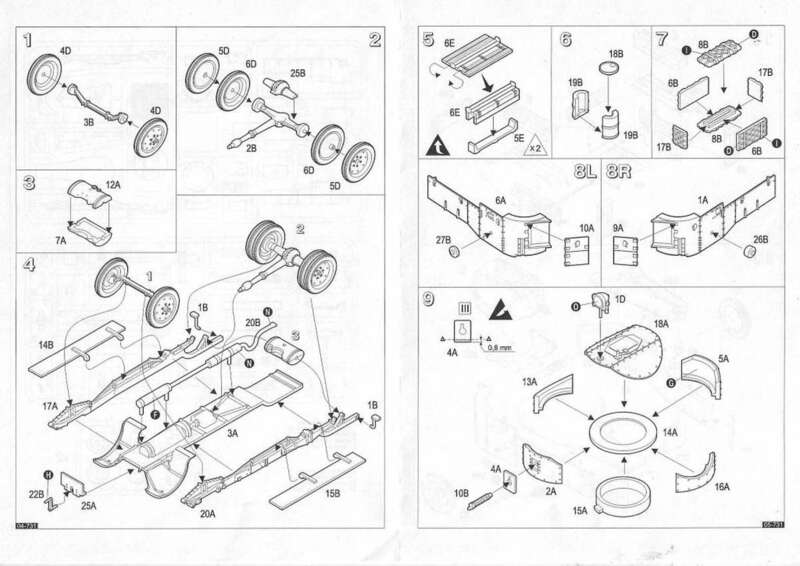 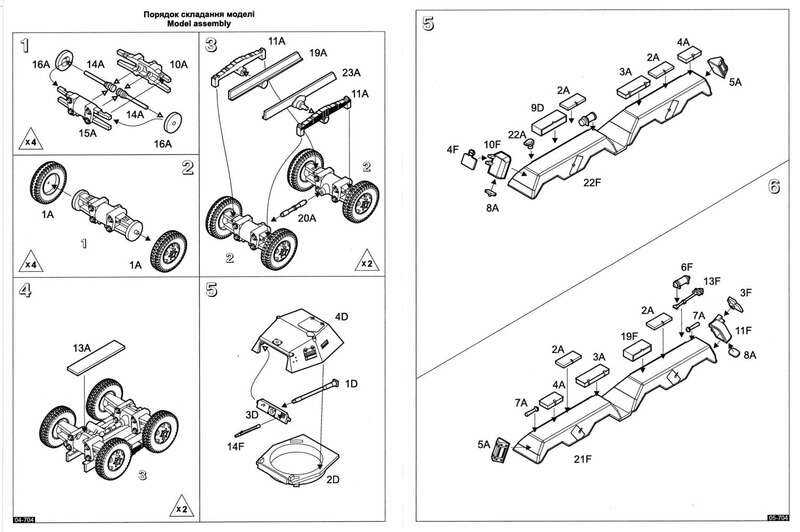 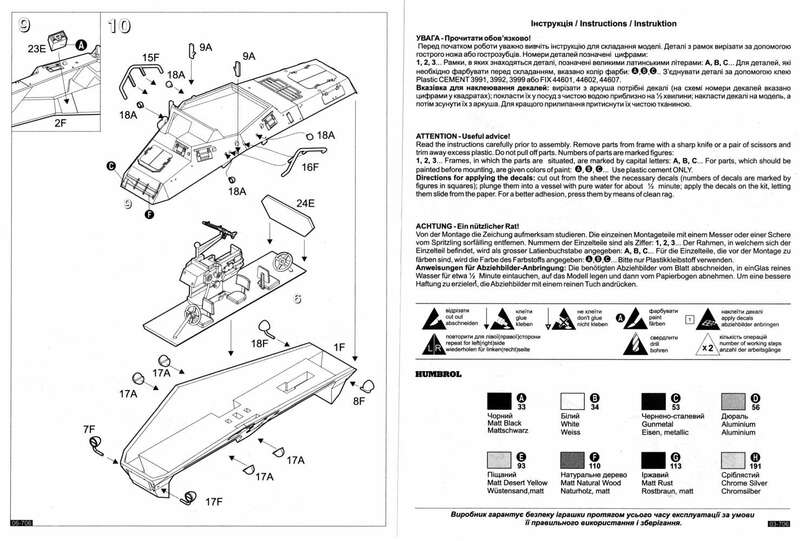 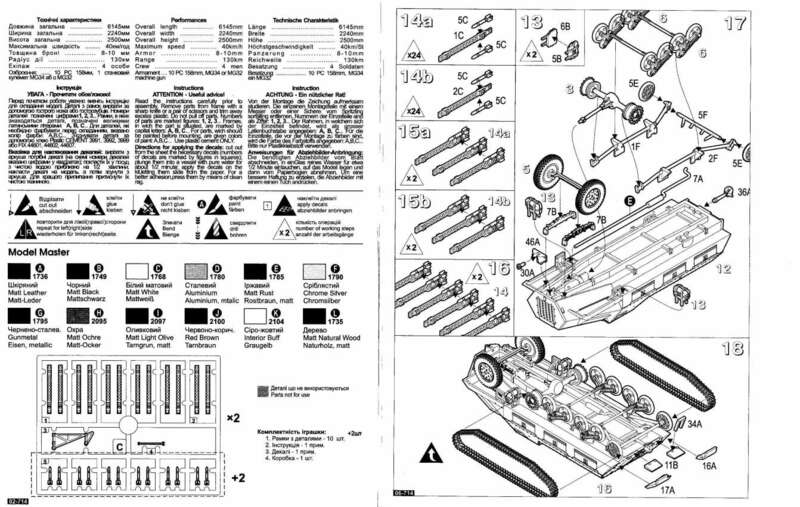 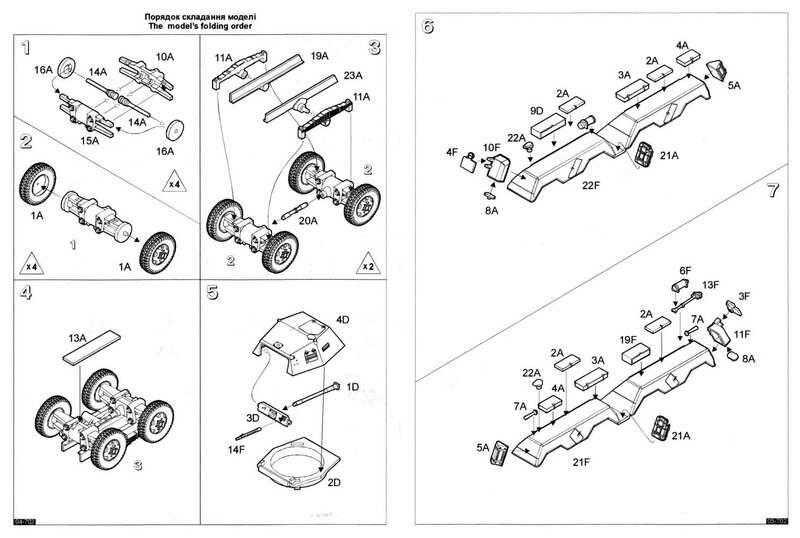 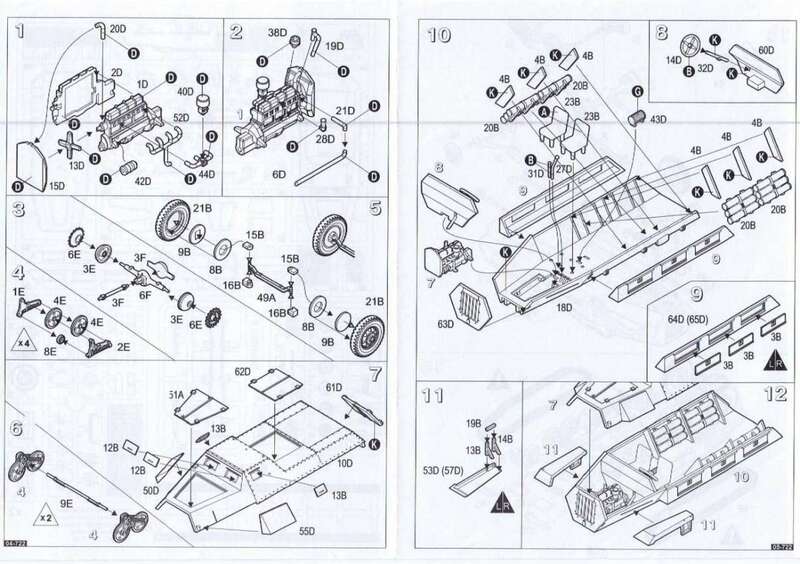 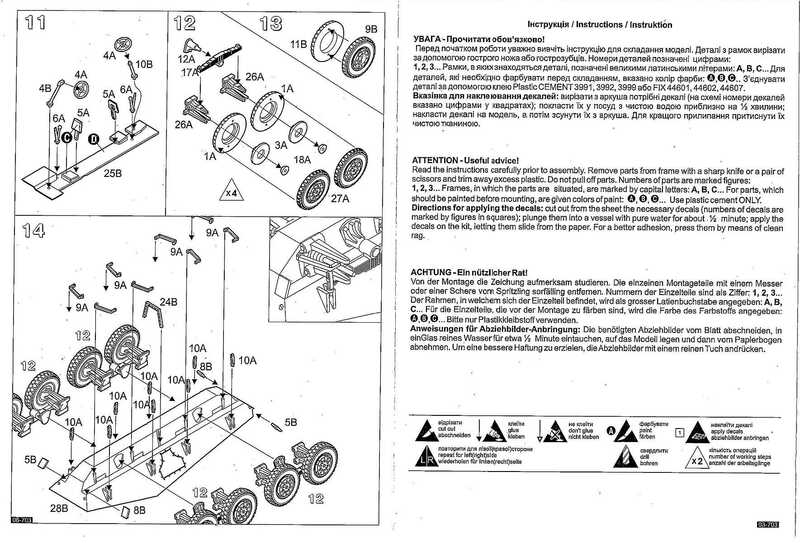 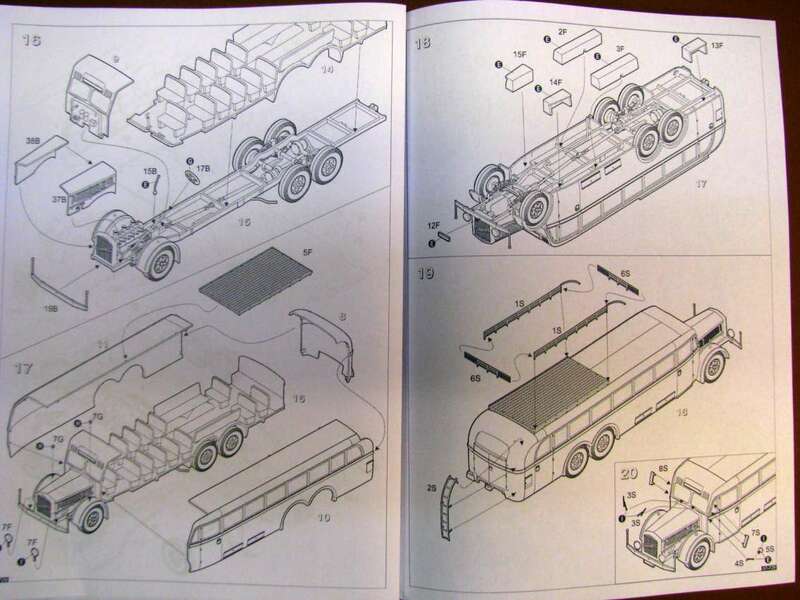 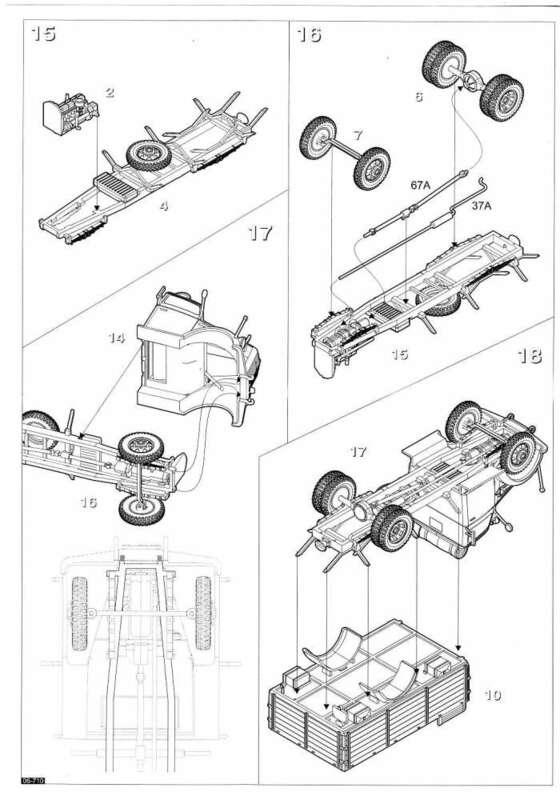 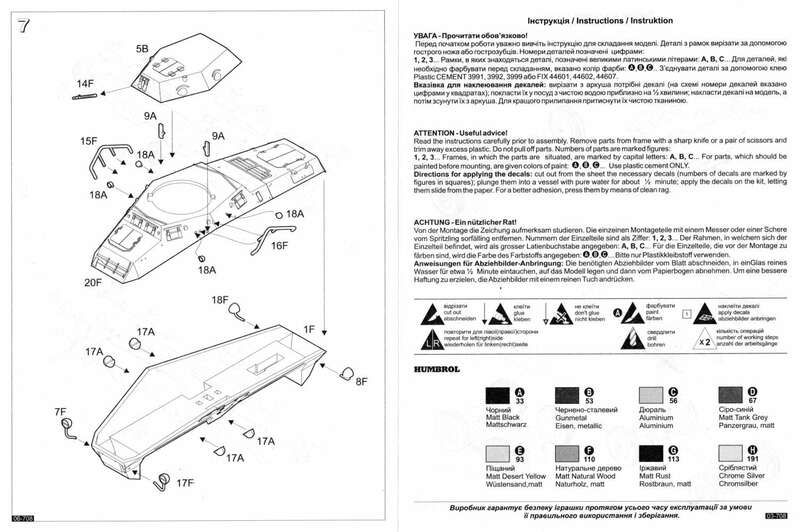 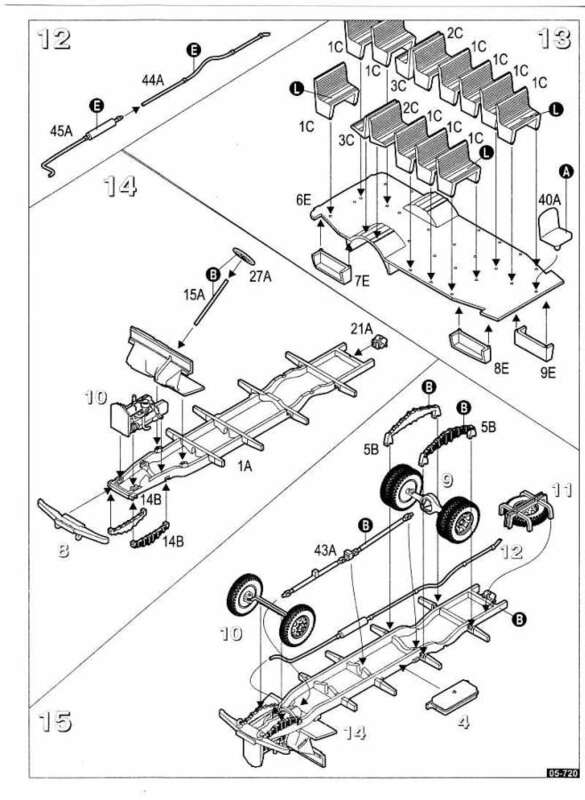 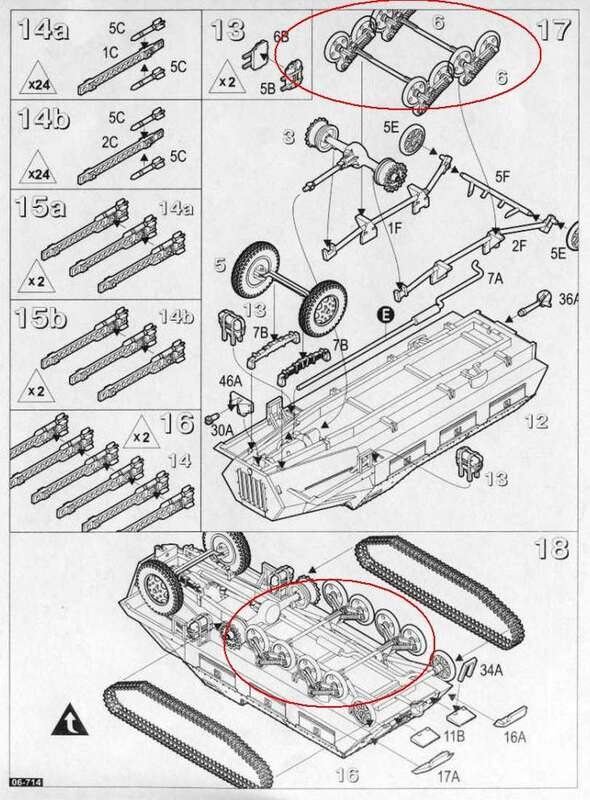 Warning - wrong wheel Layout on instruction manual ! 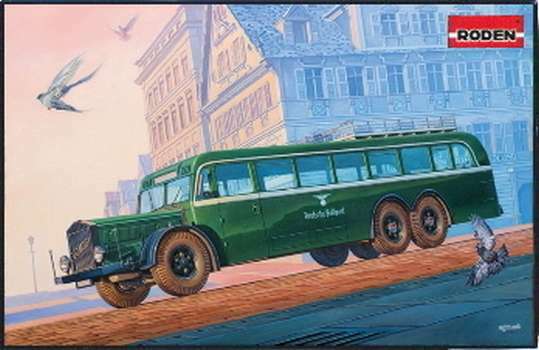 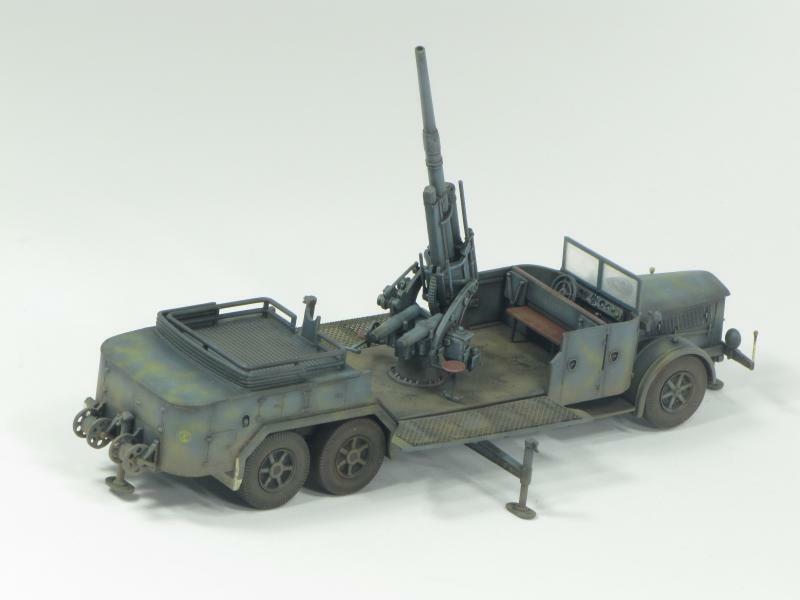 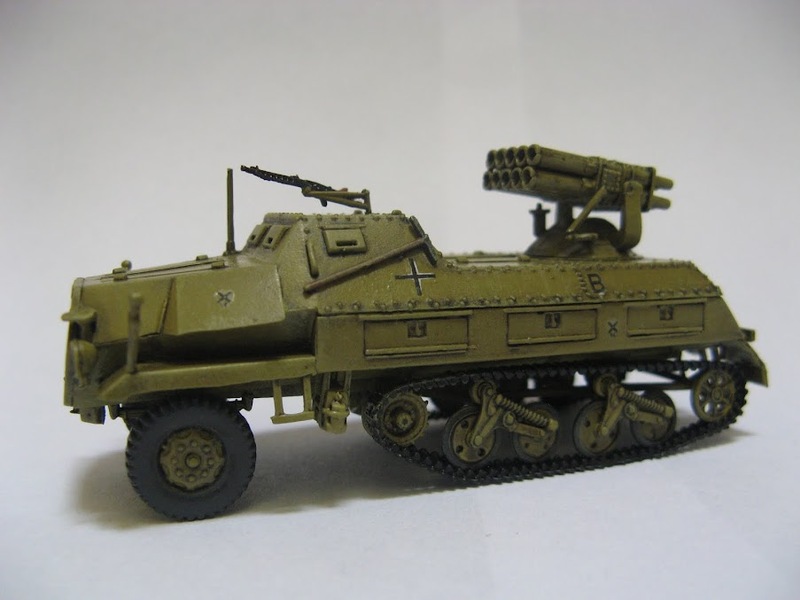 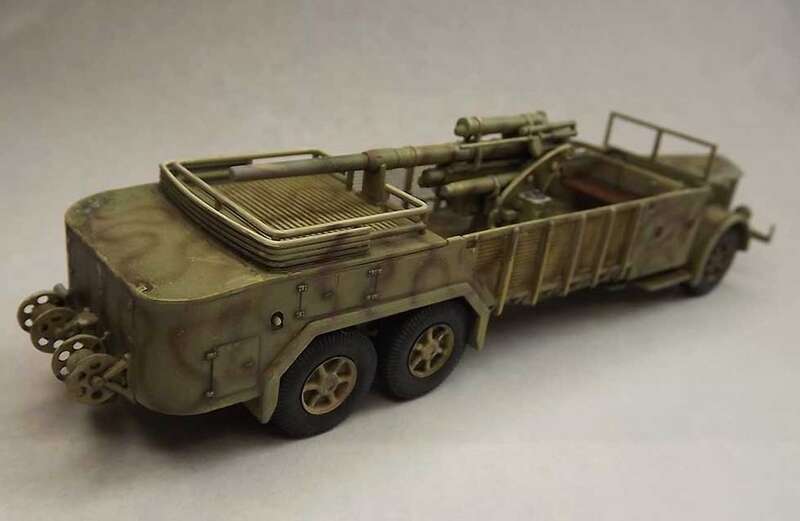 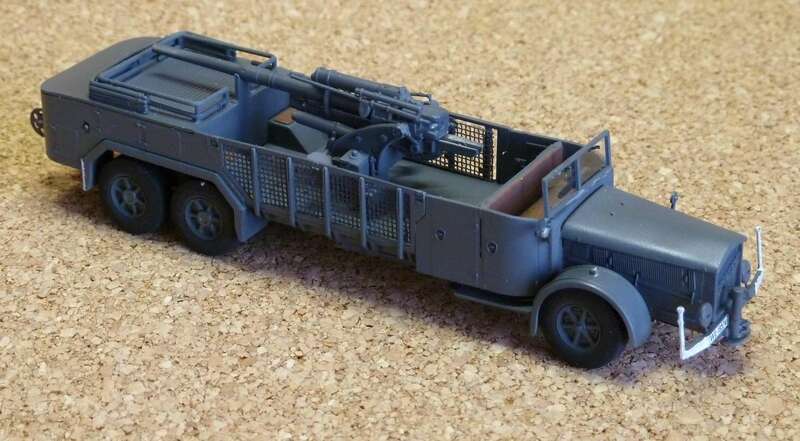 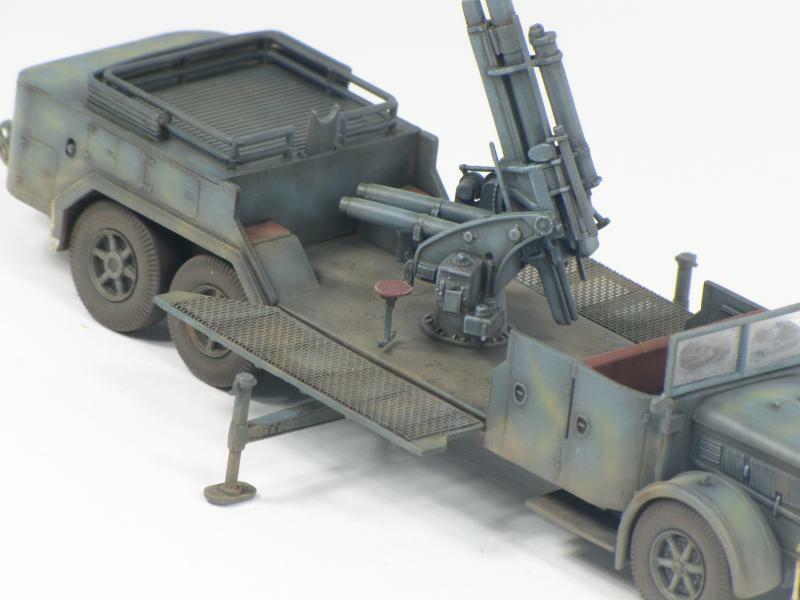 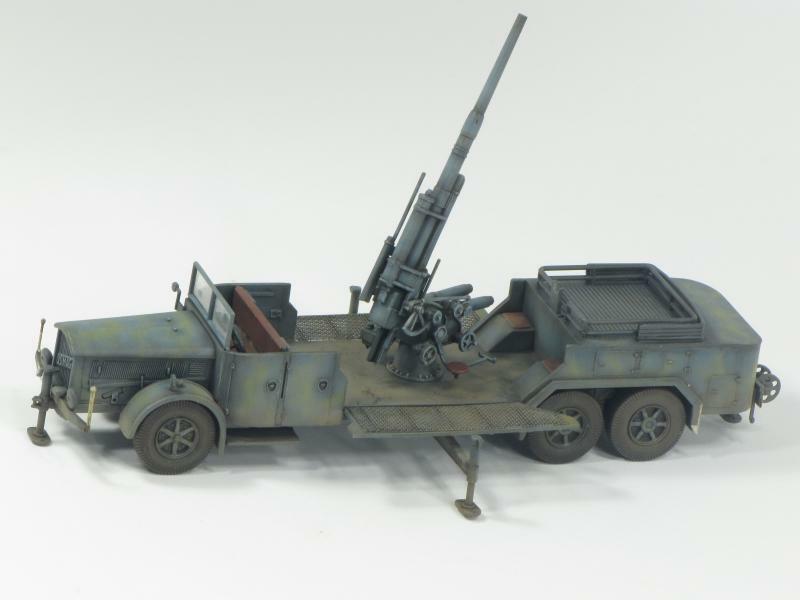 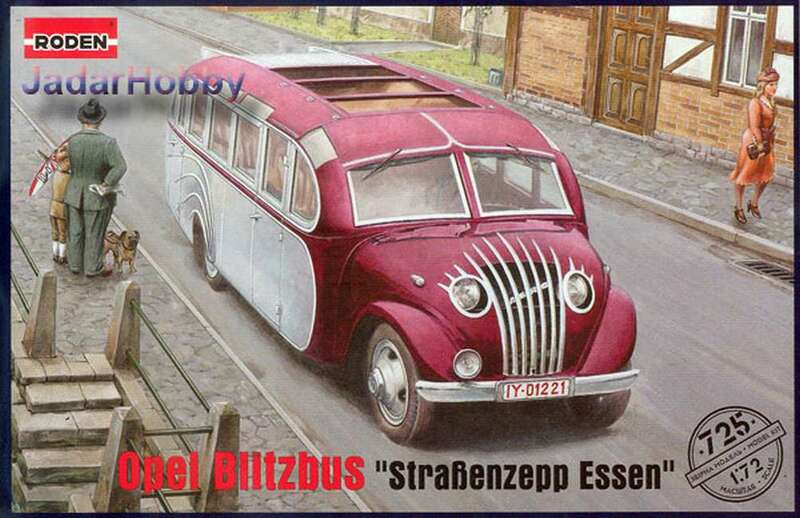 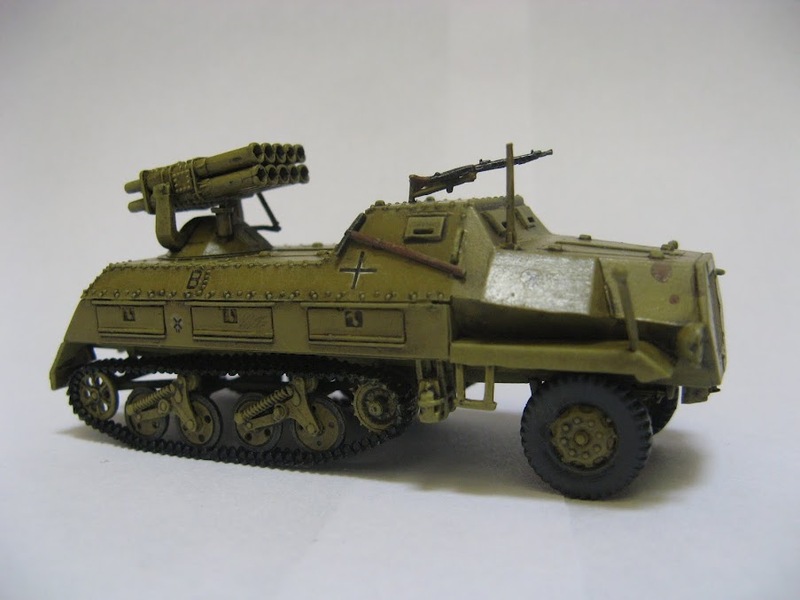 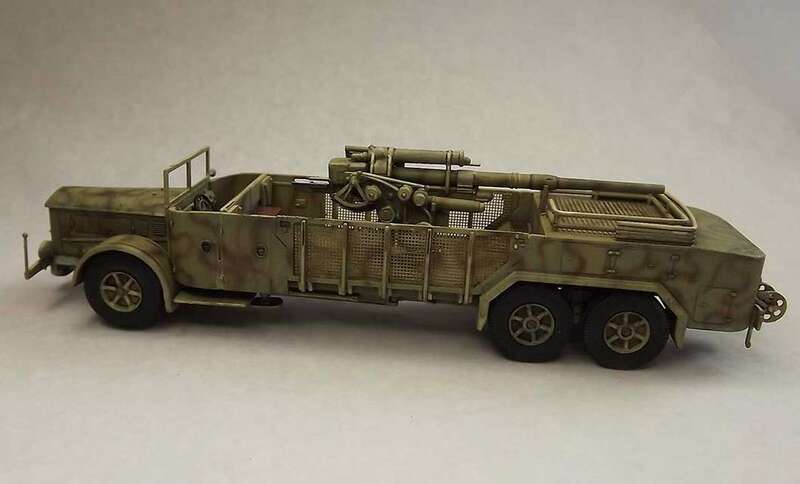 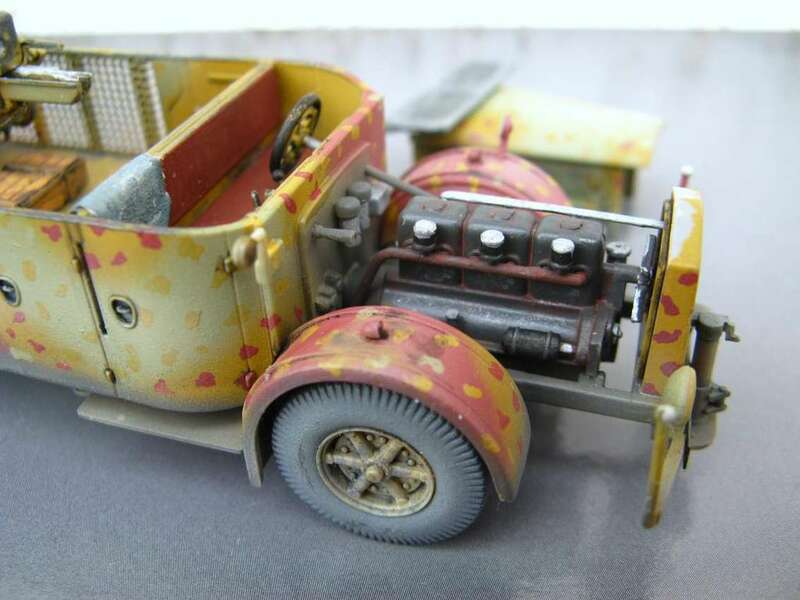 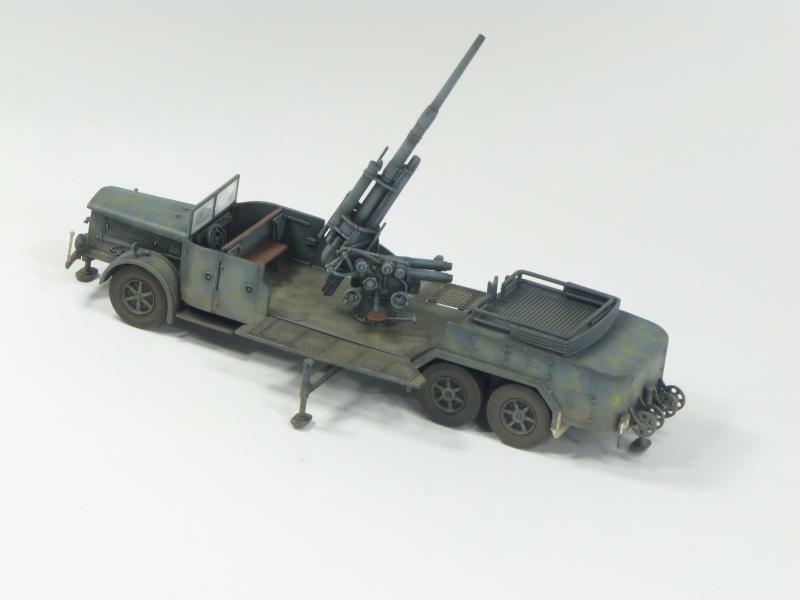 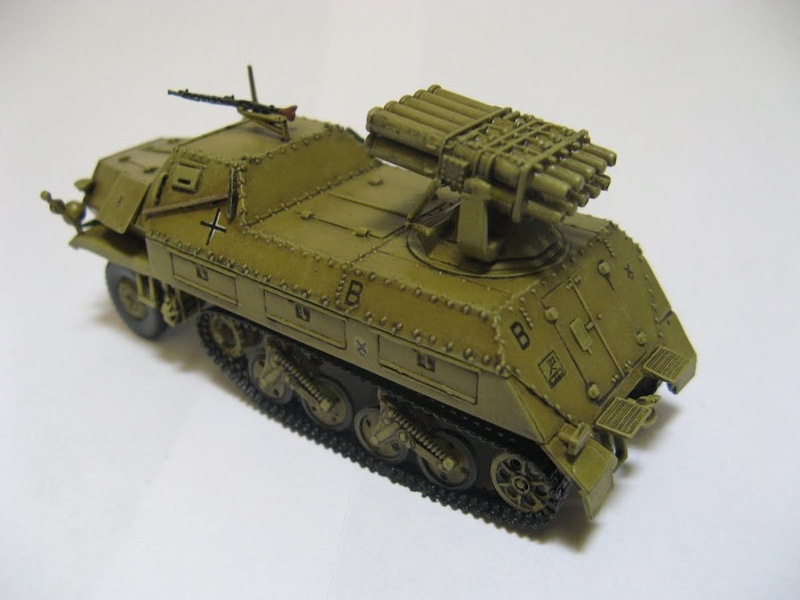 In early 1943 a ten-tube multiple rocket firing system, the Nebelwerfer 41, designed by Rudolf Nebel, was mounted on the chassis of the well-known Opel Blitz Maultier half-track. 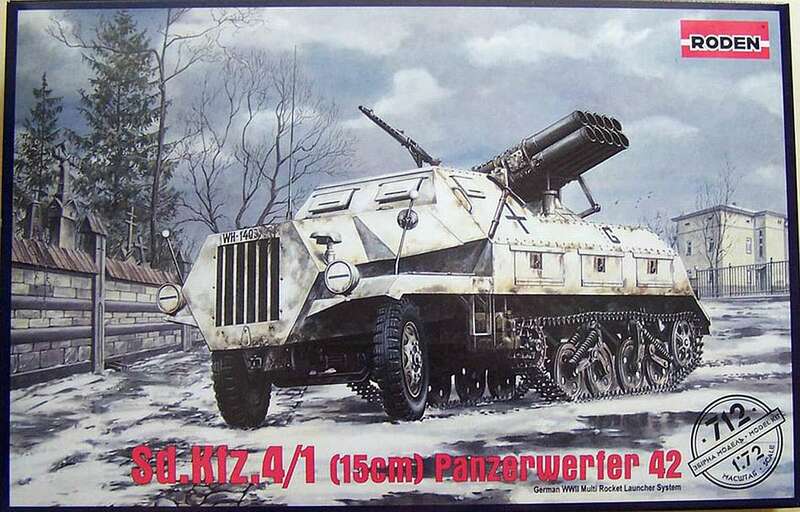 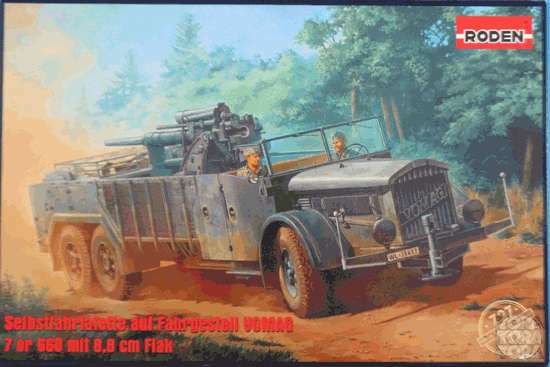 The vehicle, later named the Sd.Kfz.4/1 Panzerwerfer 42, was completely covered with armor of varying thickness, and it offered its crews the potential of a responsive self-propelled artillery piece with significant advantages in case of firing, being able to quickly move away from the very visible smoke trails. 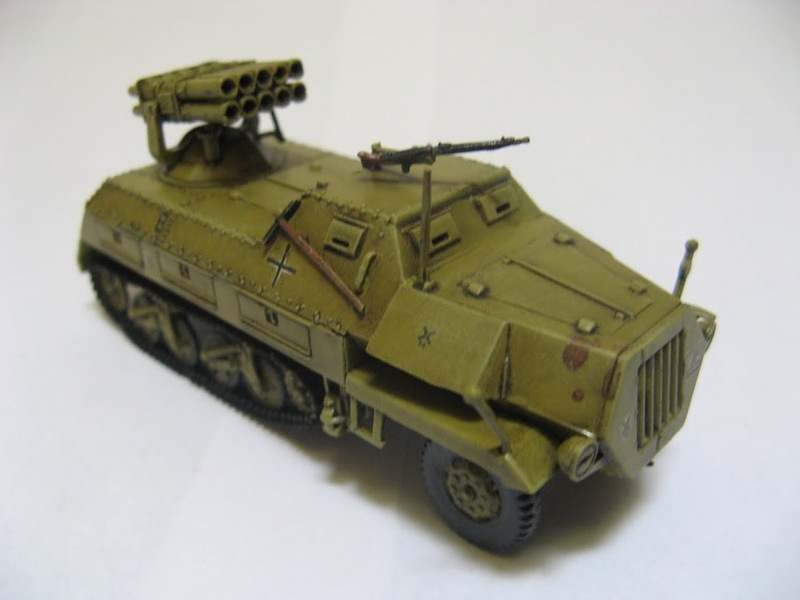 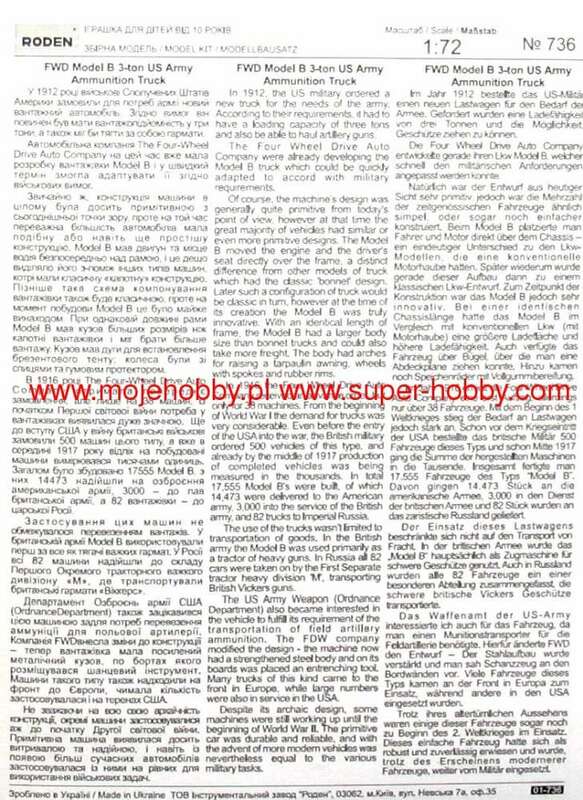 The 158-mm rocket system designed by Nebel was a near-perfect development and quite different from its Soviet counterpart (the famous BM-13 Katyusha), with greater accuracy of shooting. 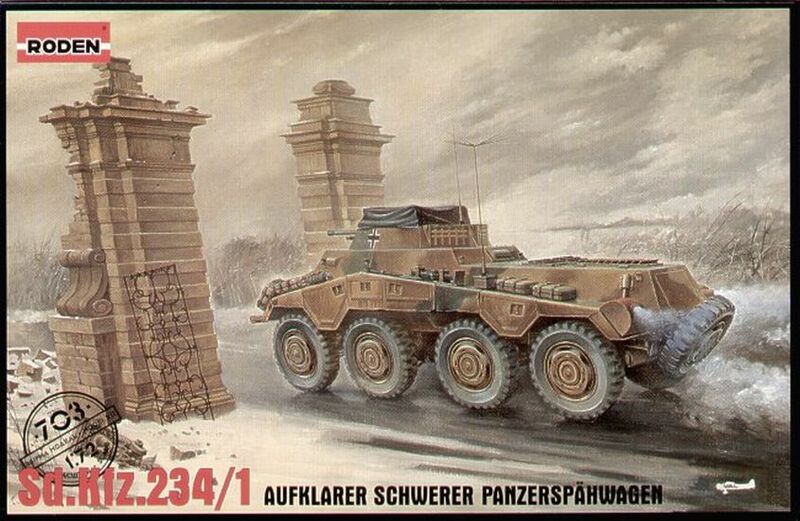 By 1943 the first production Panzerwerfers were sent to fighting units on the Eastern Front. 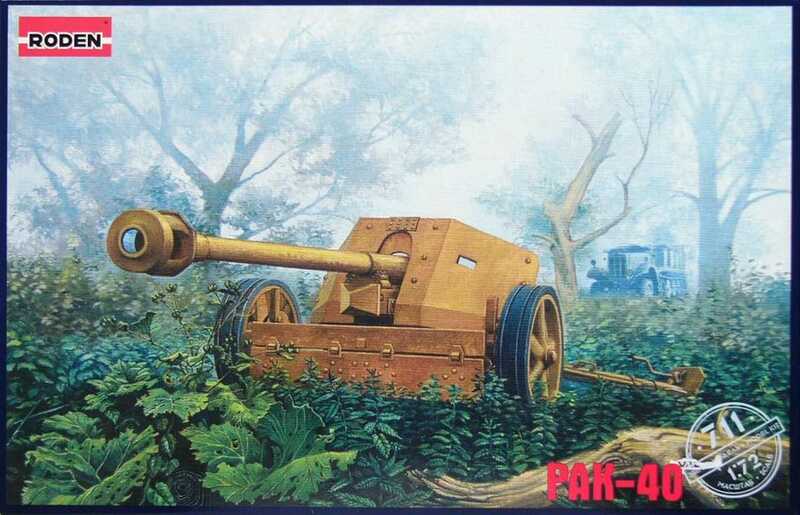 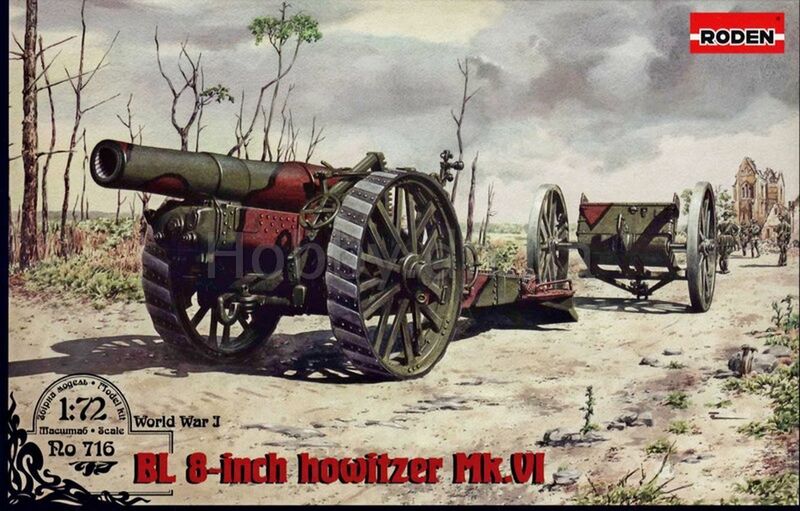 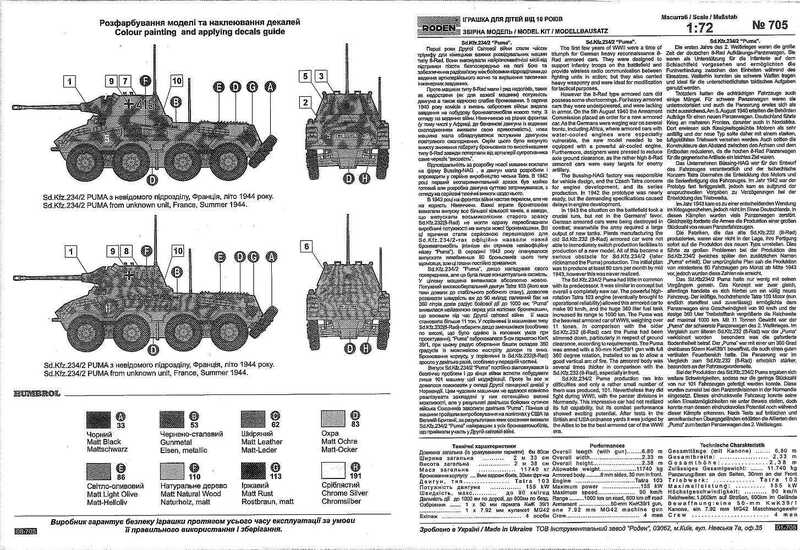 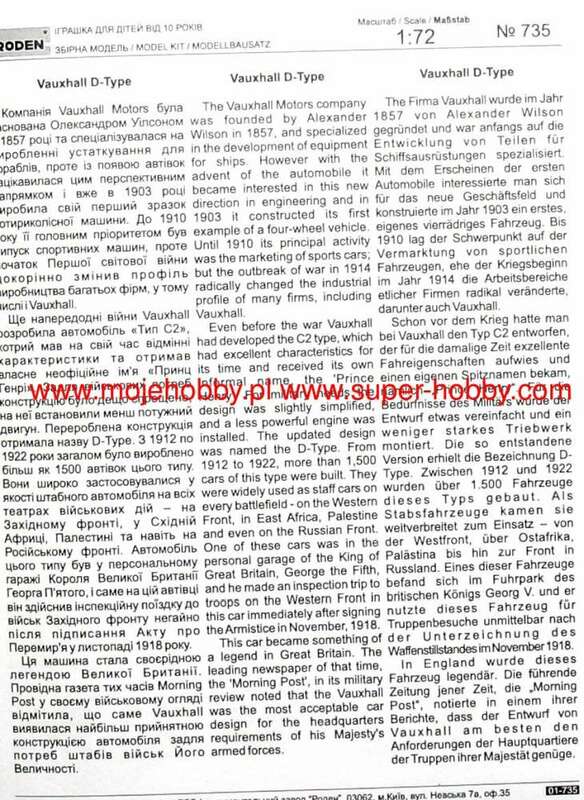 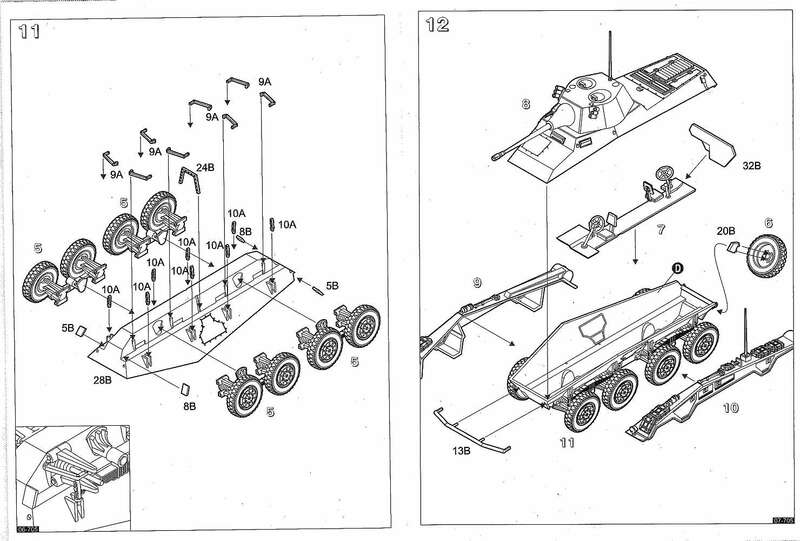 Production of the self-propelled artillery was very slow, and so the use of these vehicles was quite limited. 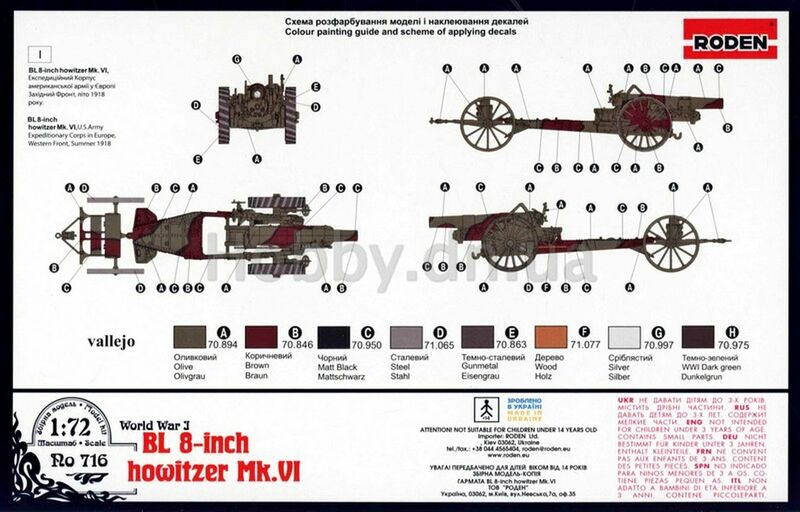 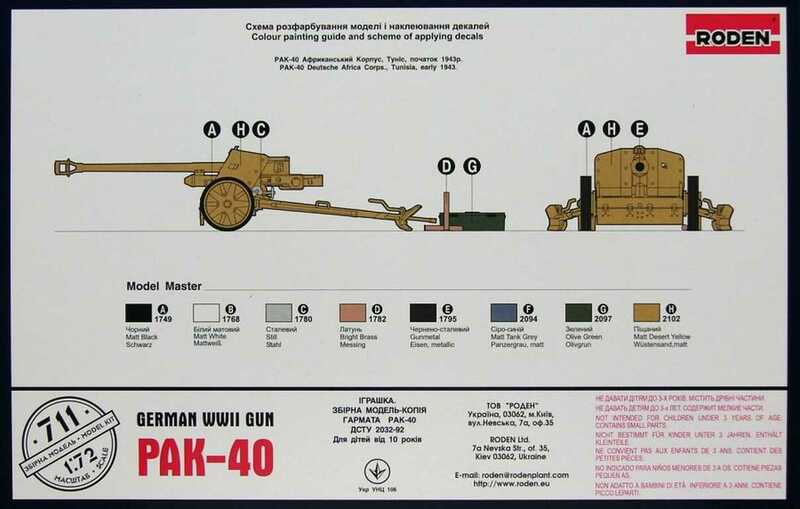 The main drawback of the machine was the relatively small amount of ammunition available per vehicle - each Panzerwerfer 42 could transport only ten 34-kilogram rounds during combat operations in the launcher installation itself, above the armored body, and another ten within the hull. 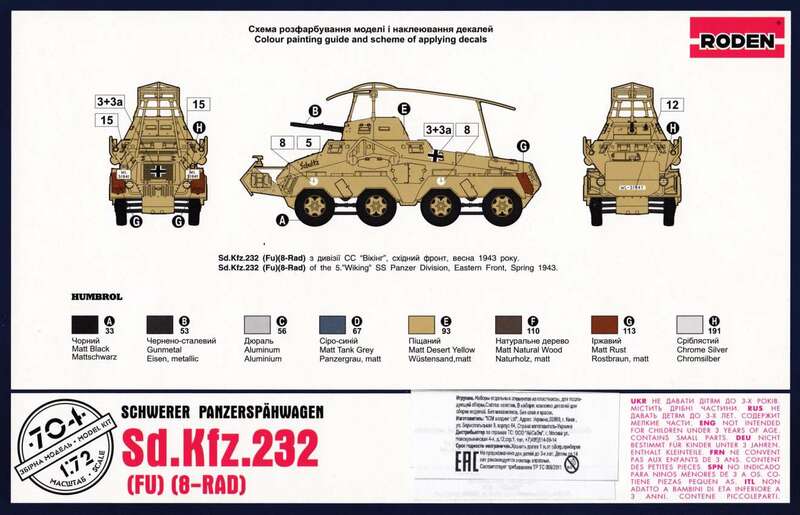 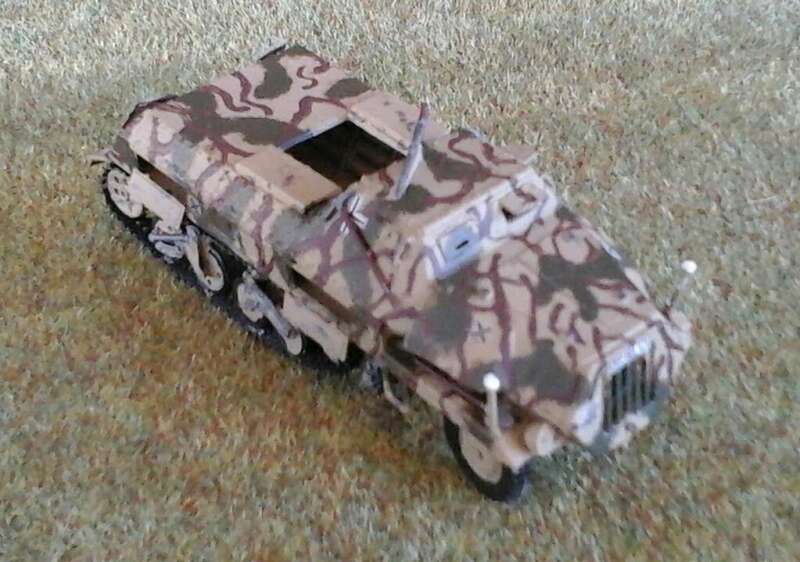 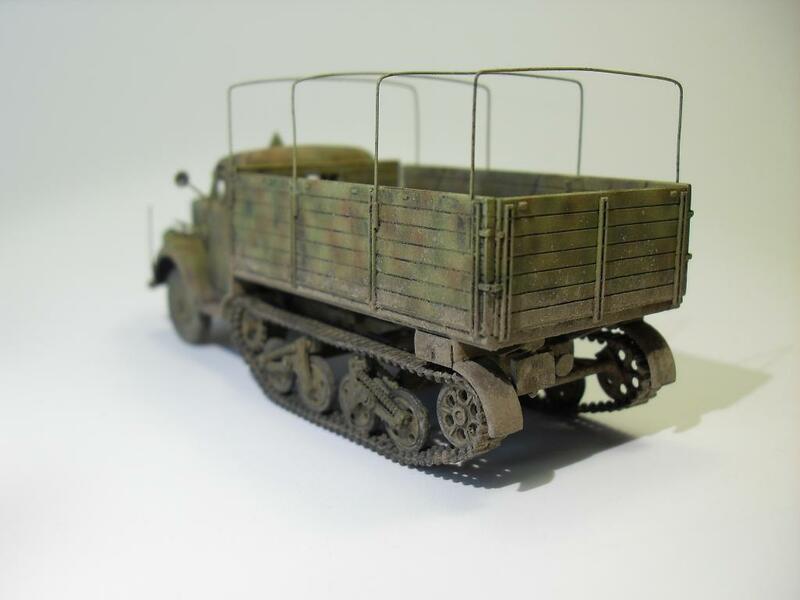 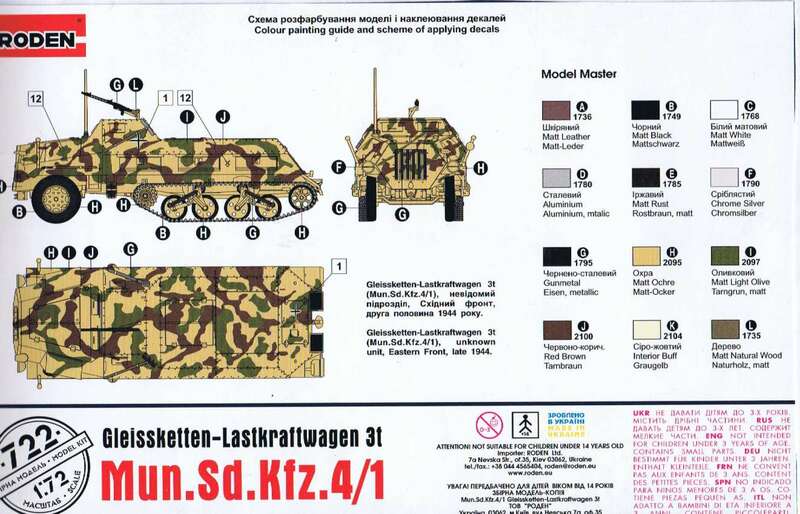 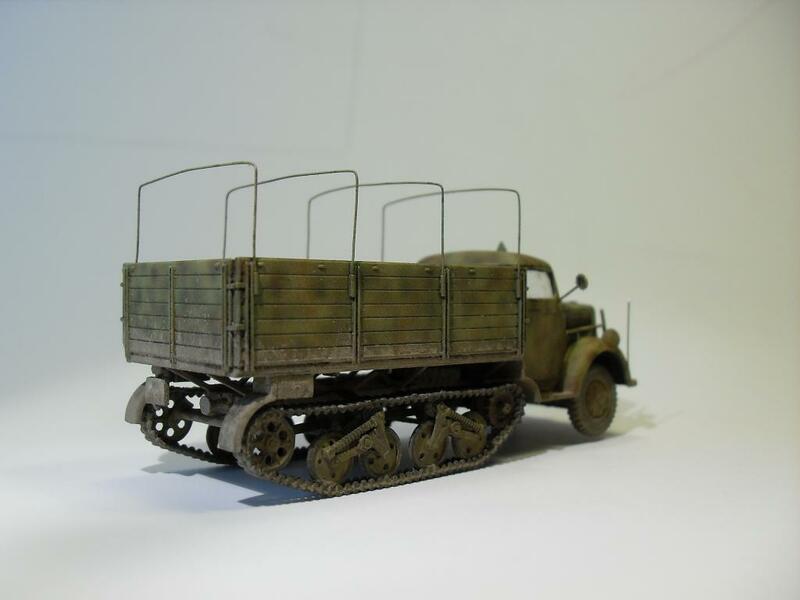 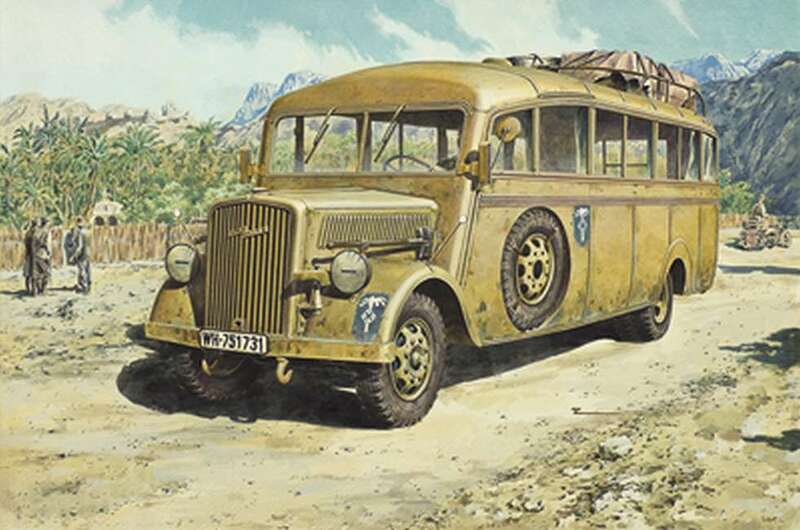 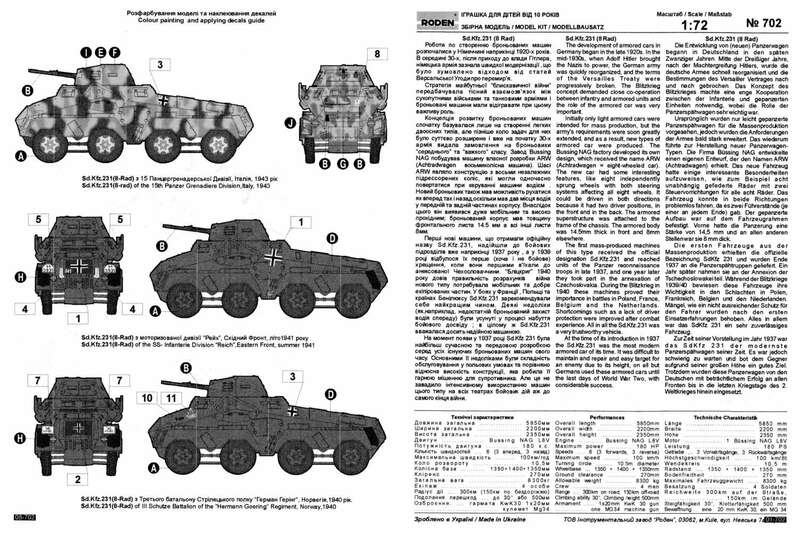 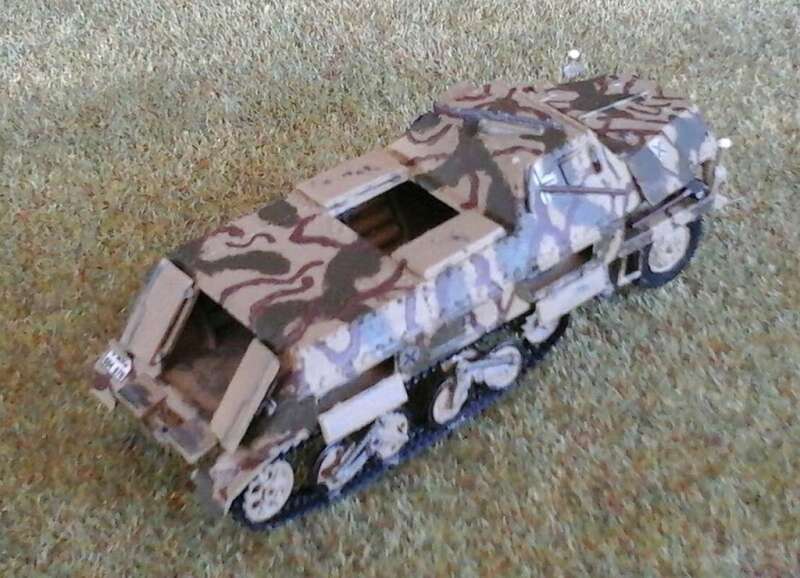 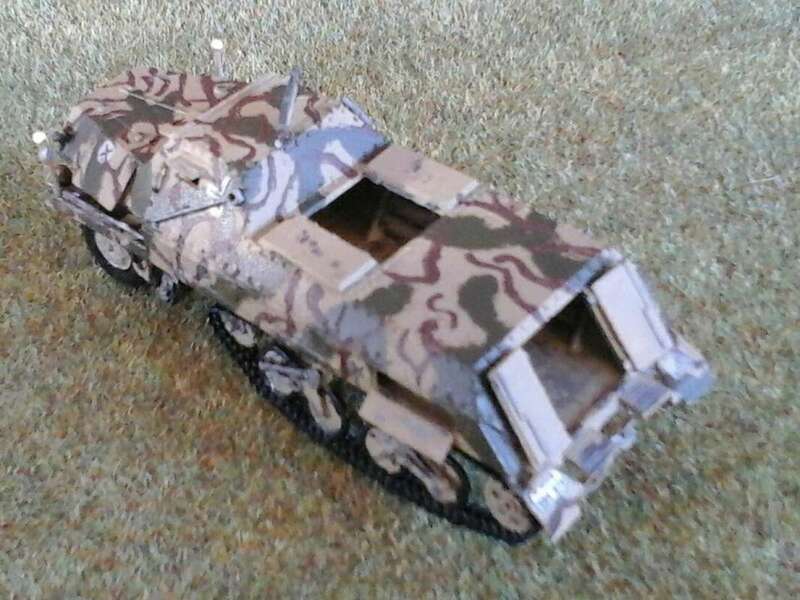 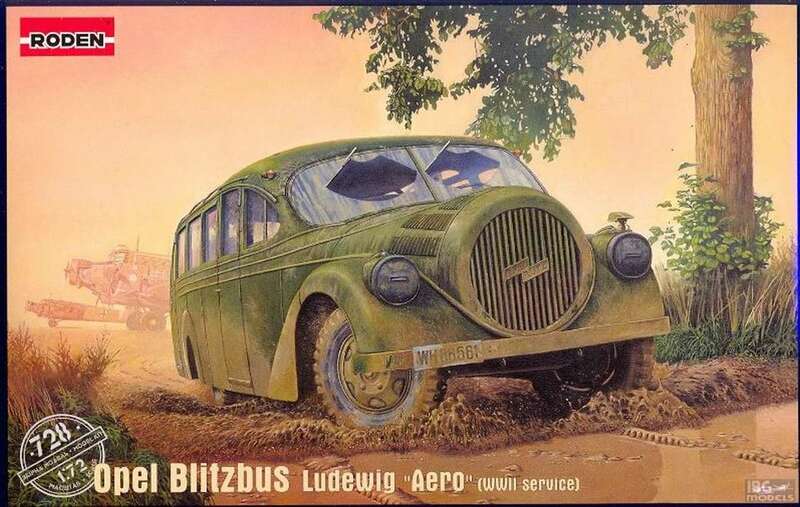 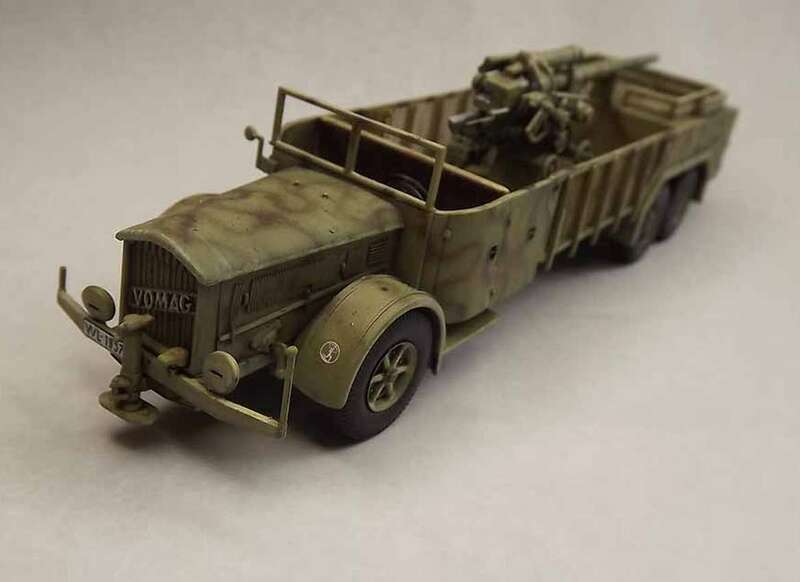 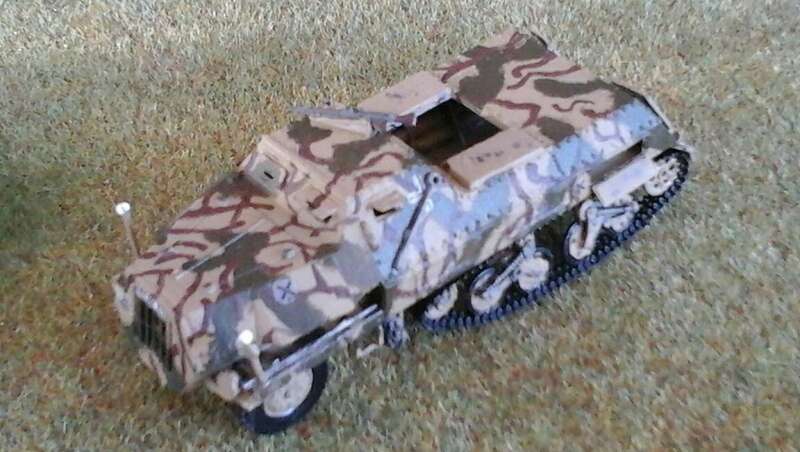 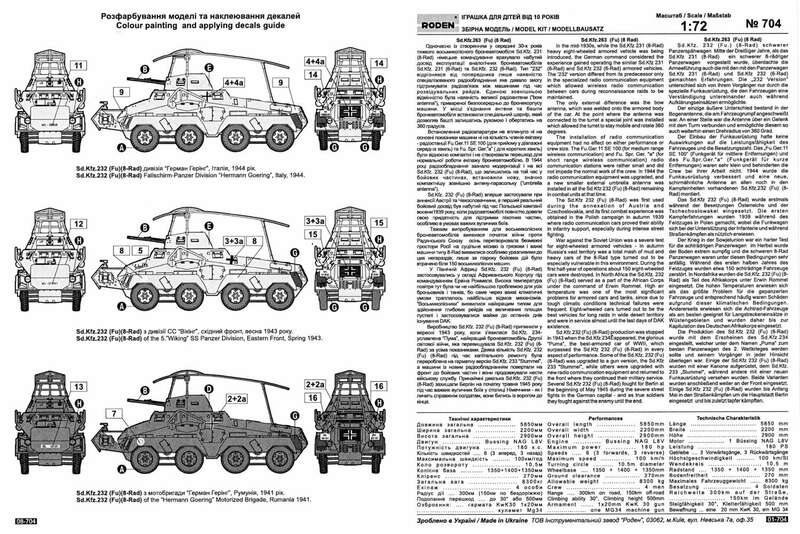 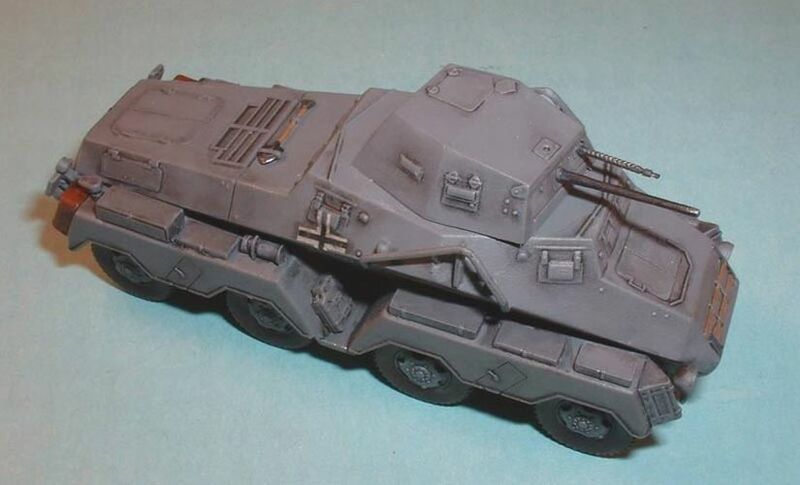 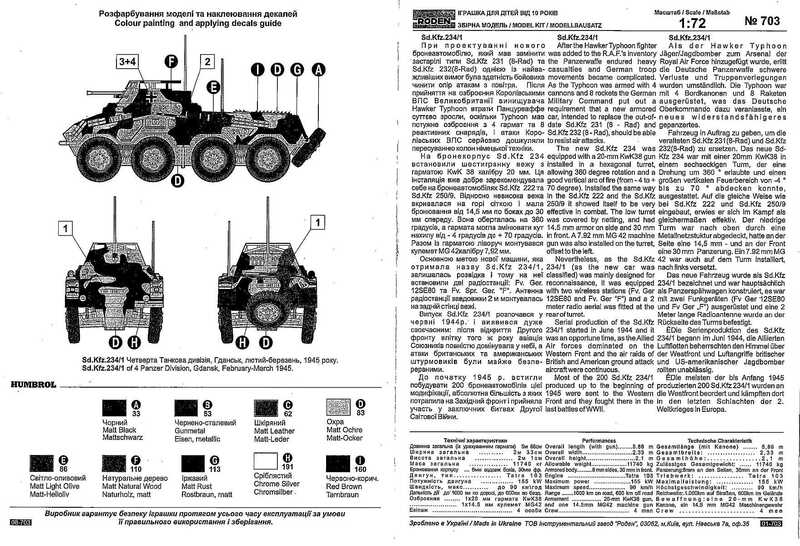 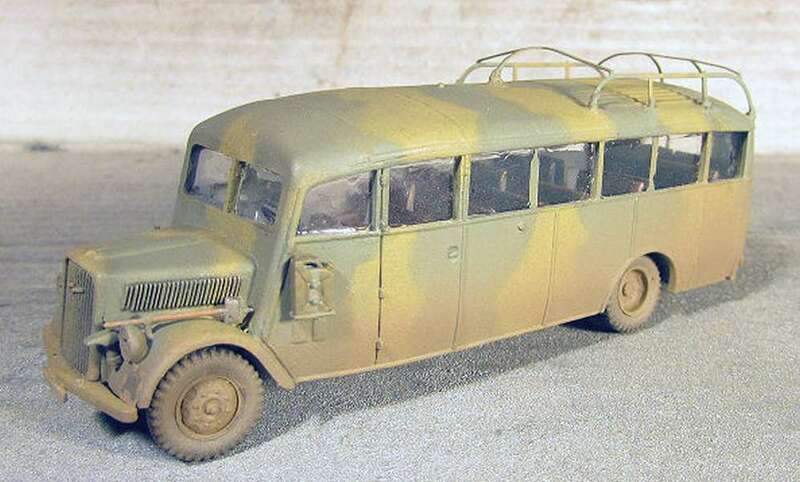 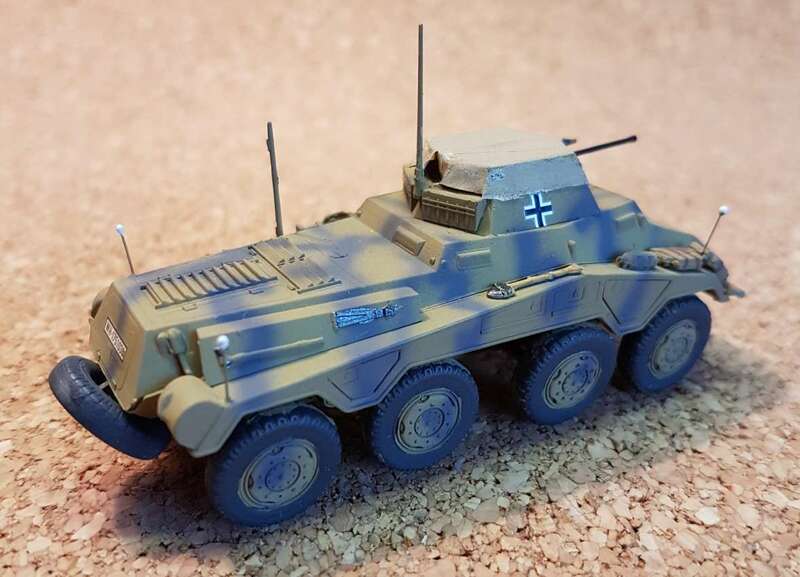 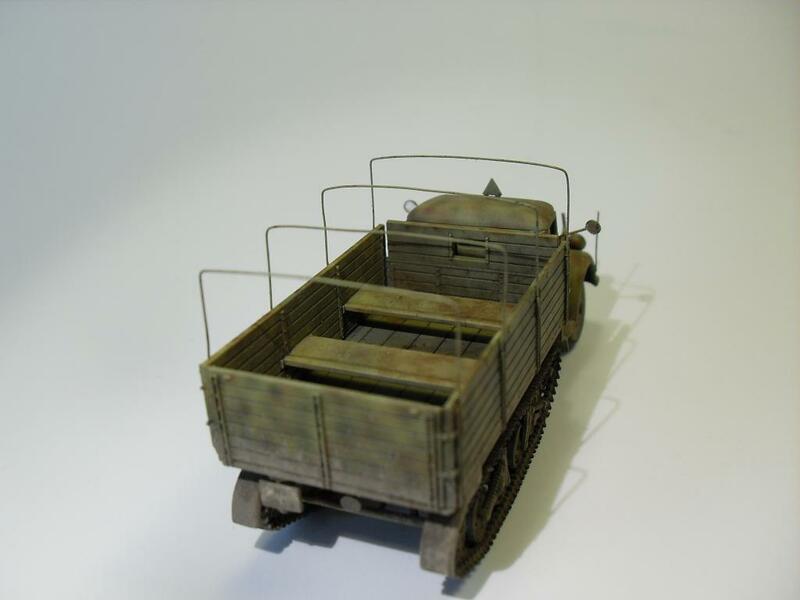 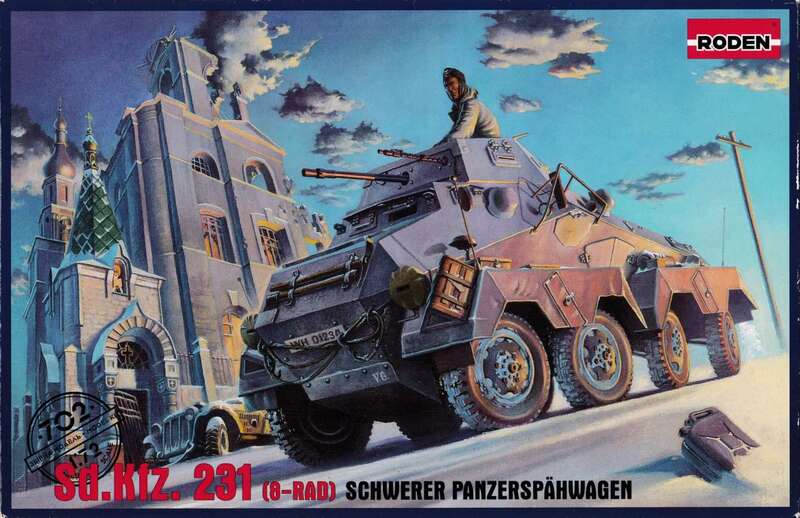 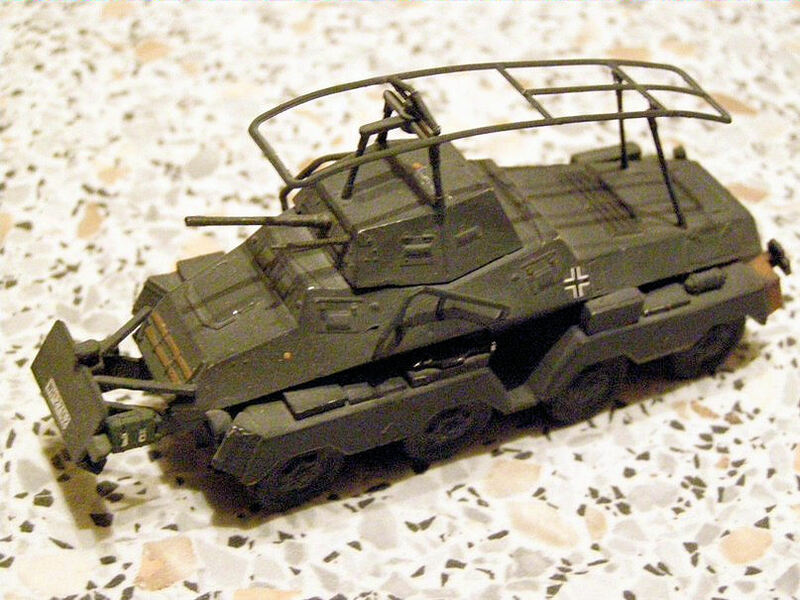 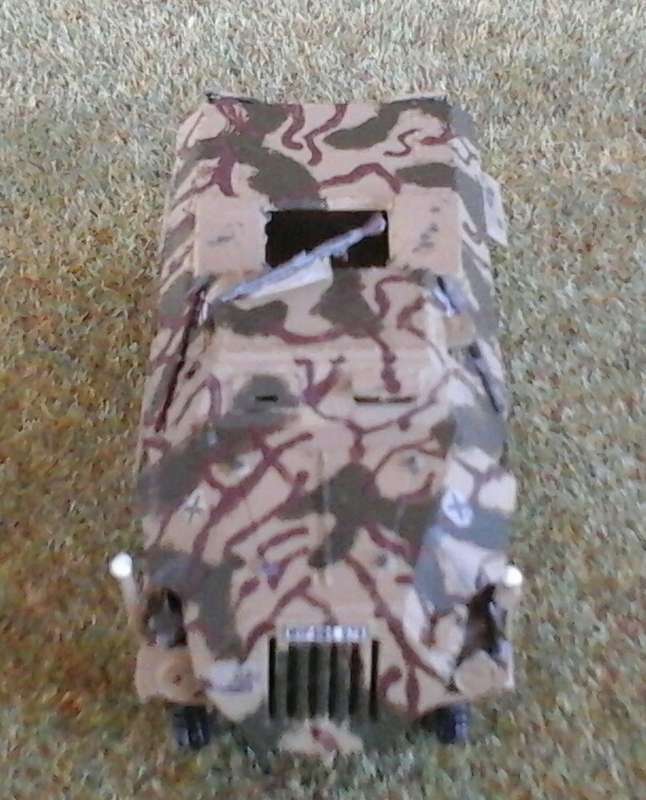 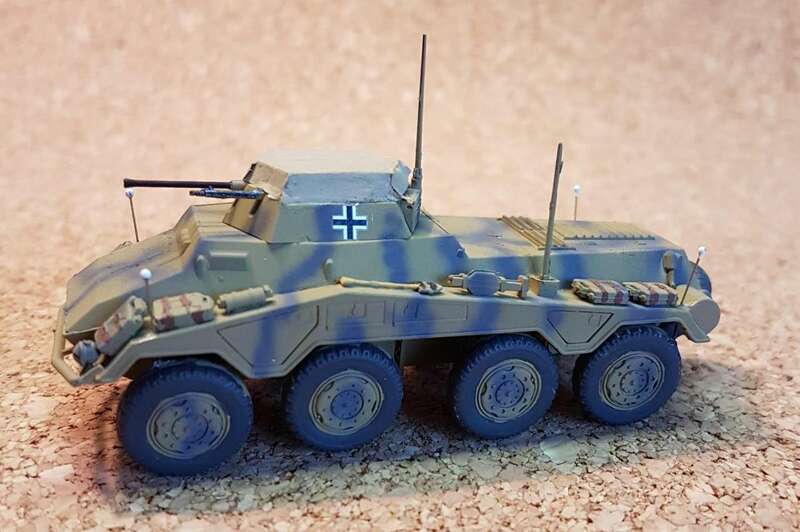 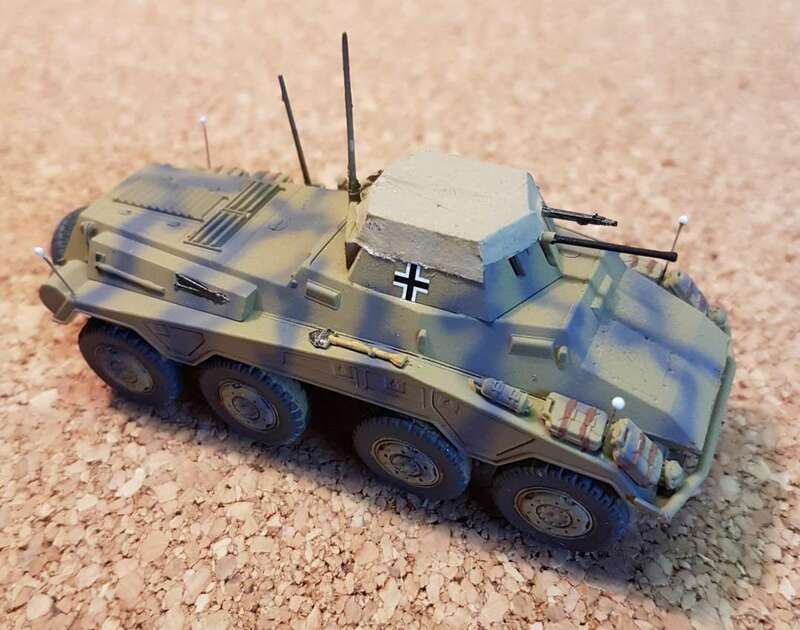 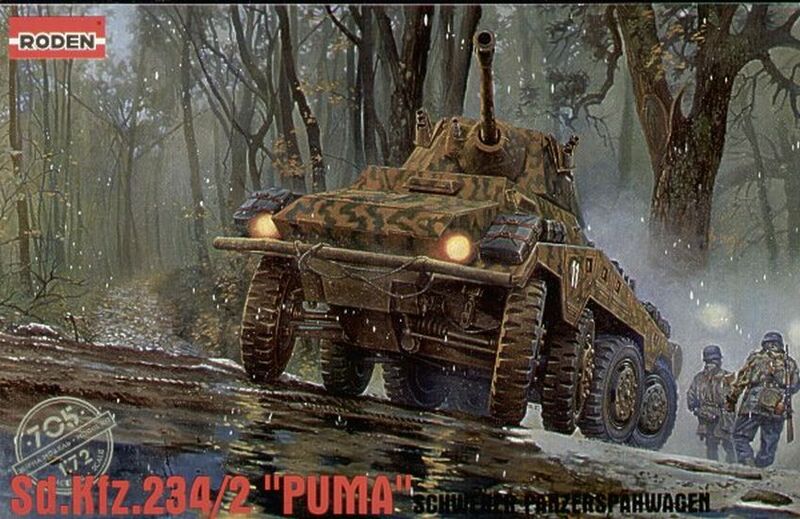 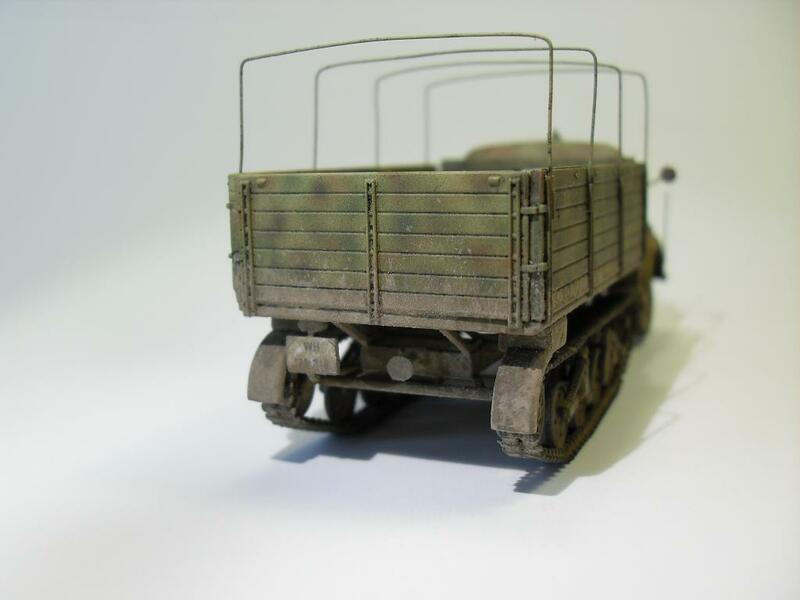 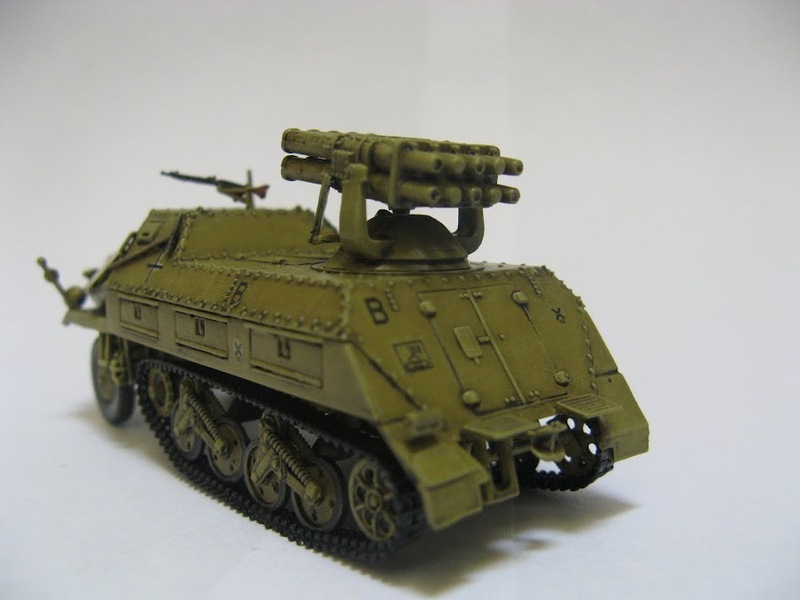 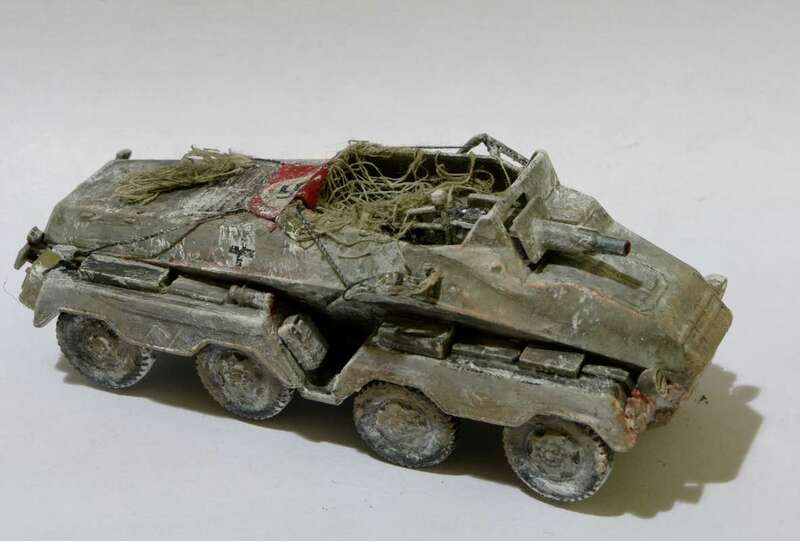 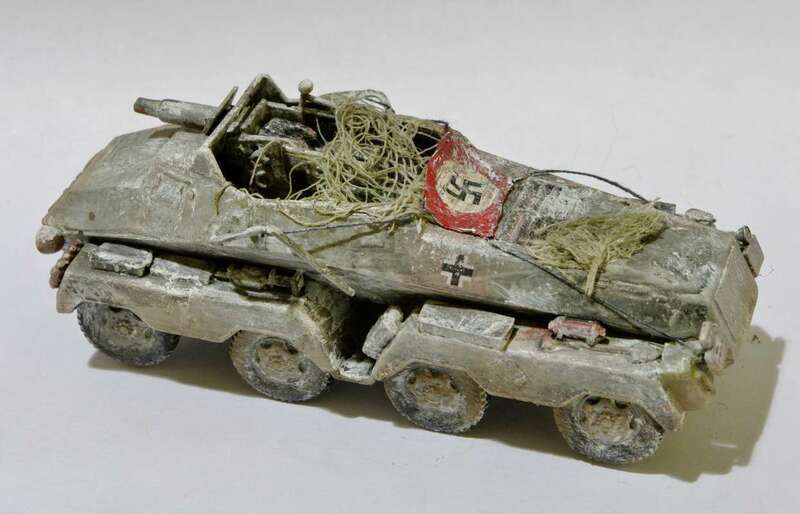 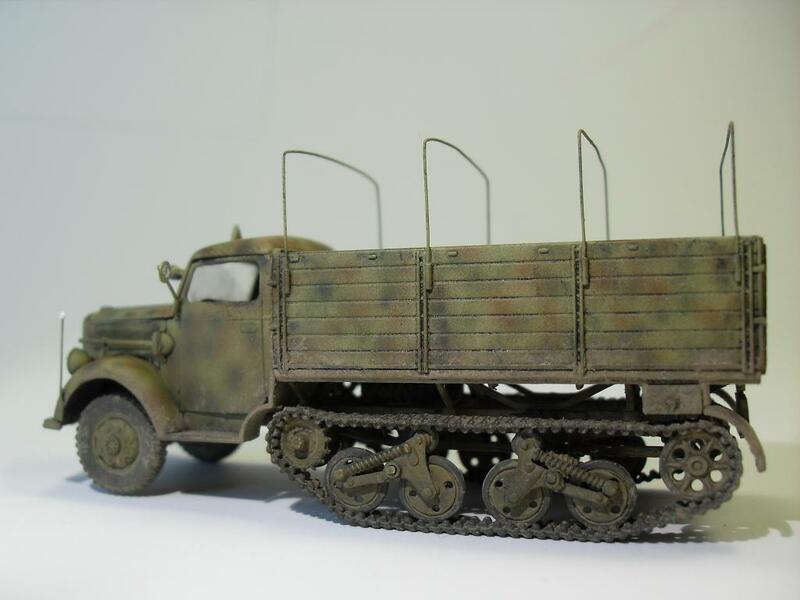 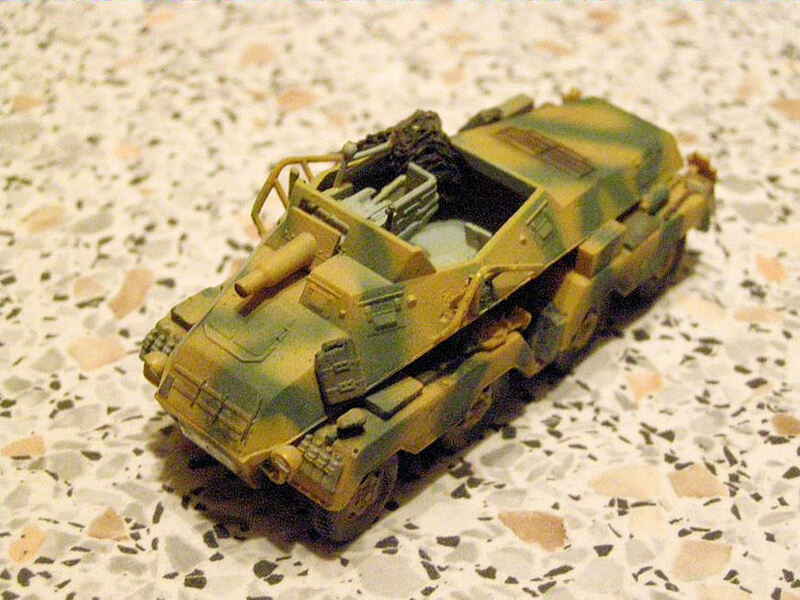 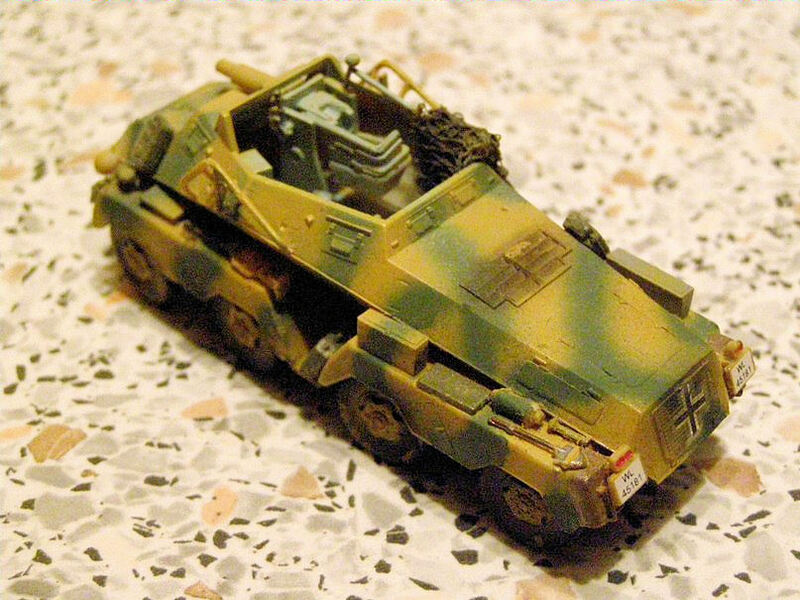 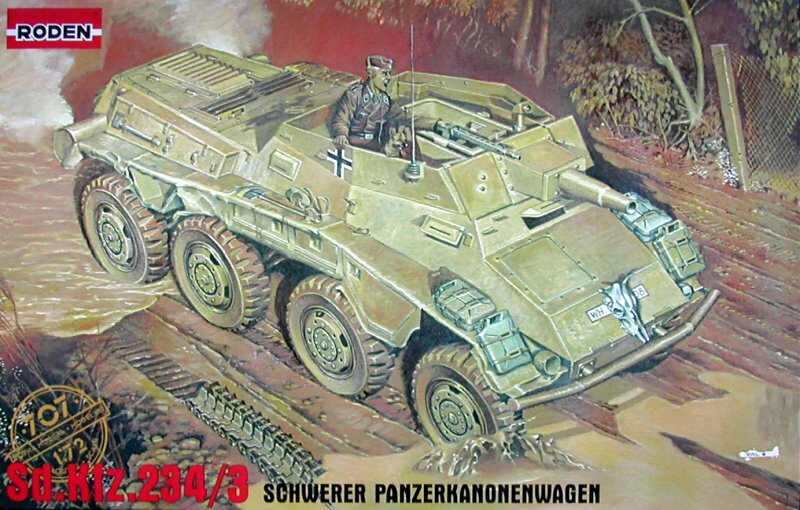 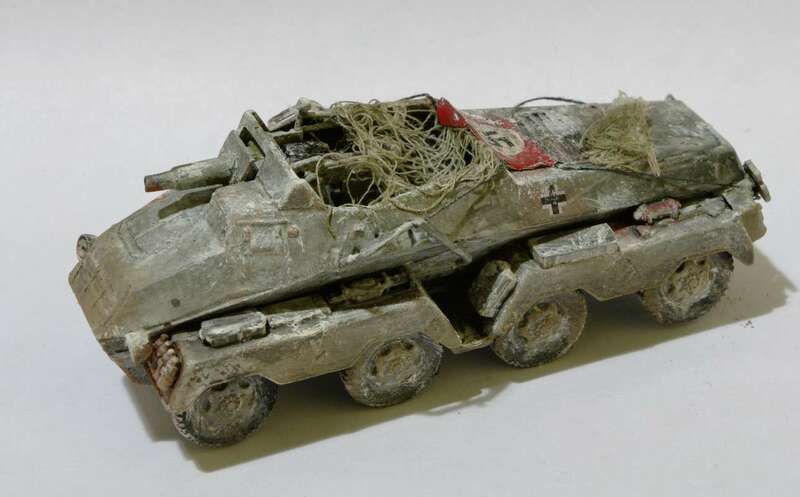 First, there was a plan to introduce the Sd.Kfz.250 half track for the transportation of additional ammunition into the organisation of combat units; however, the idea was later abandoned because of its ineffectiveness. 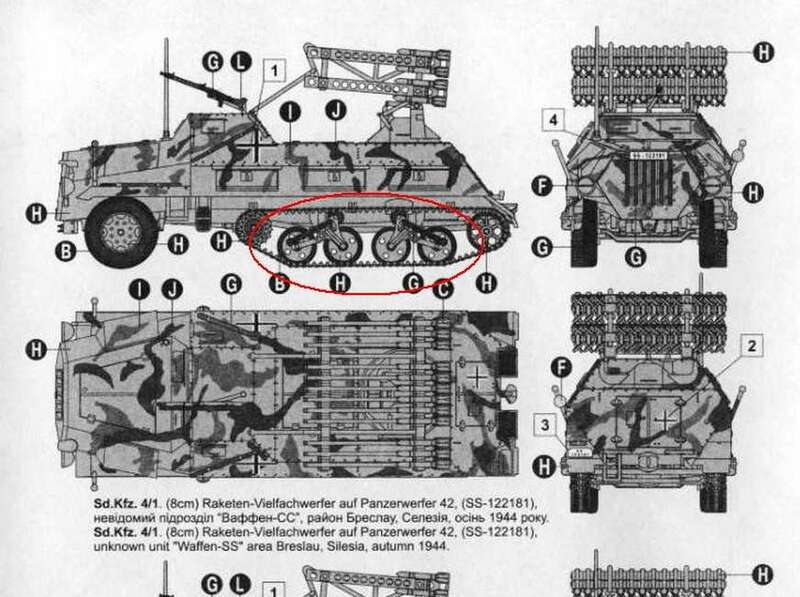 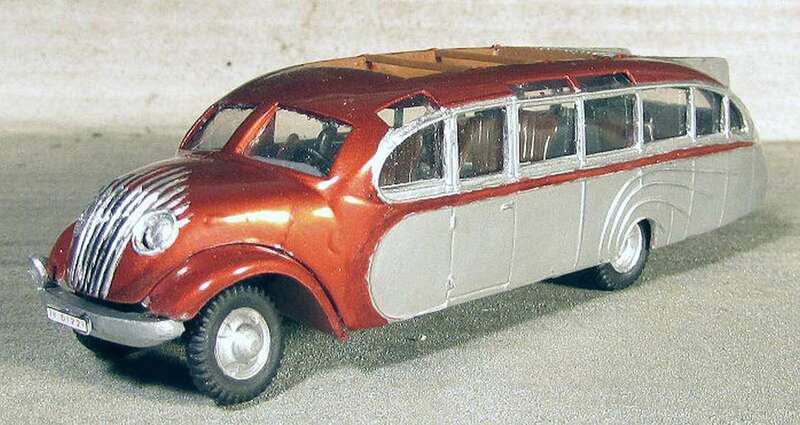 It was decided to create an ammunition transporter on the exact same chassis and with the same design as the Panzerwerfer 42. 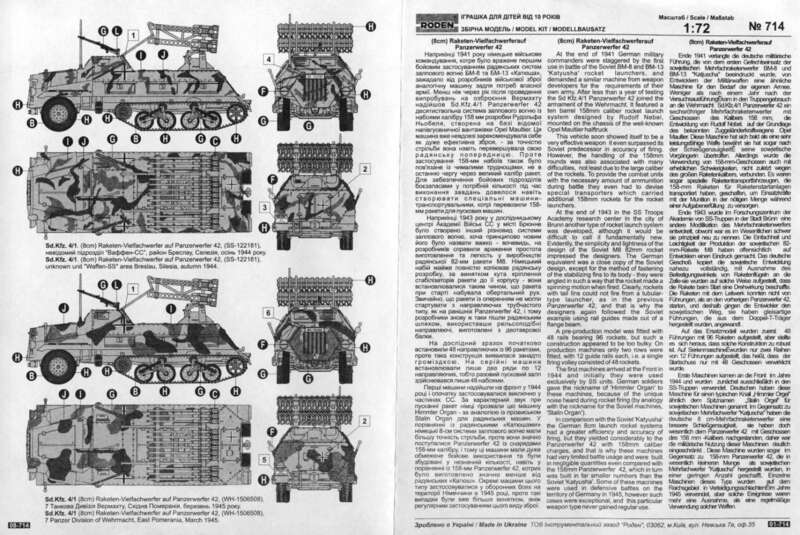 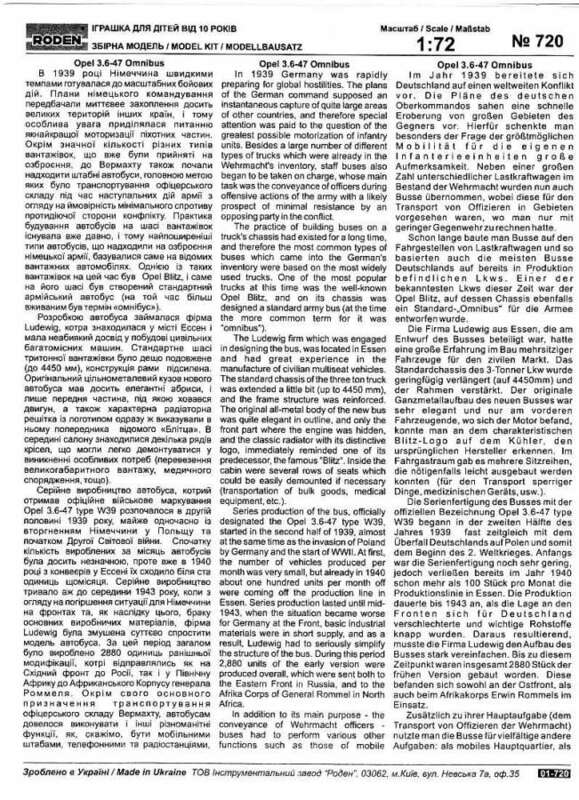 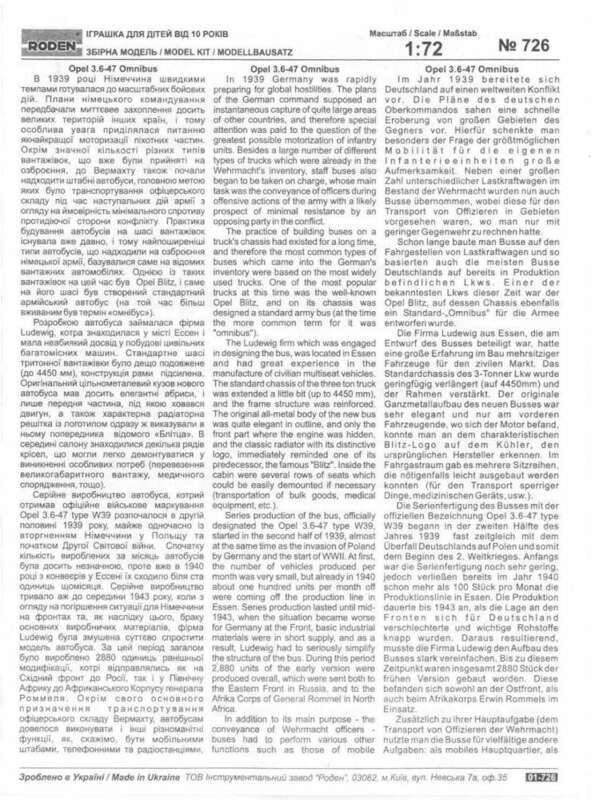 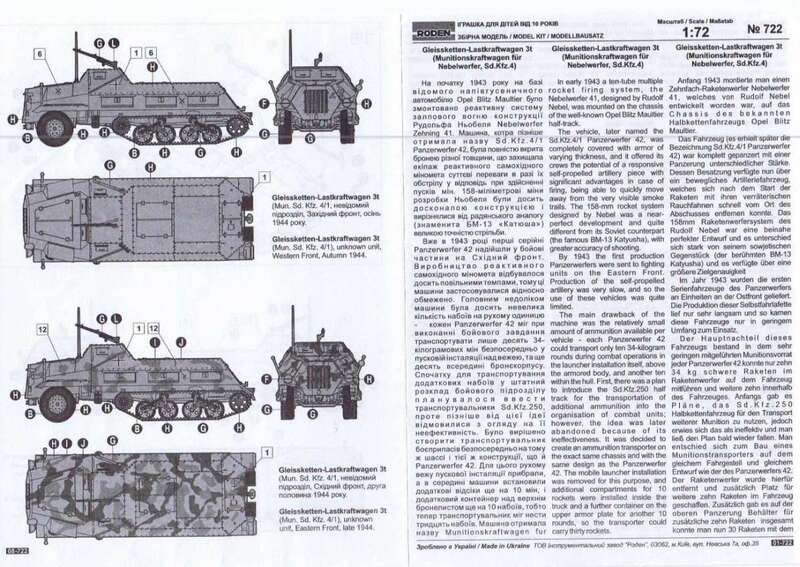 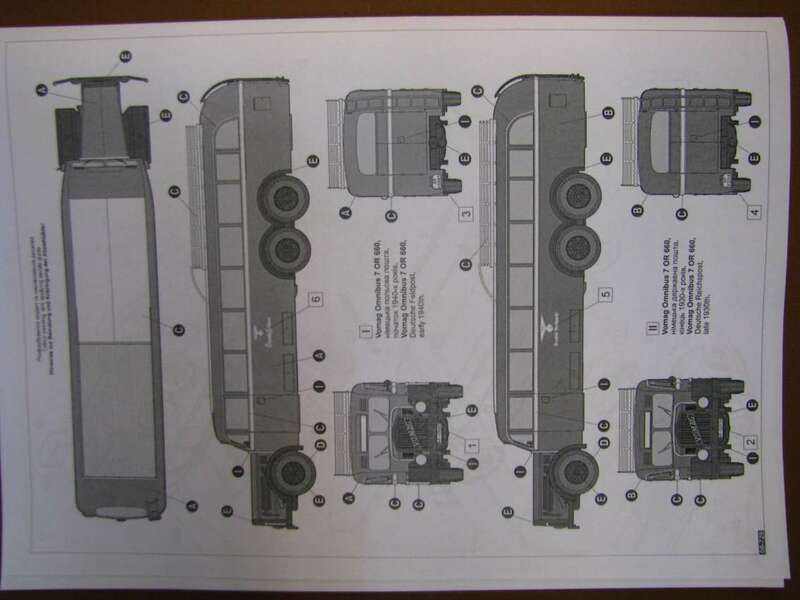 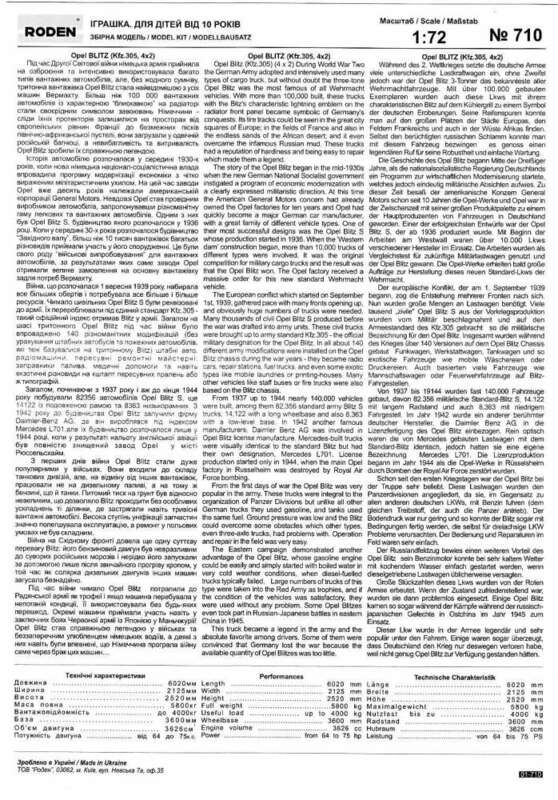 The mobile launcher installation was removed for this purpose, and additional compartments for 10 rockets were installed inside the truck and a further container on the upper armor plate for another 10 rounds, so the transporter could carry thirty rockets. 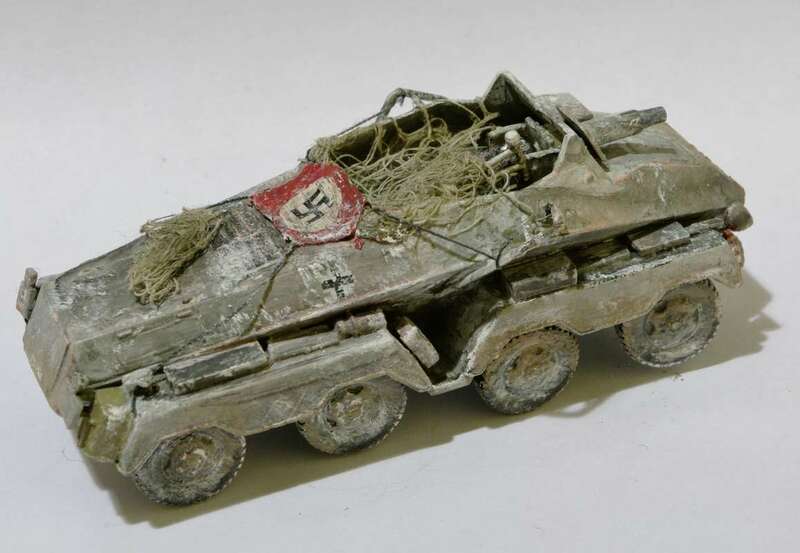 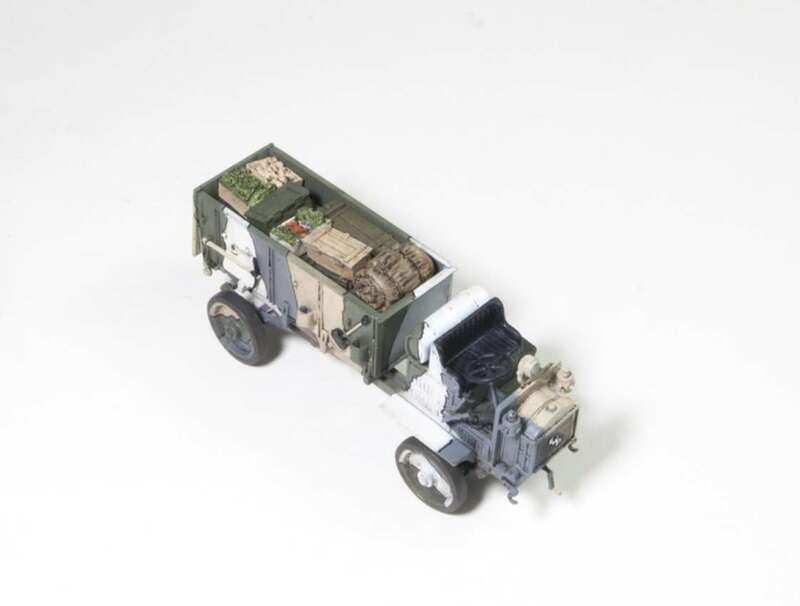 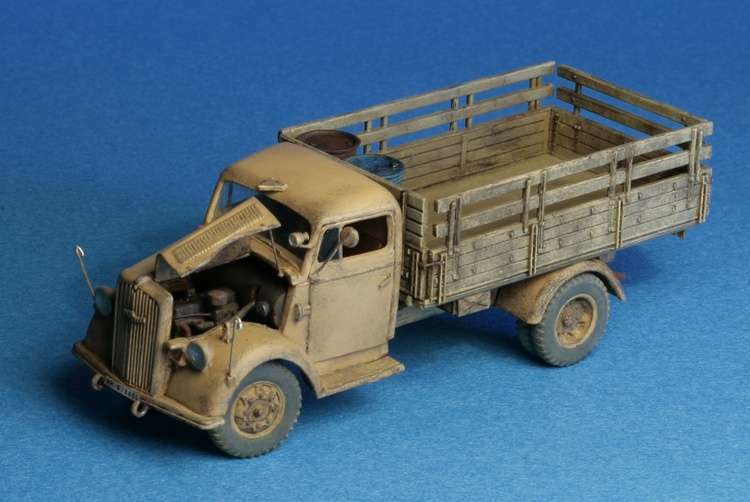 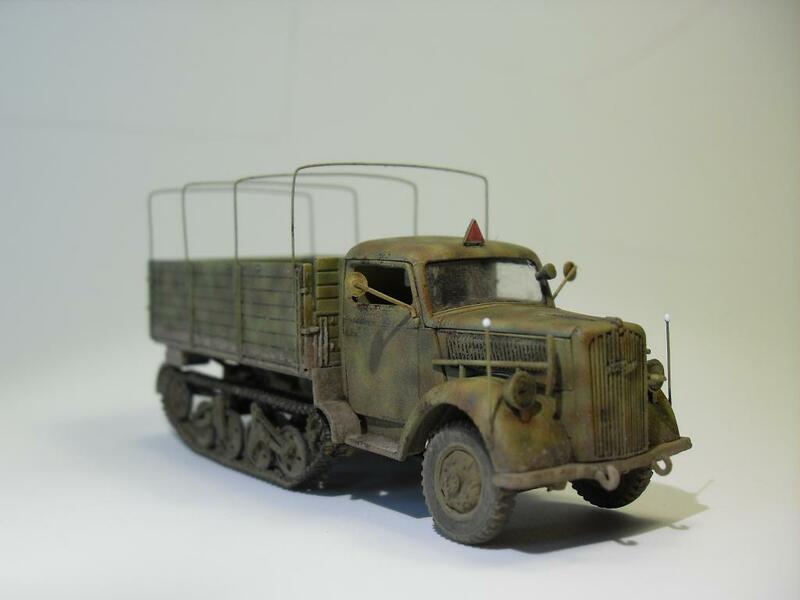 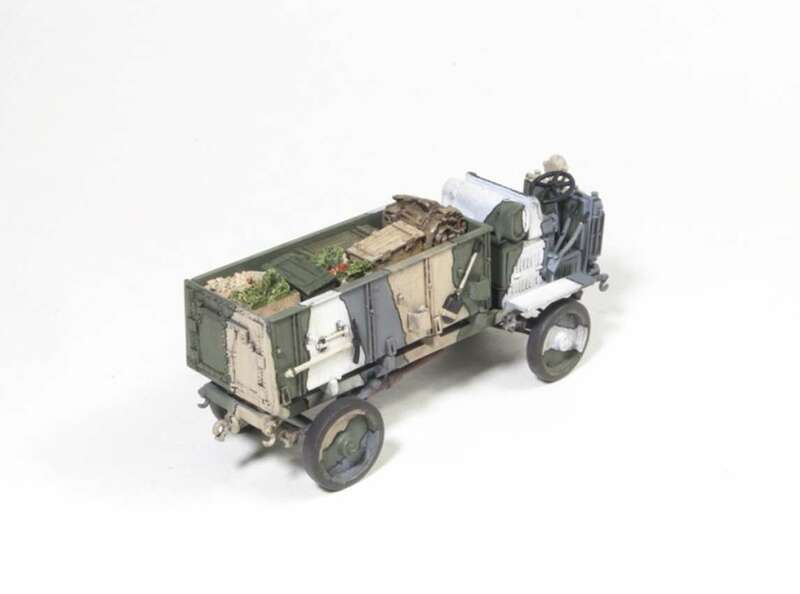 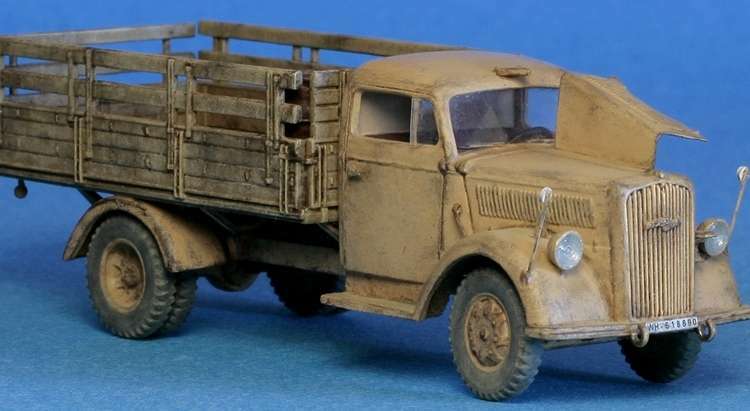 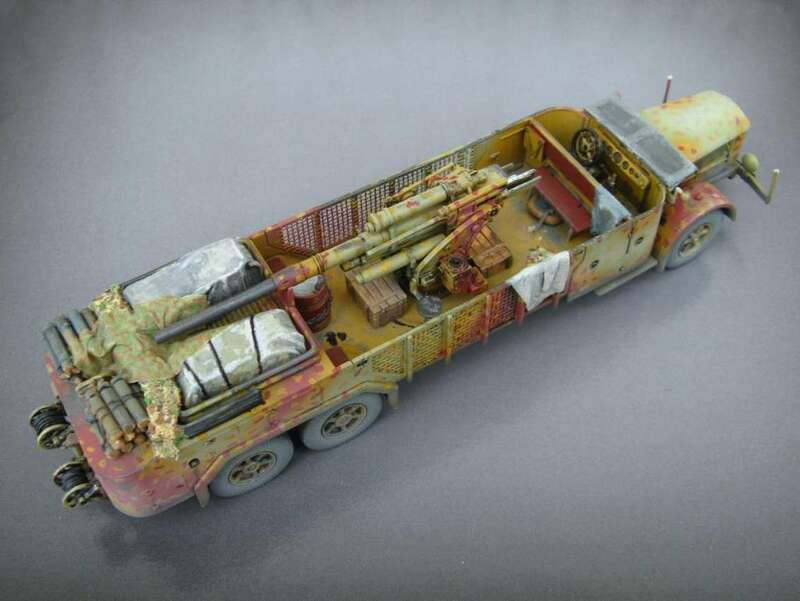 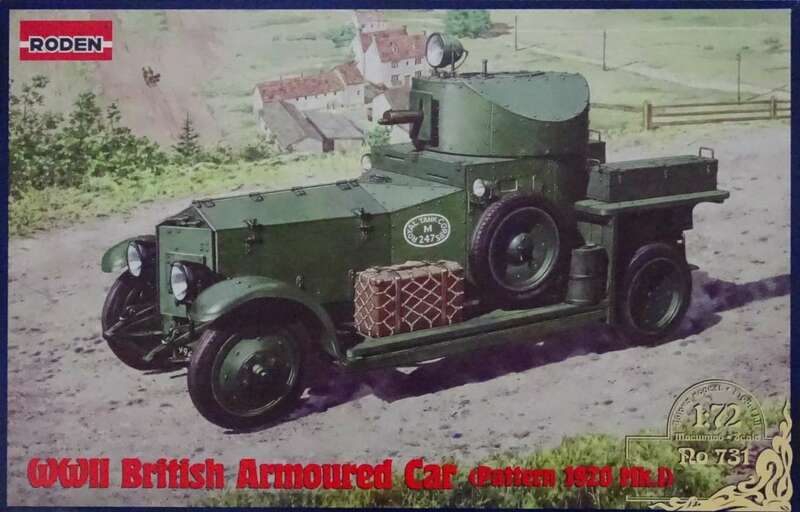 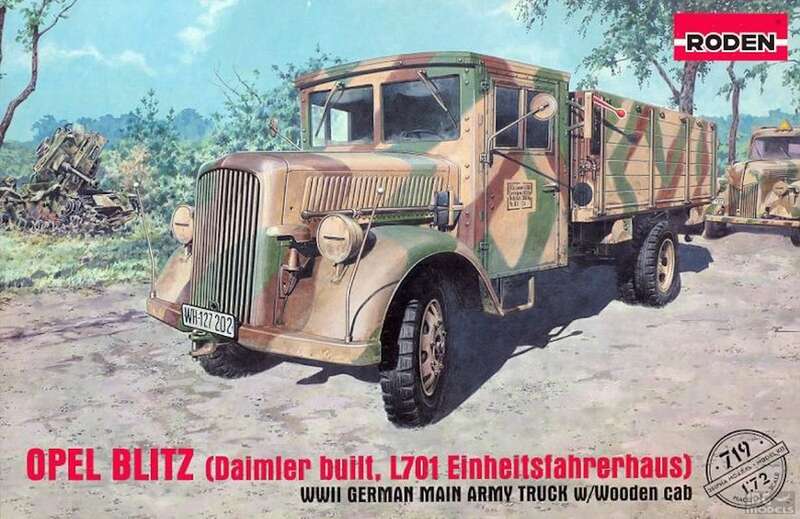 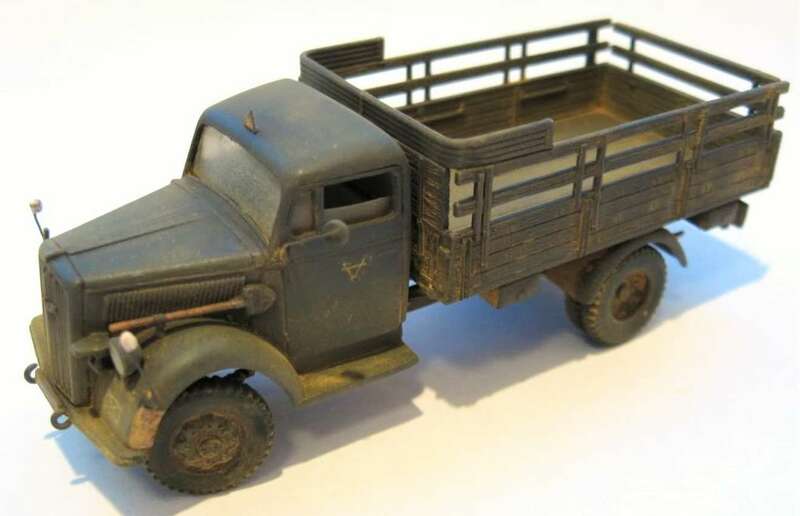 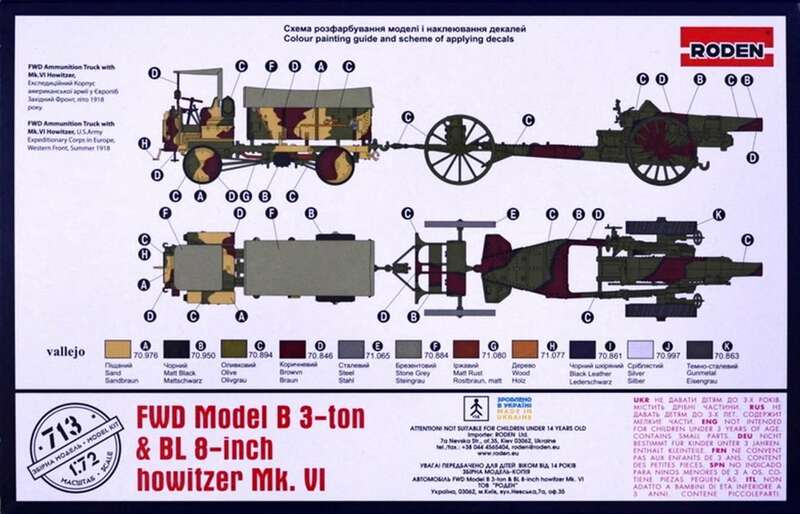 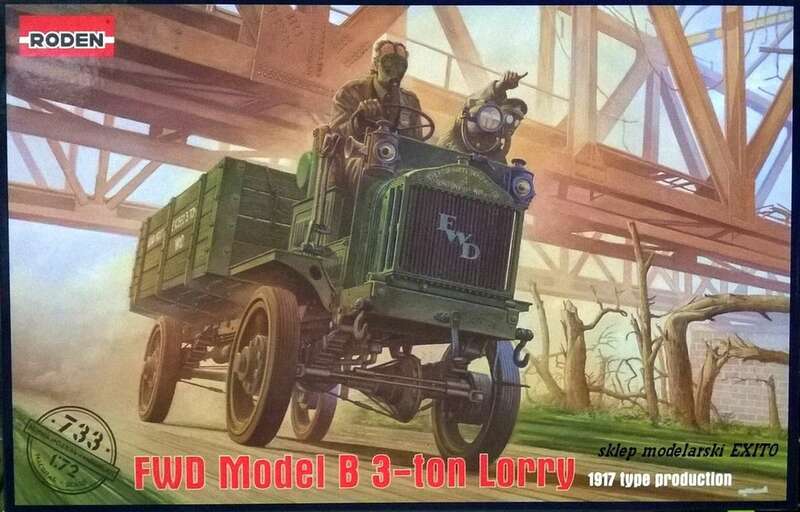 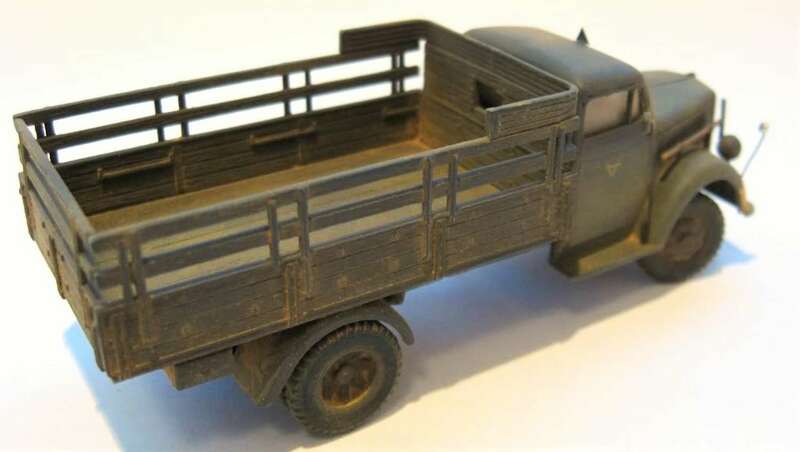 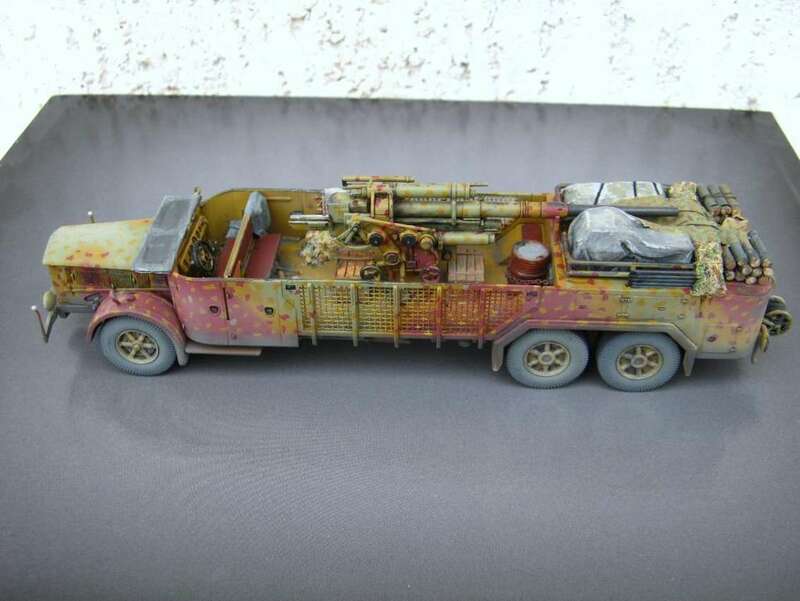 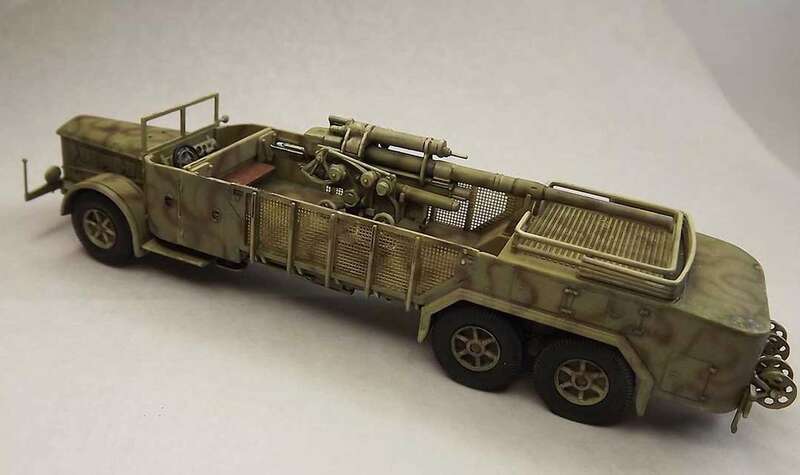 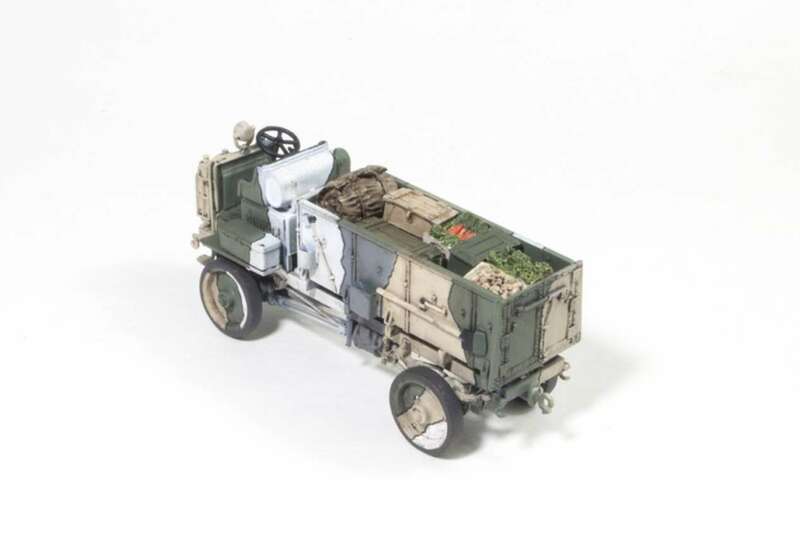 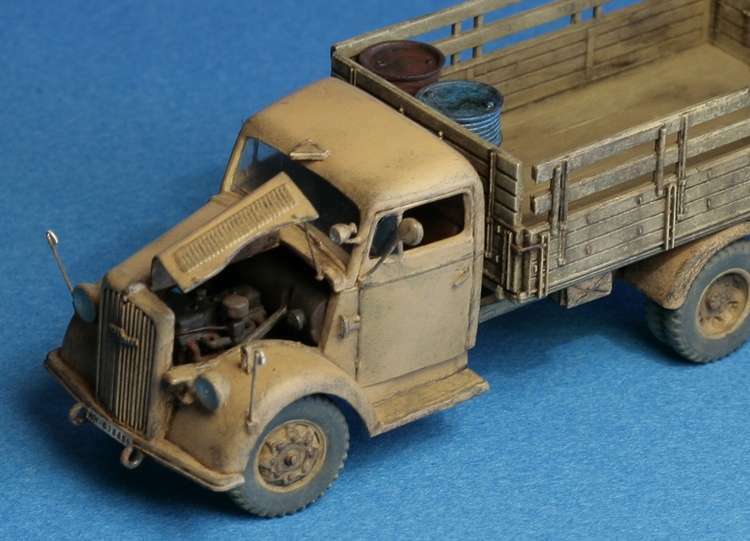 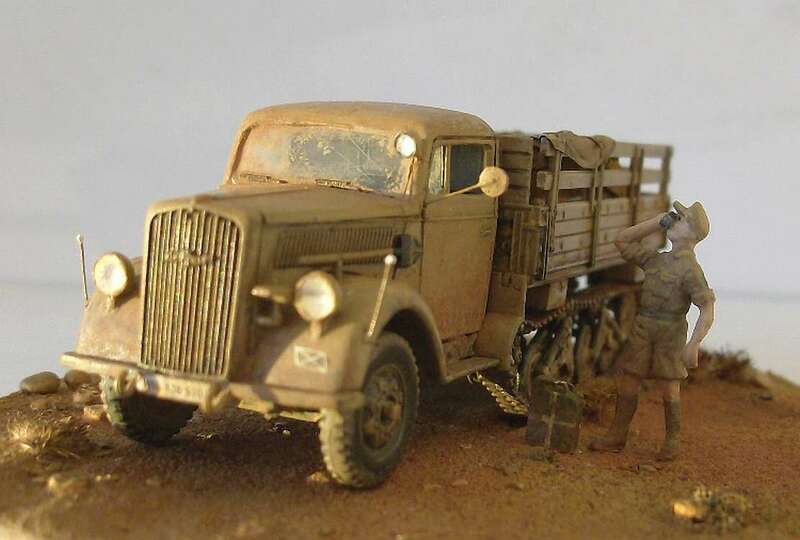 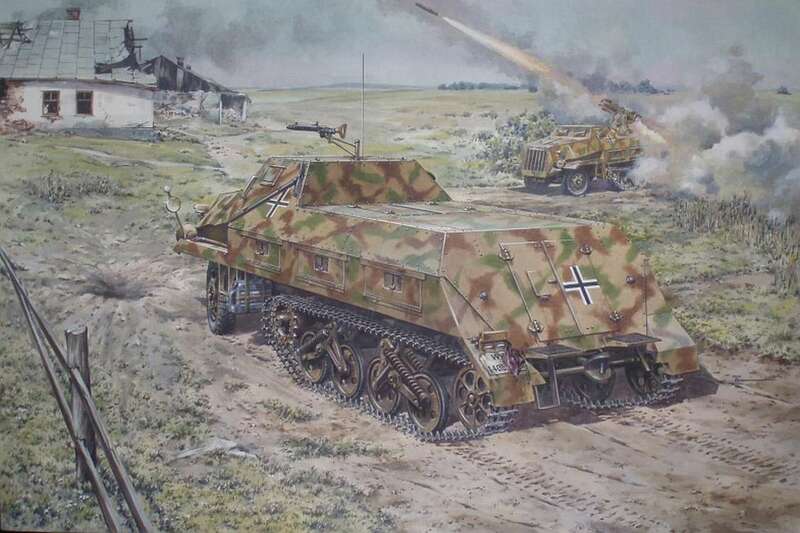 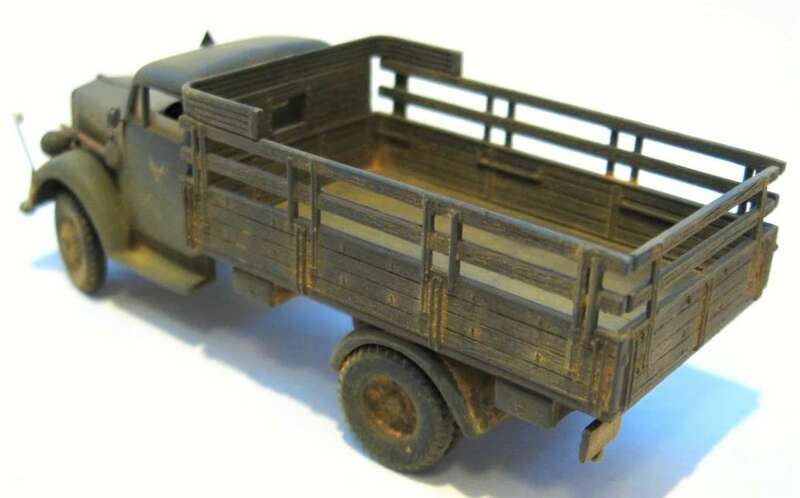 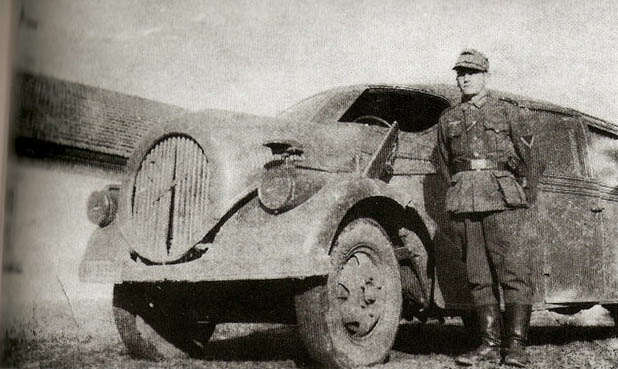 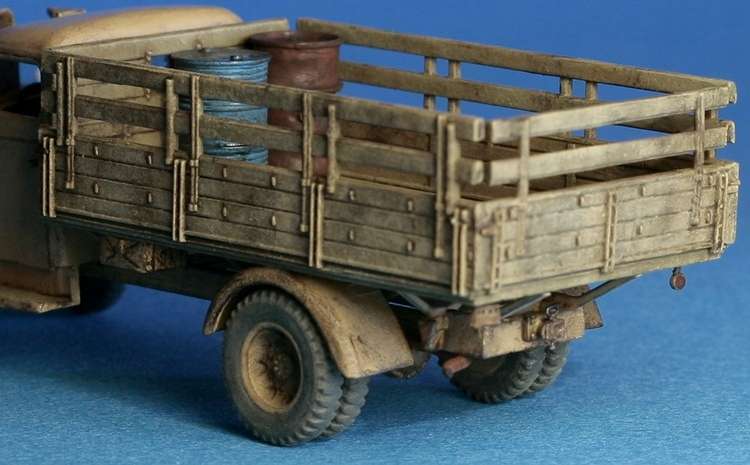 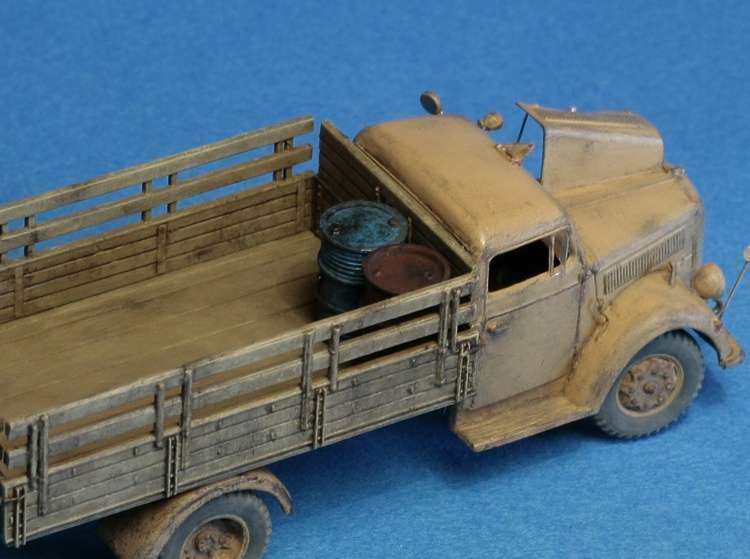 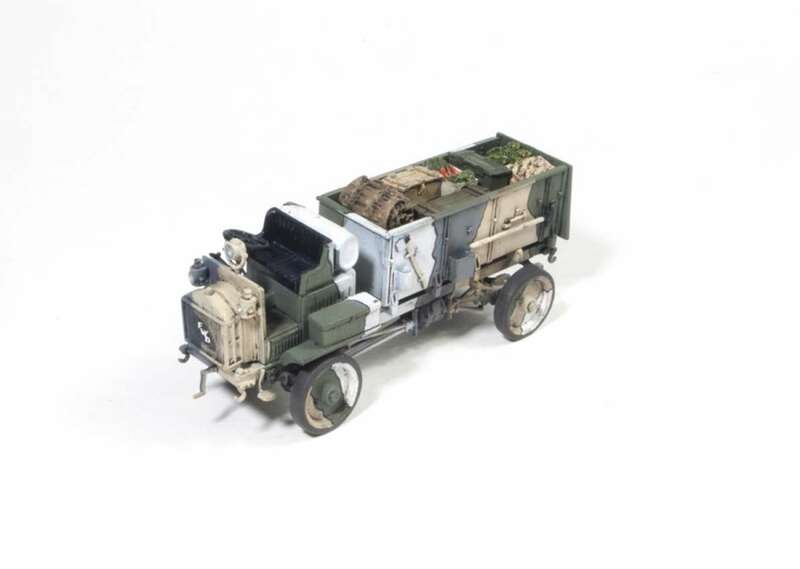 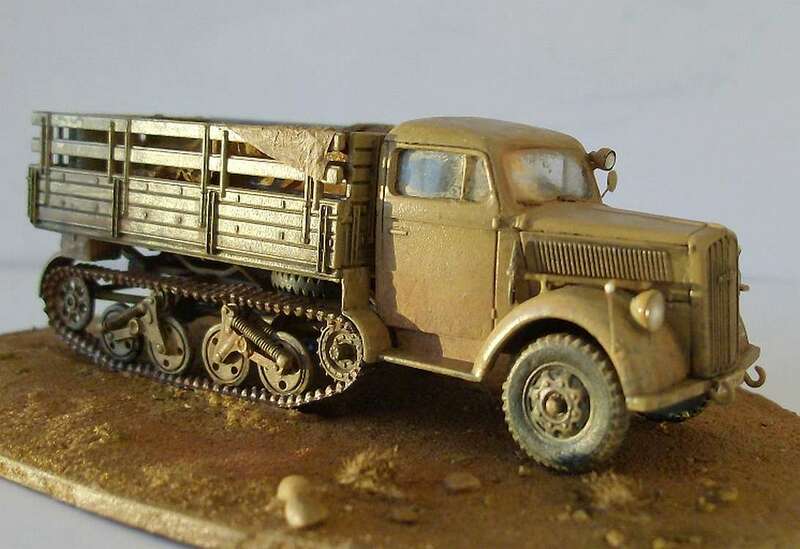 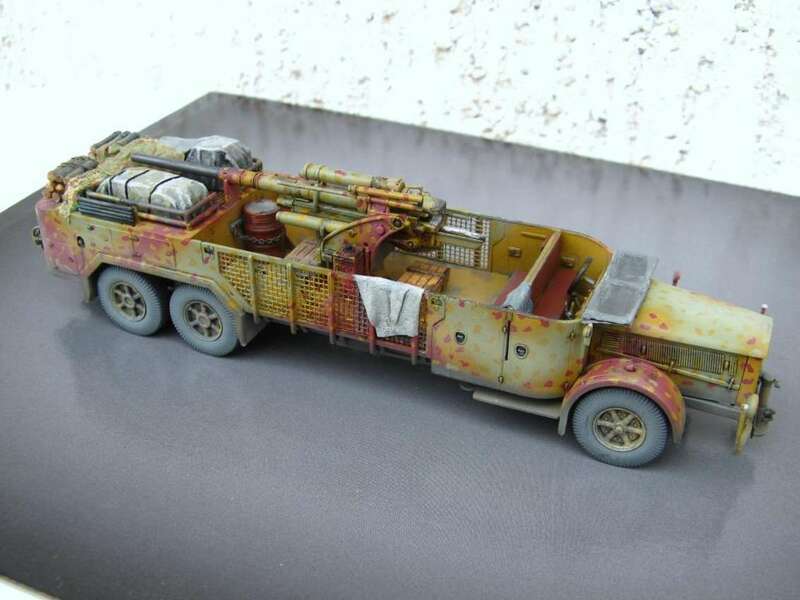 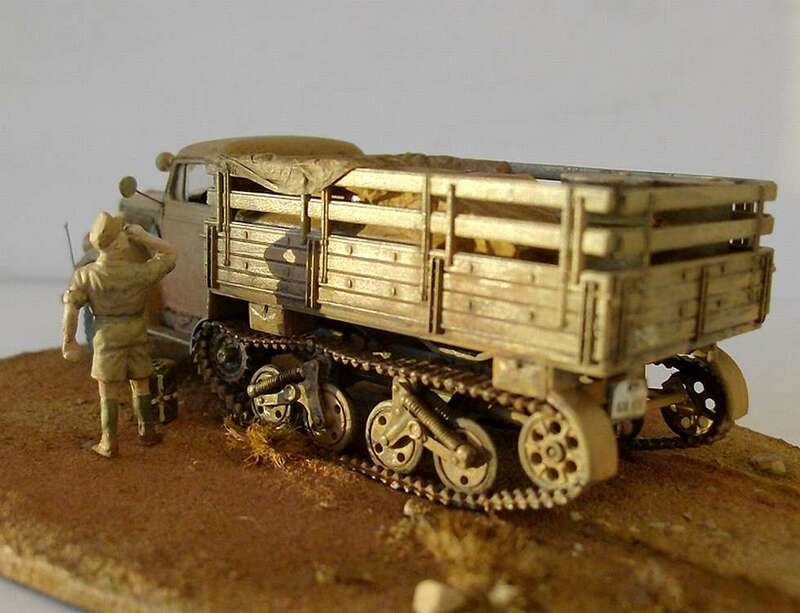 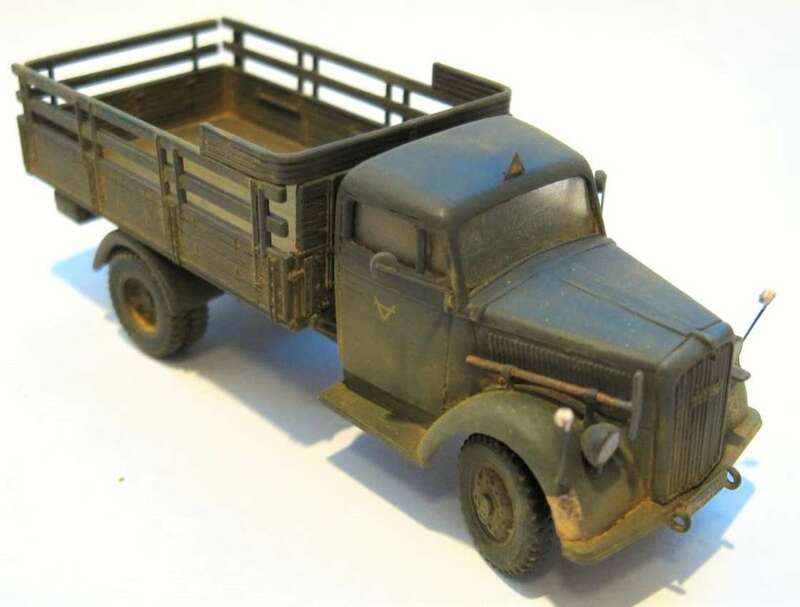 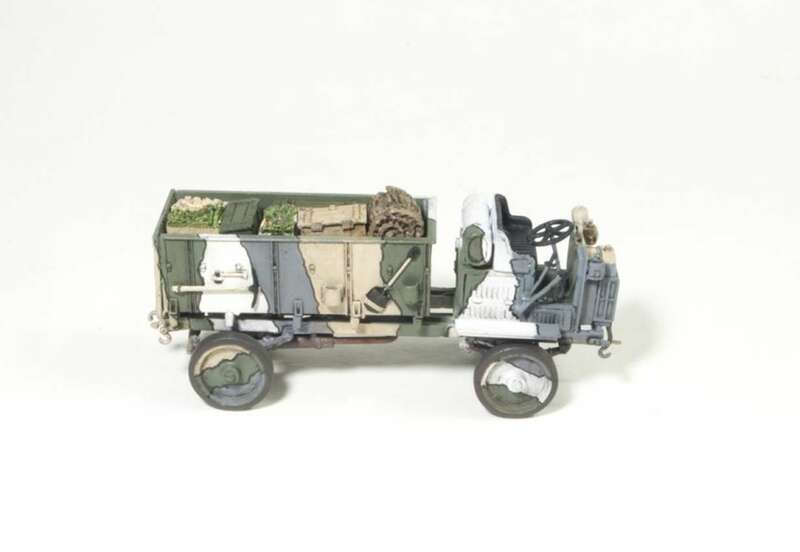 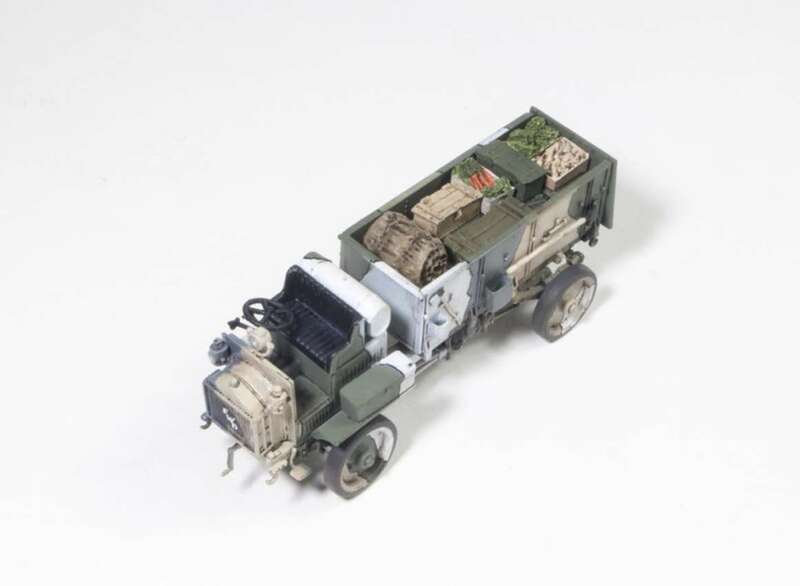 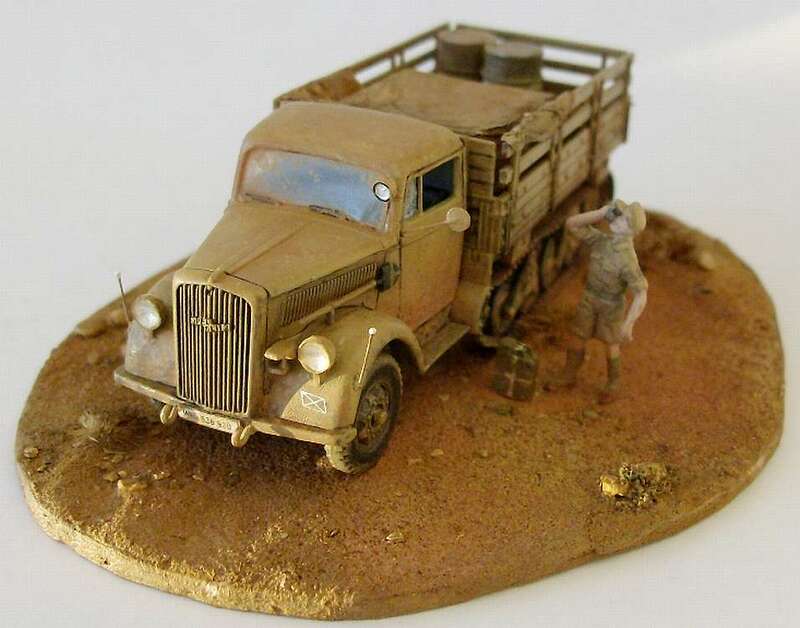 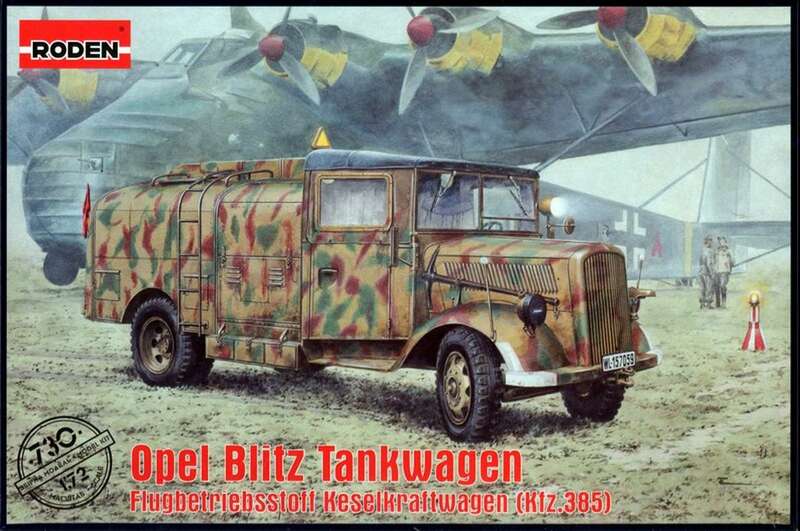 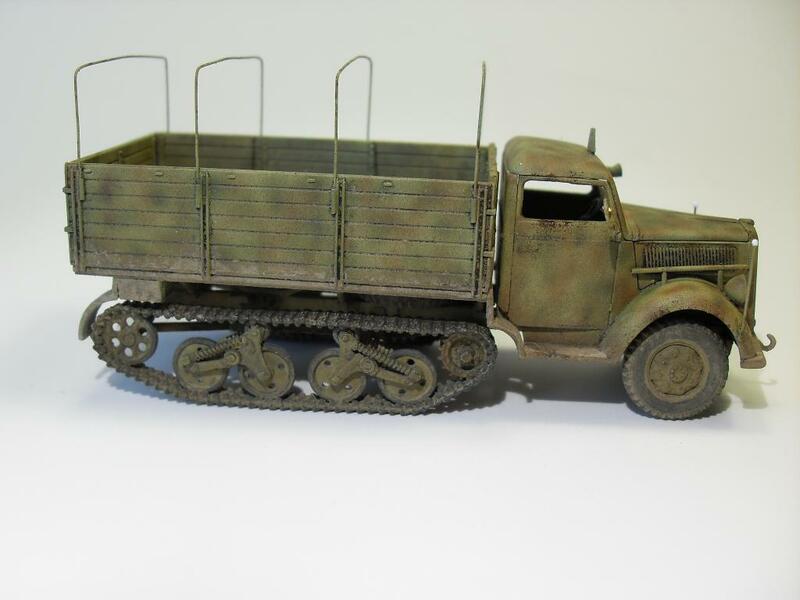 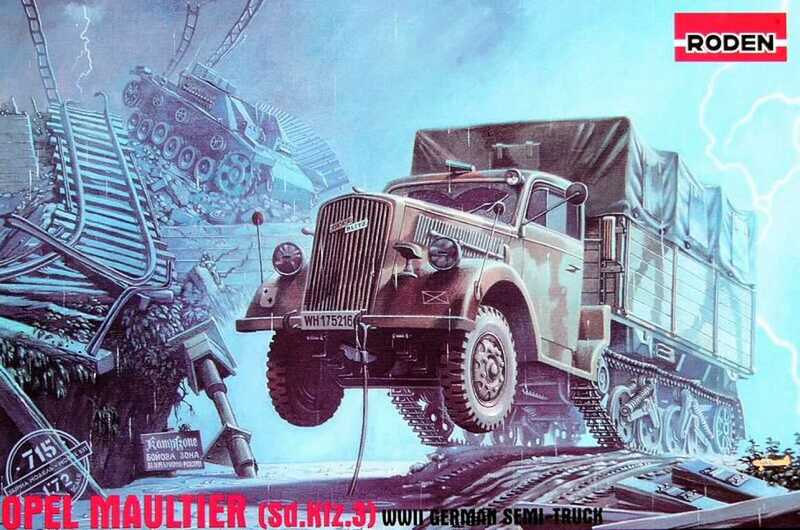 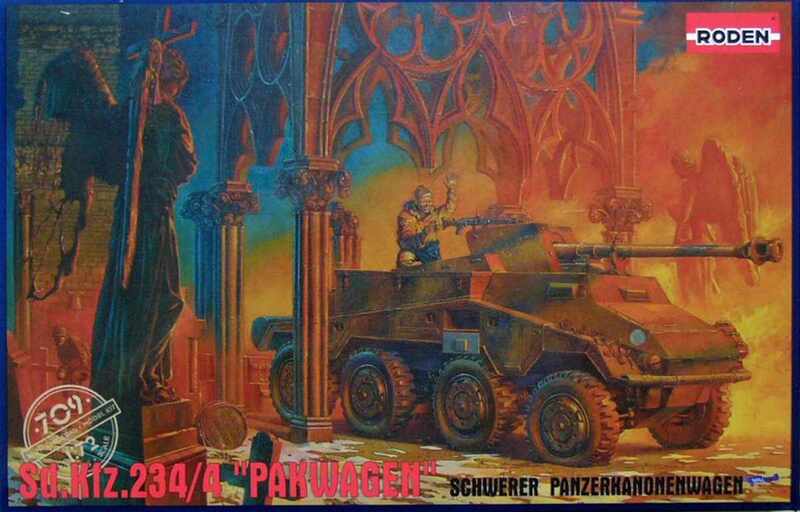 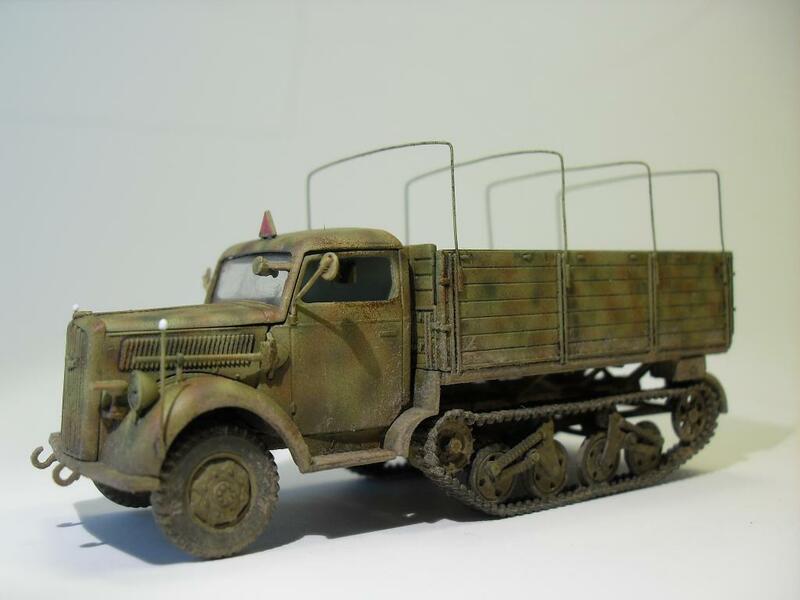 The truck was designated the Munitionskraftwagen for Nebelwerfer (Sd.Kfz.4) and was incorporated into the combat units of tracked artillery. 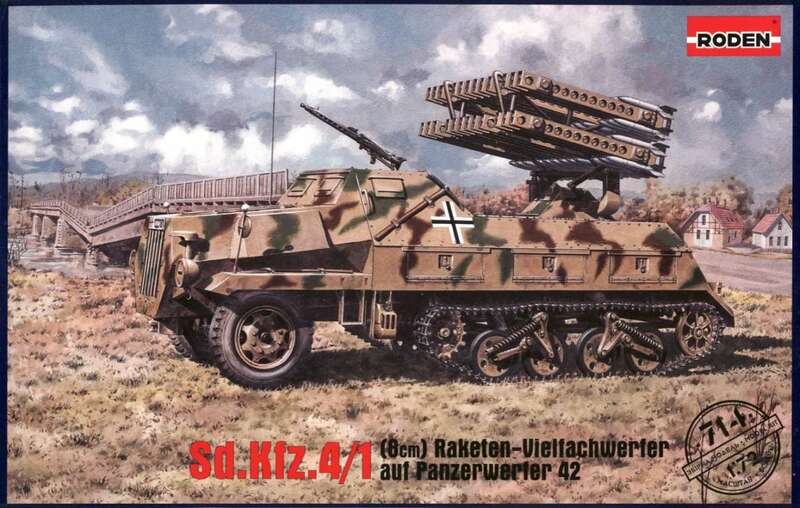 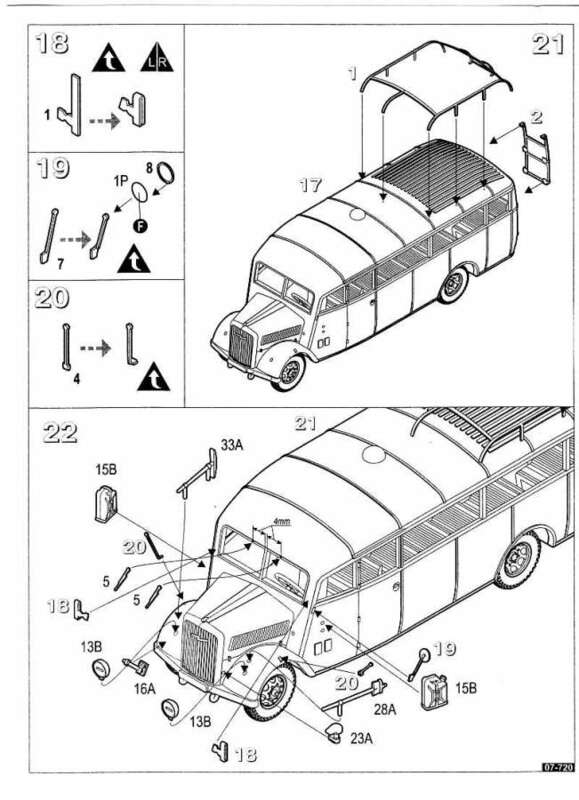 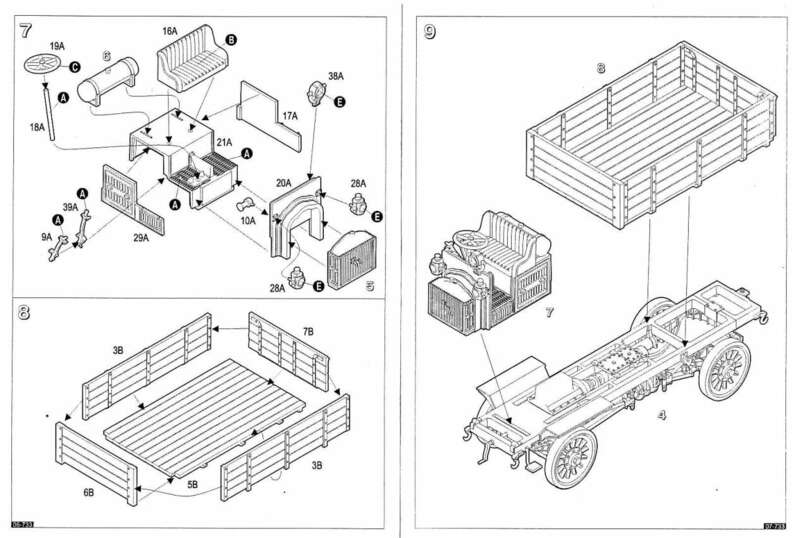 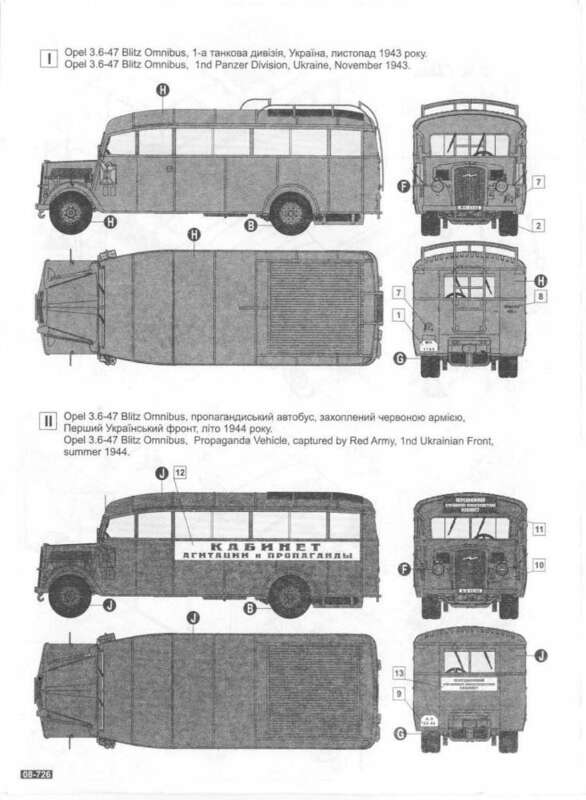 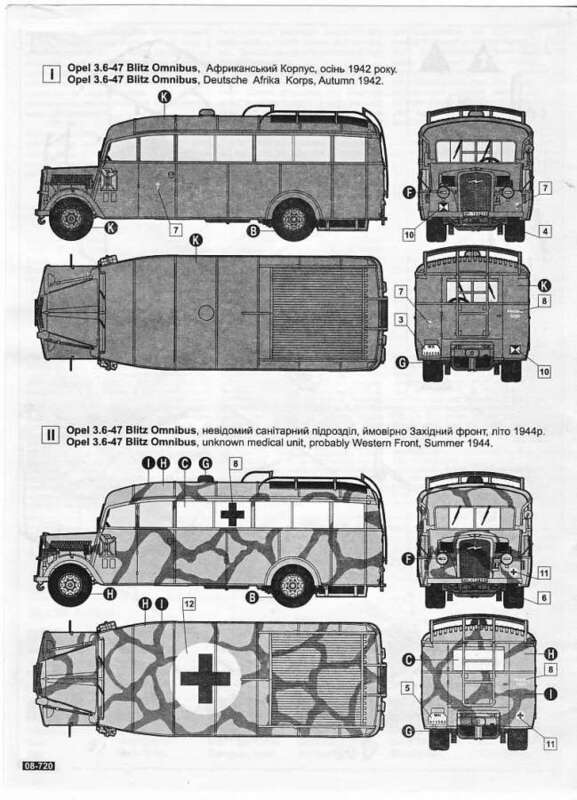 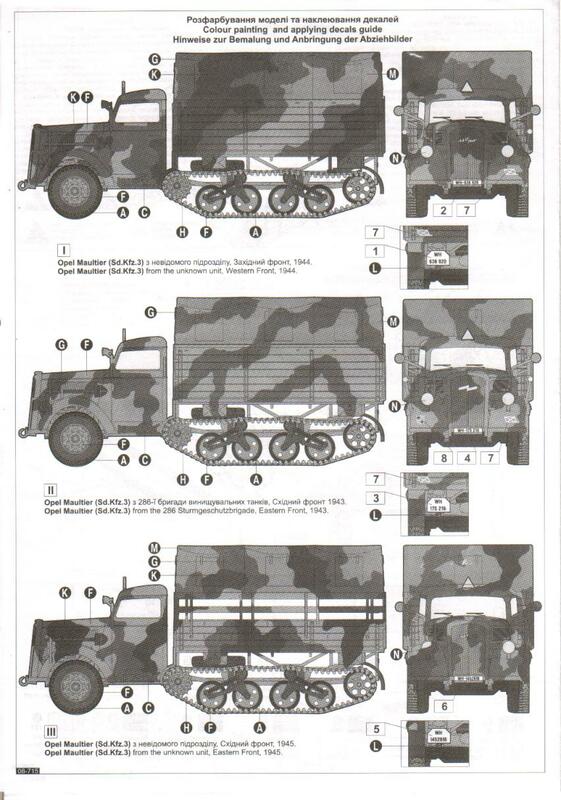 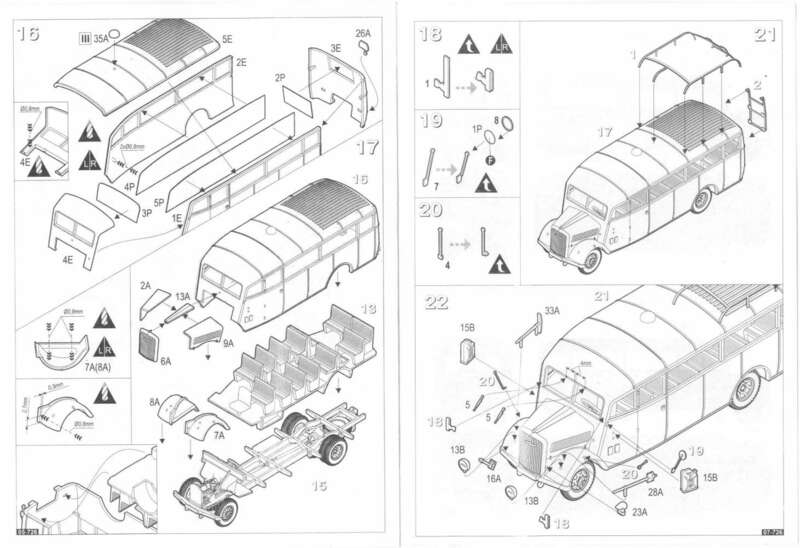 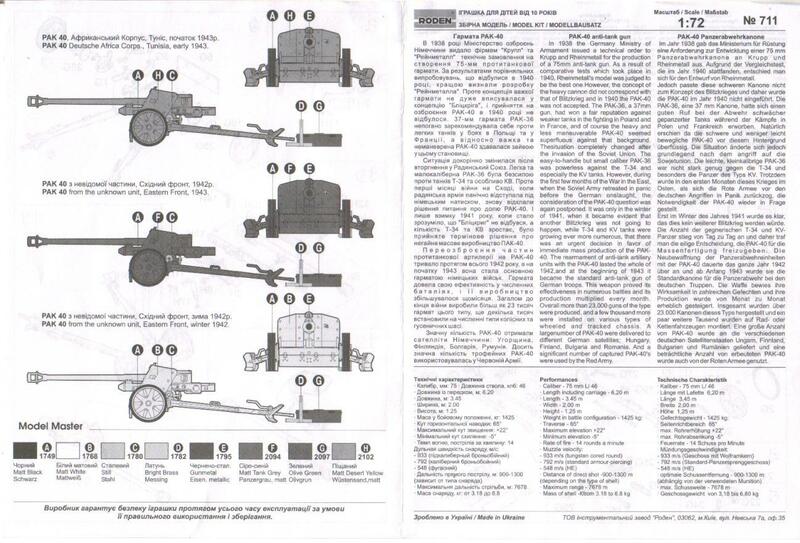 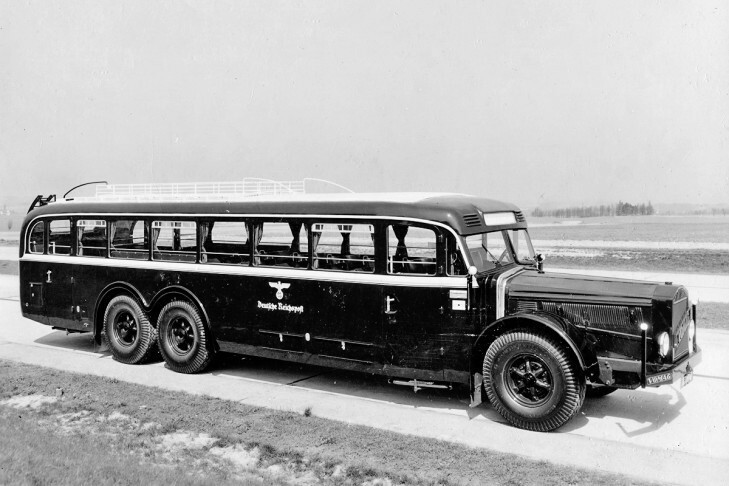 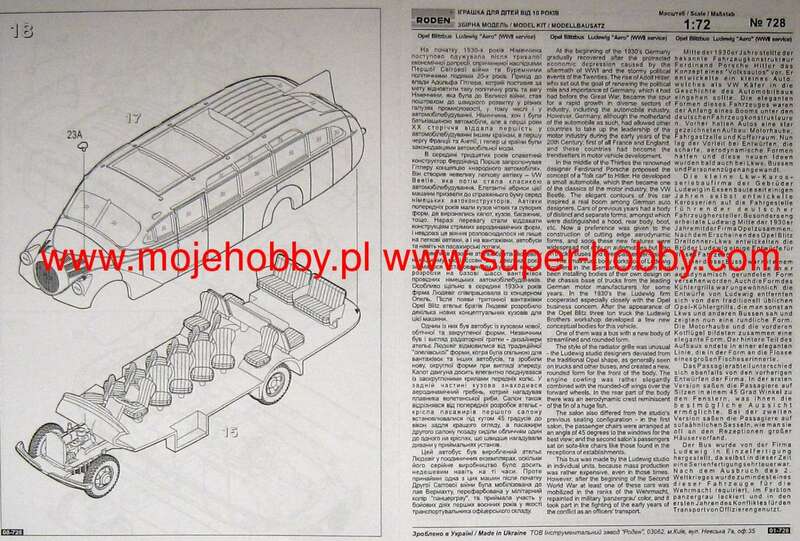 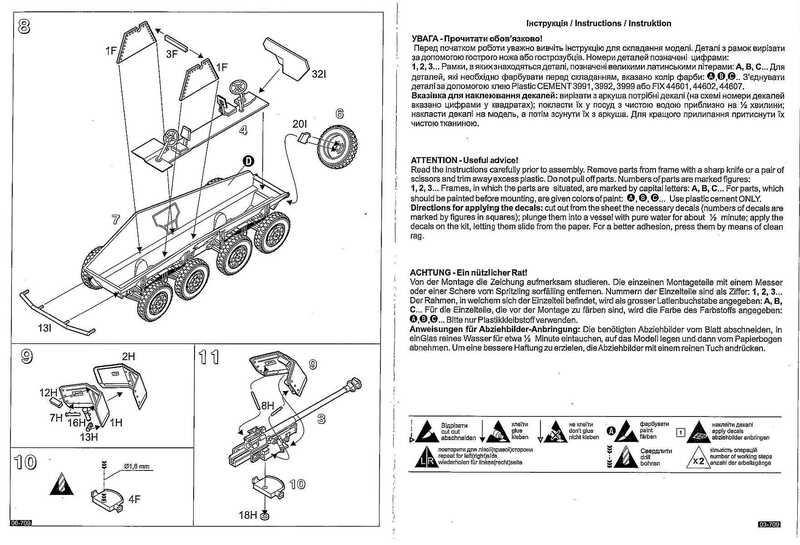 During 1944-45, in addition to 300 Panzerwerfer 42 rocket firing systems, they managed to build at least 287 Munitionskraftwagen ammunition transporters, which were in use until the last days of the war on both the Eastern and Western Fronts. 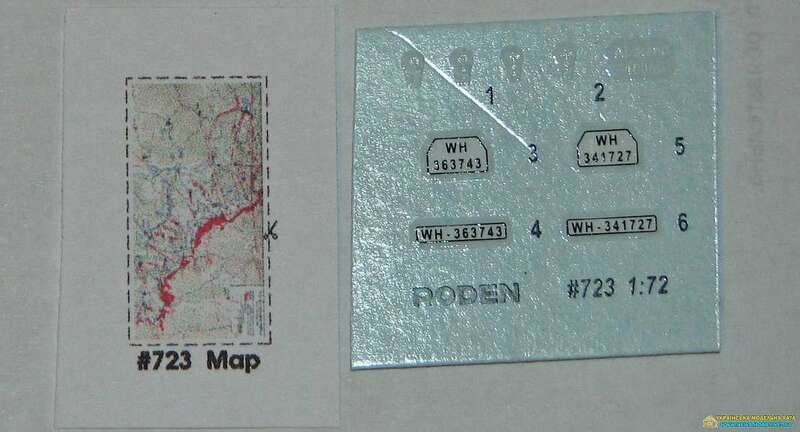 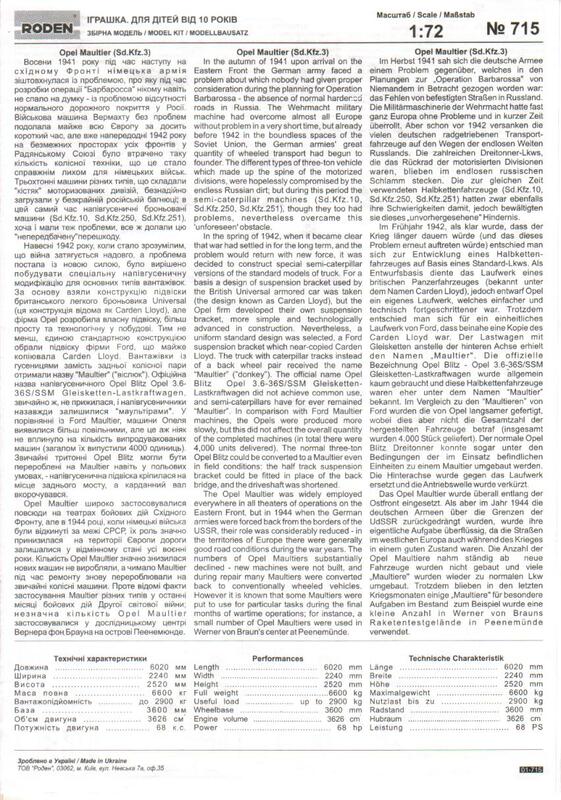 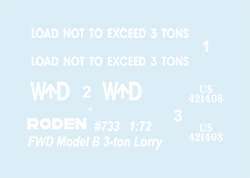 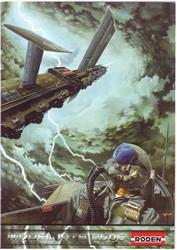 Mail to: Roden Plant Ukraine.